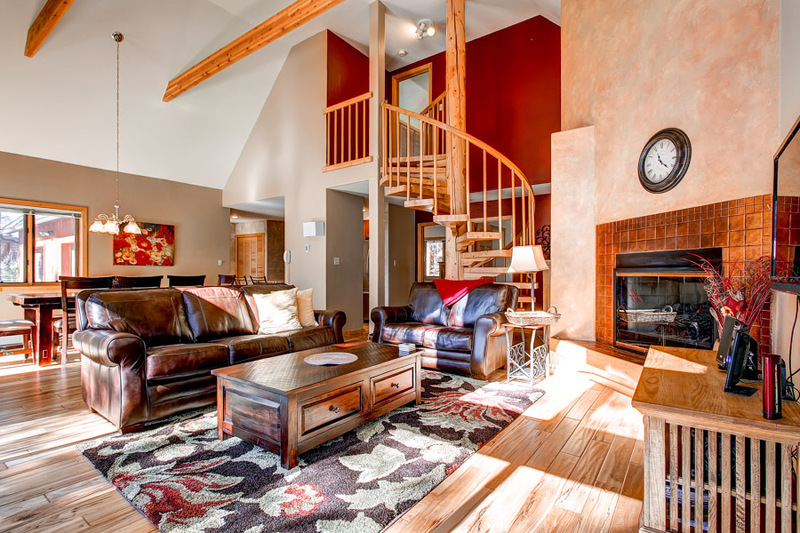 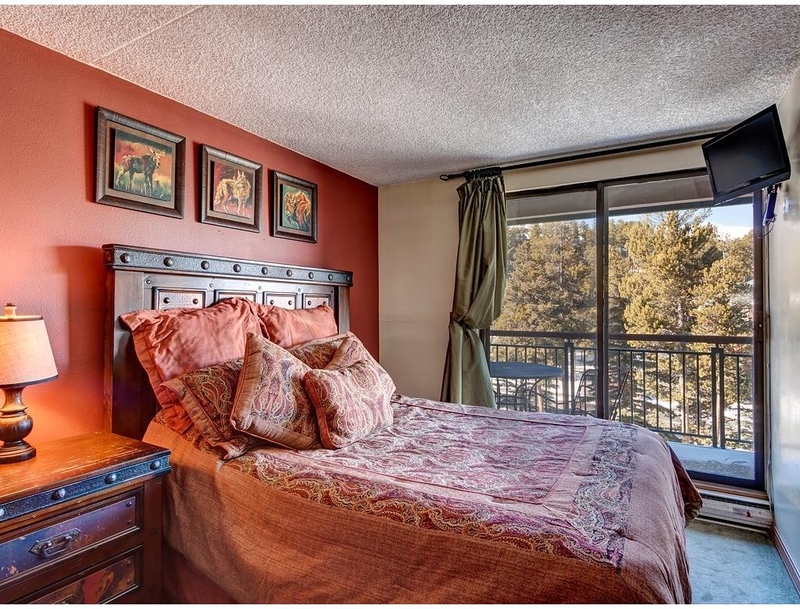 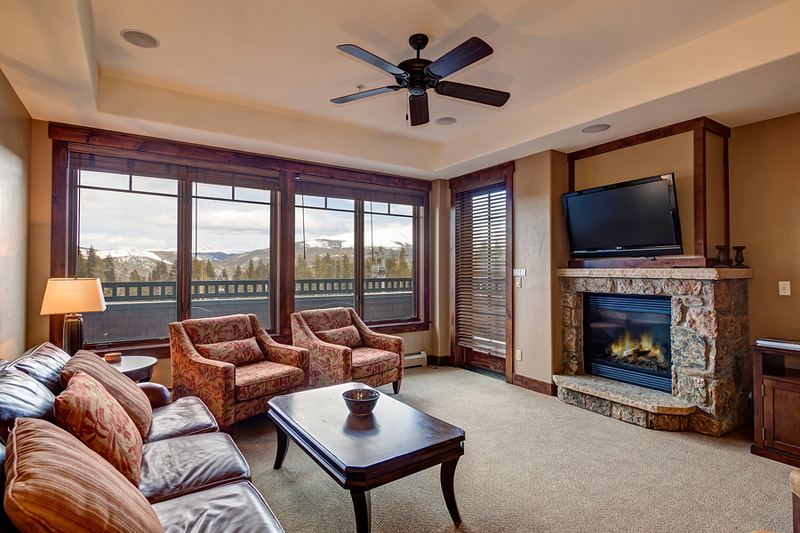 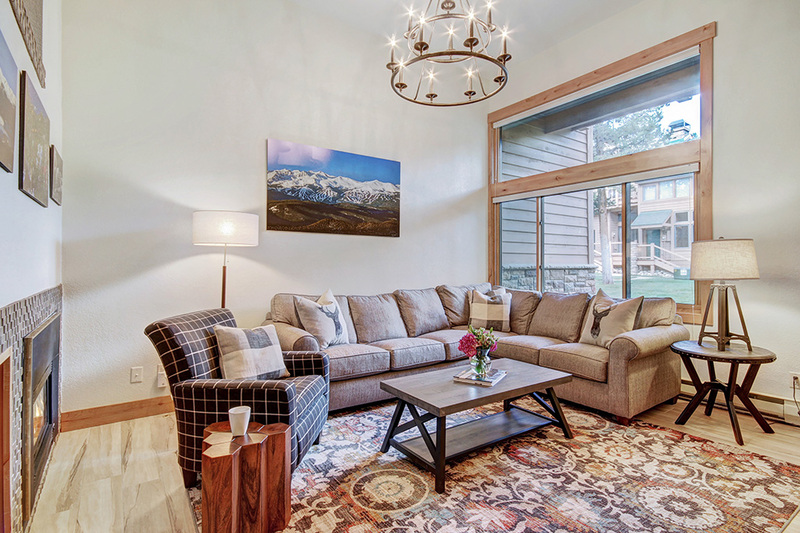 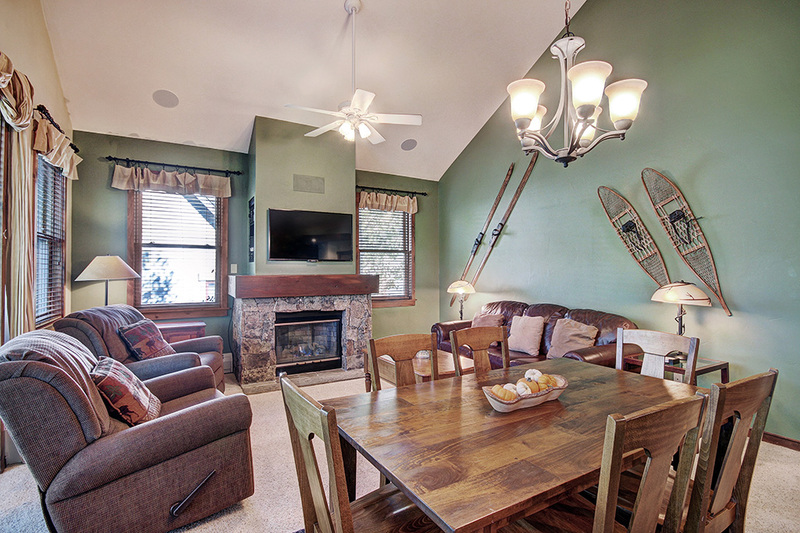 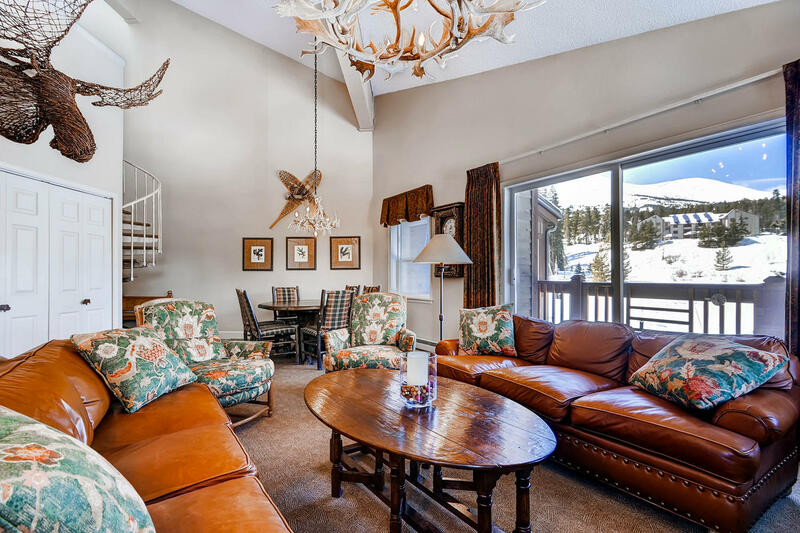 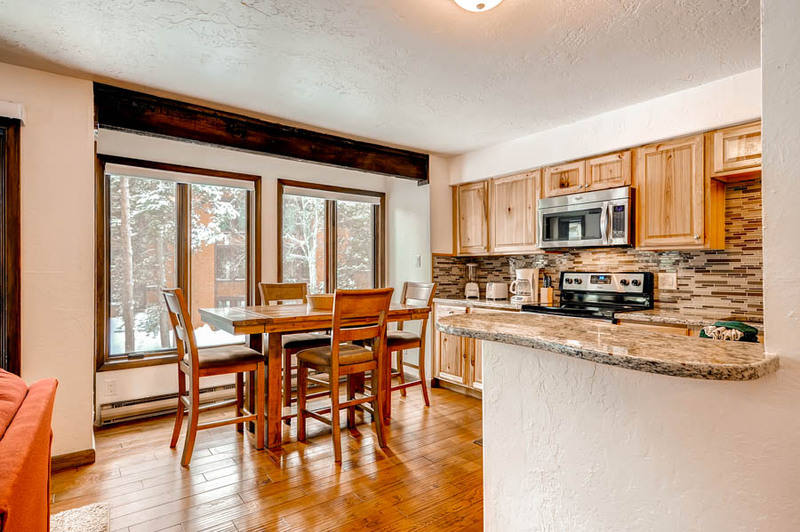 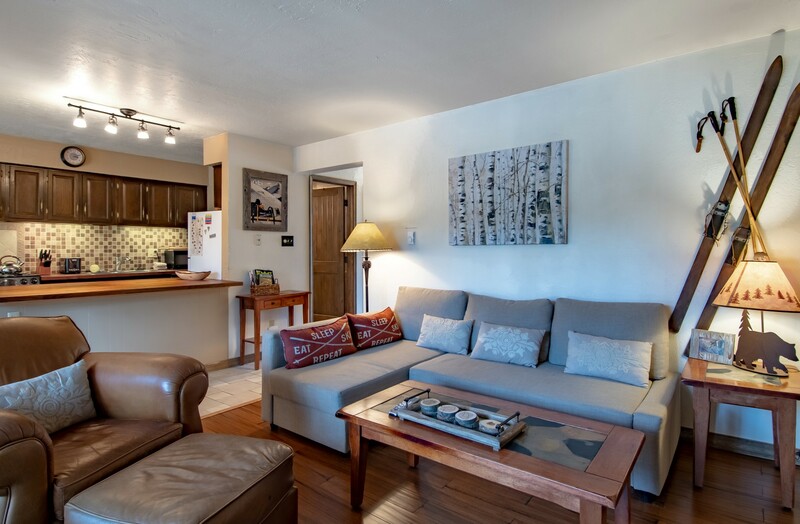 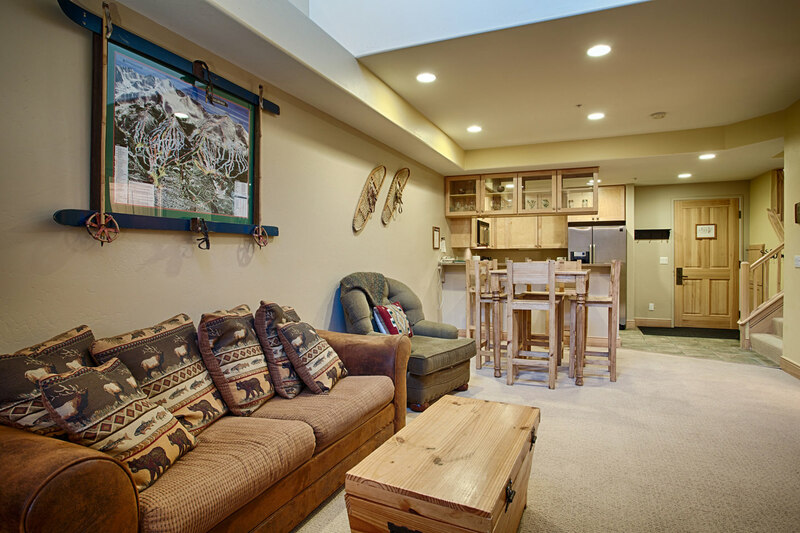 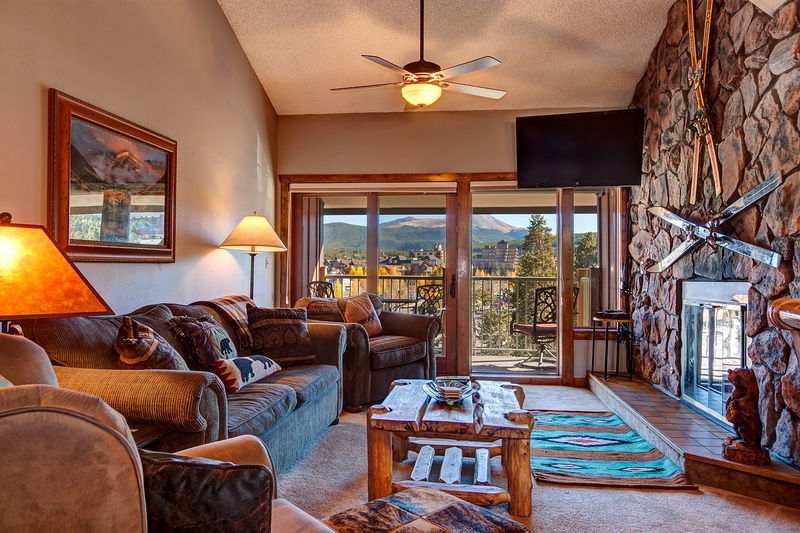 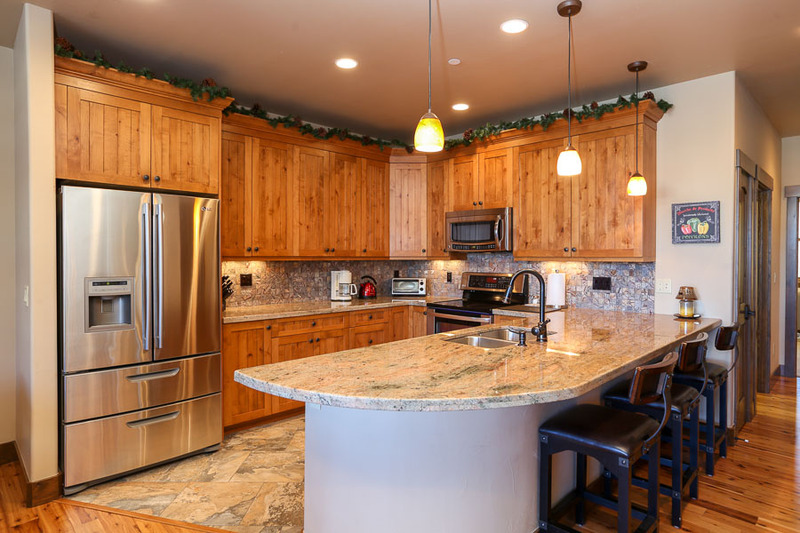 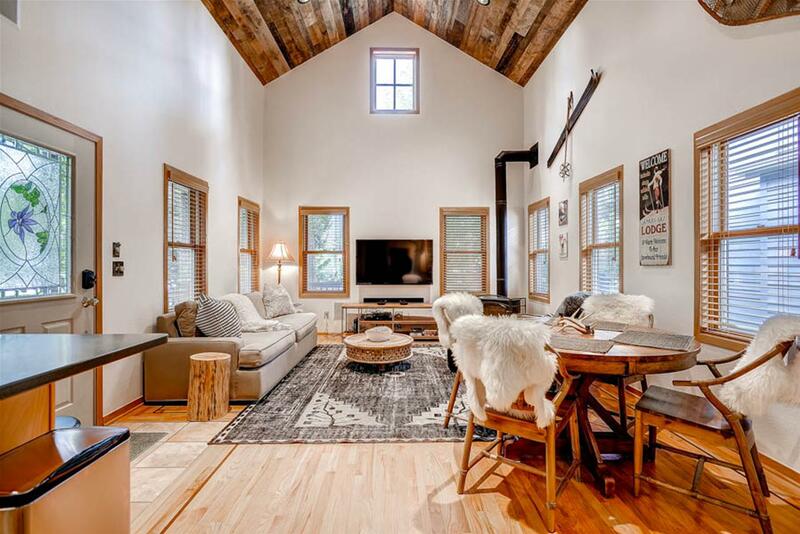 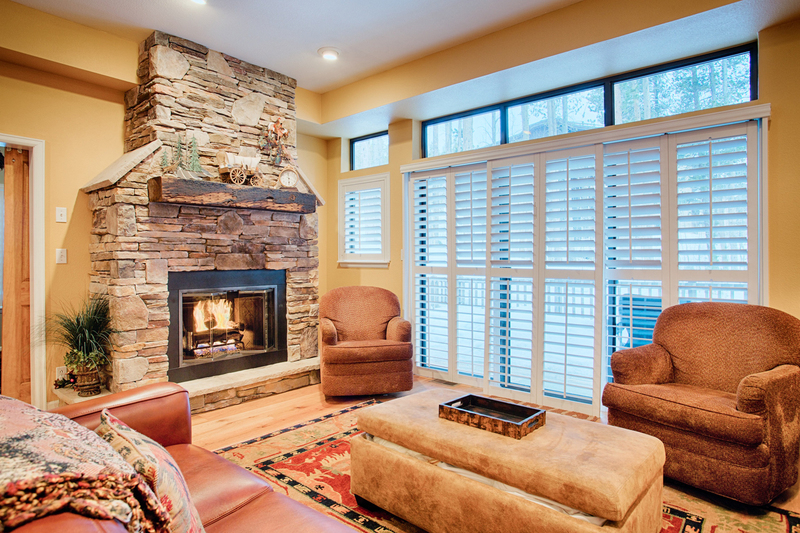 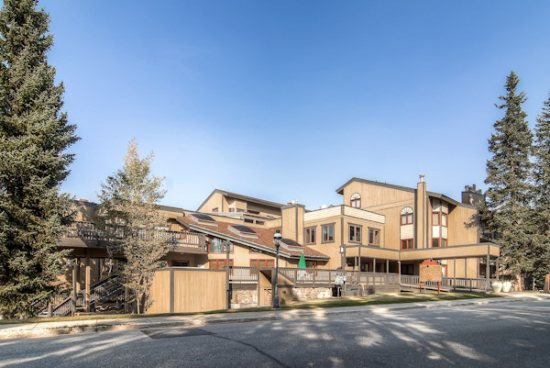 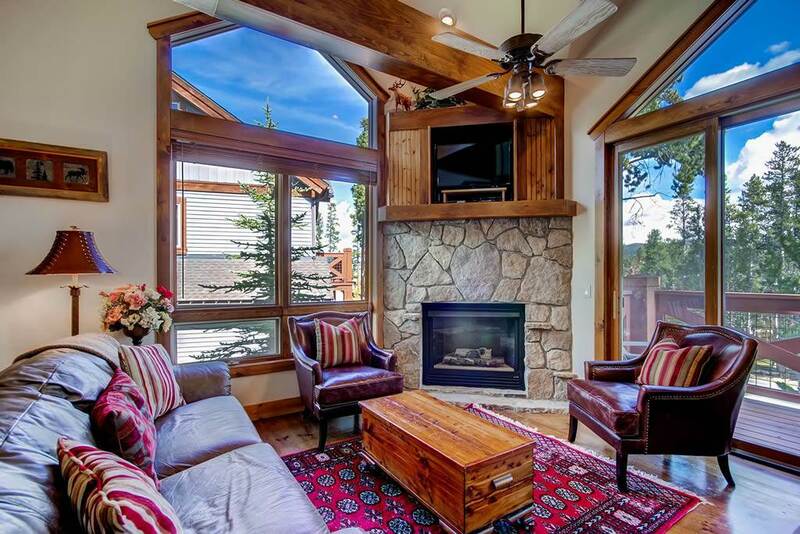 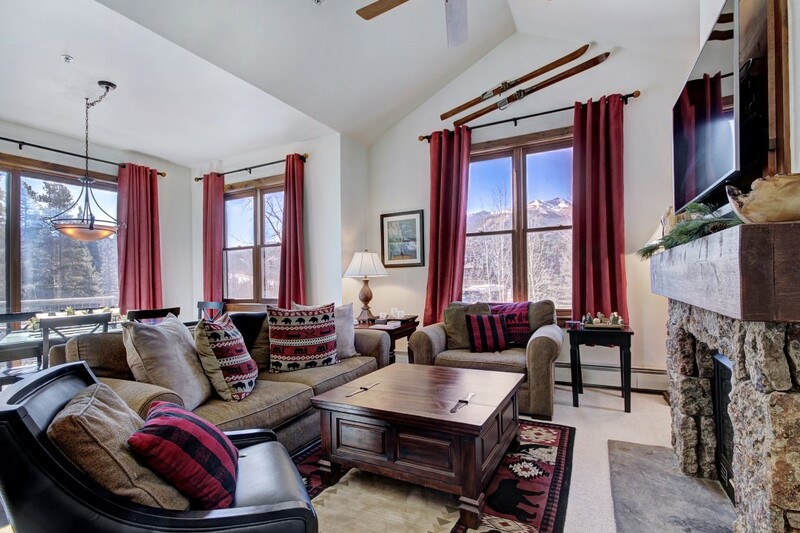 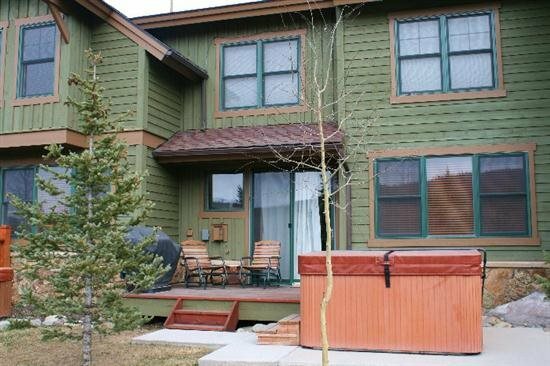 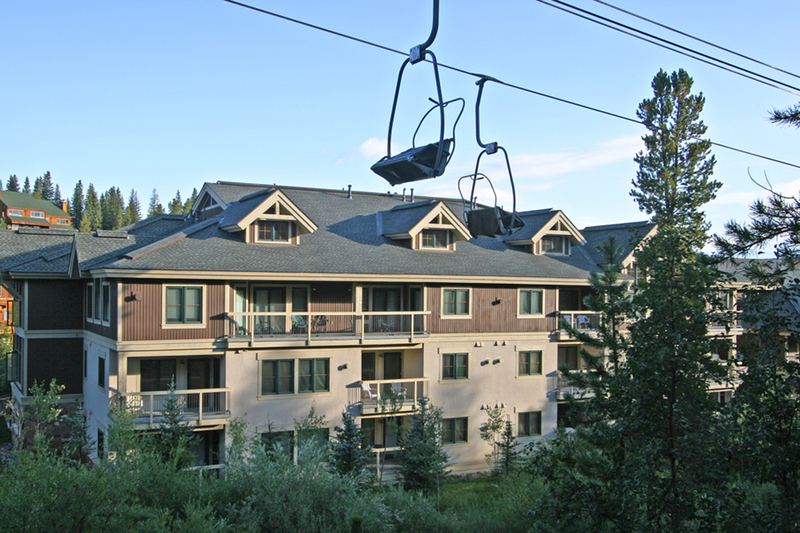 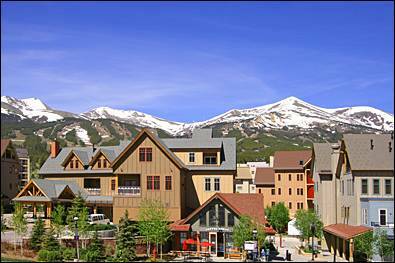 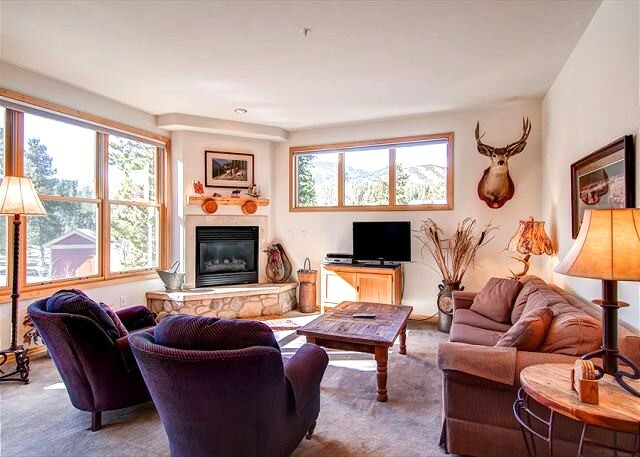 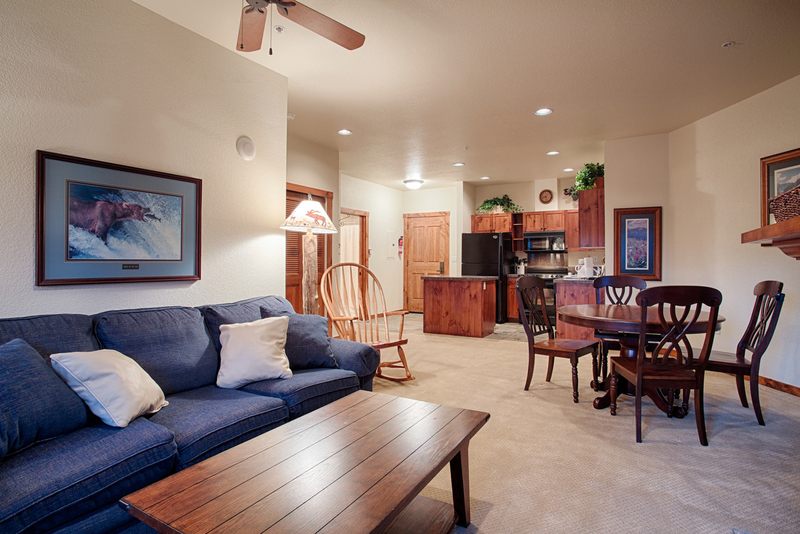 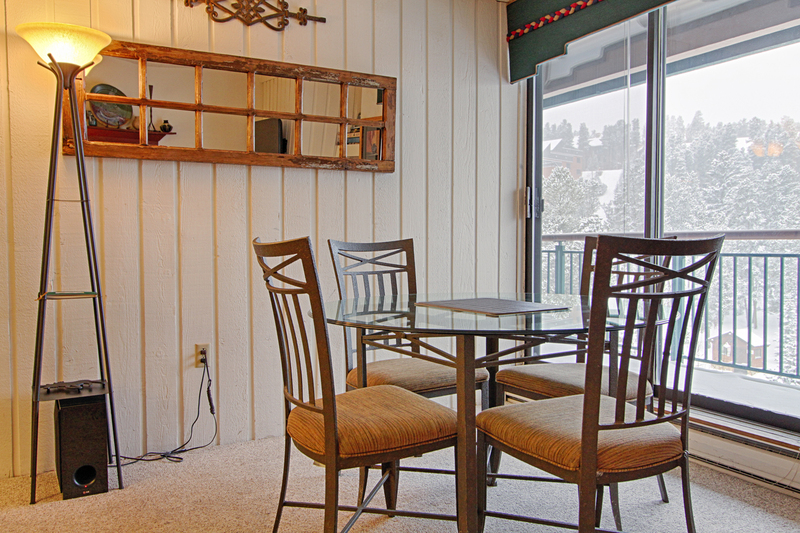 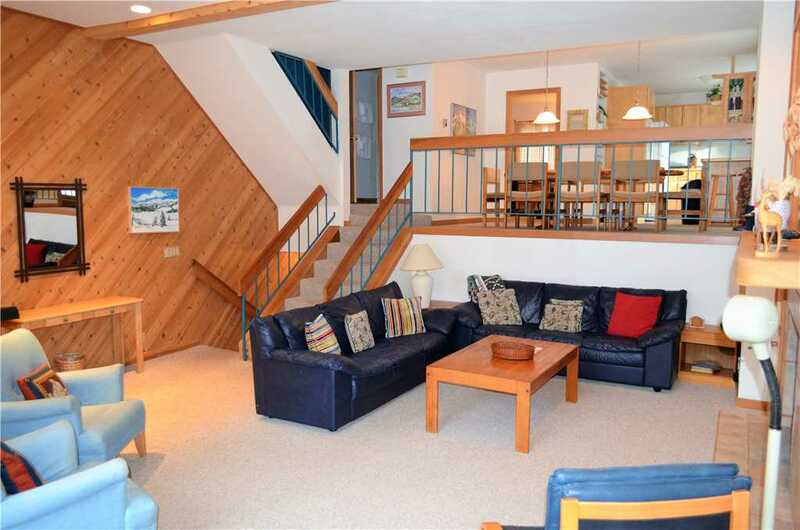 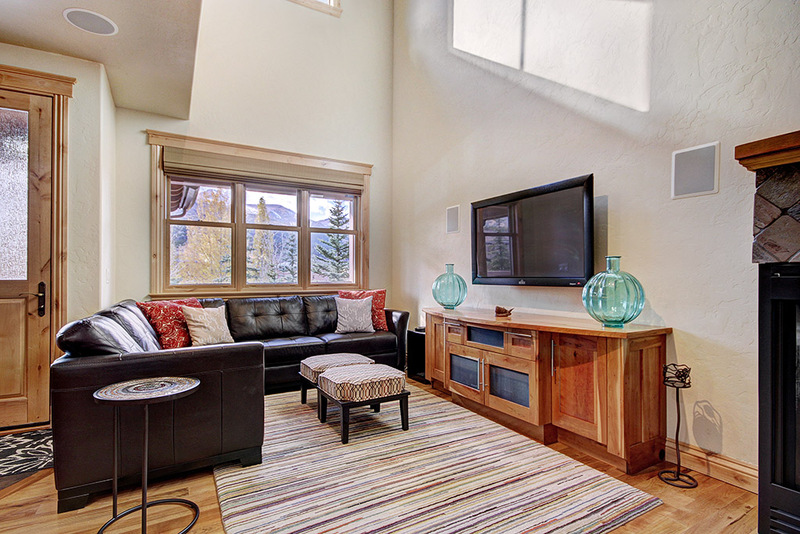 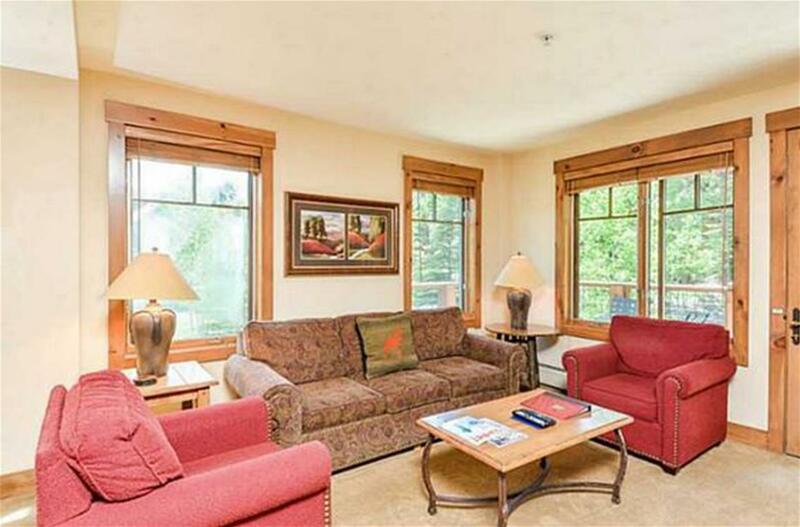 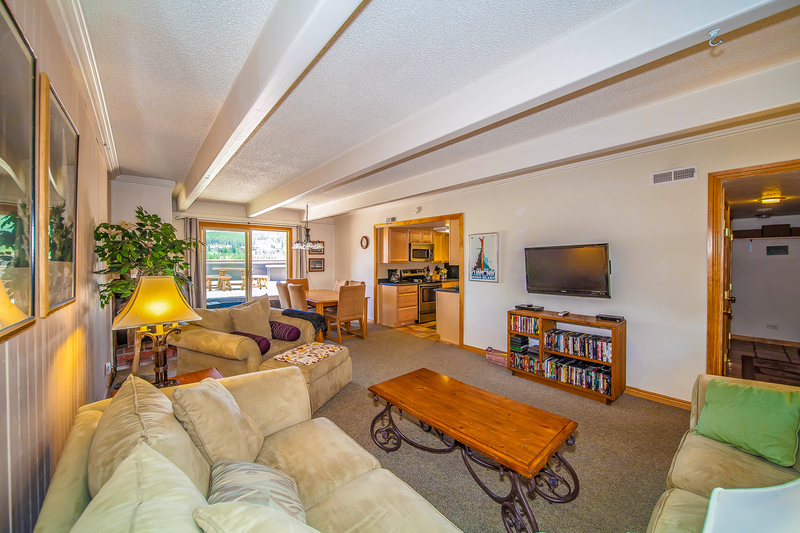 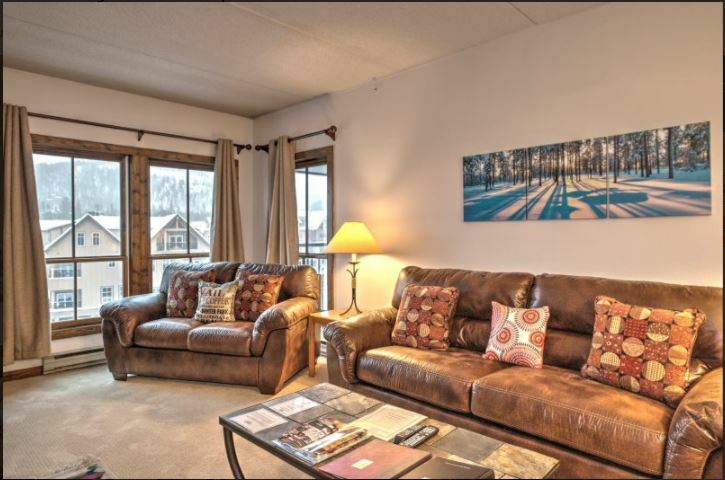 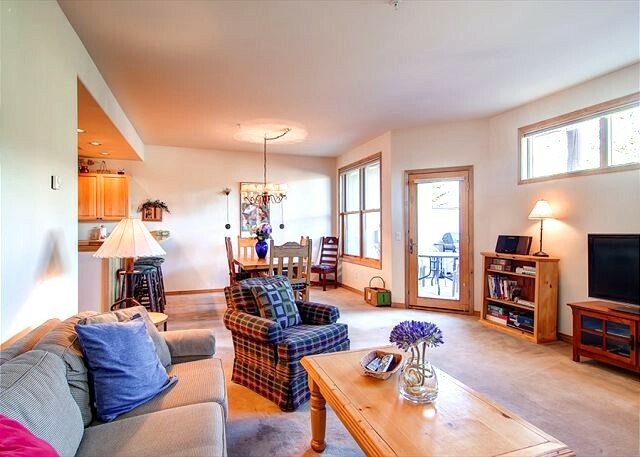 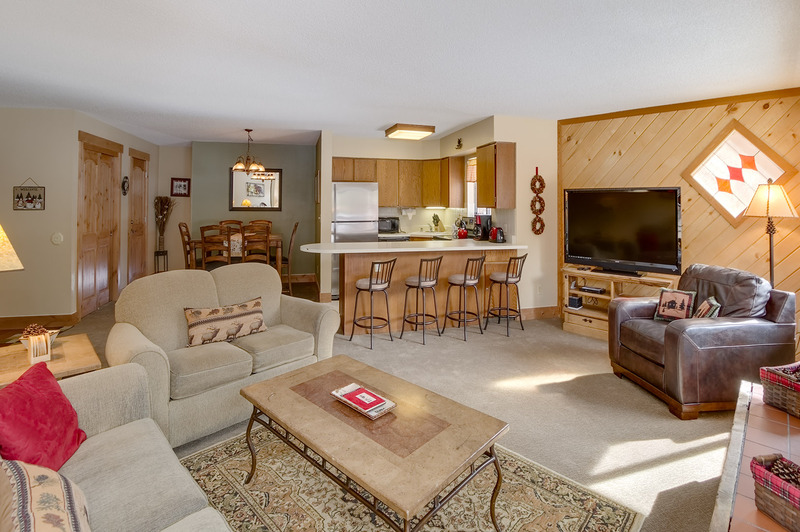 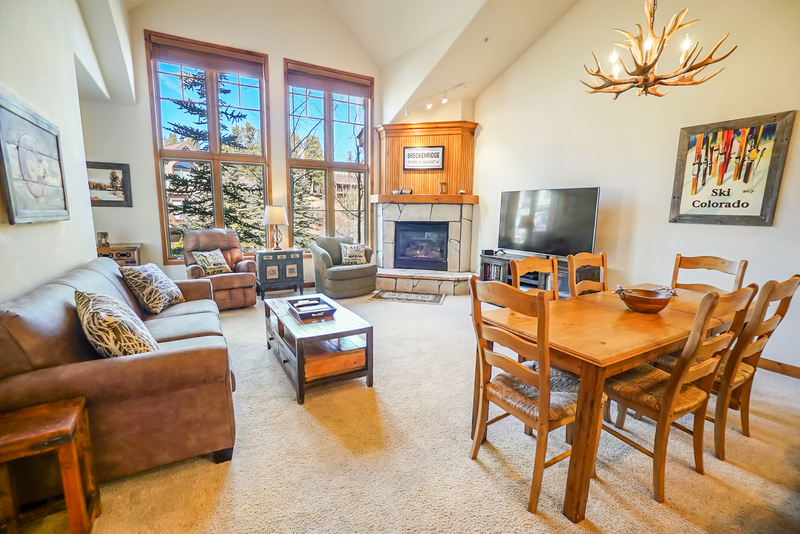 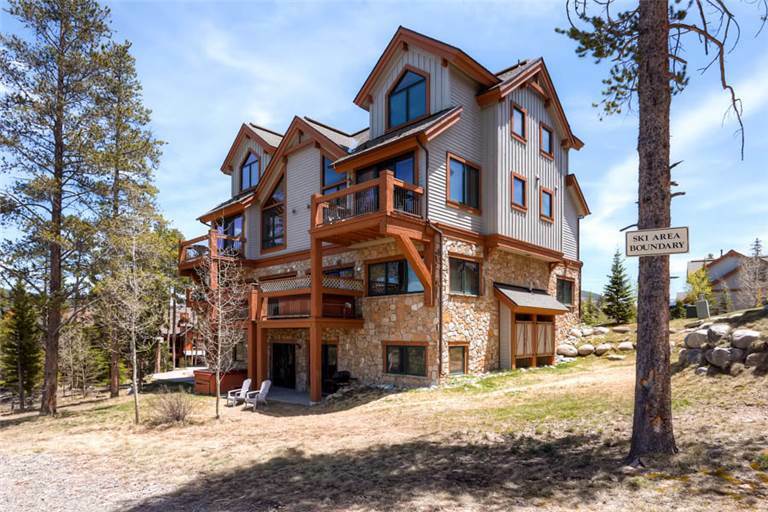 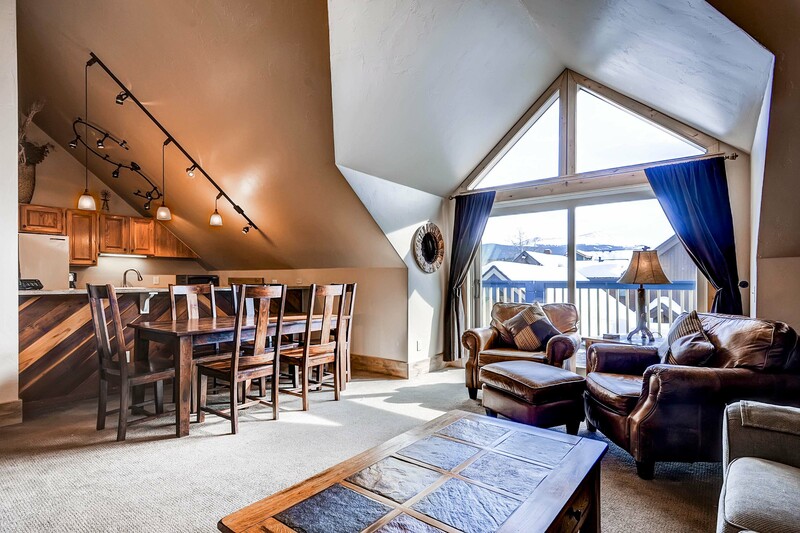 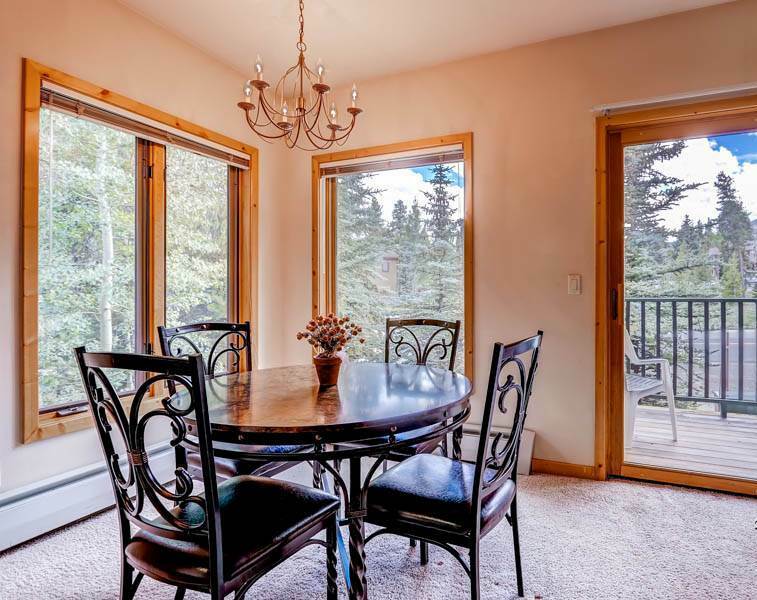 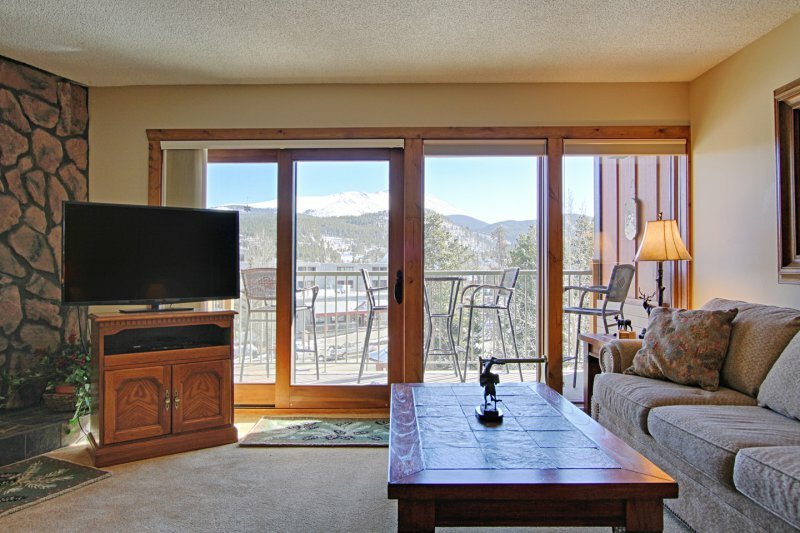 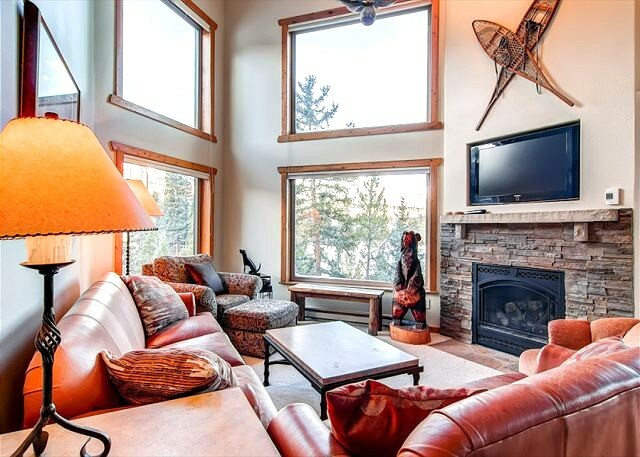 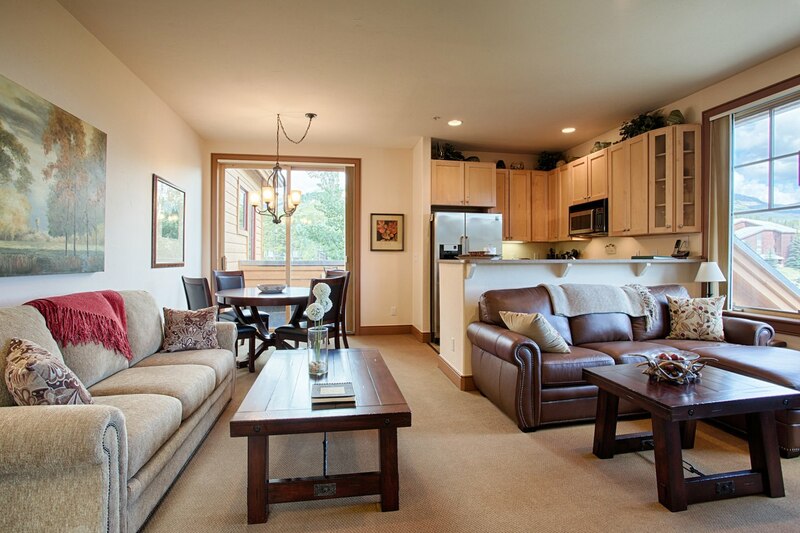 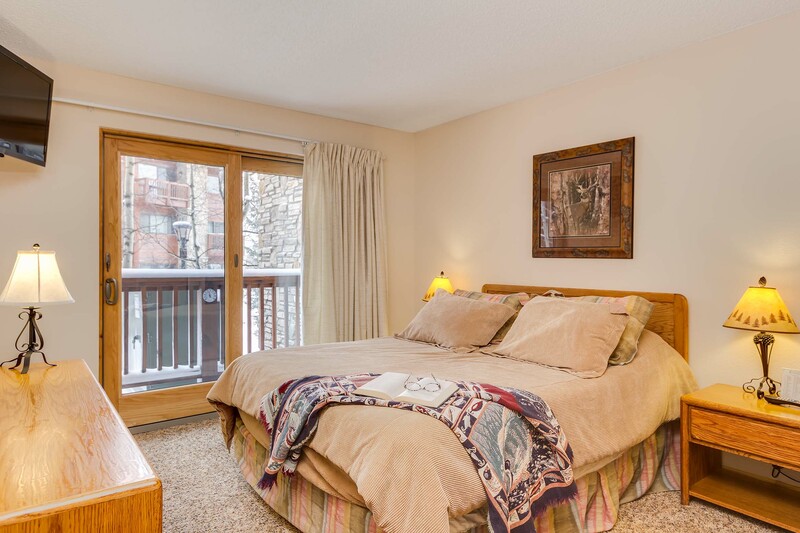 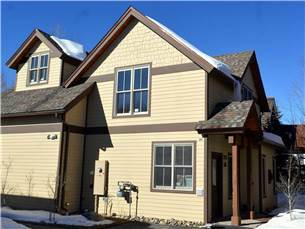 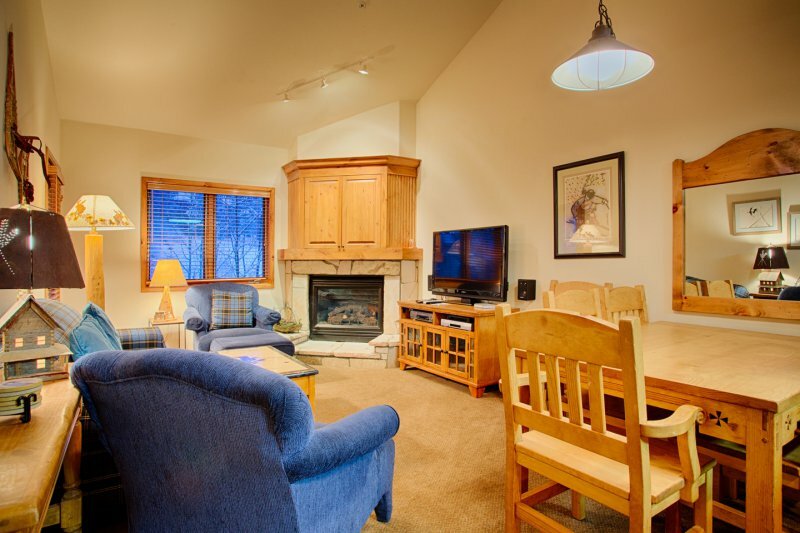 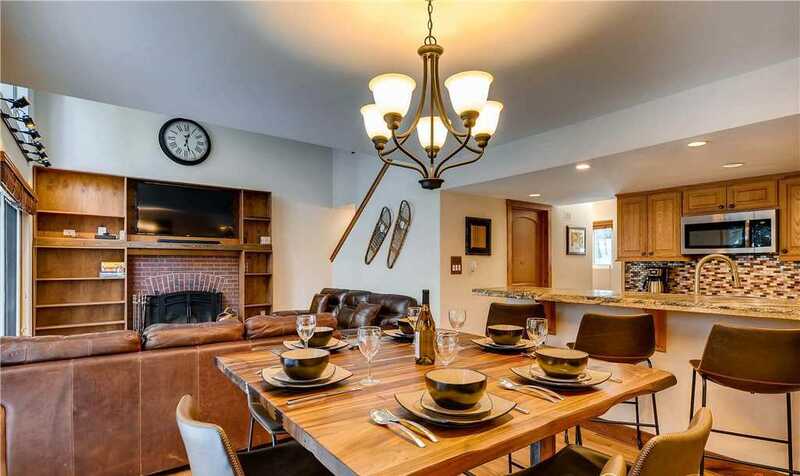 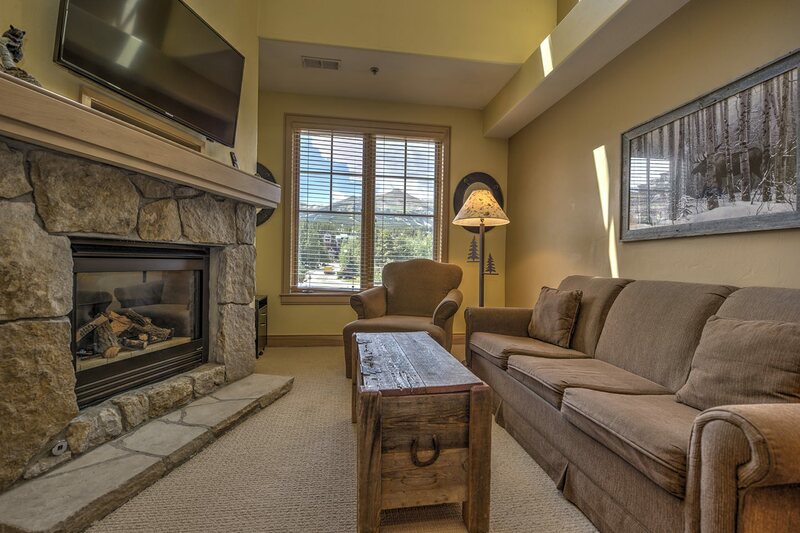 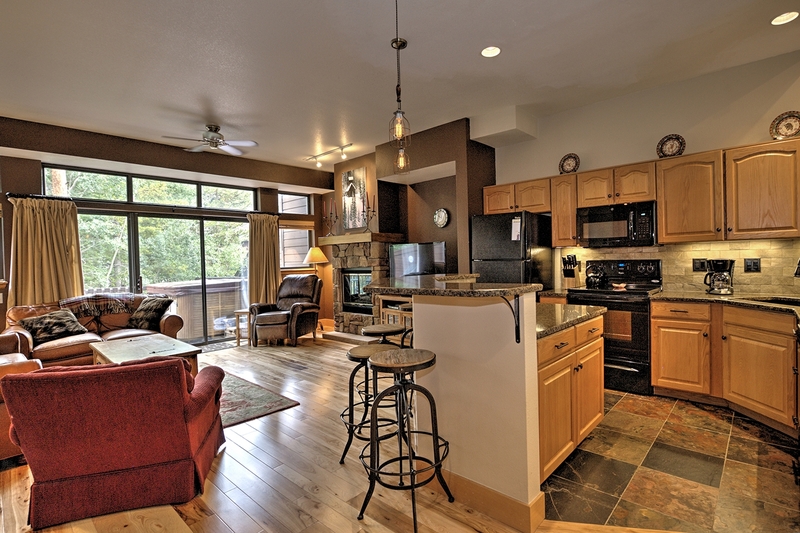 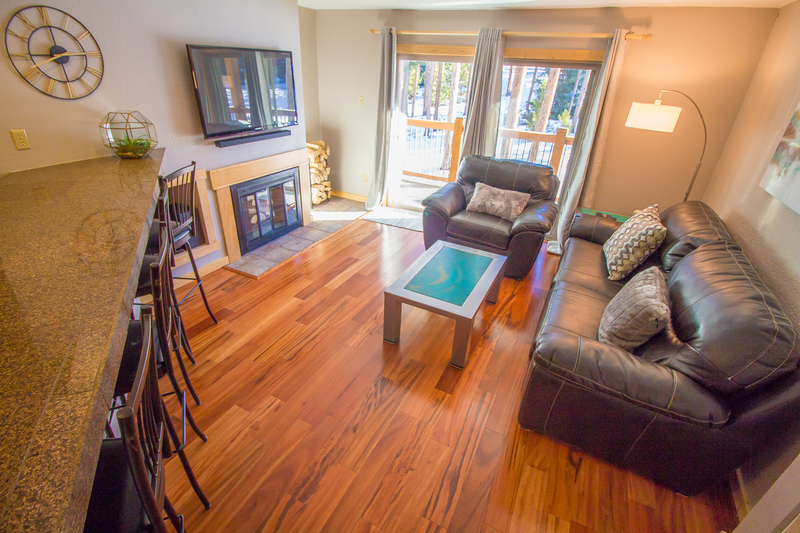 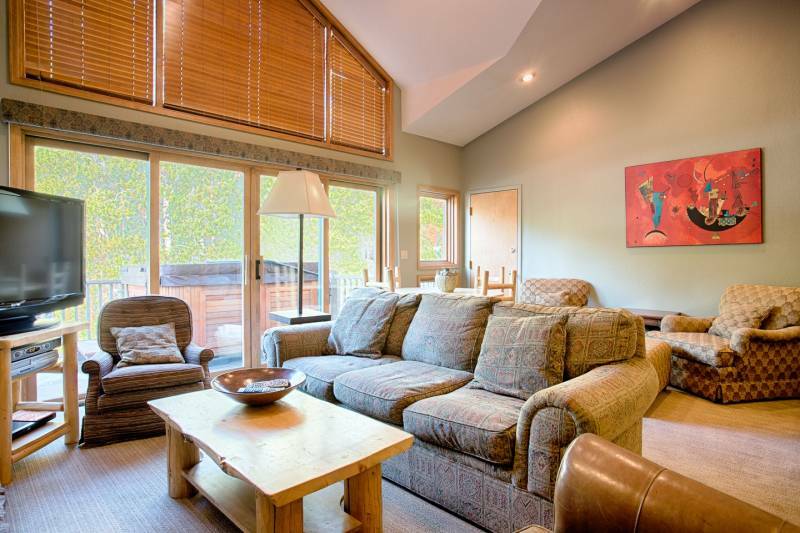 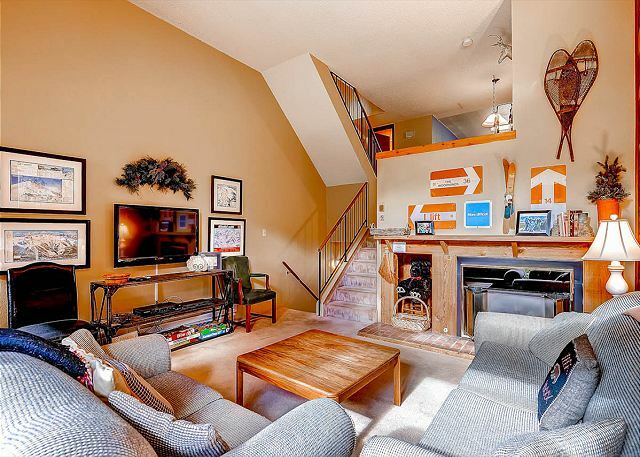 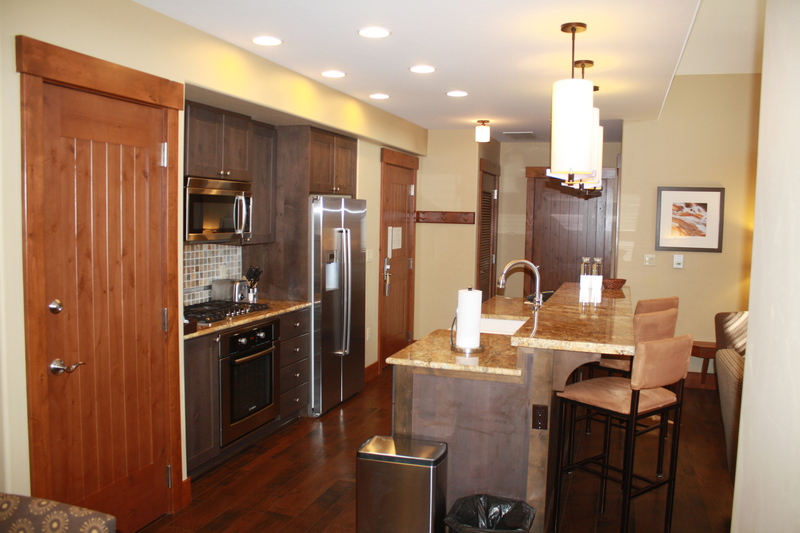 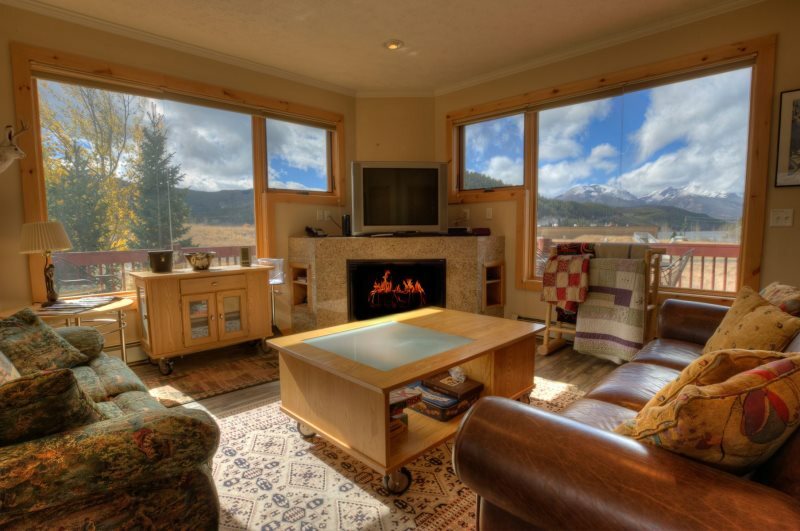 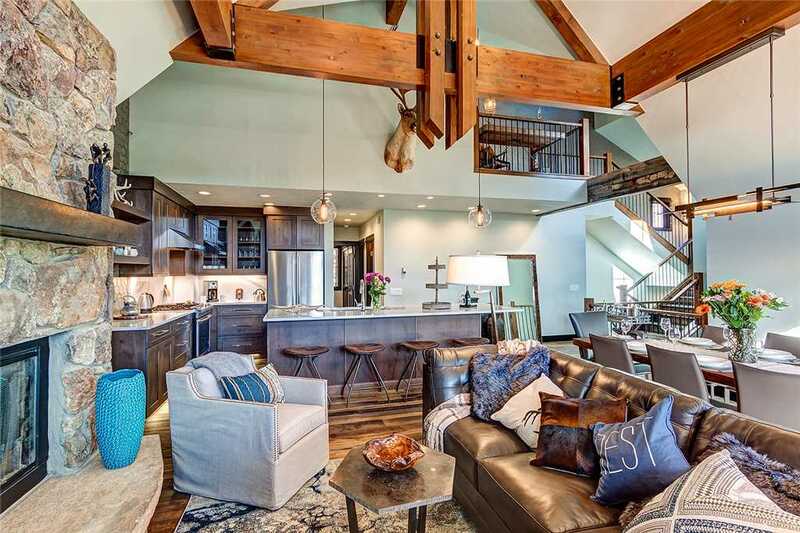 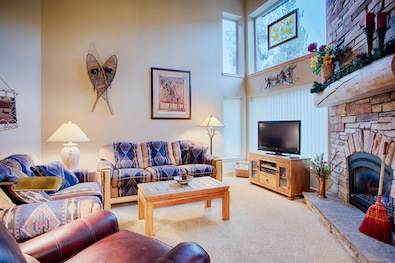 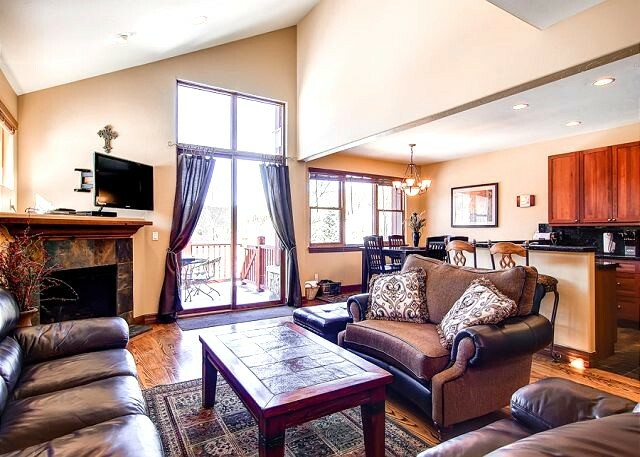 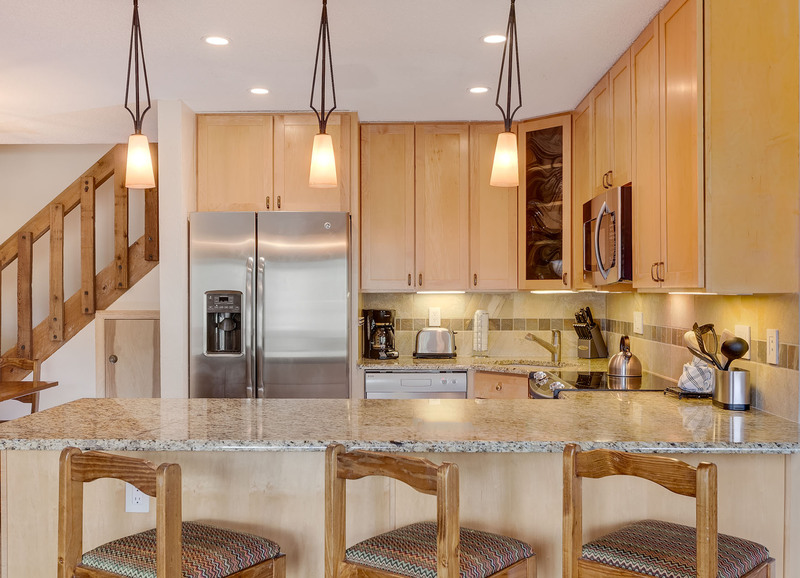 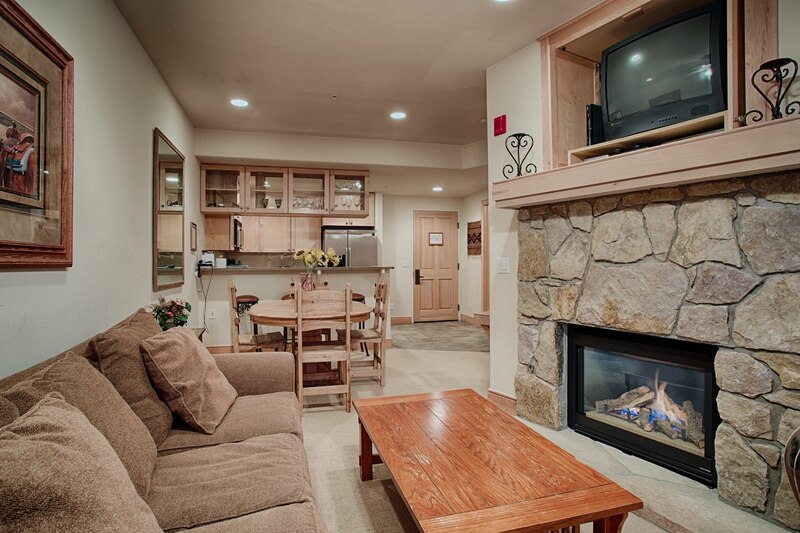 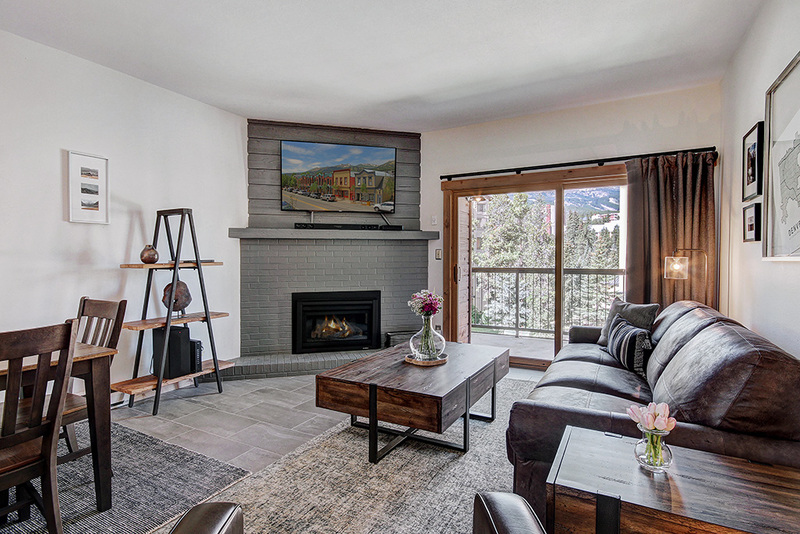 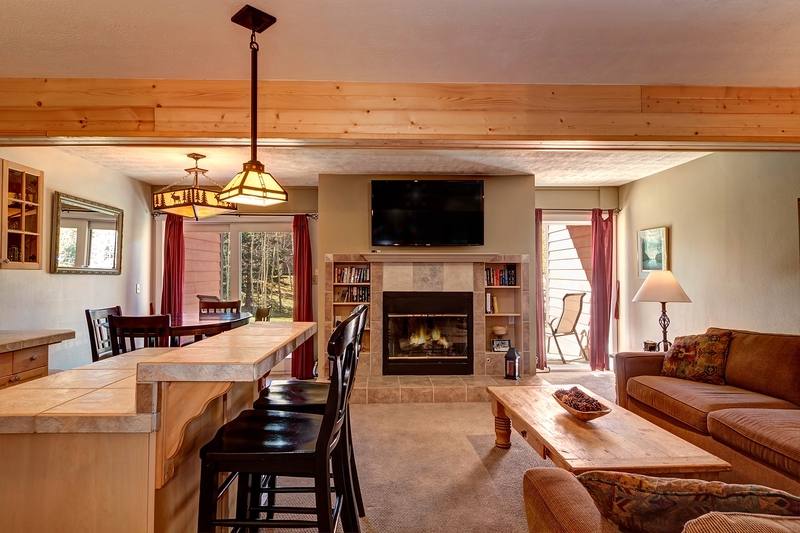 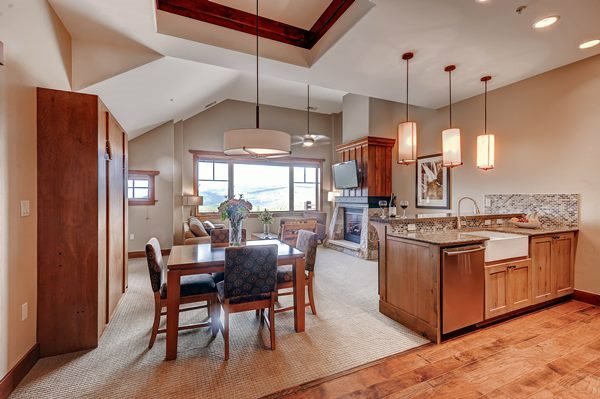 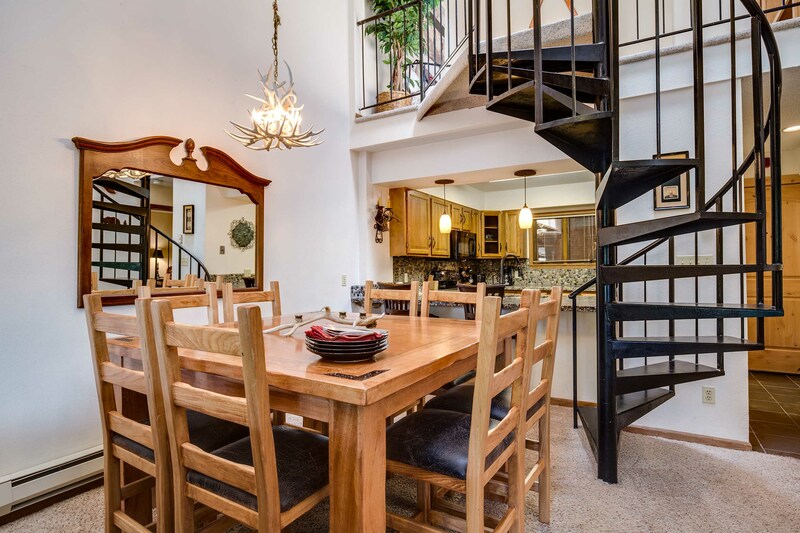 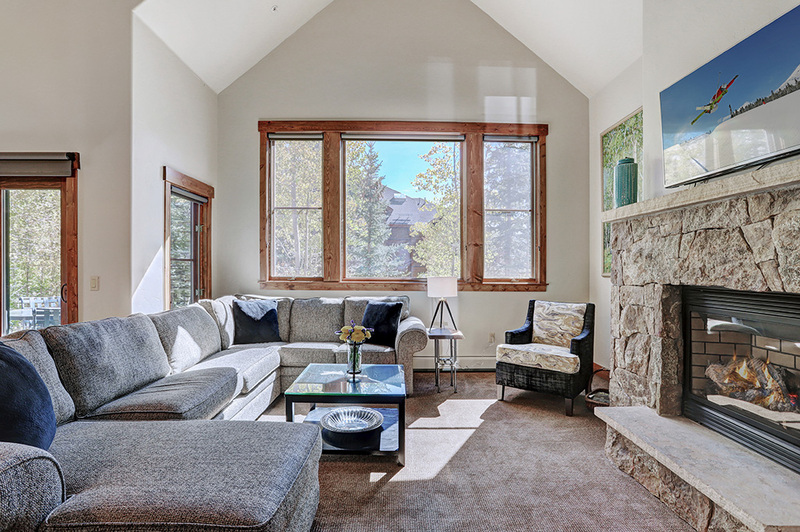 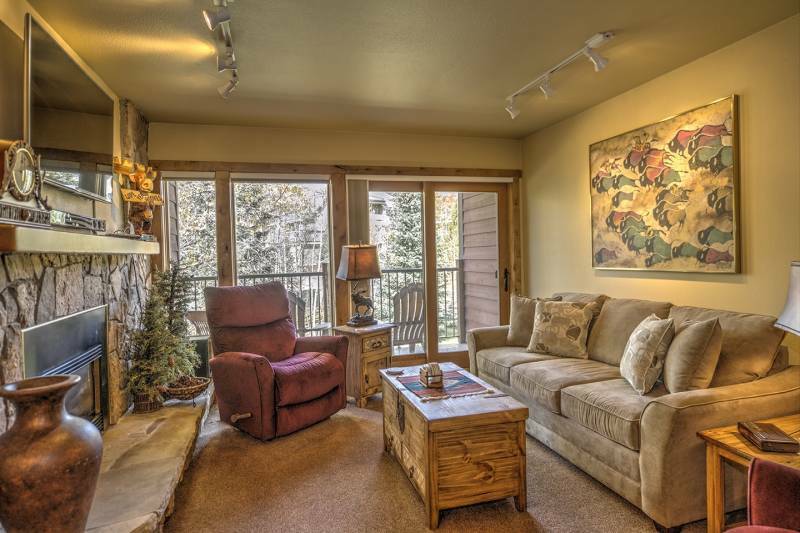 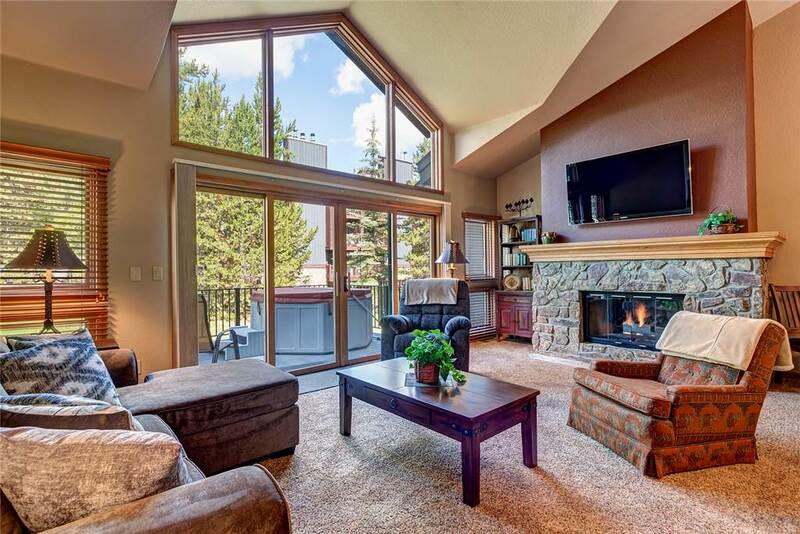 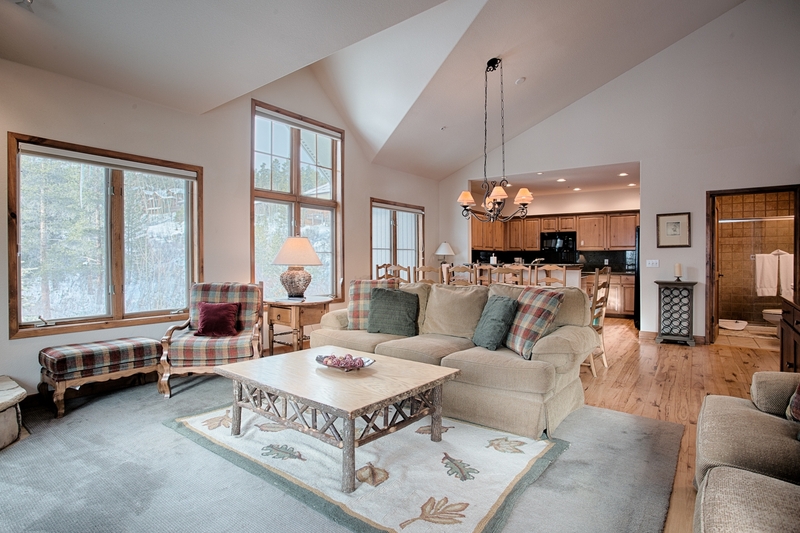 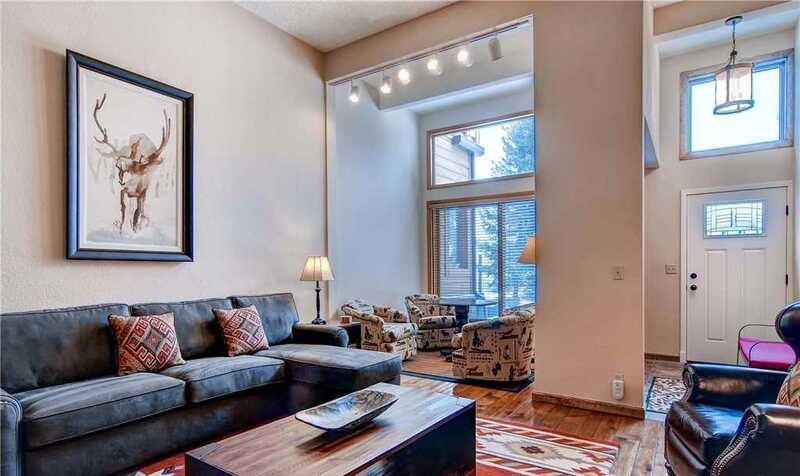 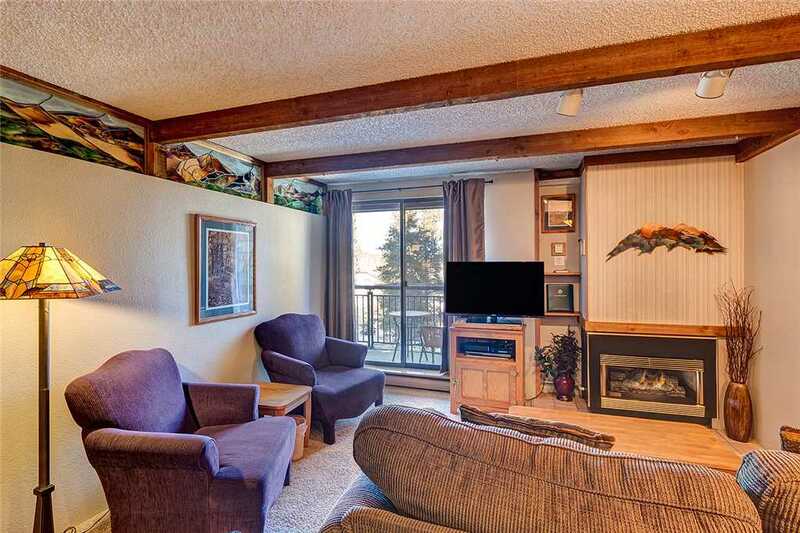 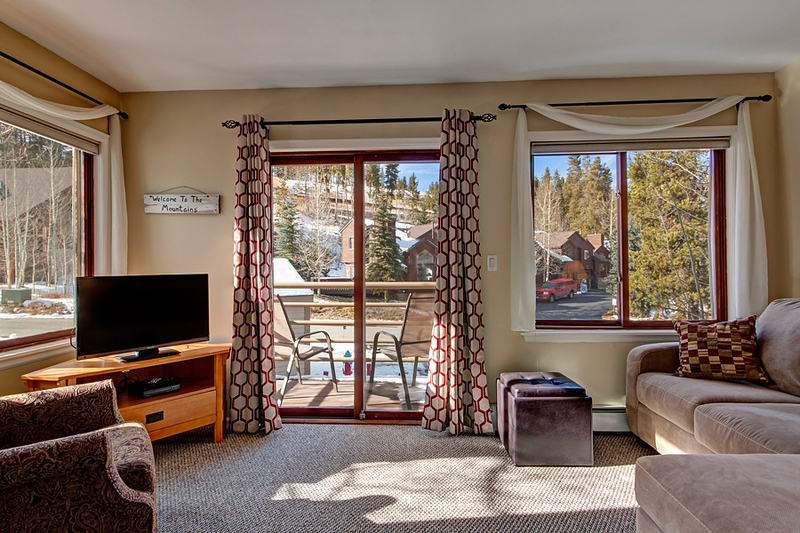 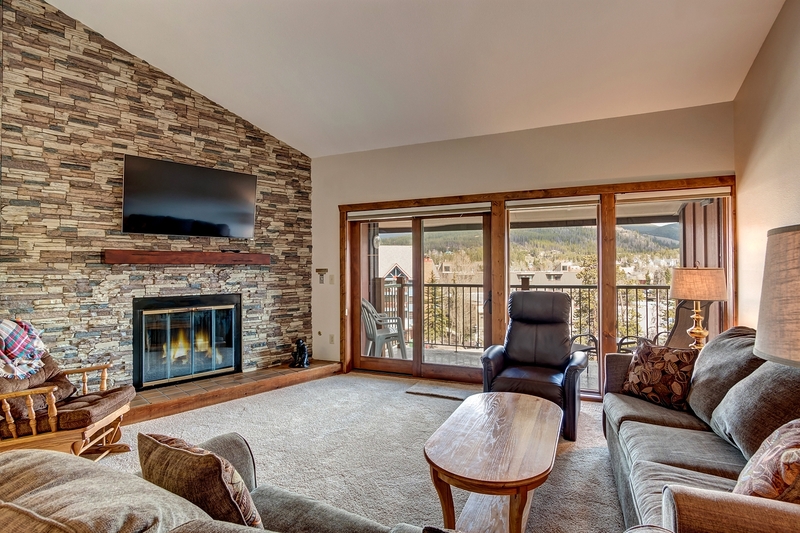 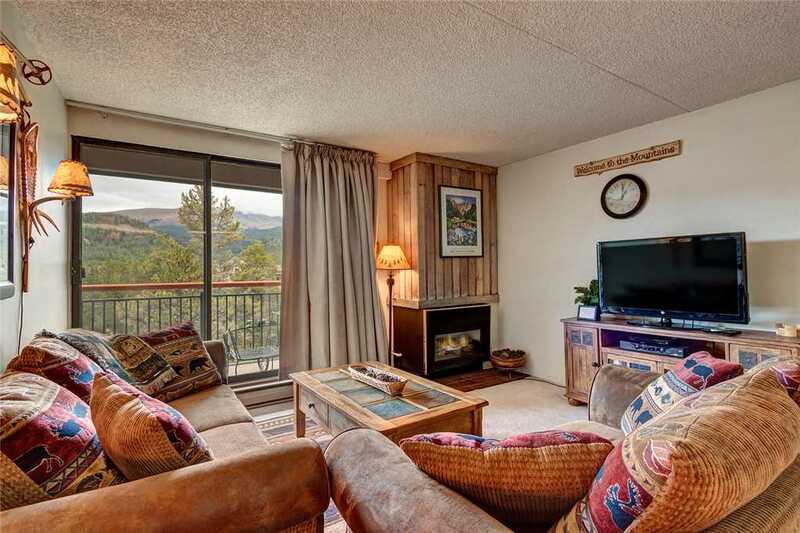 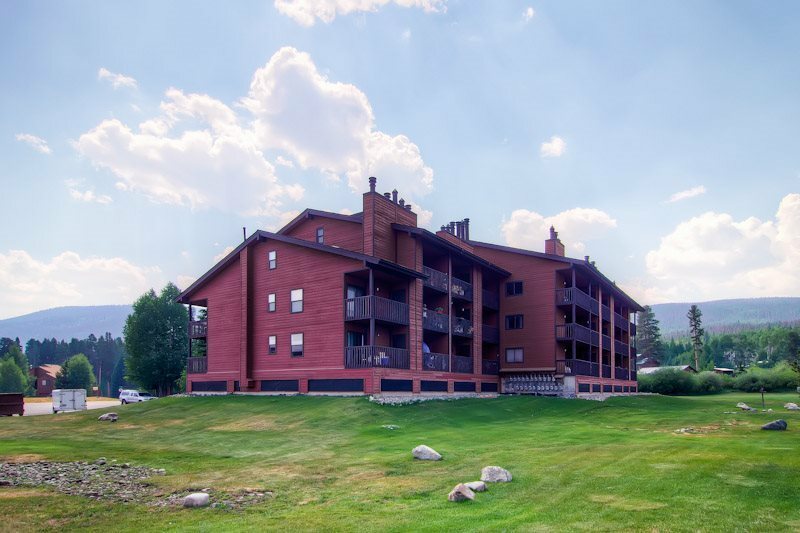 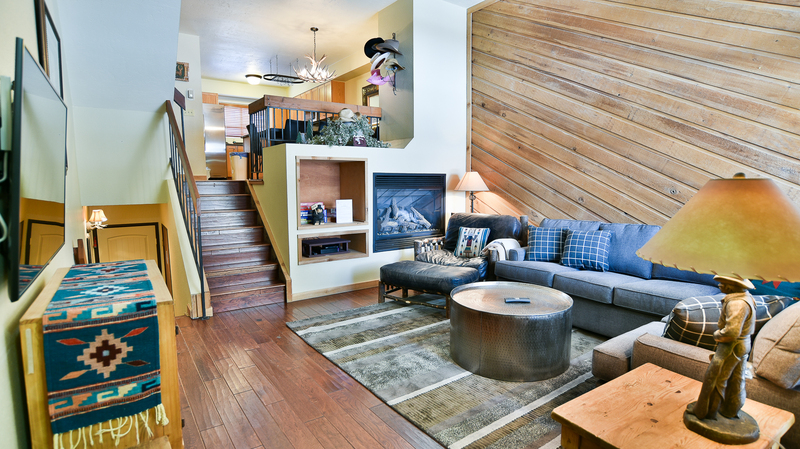 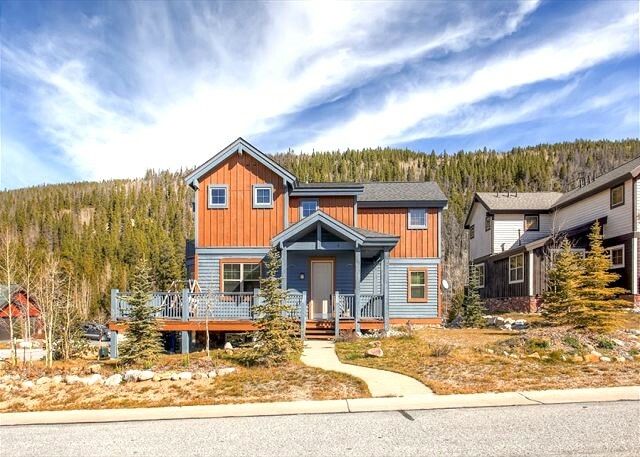 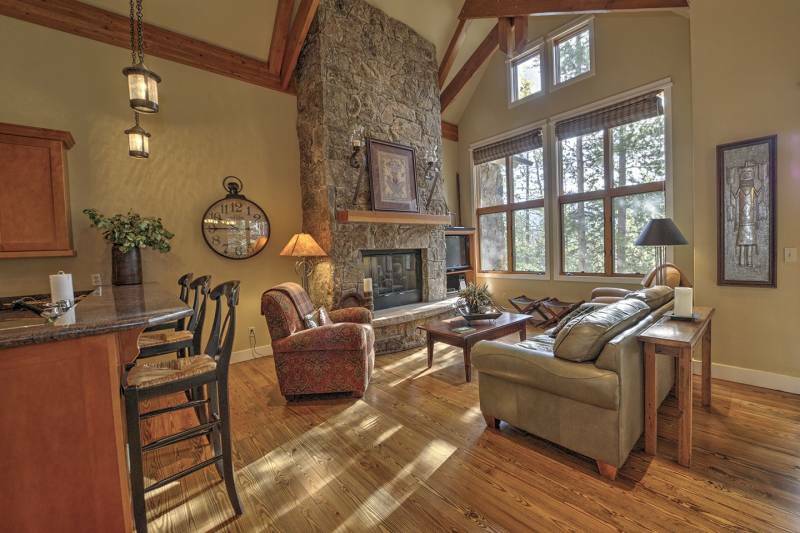 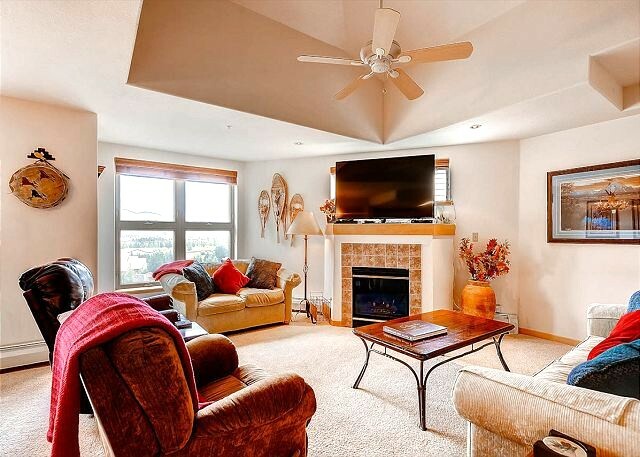 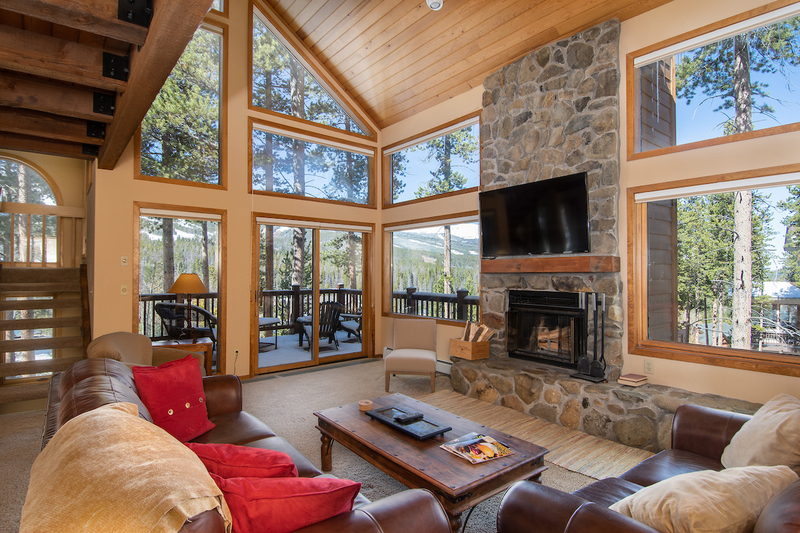 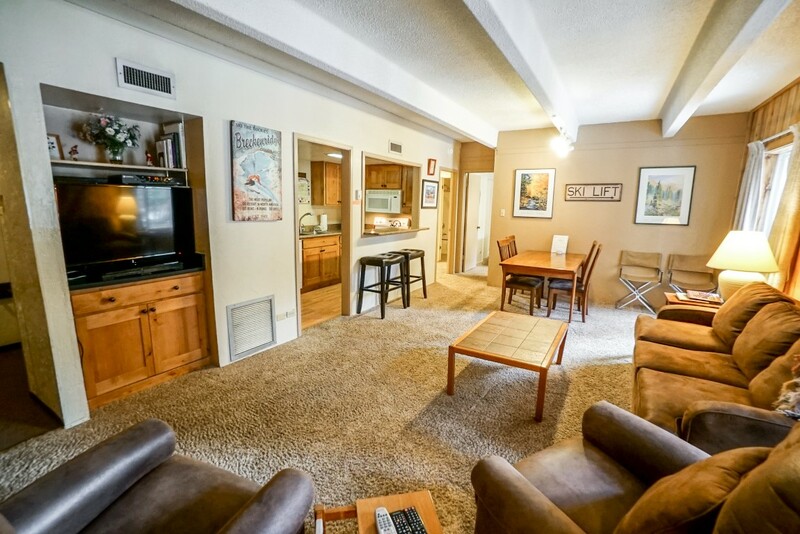 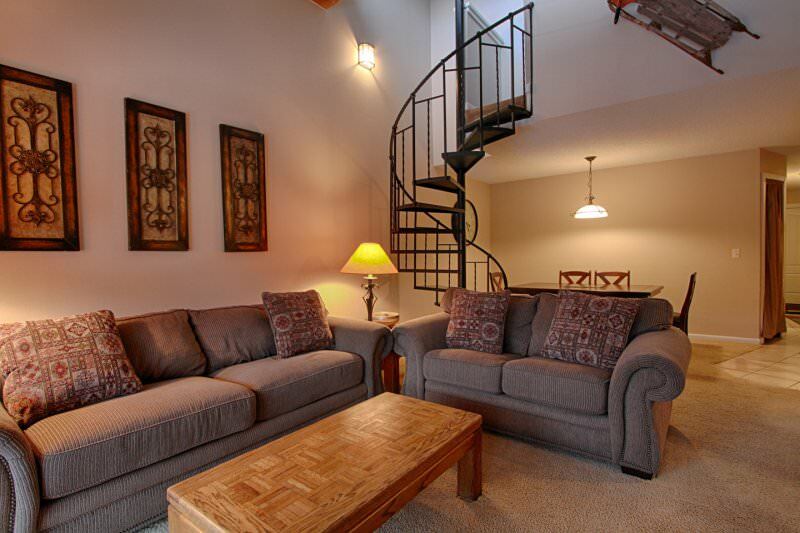 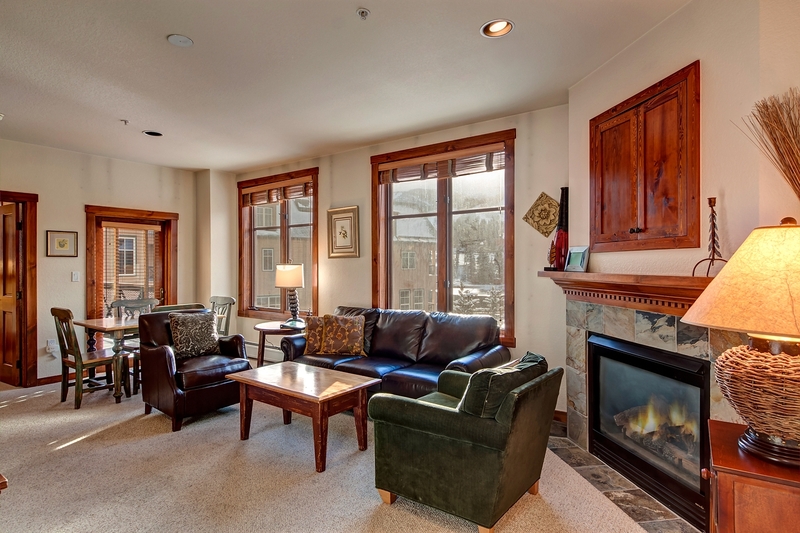 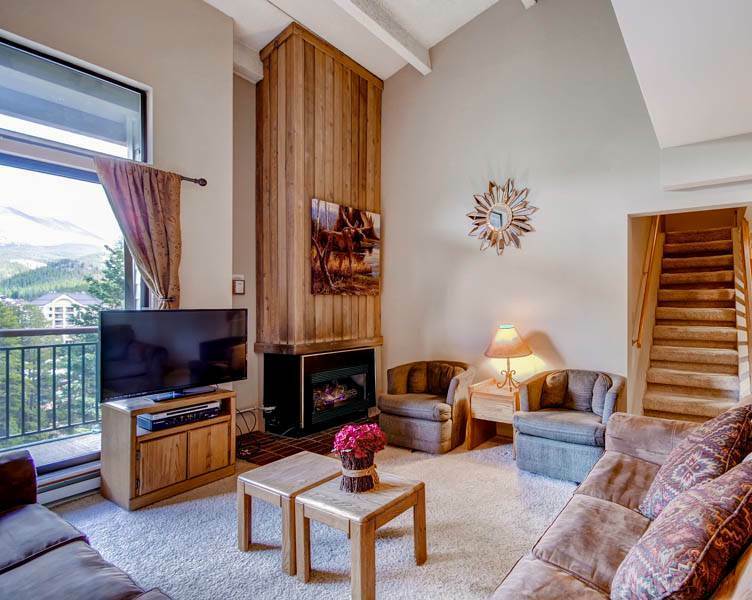 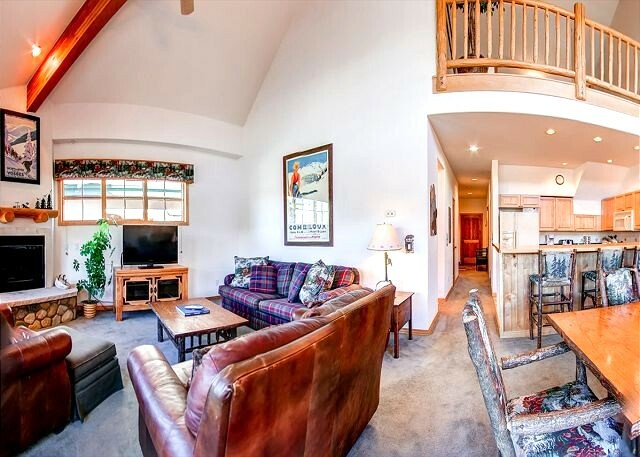 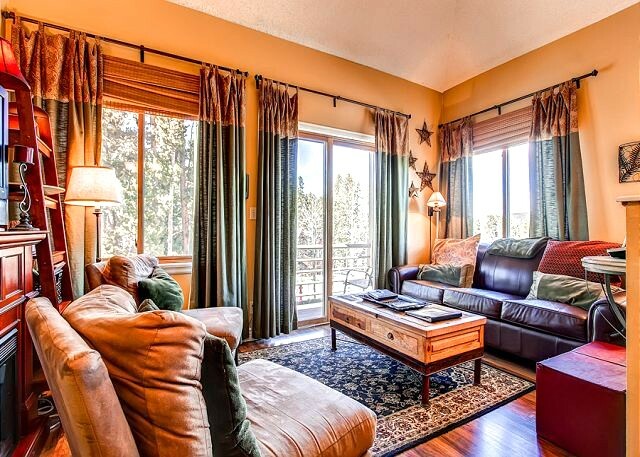 A luxurious remodel, new furnishings and scenic mountain views make this Gold-rated loft condominium a treat for a Breckenridge getaway. 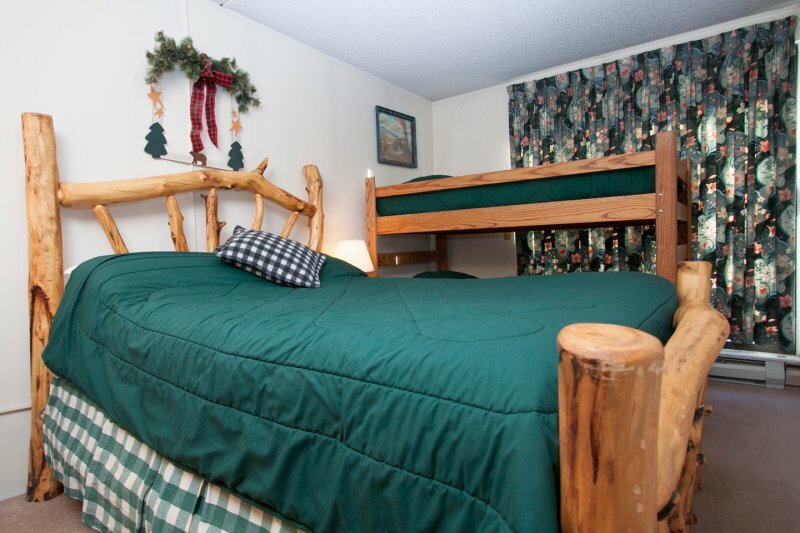 And with one of the largest sleeping capacities at Pine Ridge, it’s perfect for a larger group. 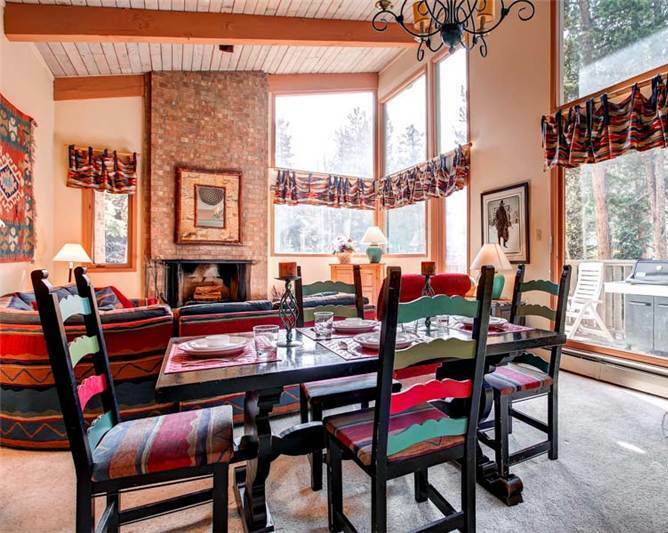 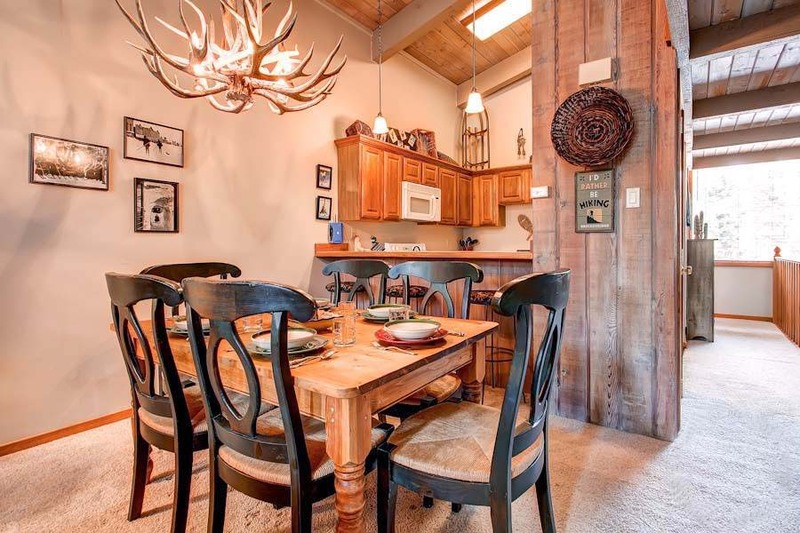 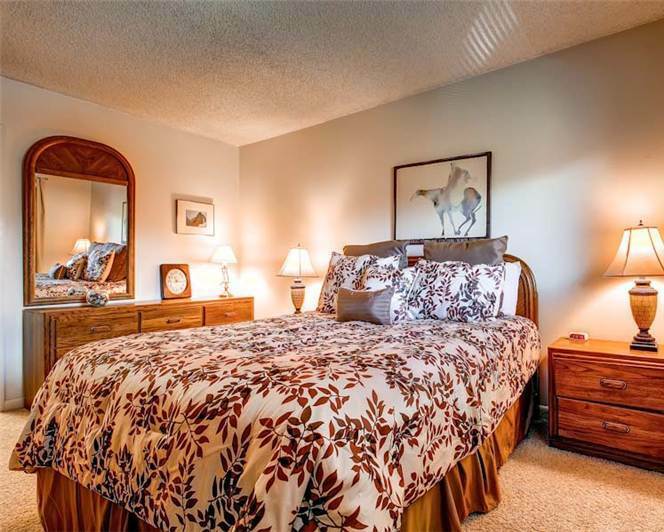 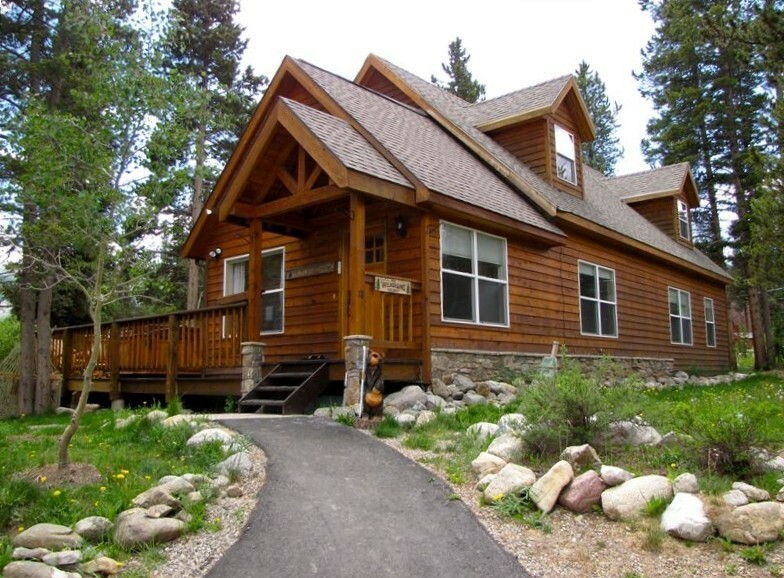 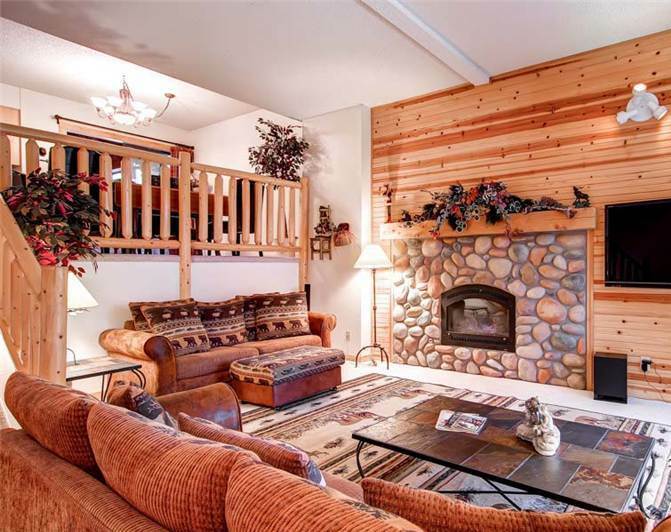 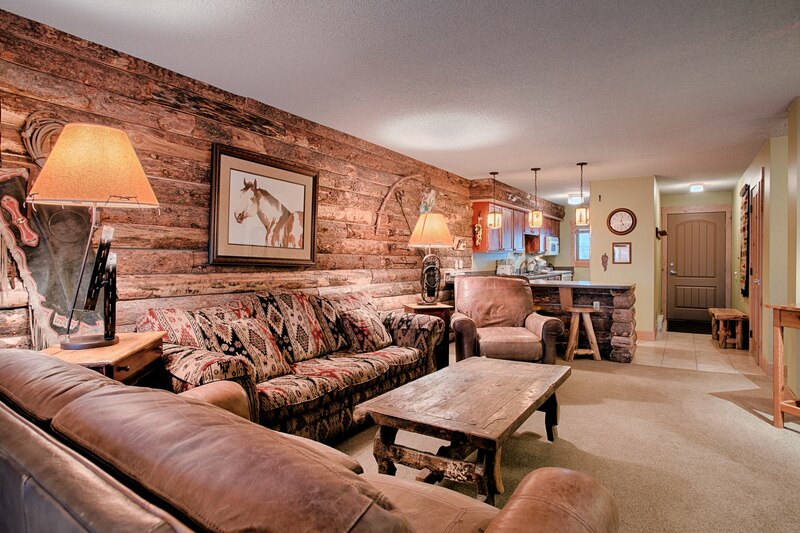 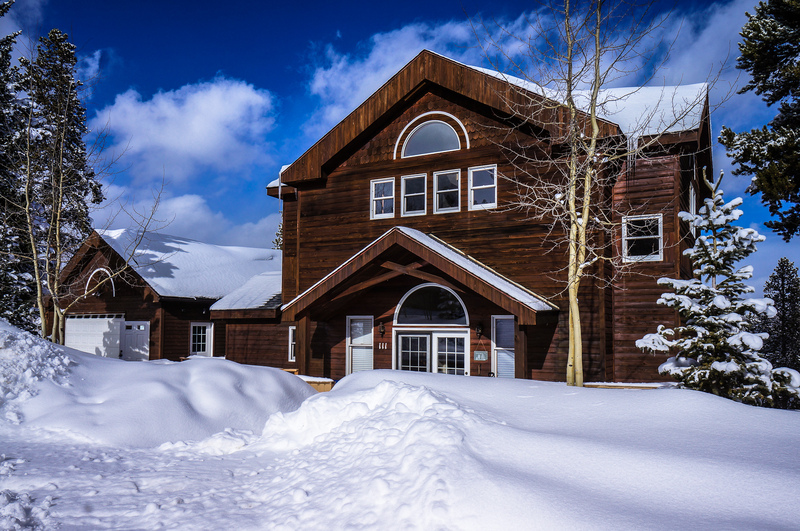 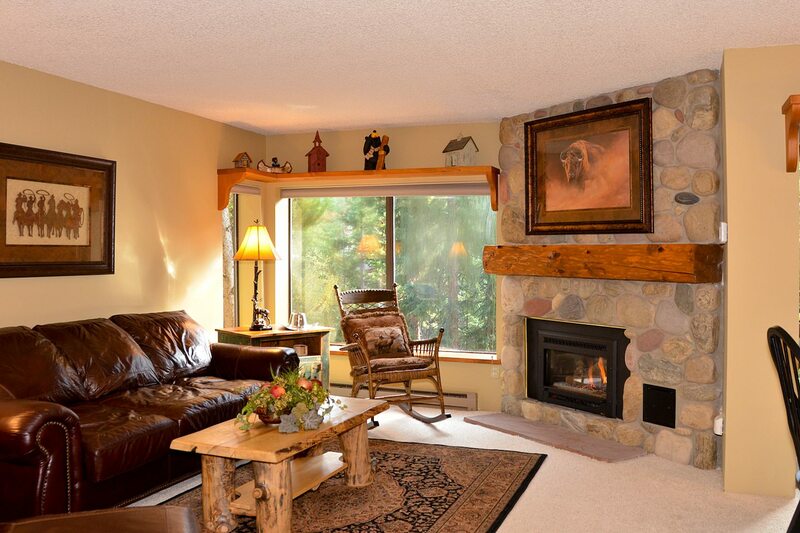 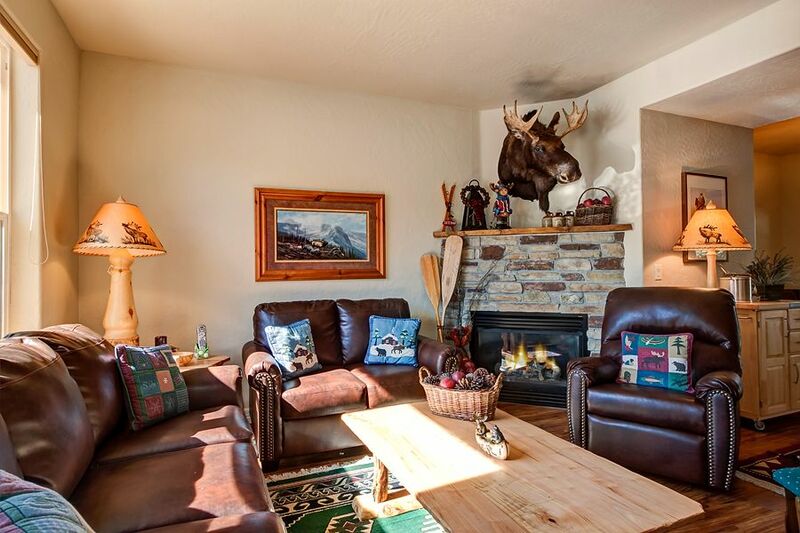 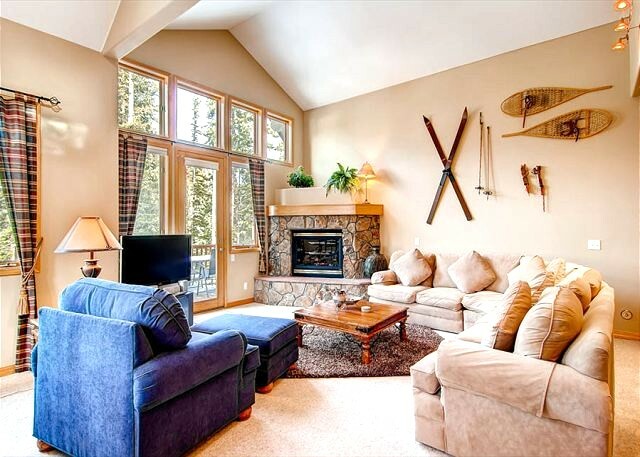 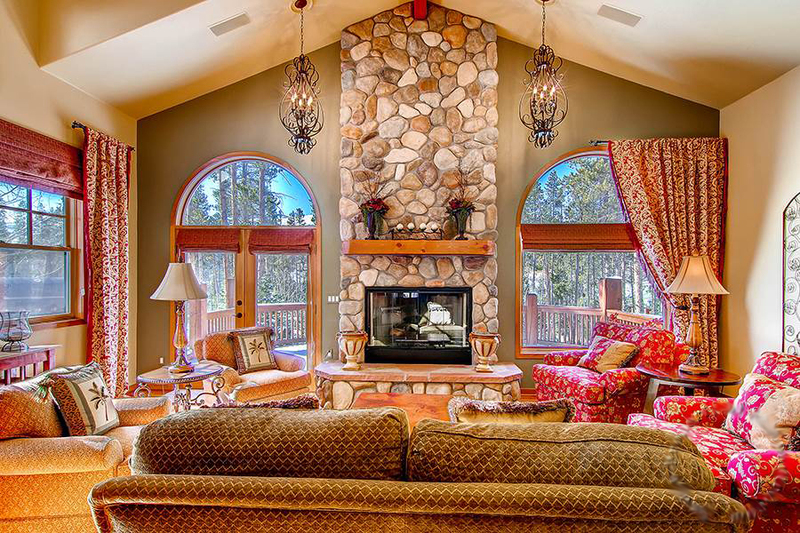 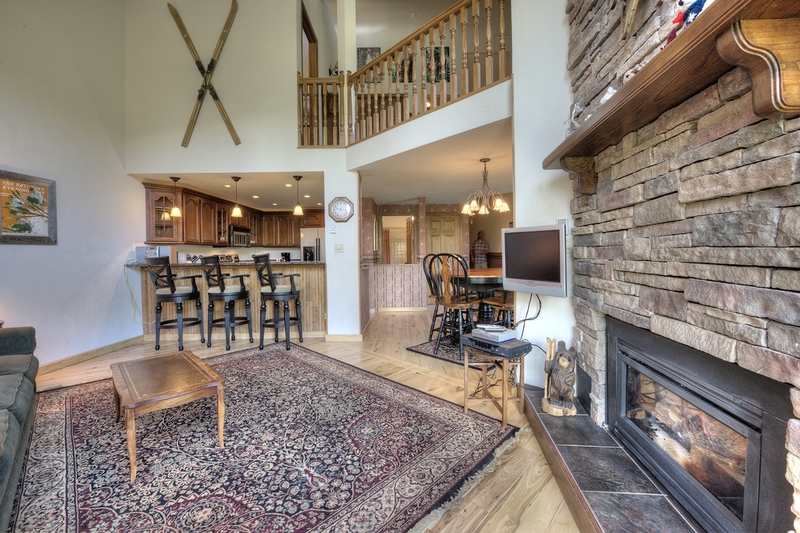 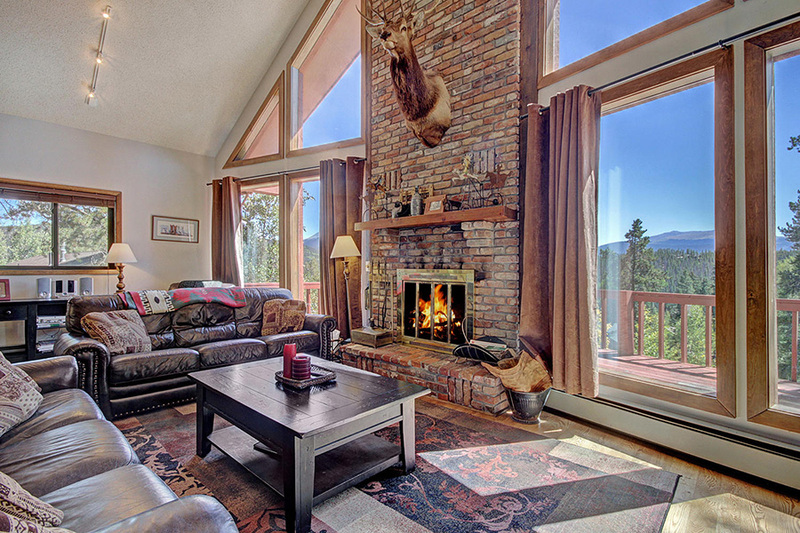 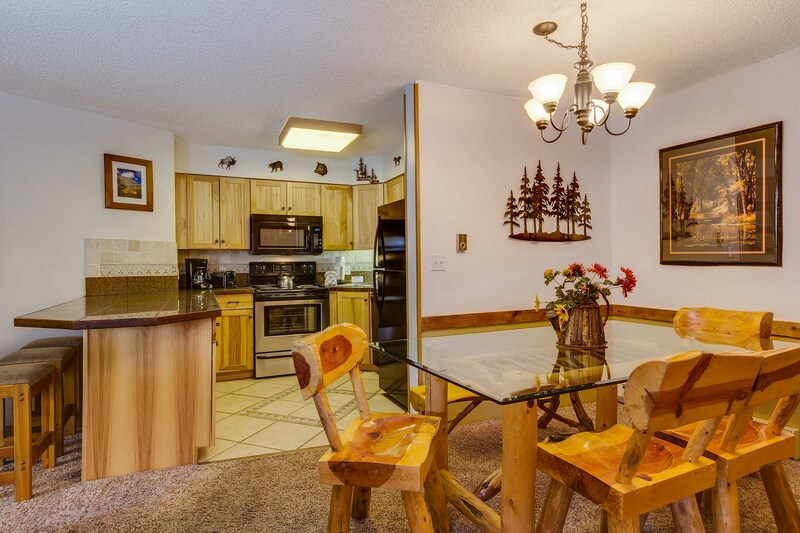 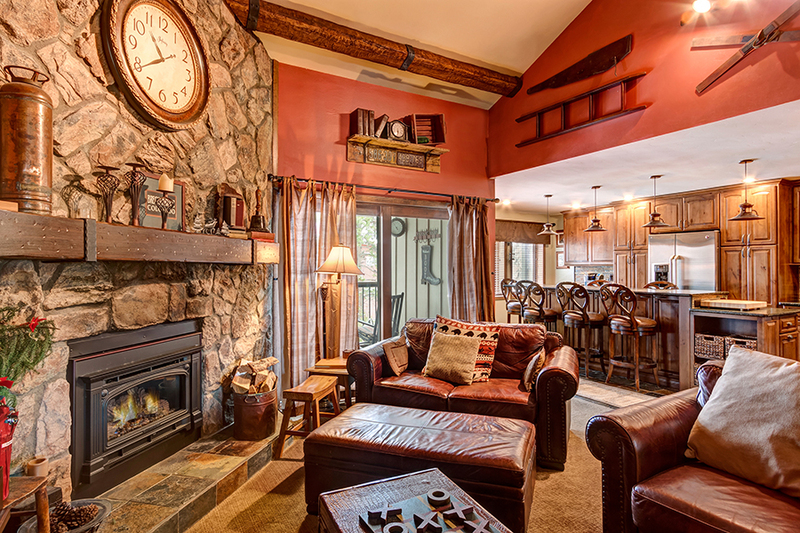 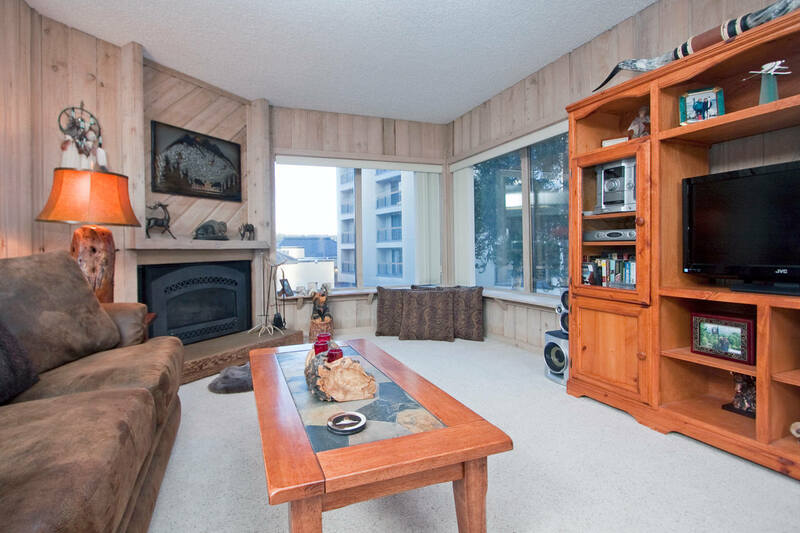 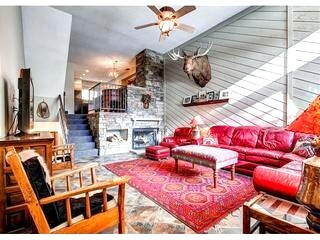 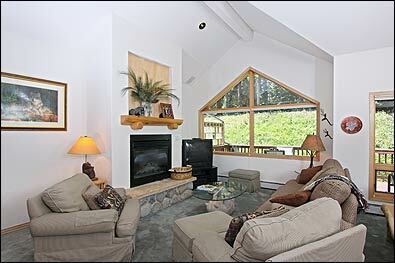 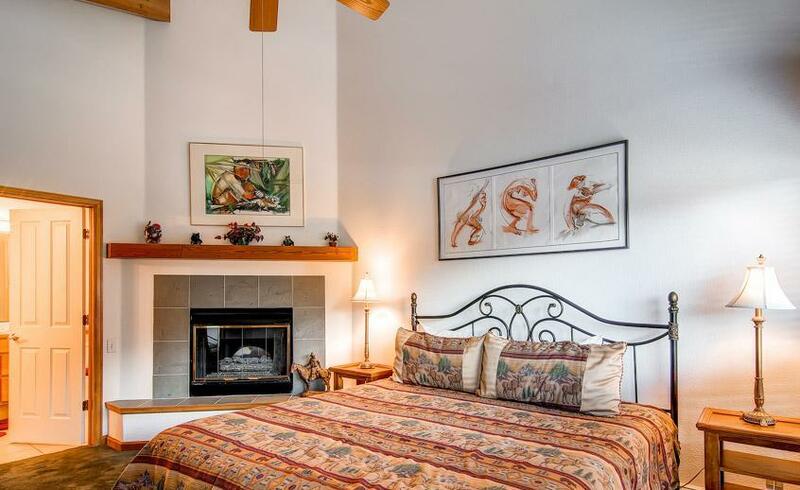 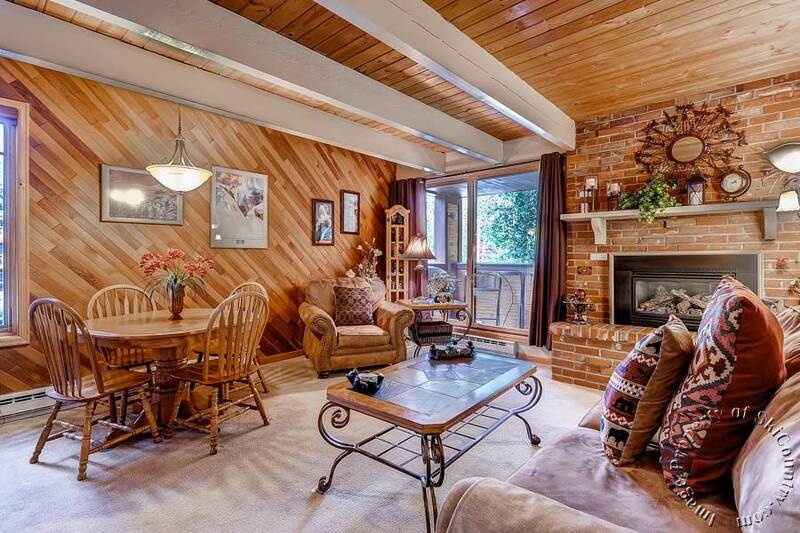 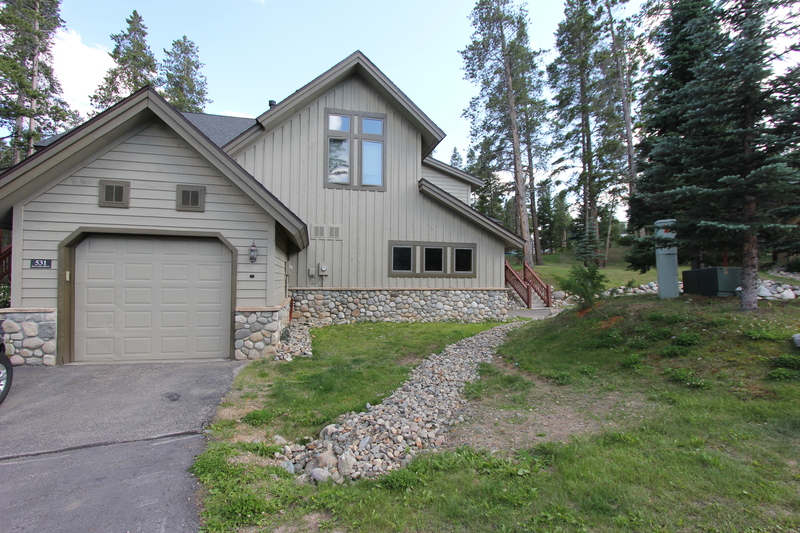 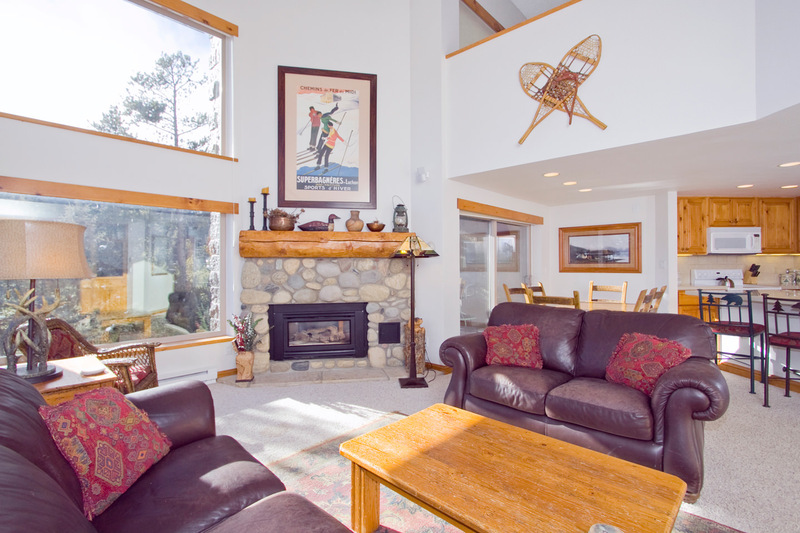 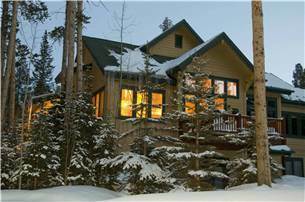 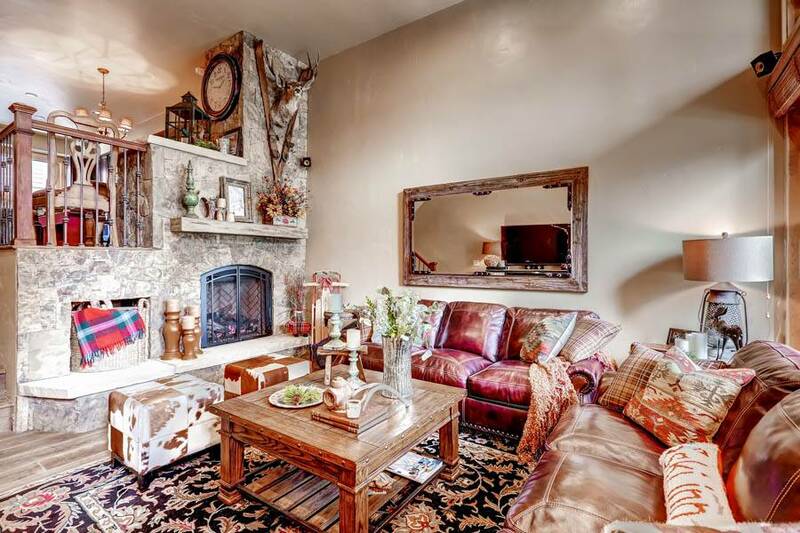 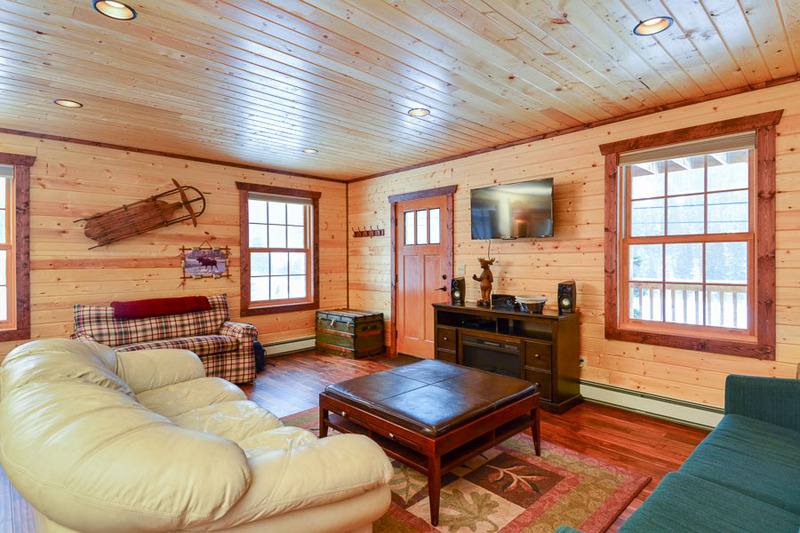 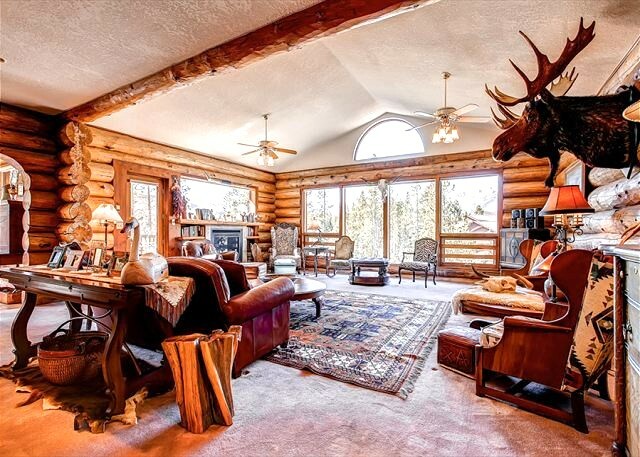 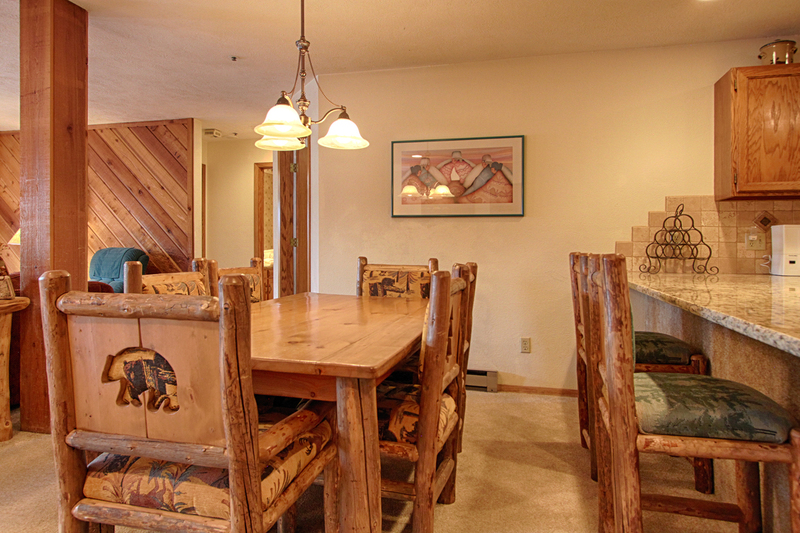 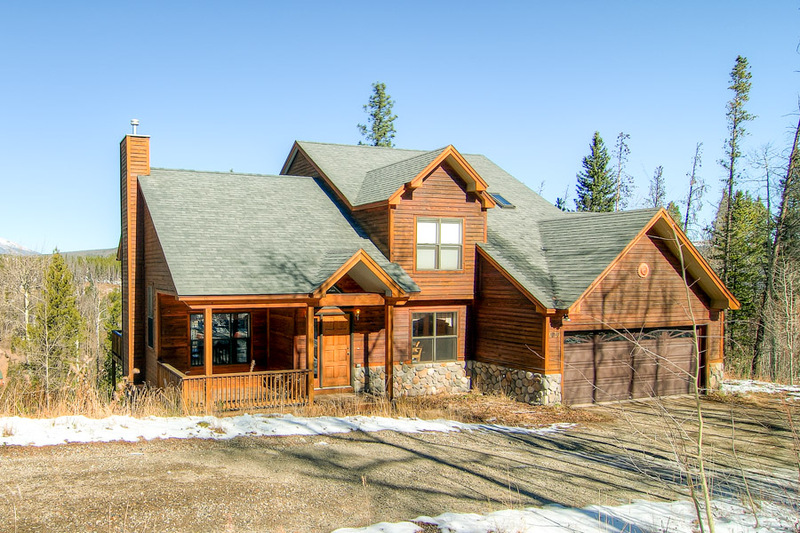 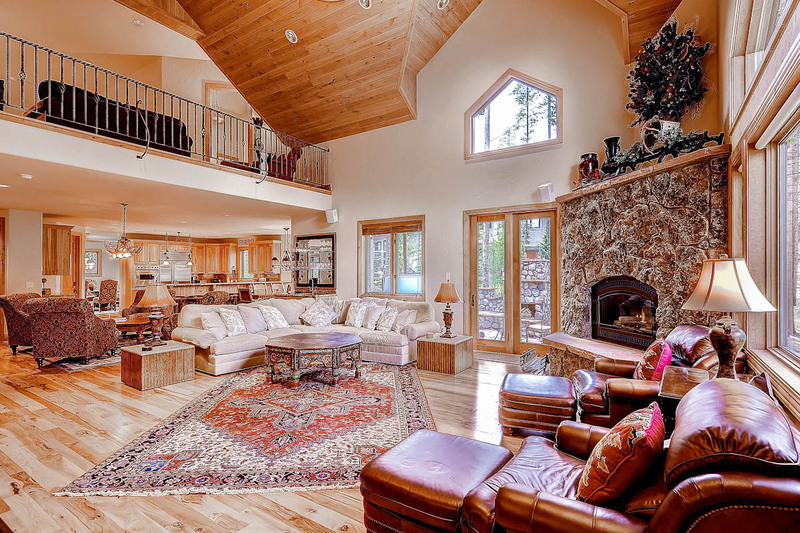 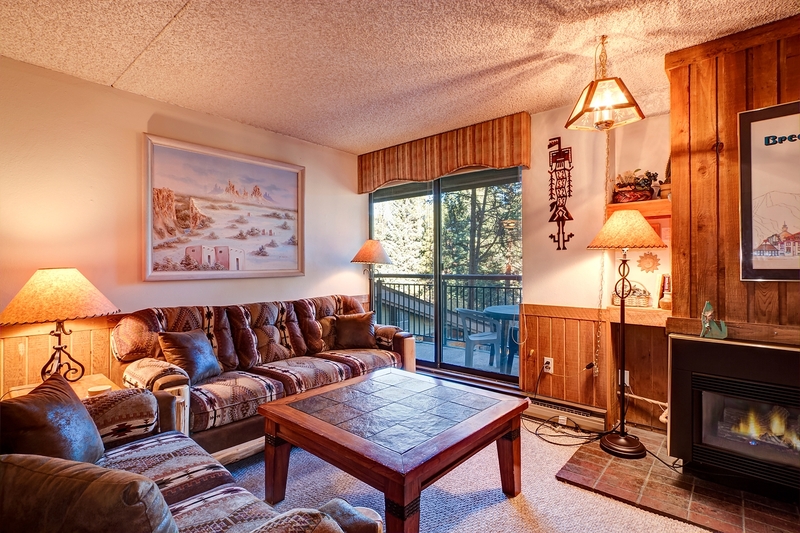 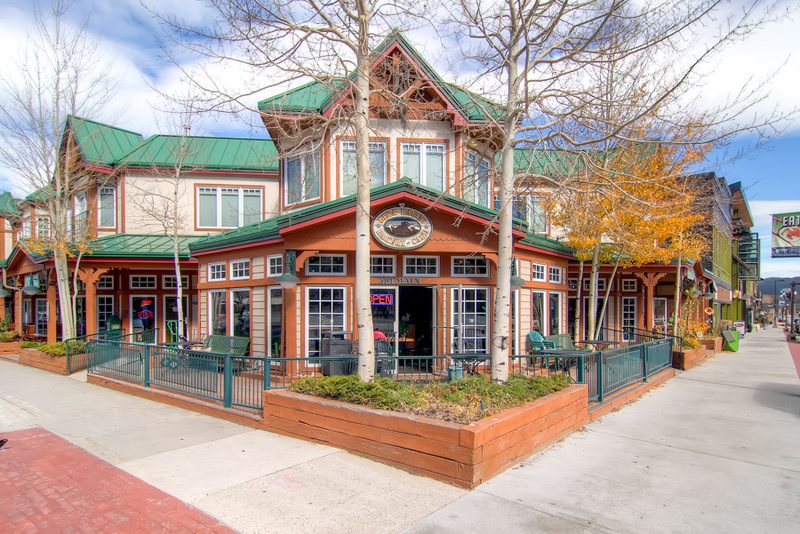 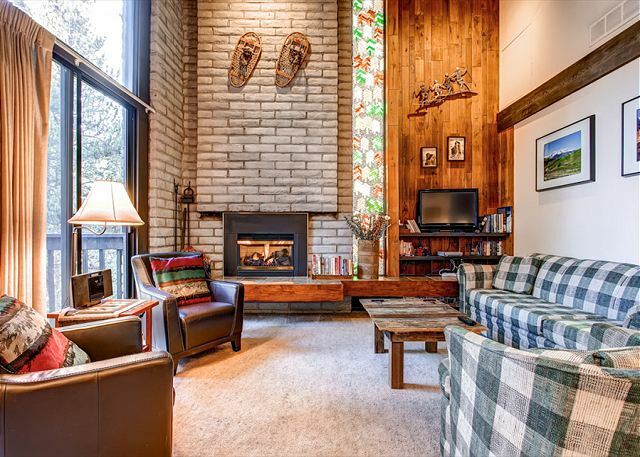 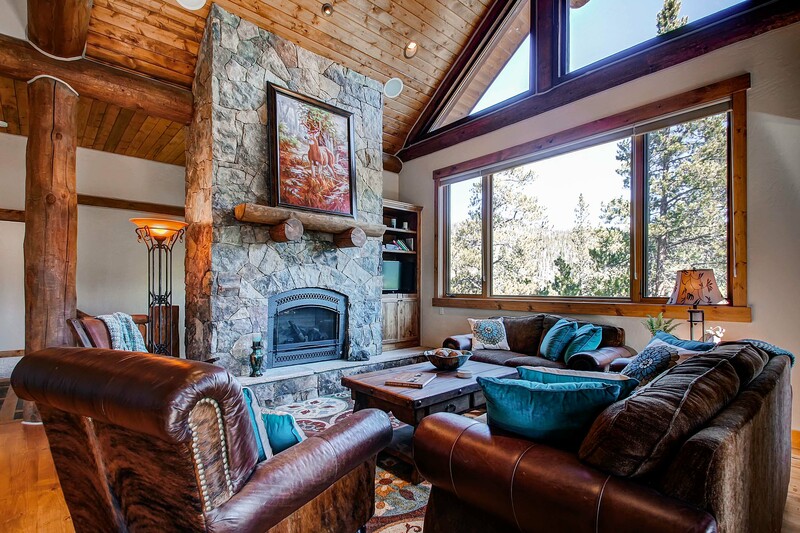 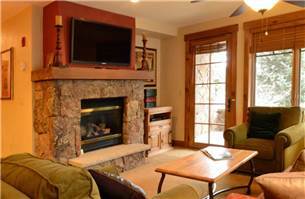 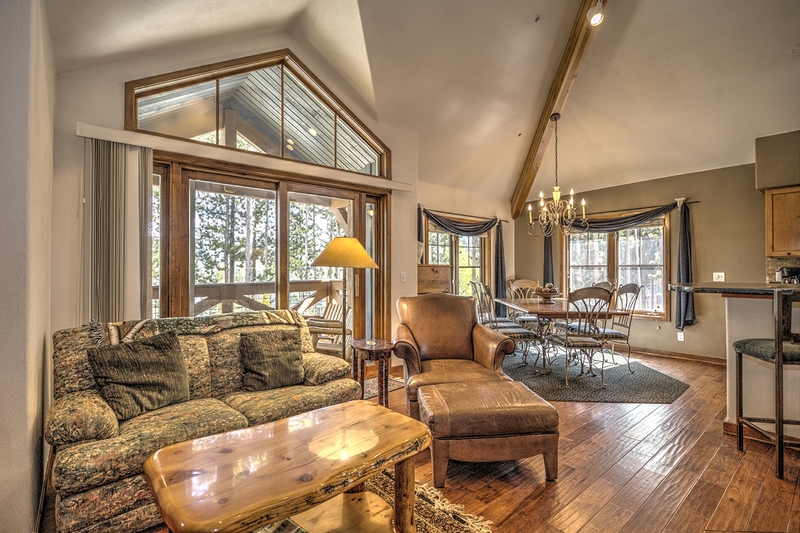 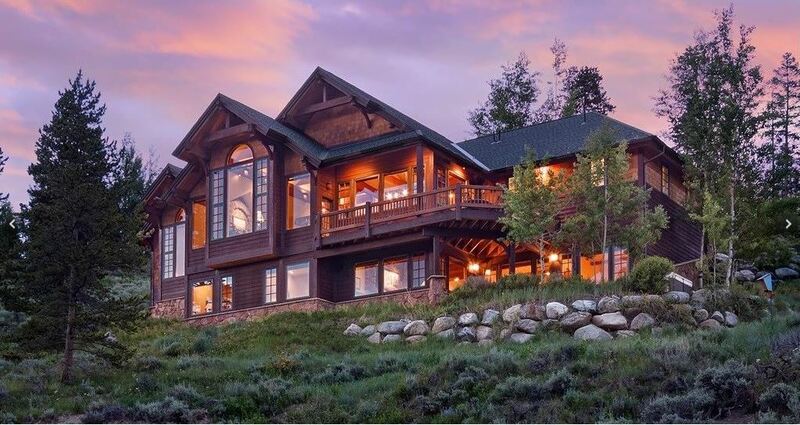 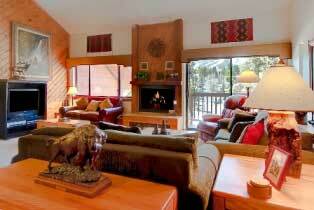 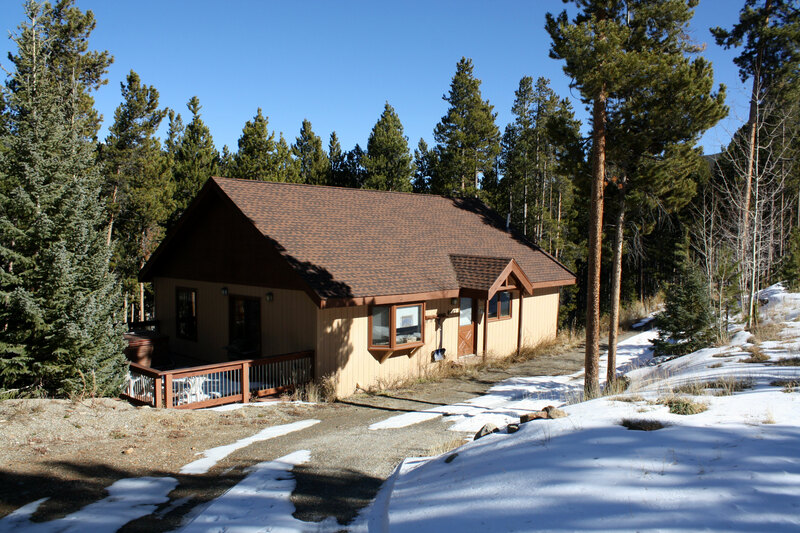 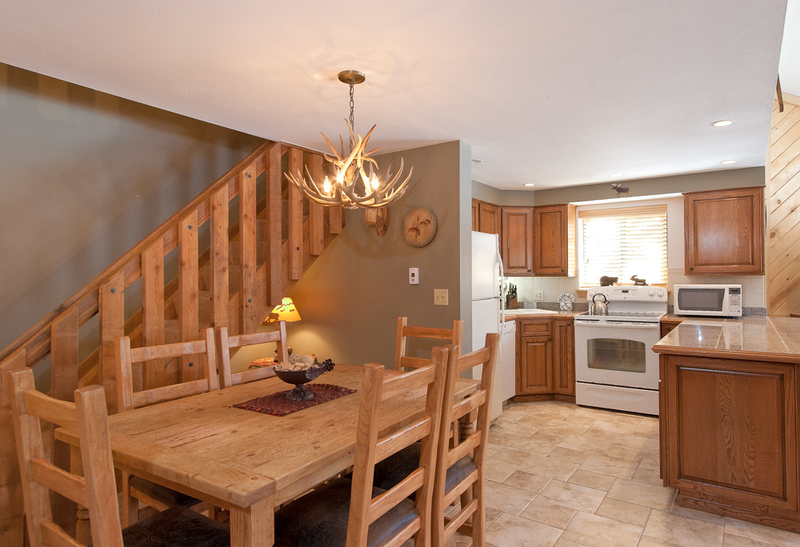 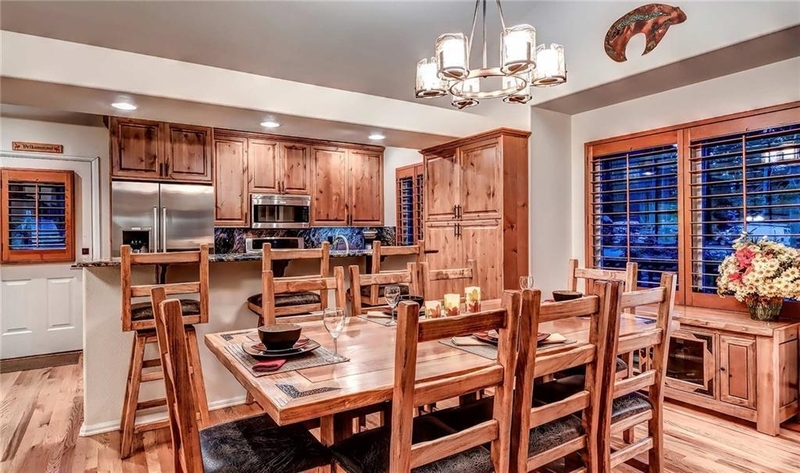 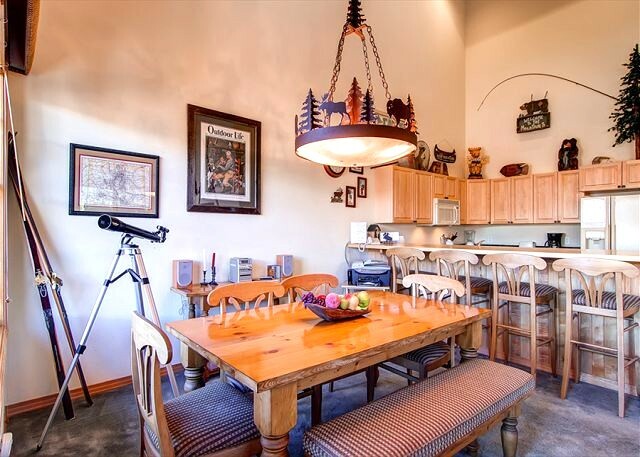 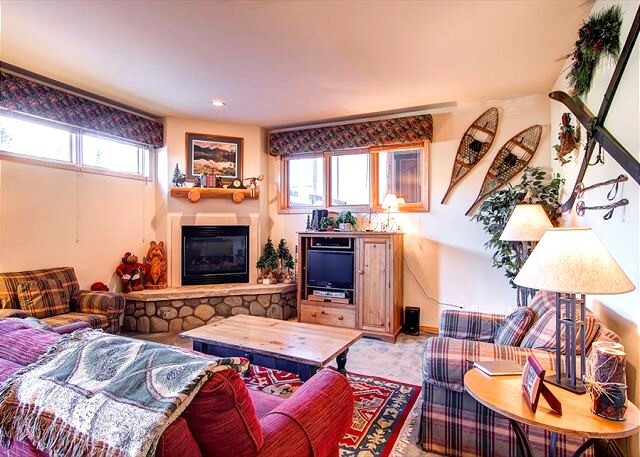 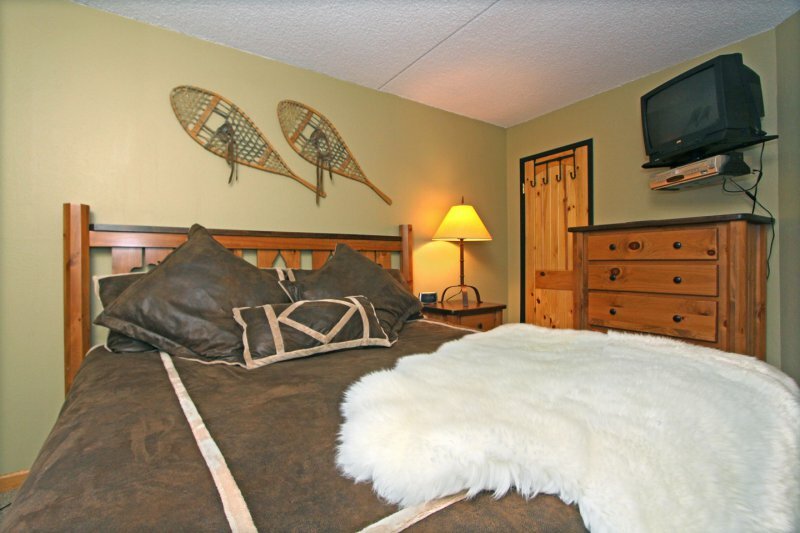 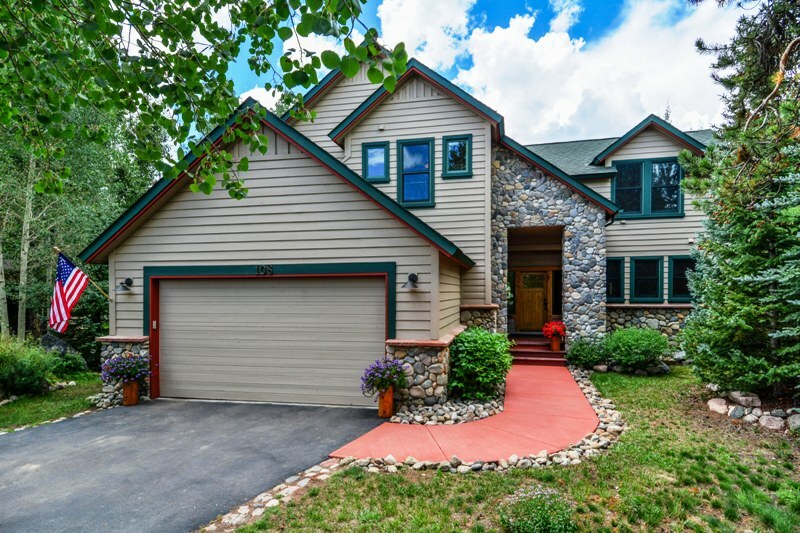 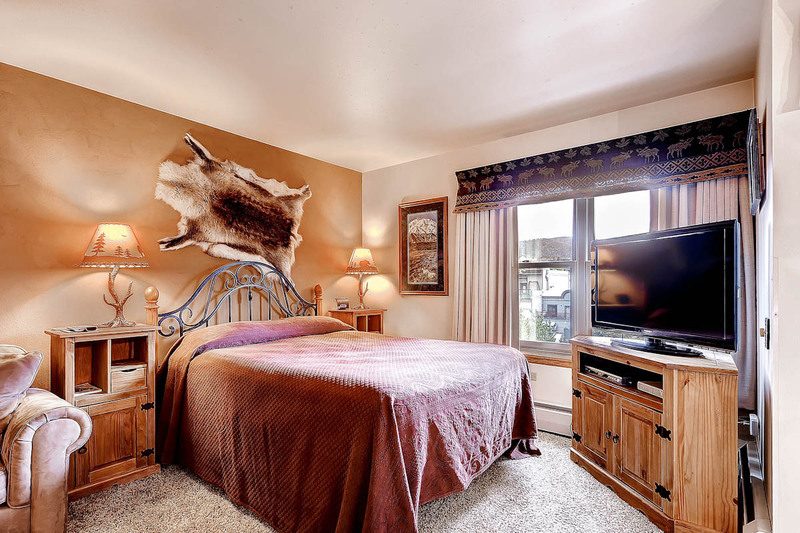 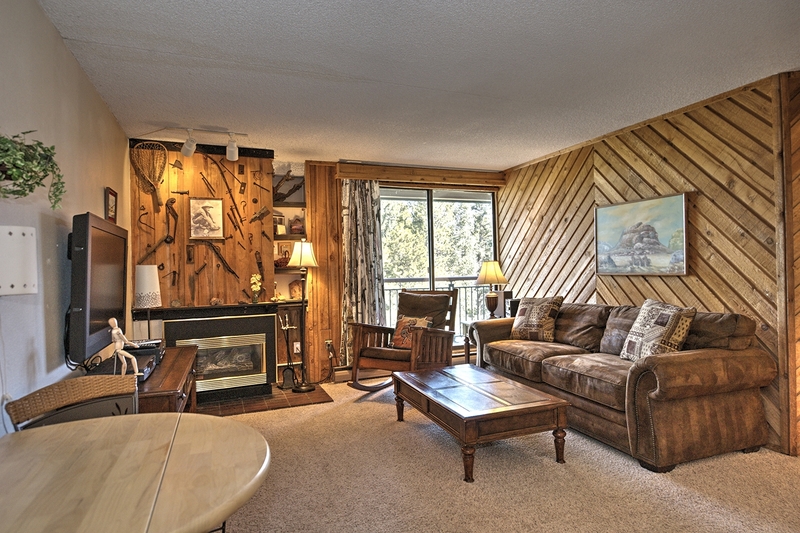 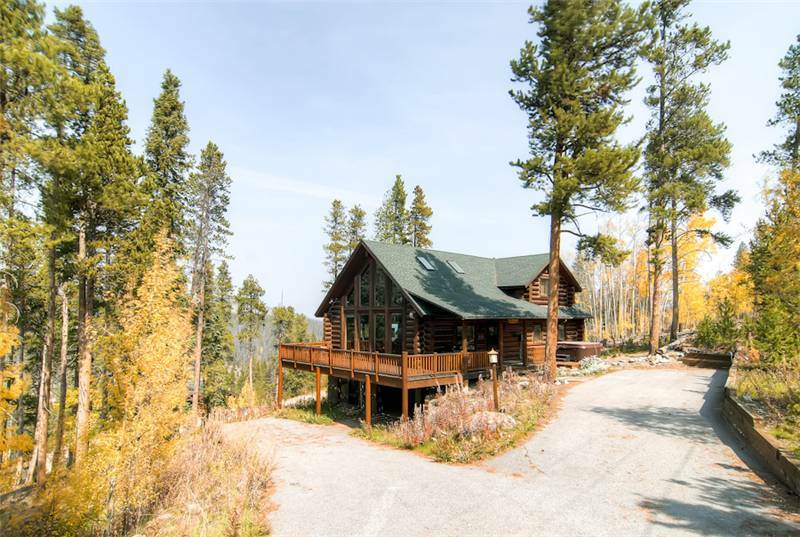 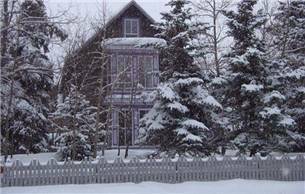 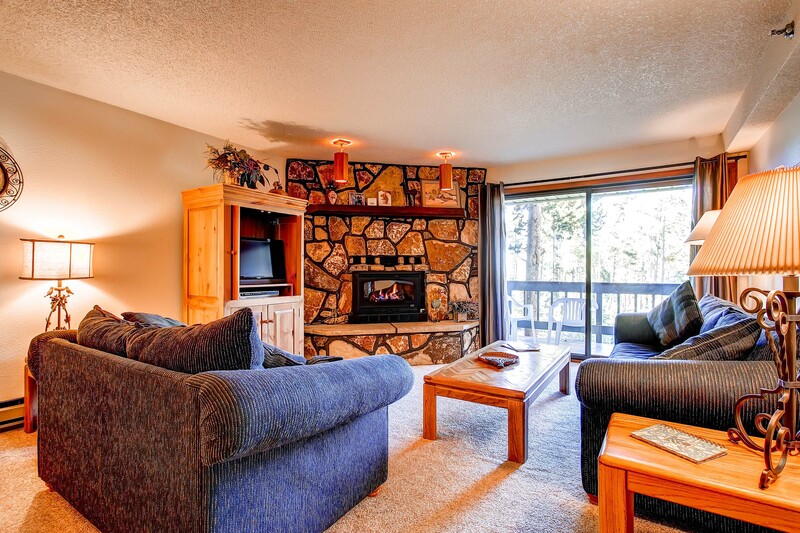 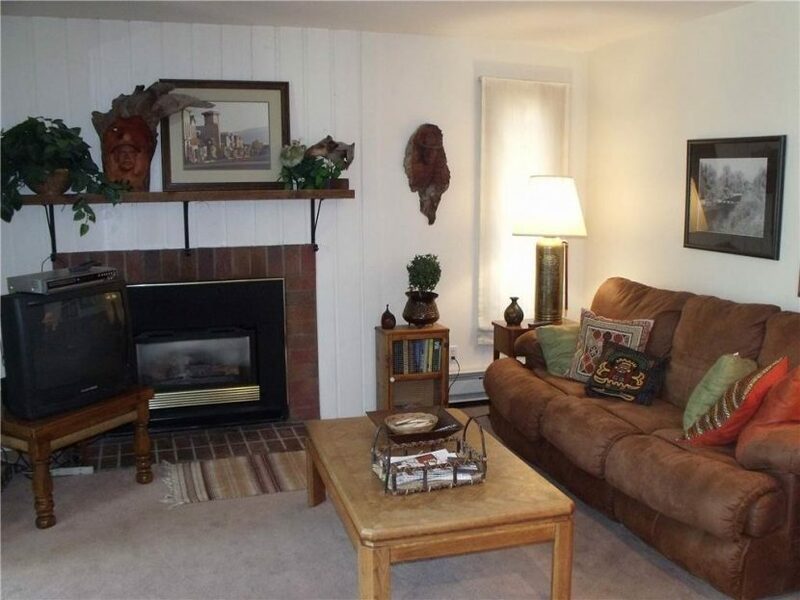 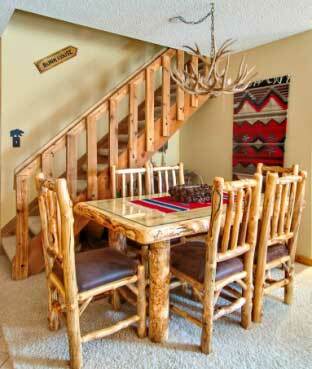 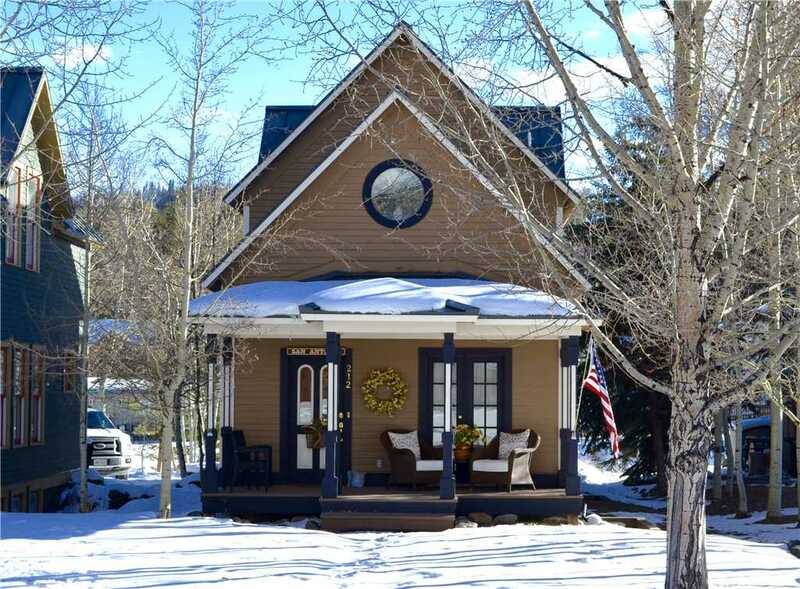 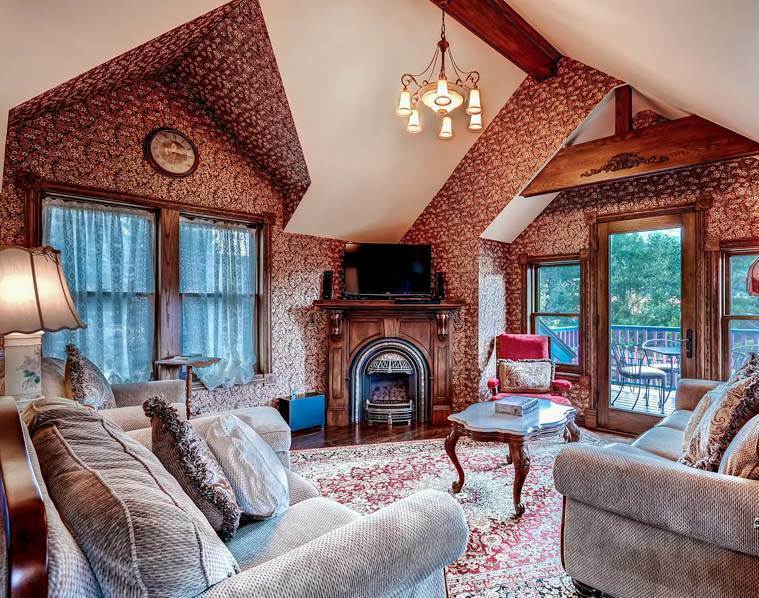 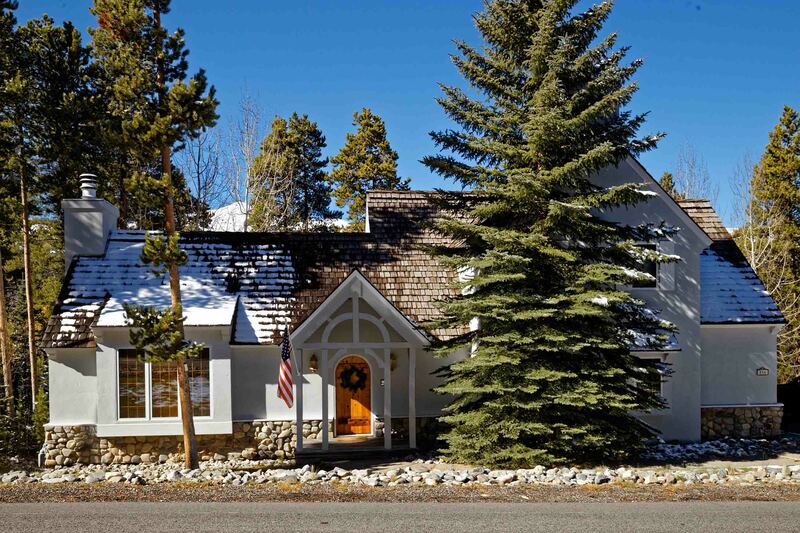 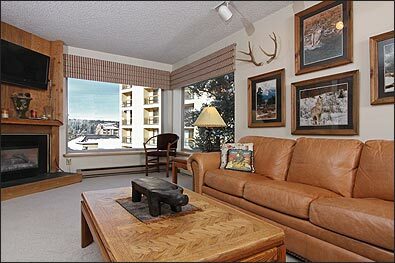 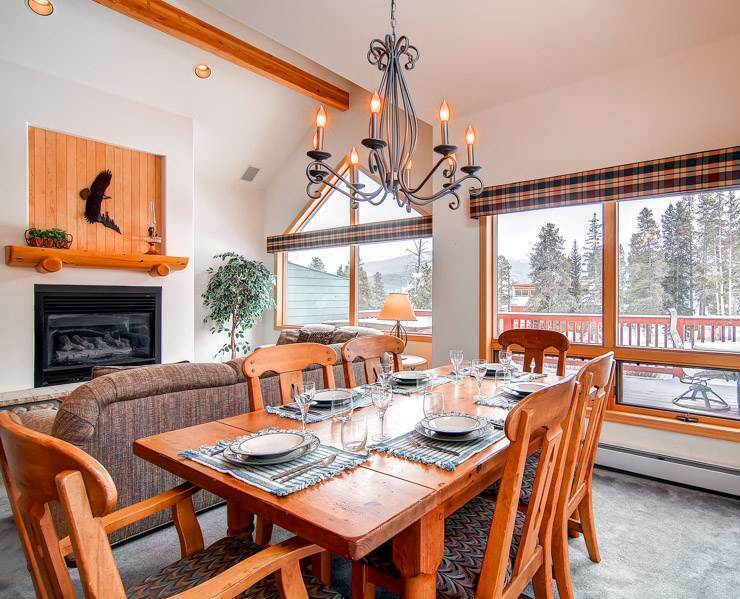 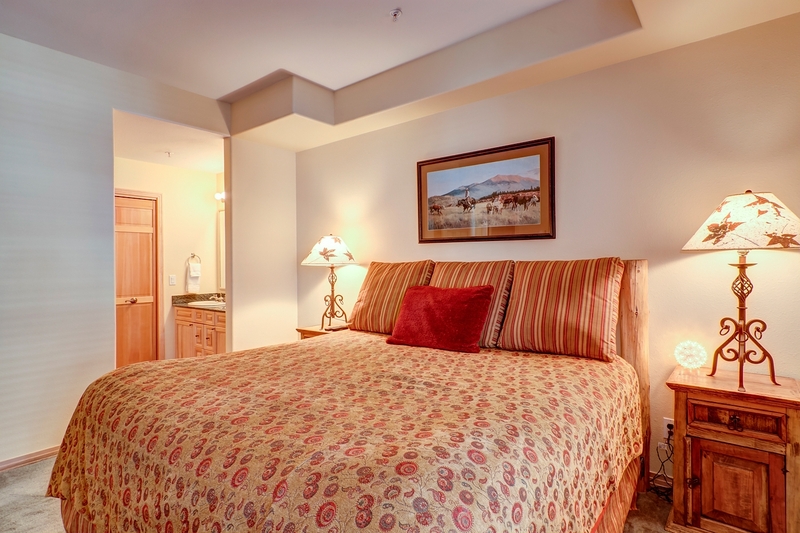 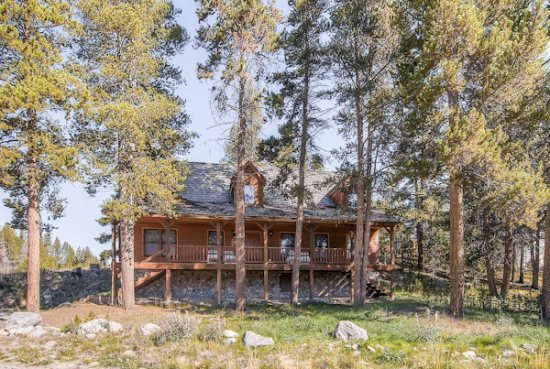 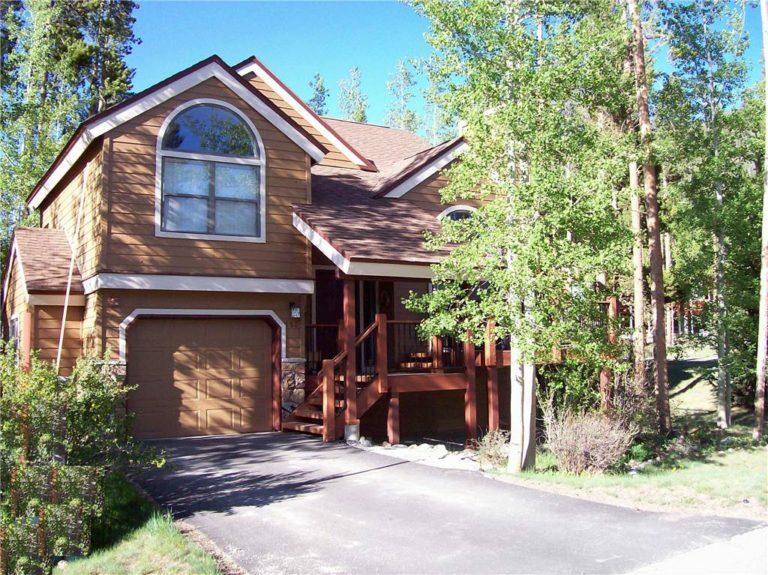 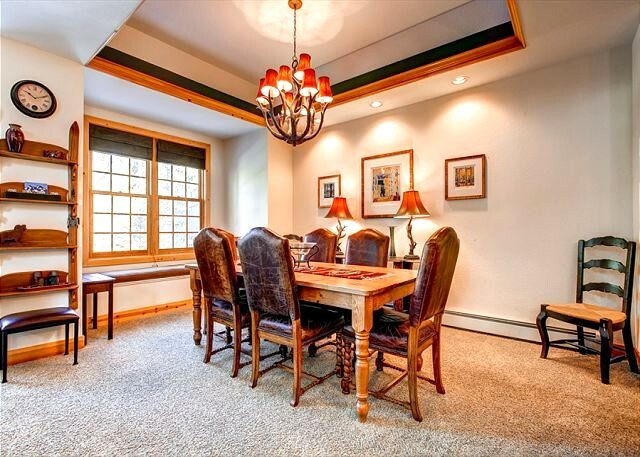 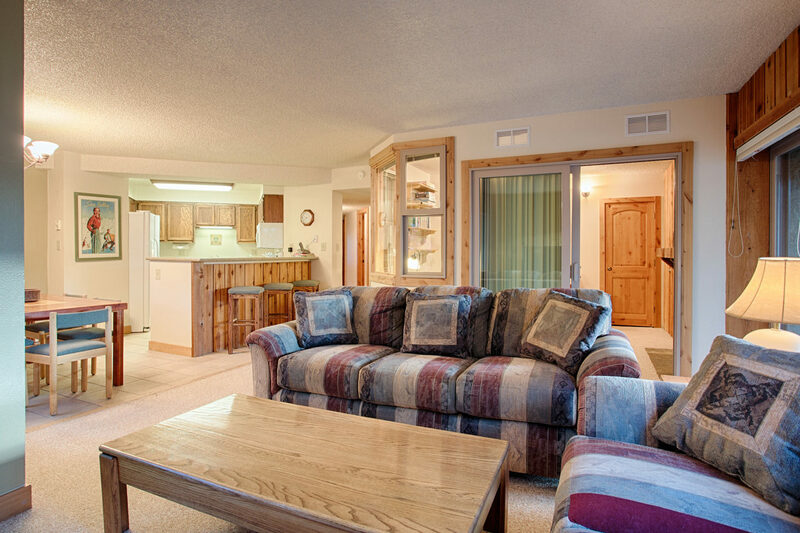 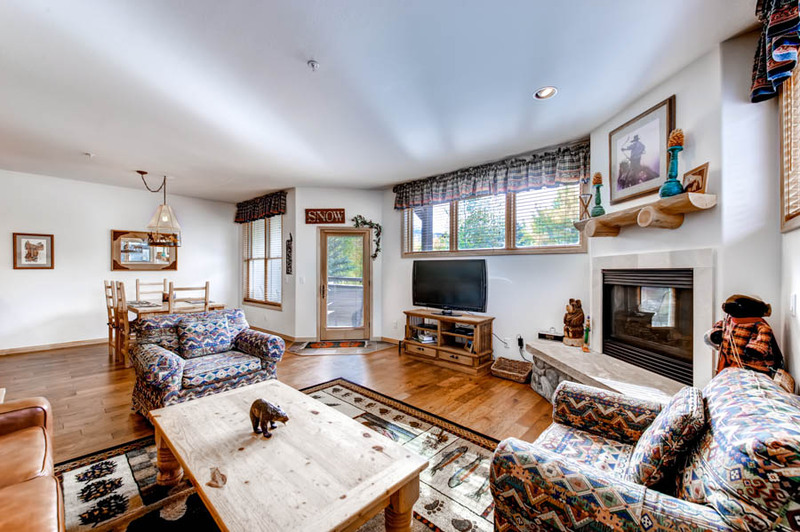 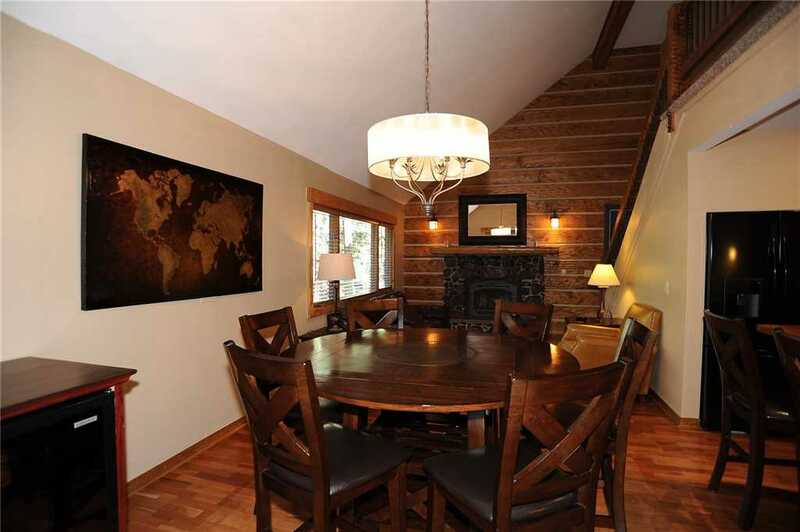 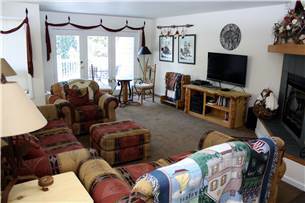 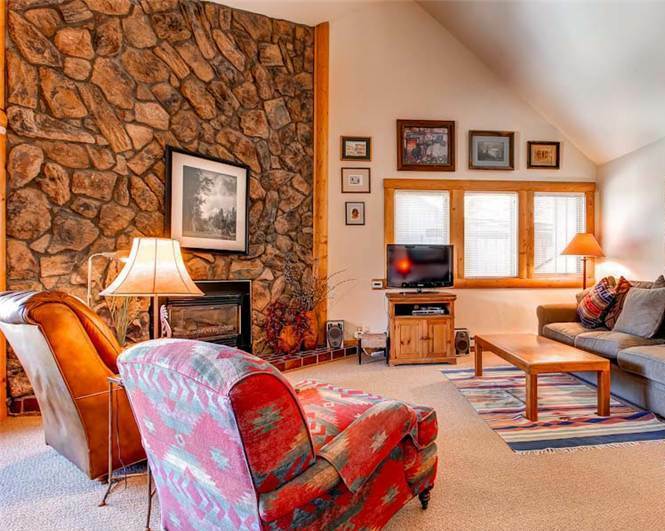 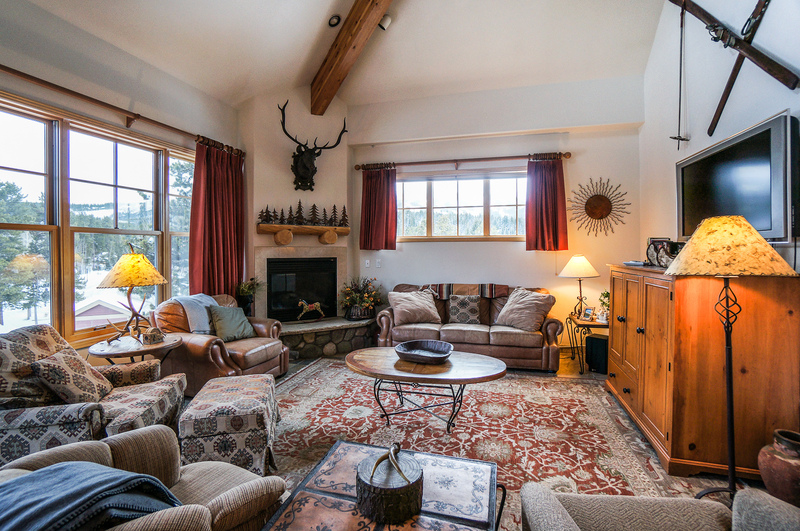 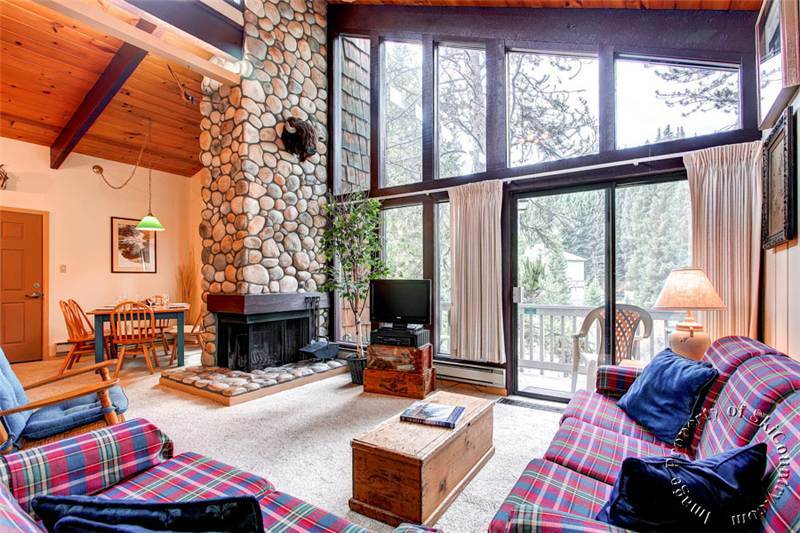 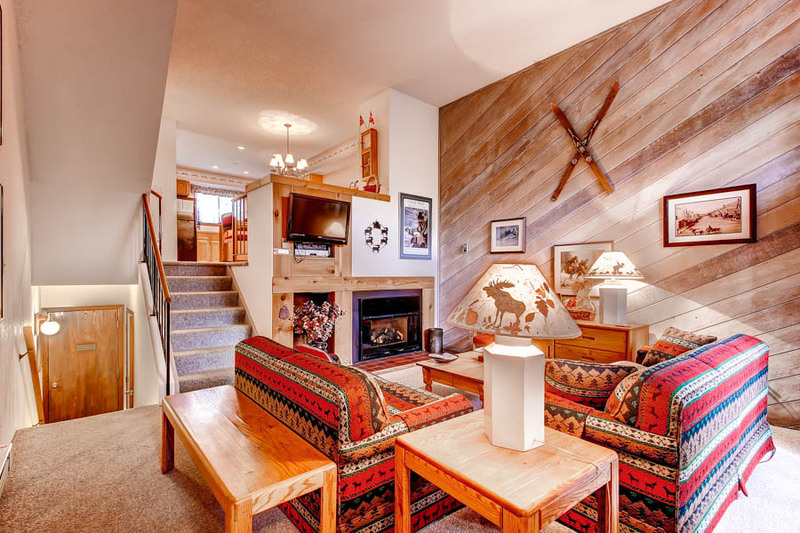 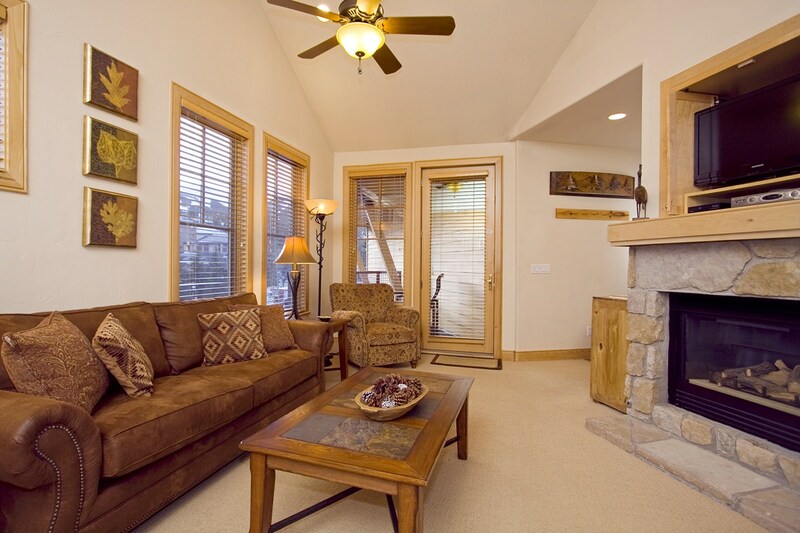 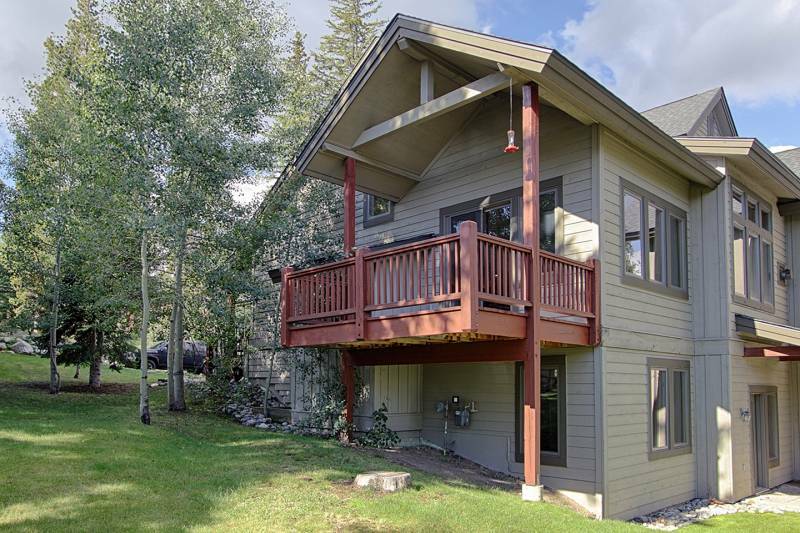 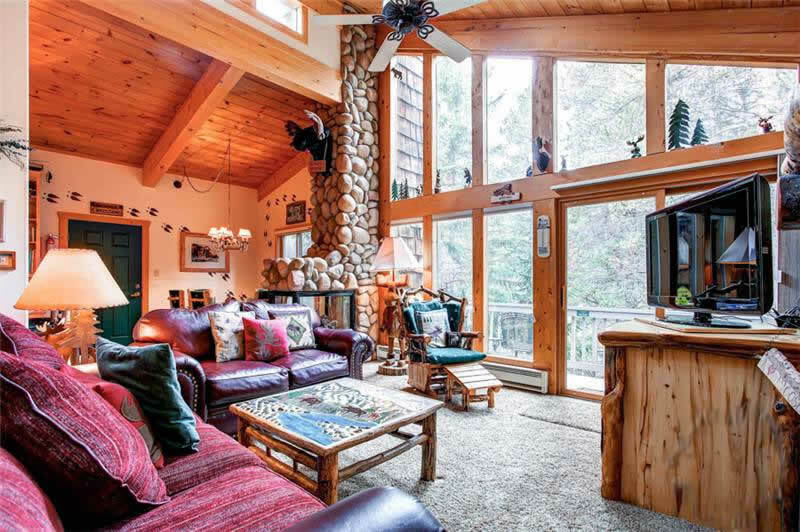 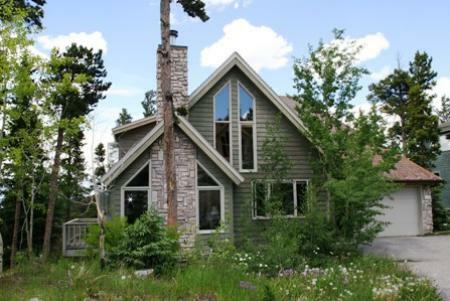 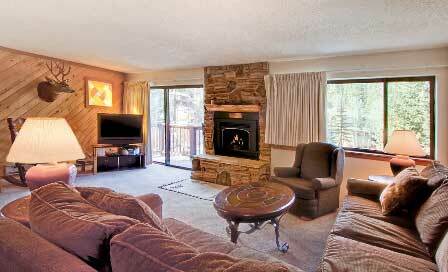 The stunning mountain/western decor is highlighted by a large moose head above the front door. 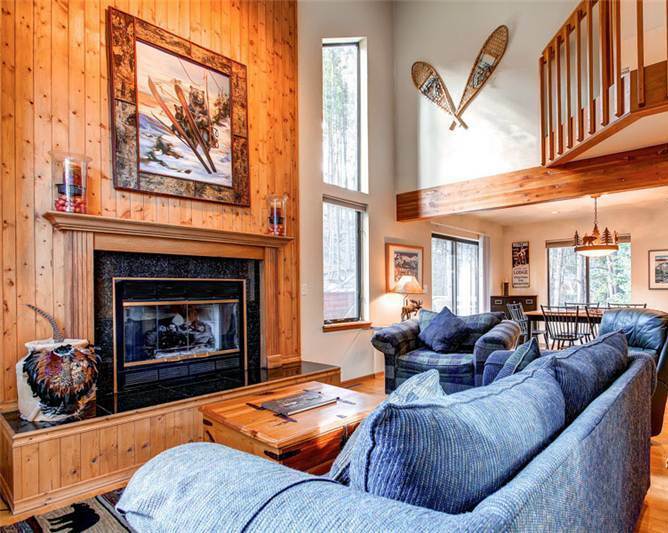 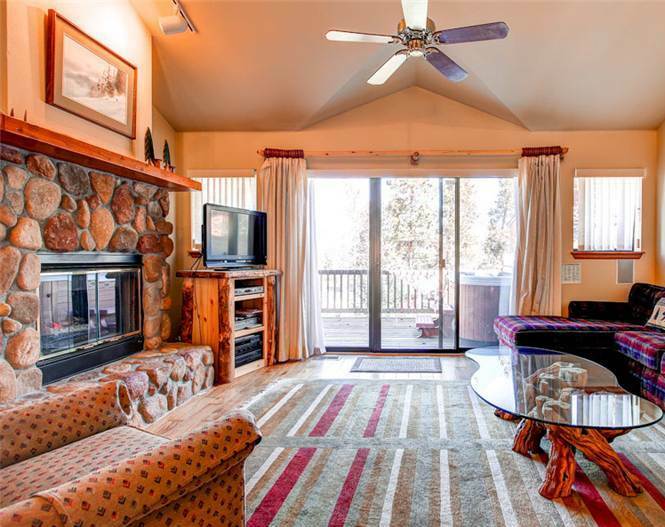 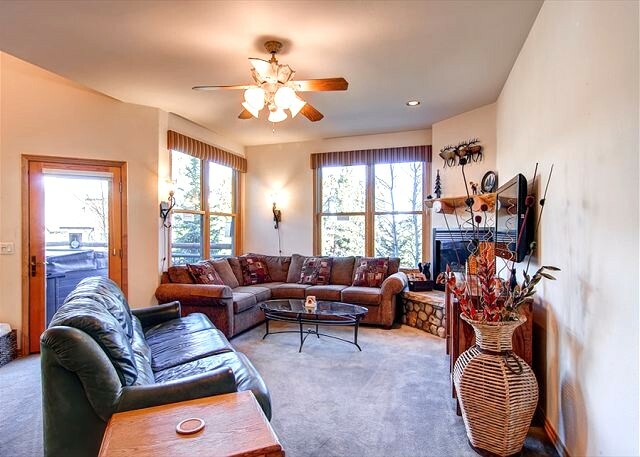 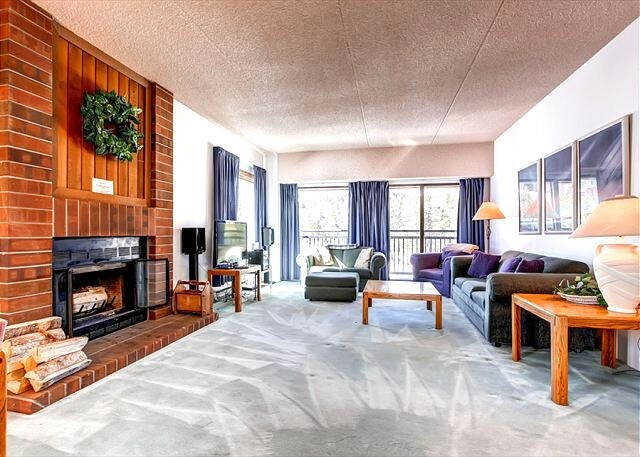 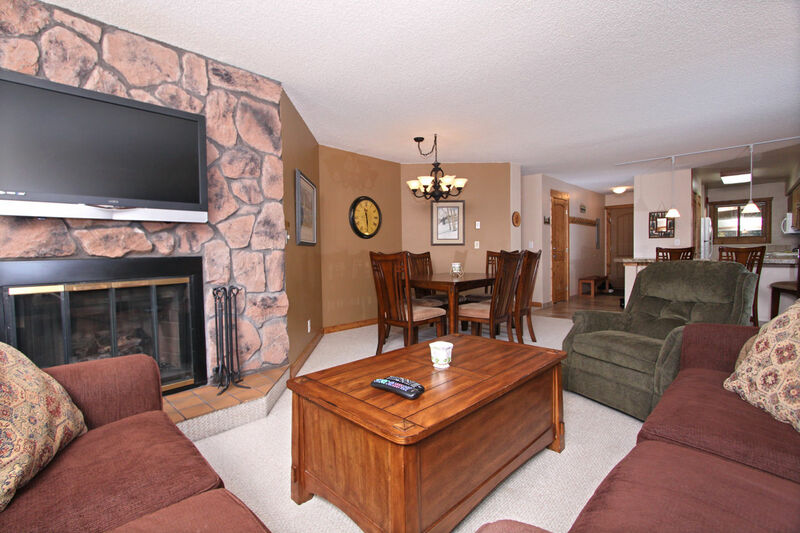 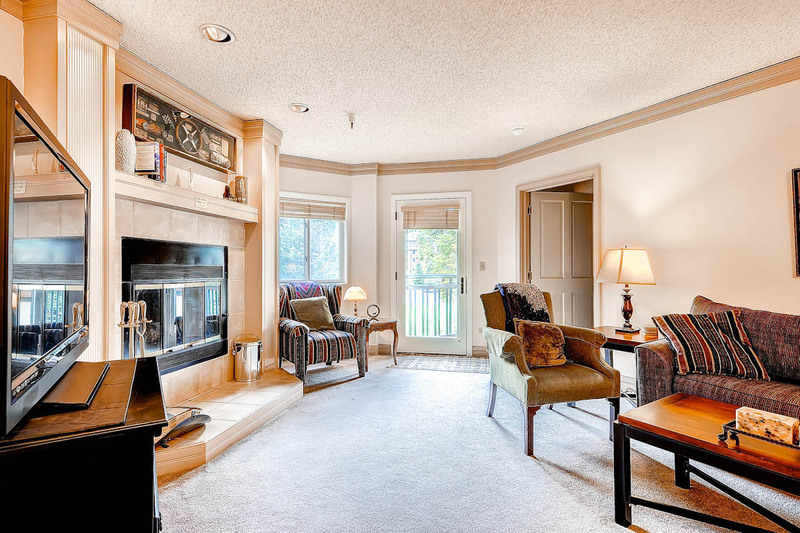 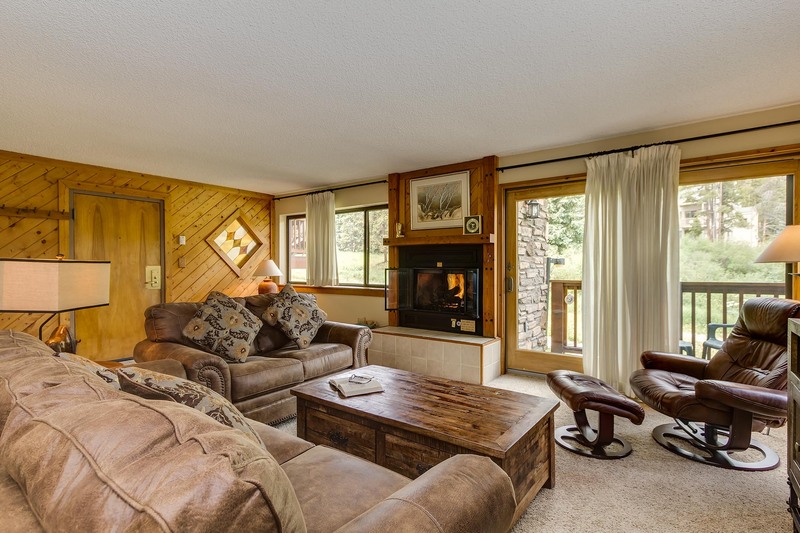 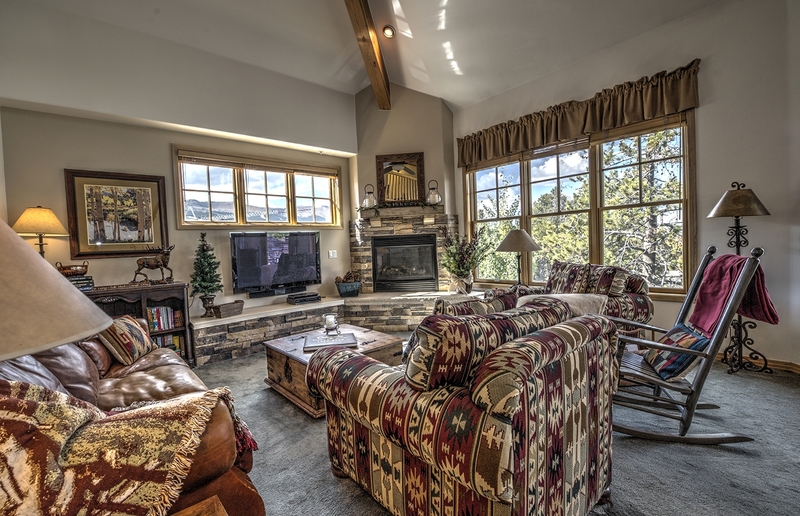 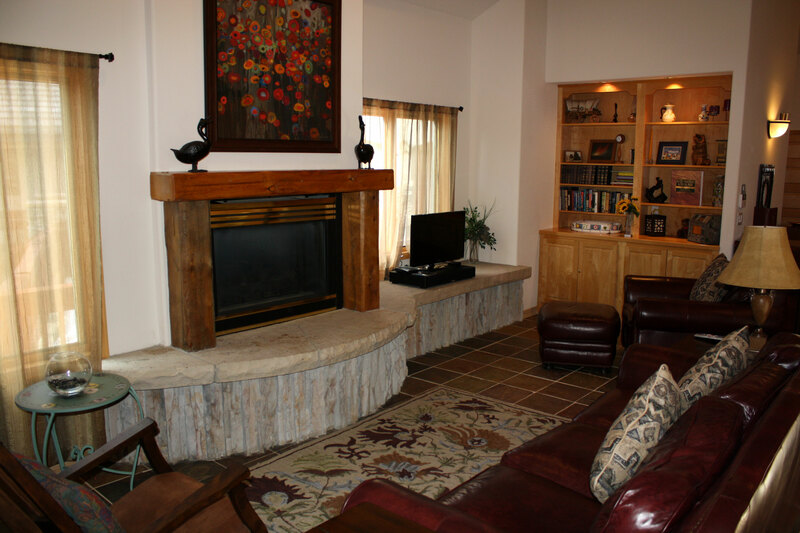 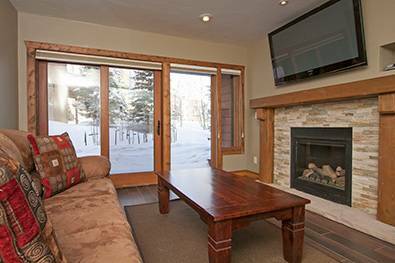 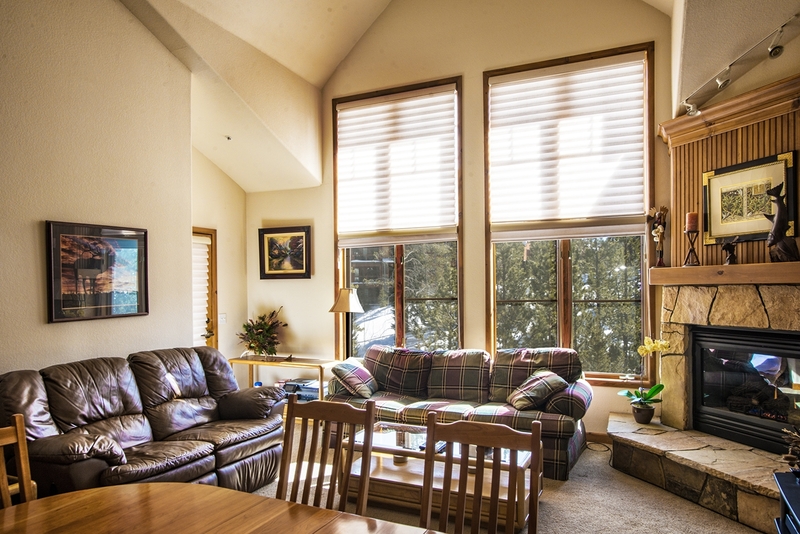 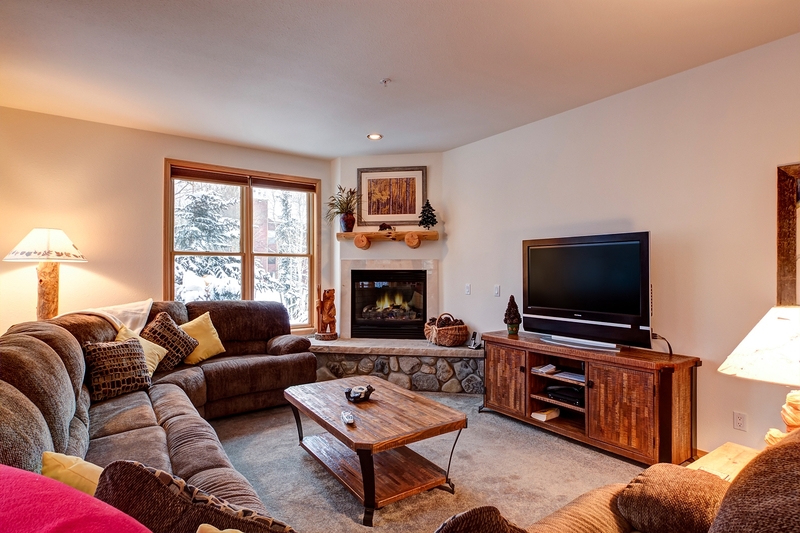 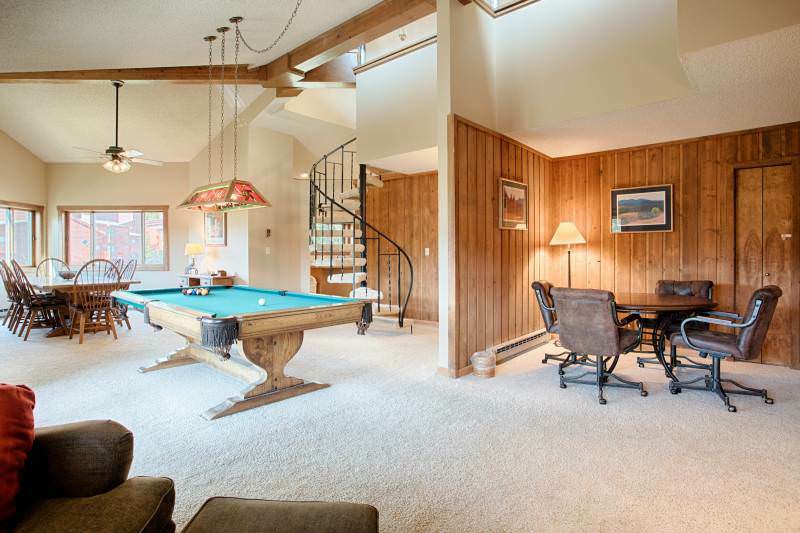 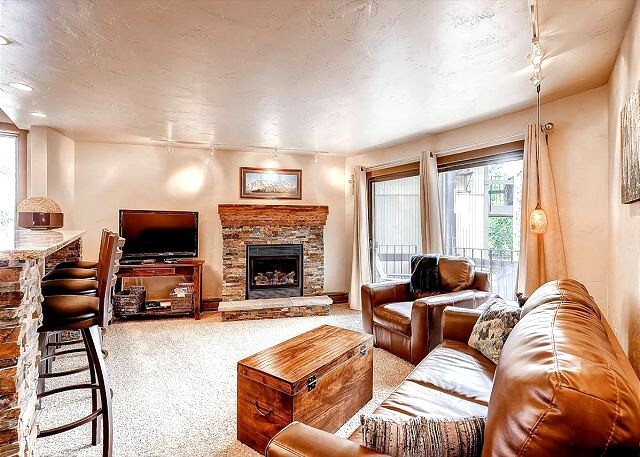 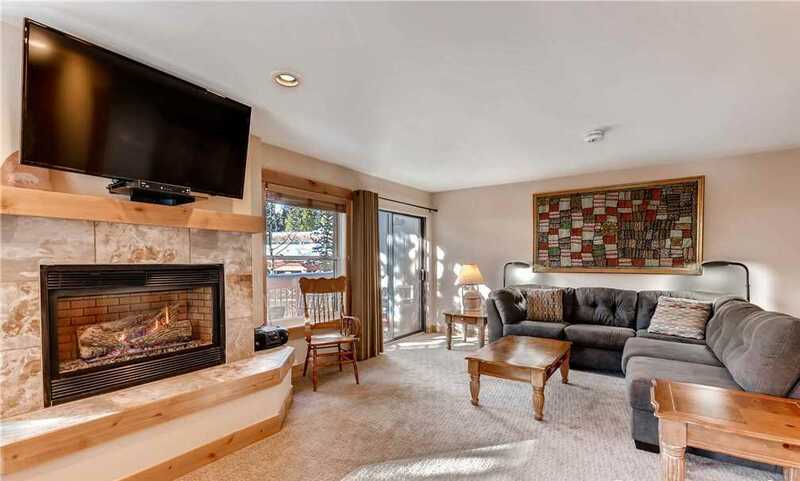 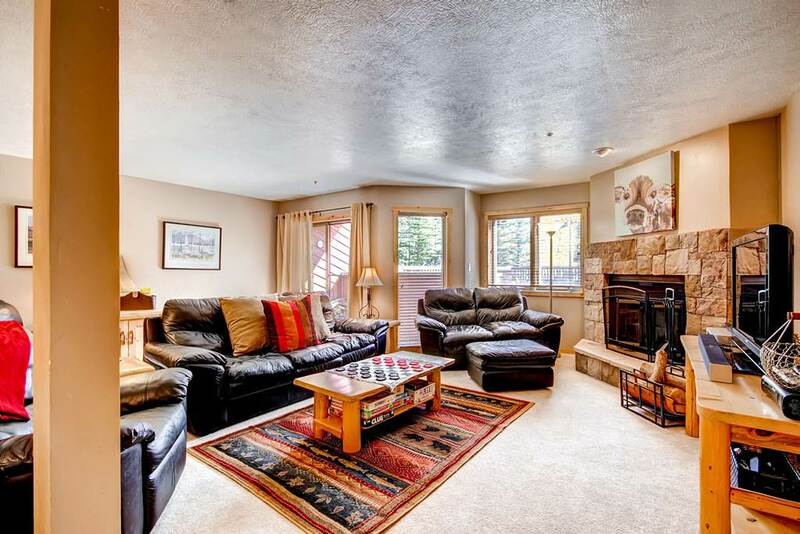 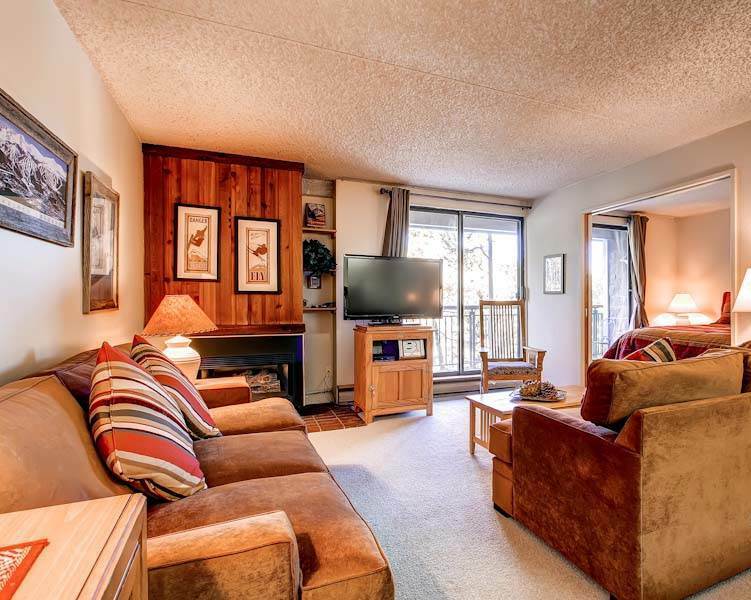 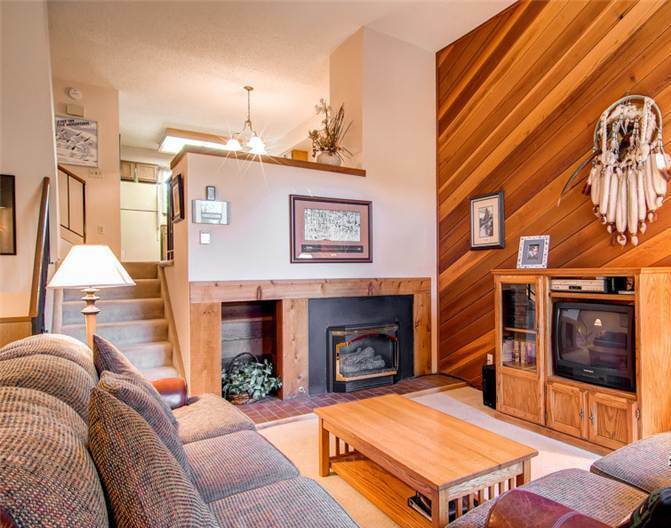 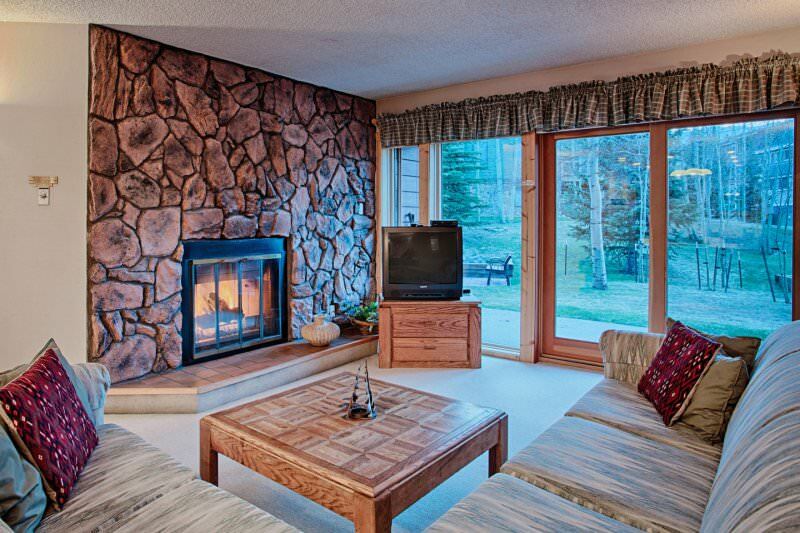 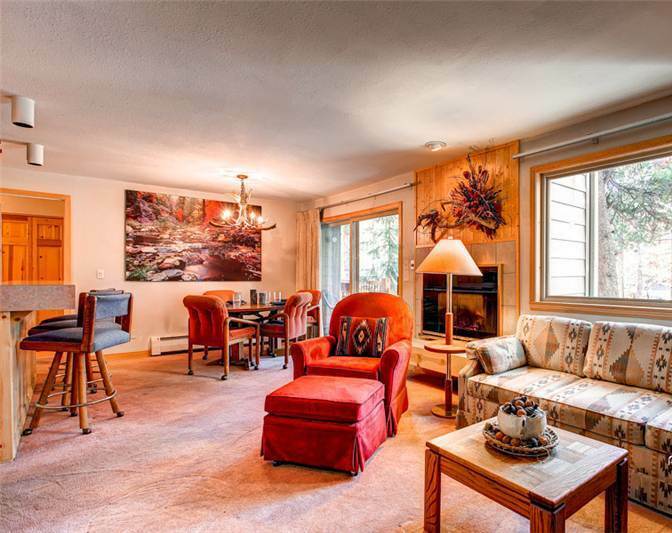 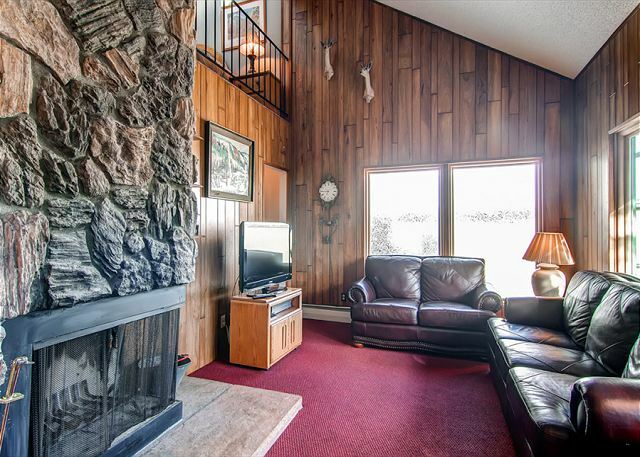 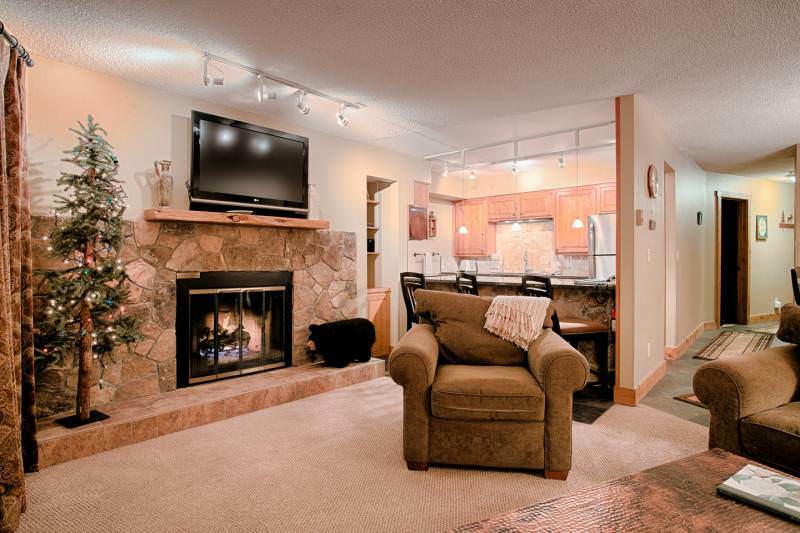 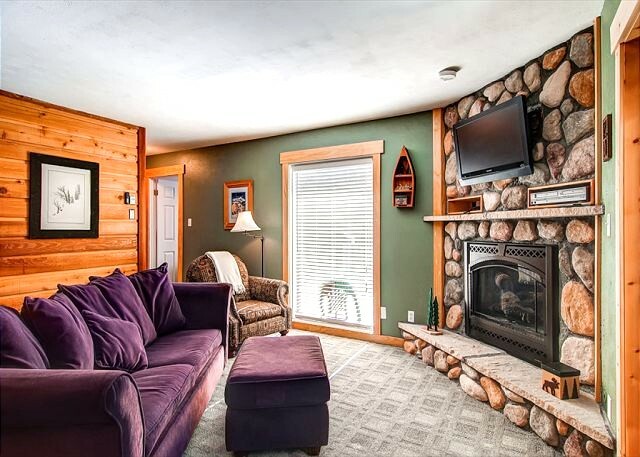 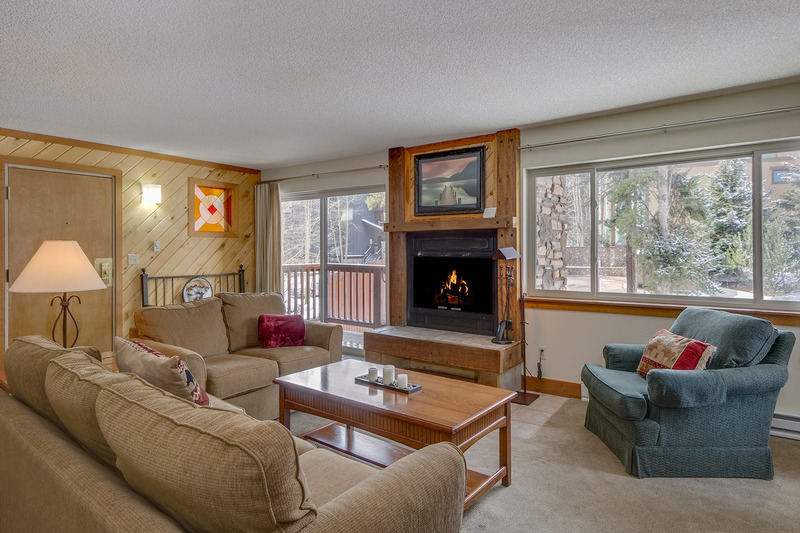 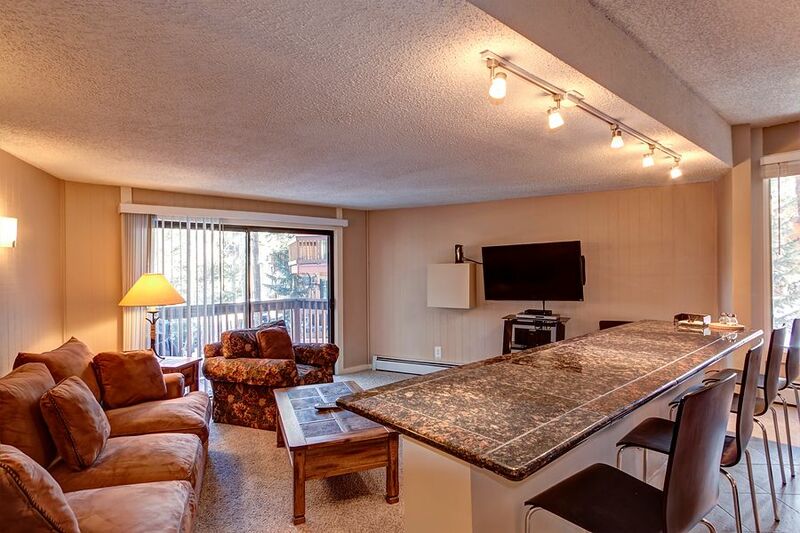 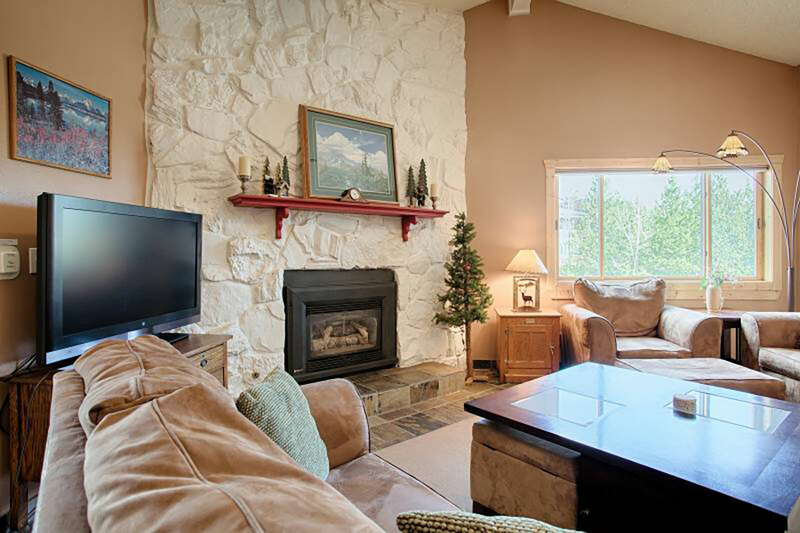 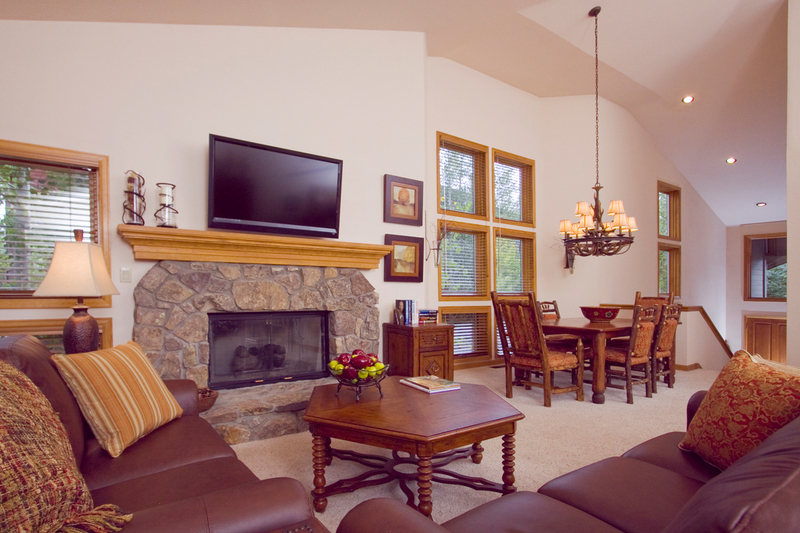 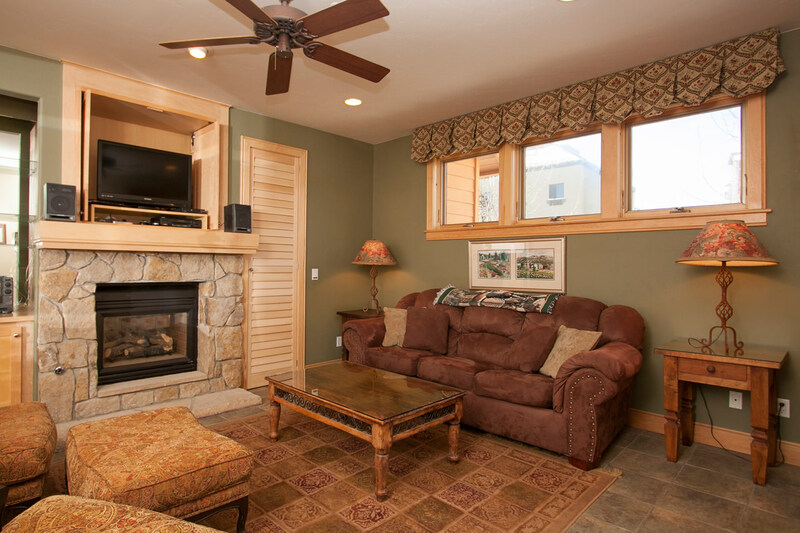 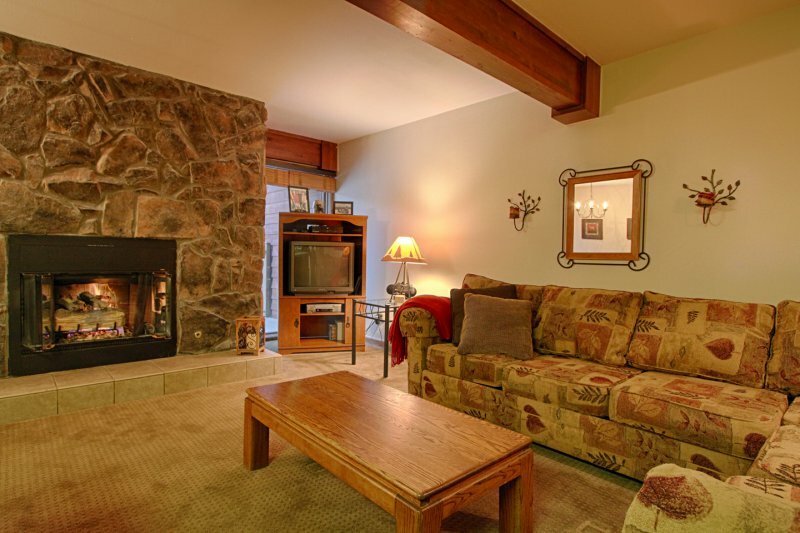 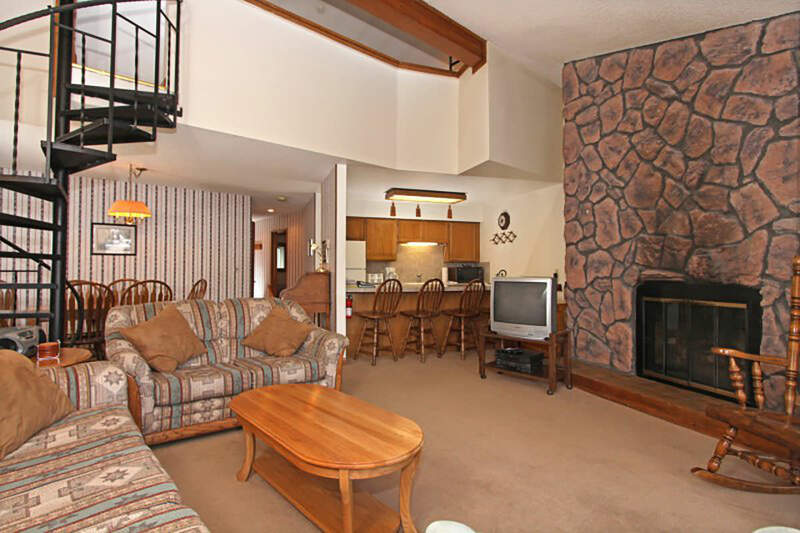 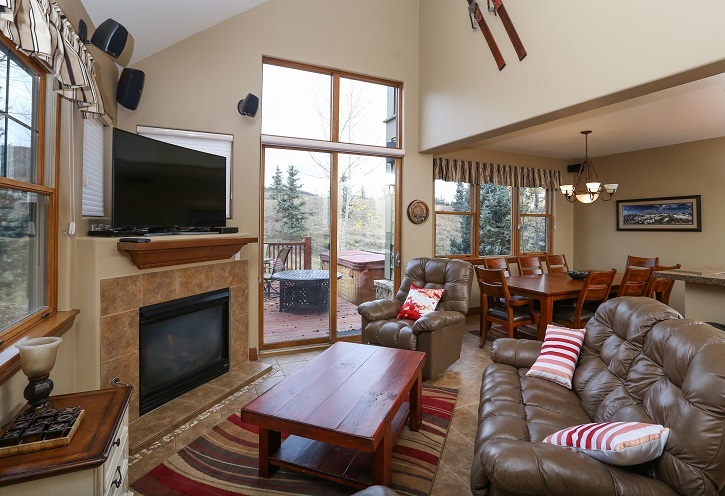 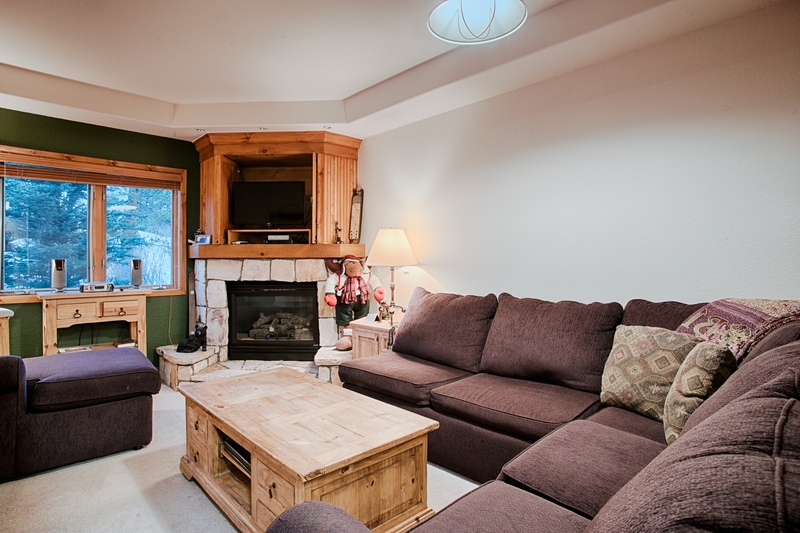 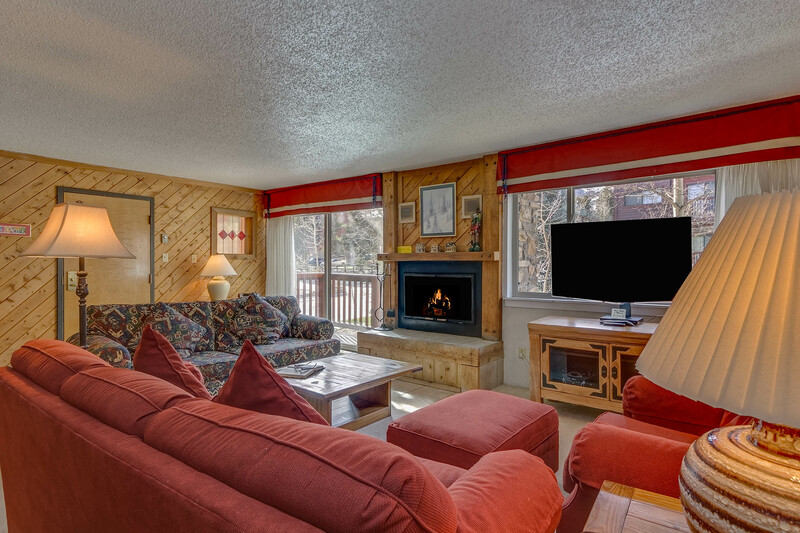 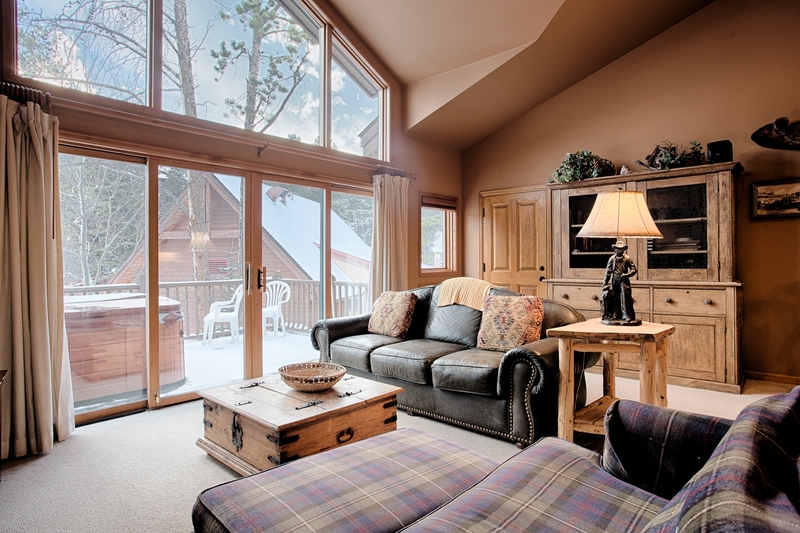 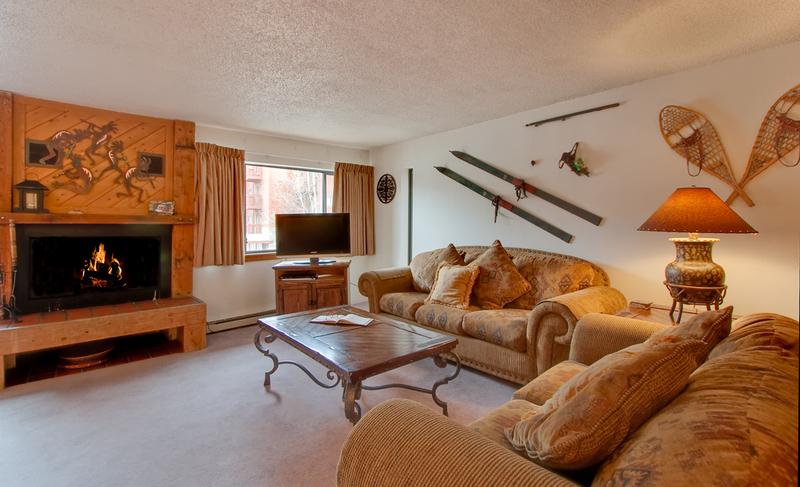 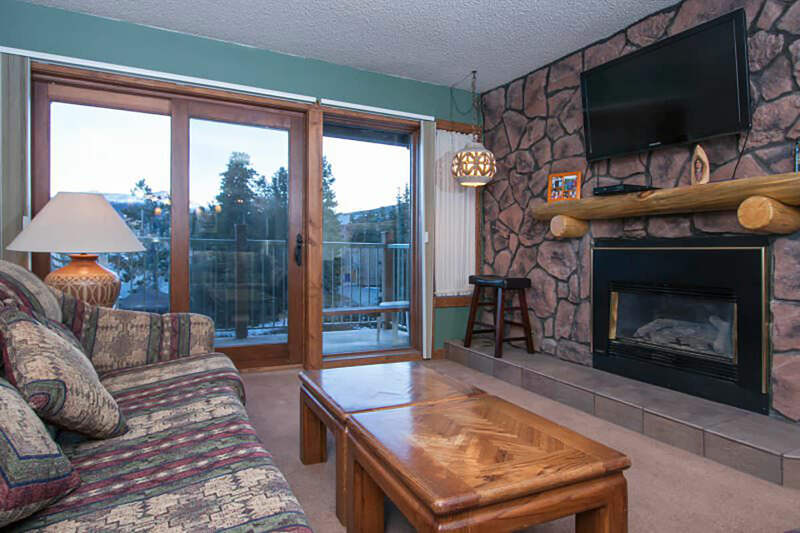 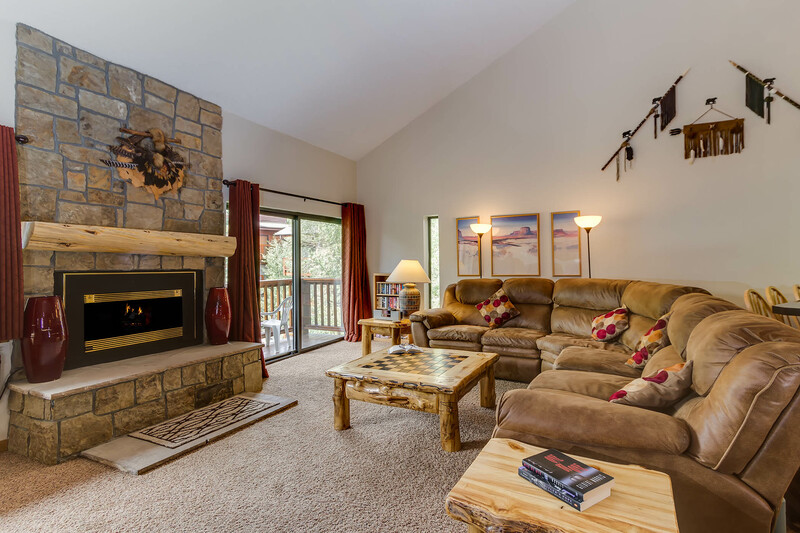 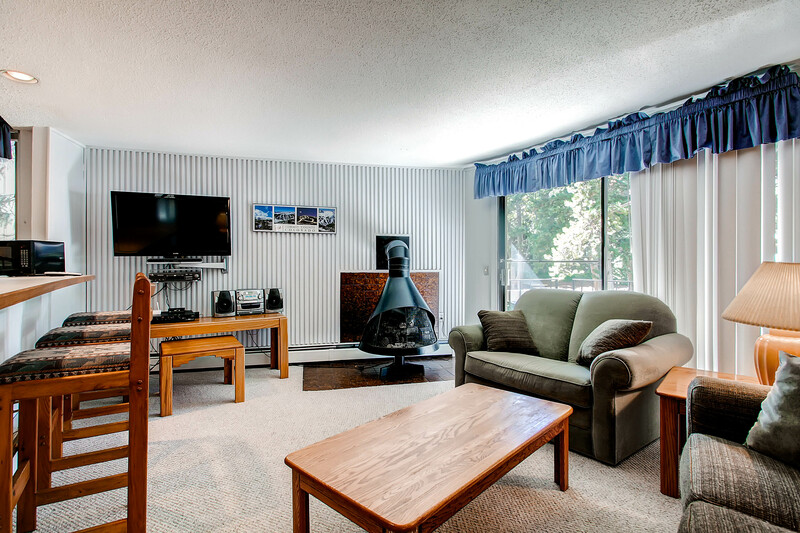 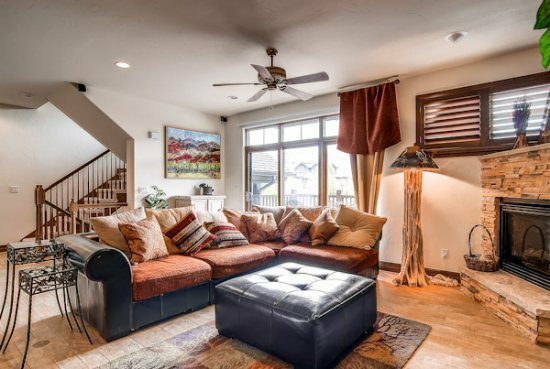 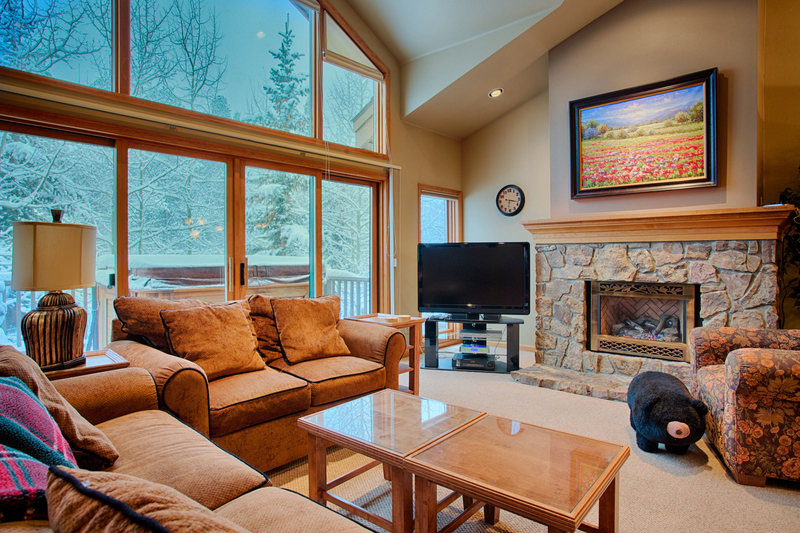 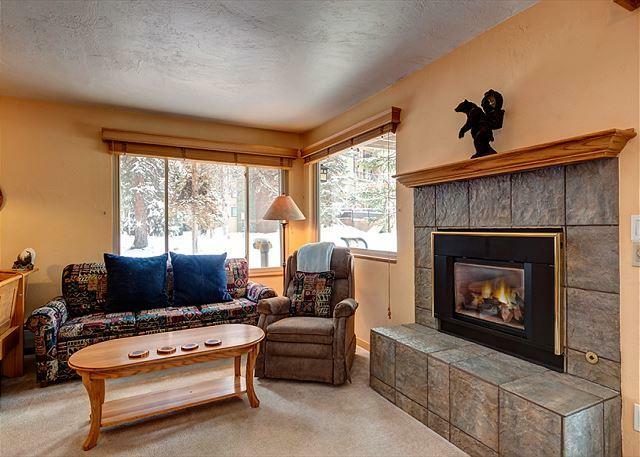 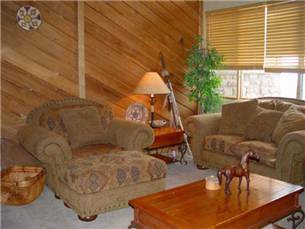 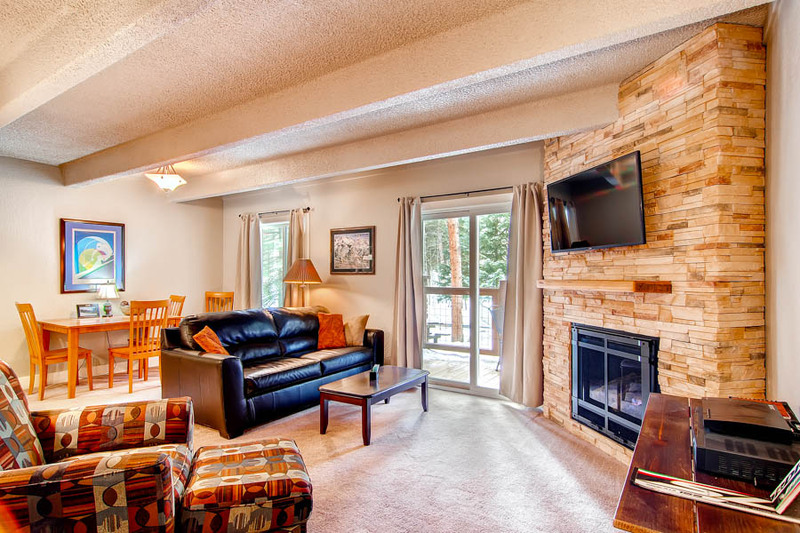 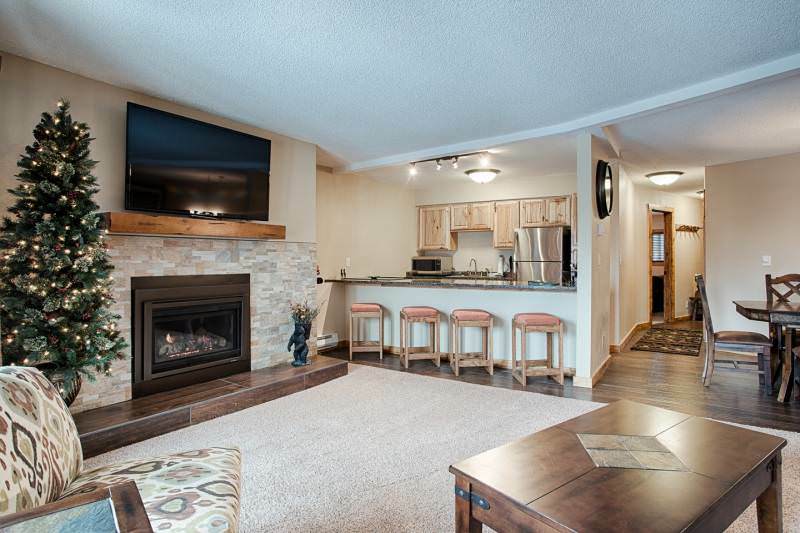 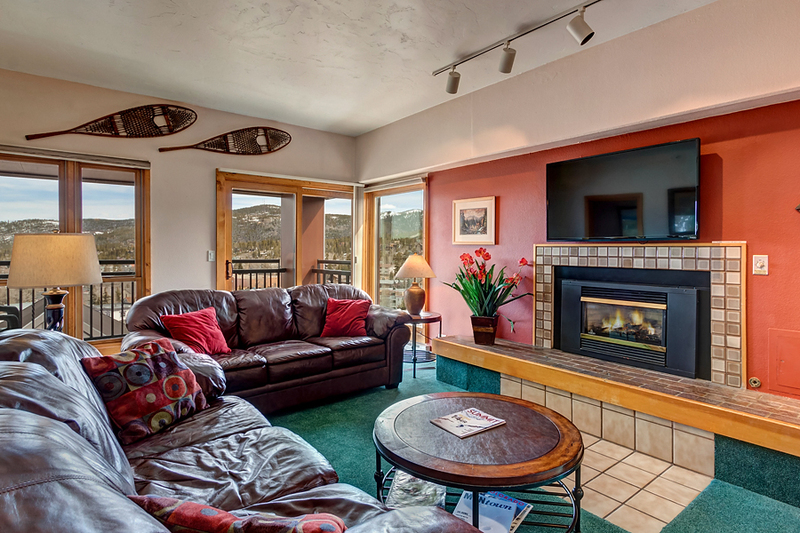 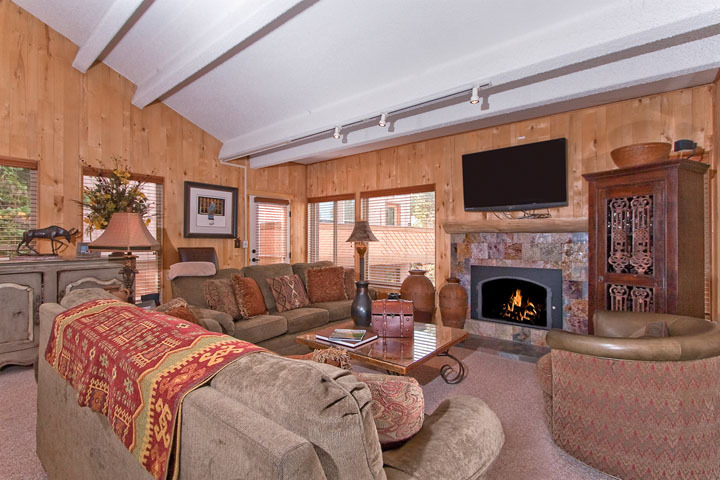 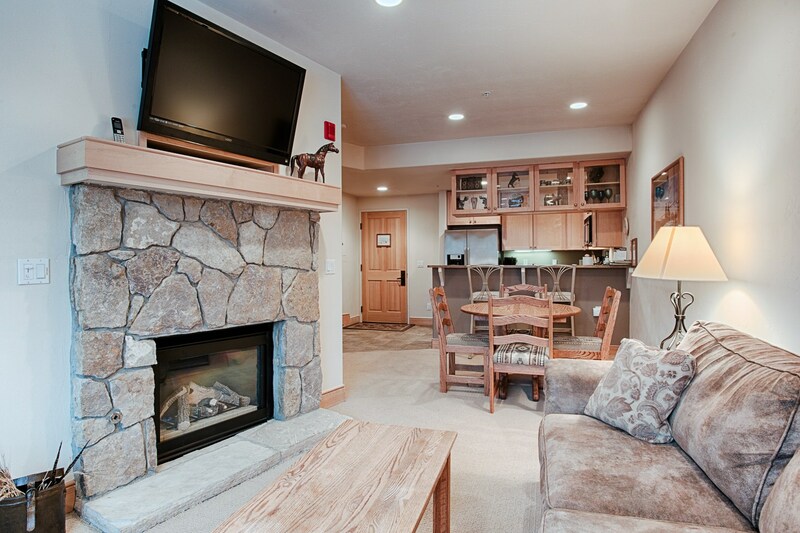 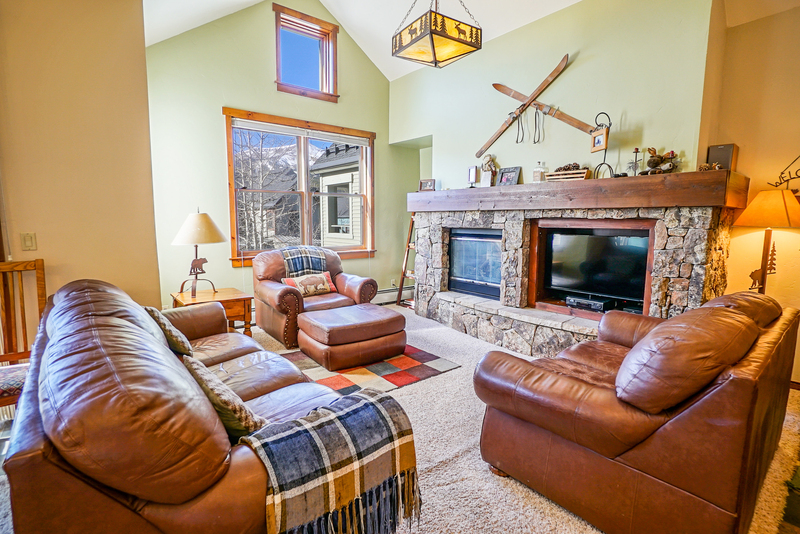 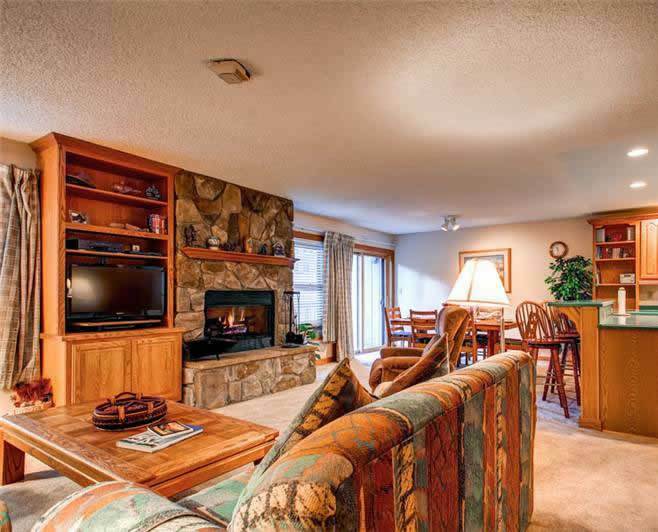 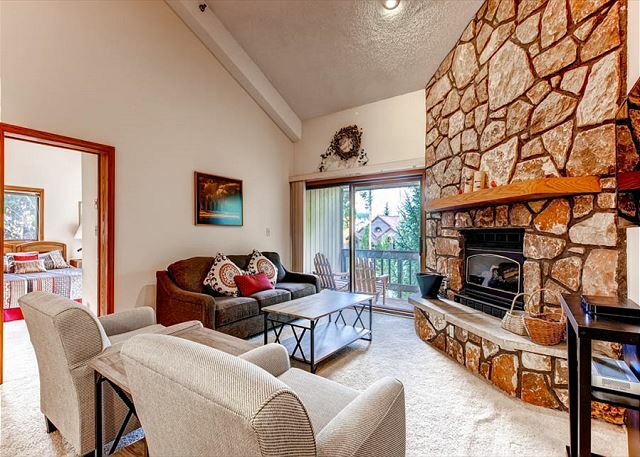 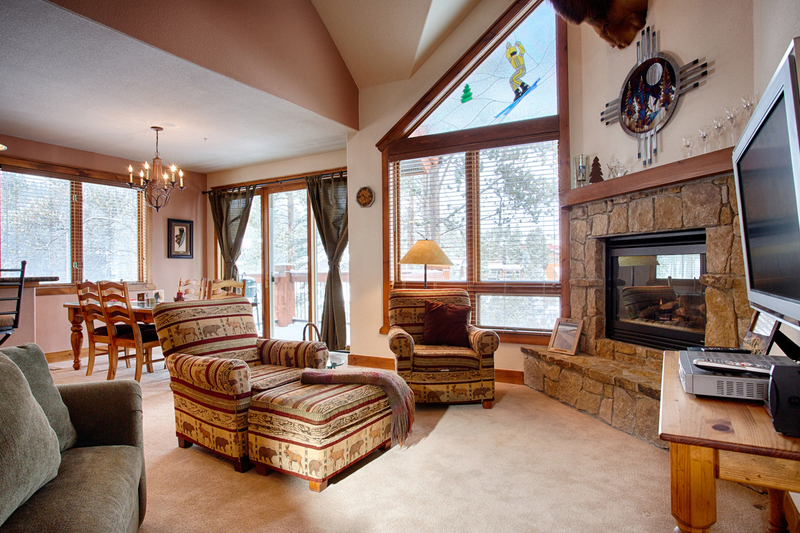 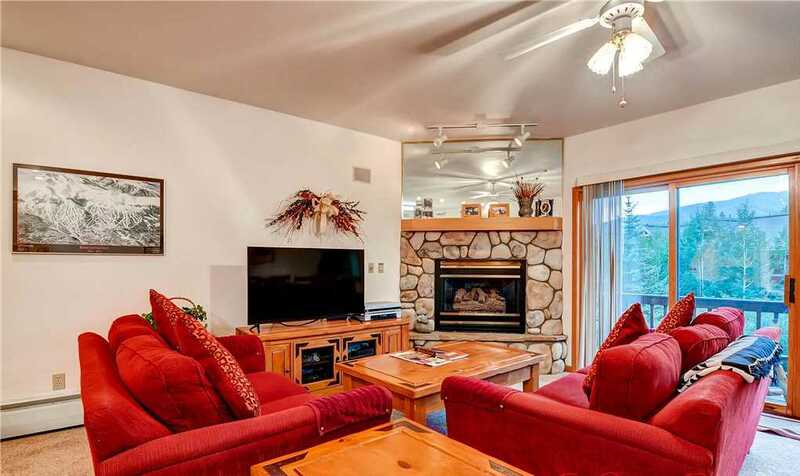 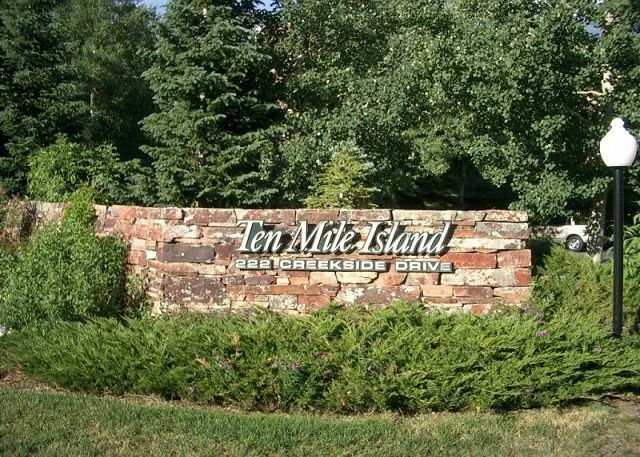 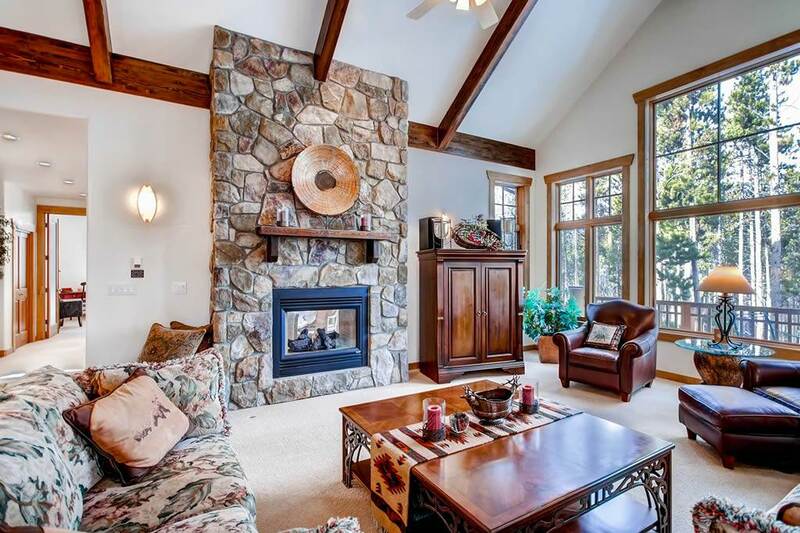 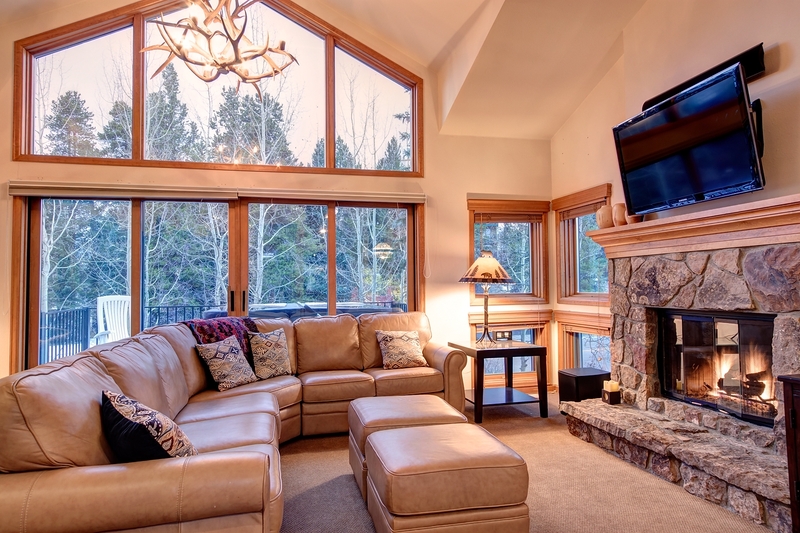 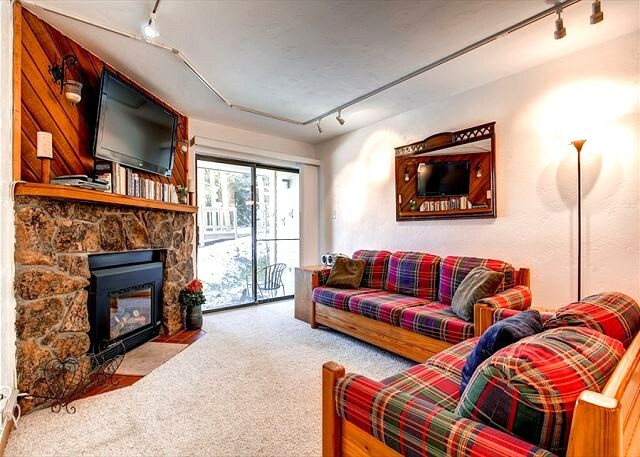 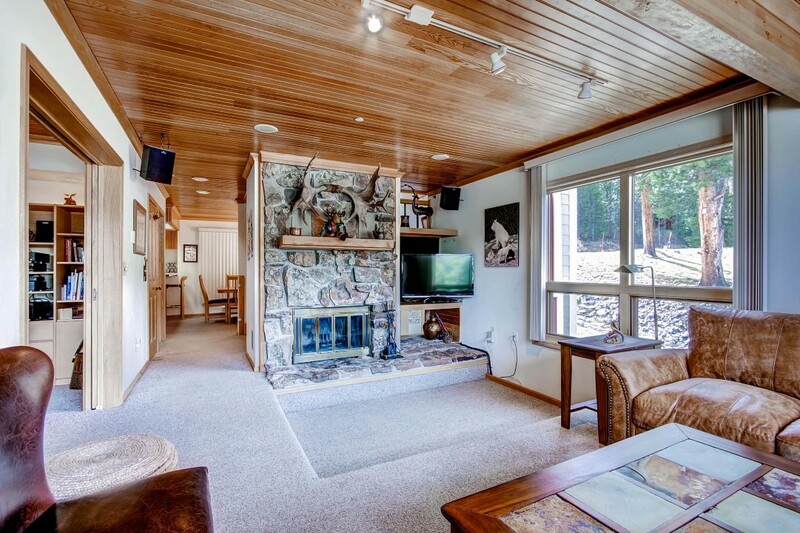 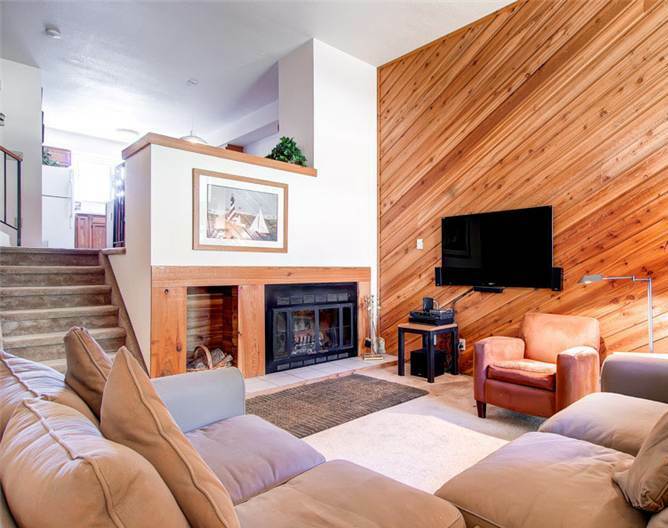 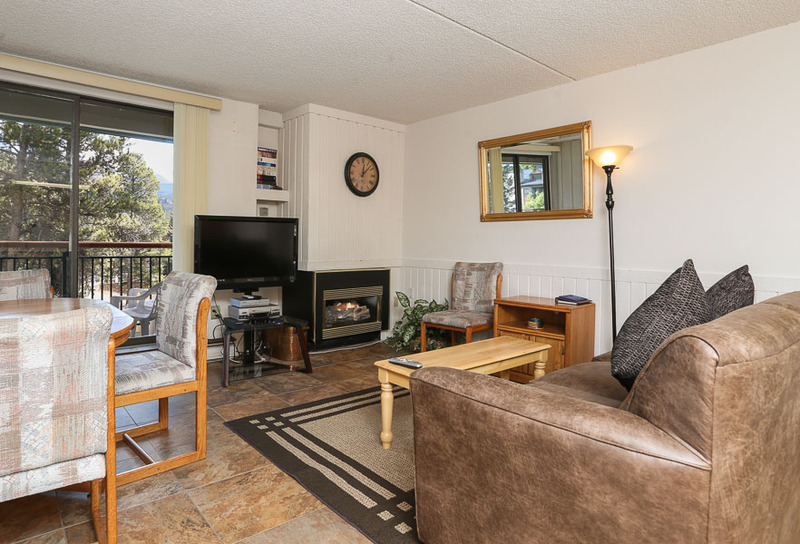 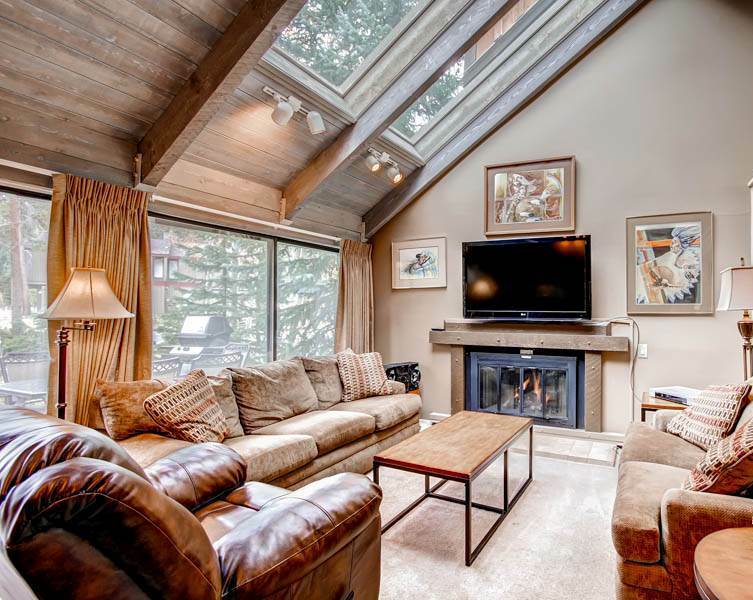 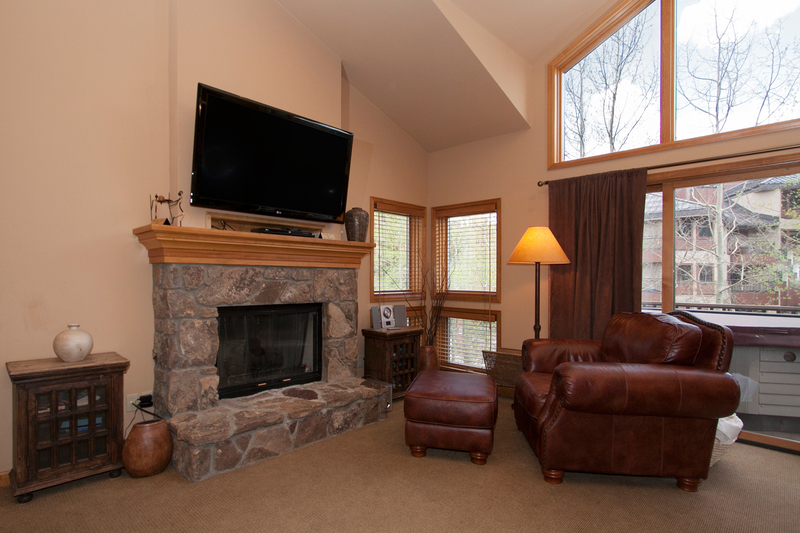 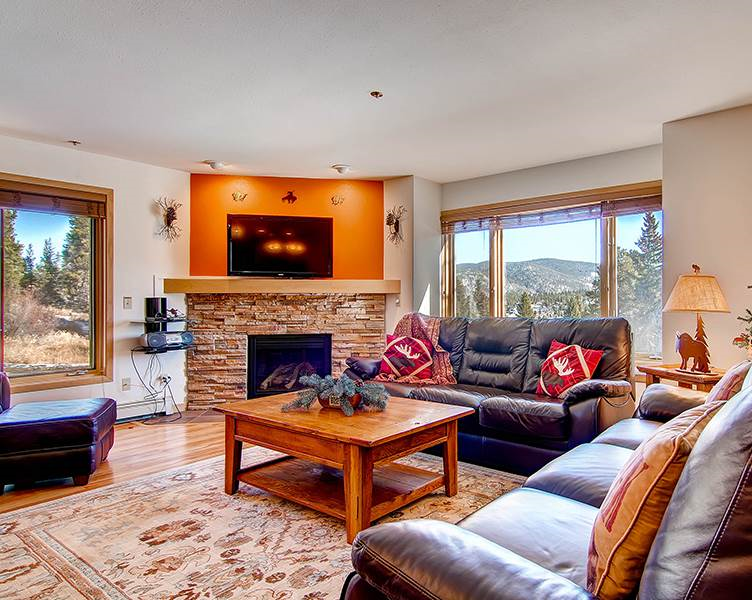 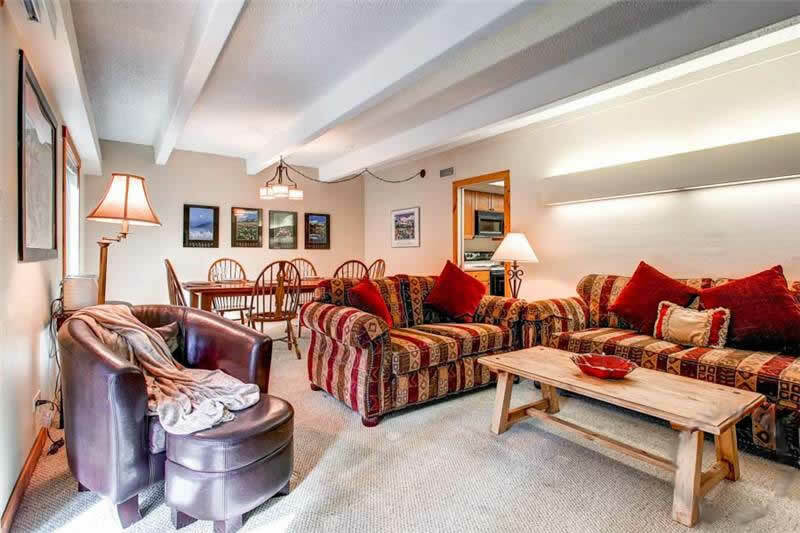 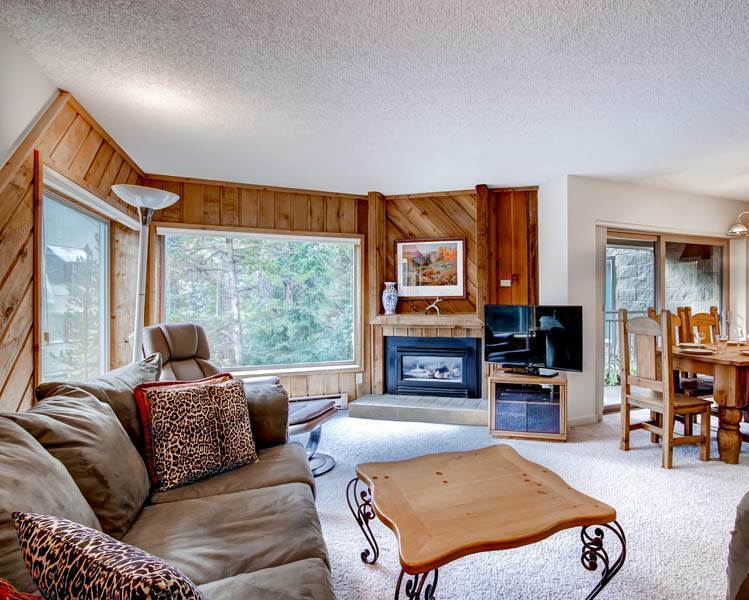 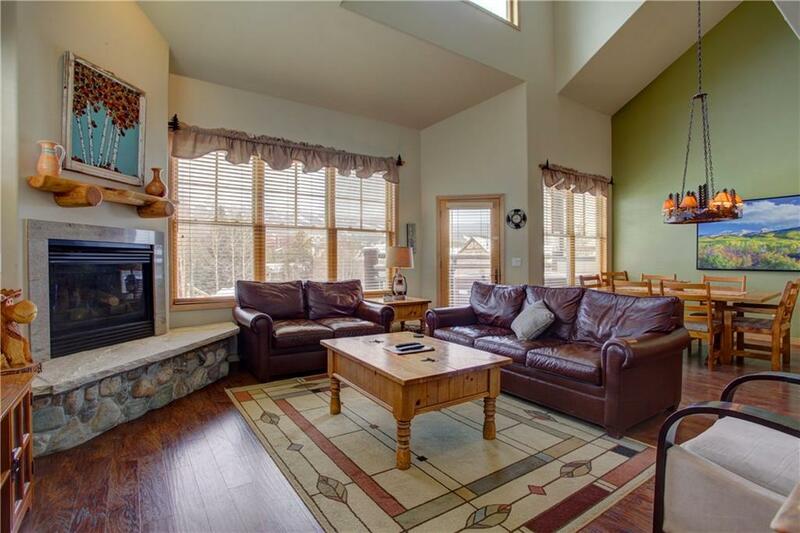 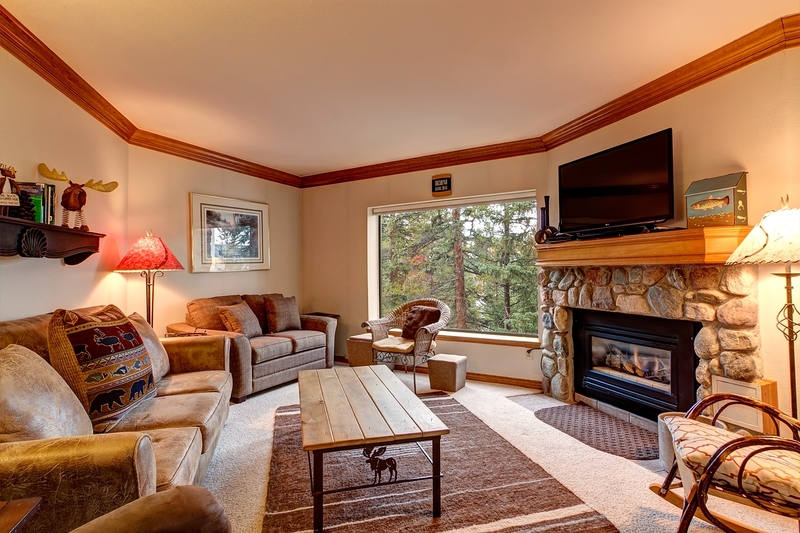 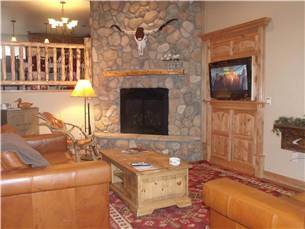 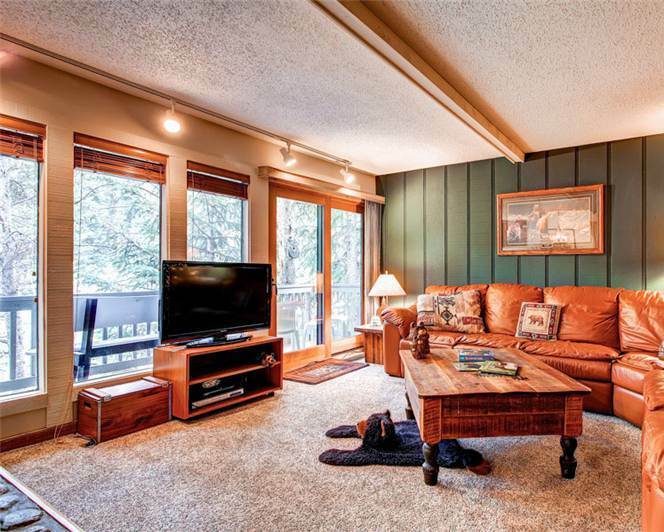 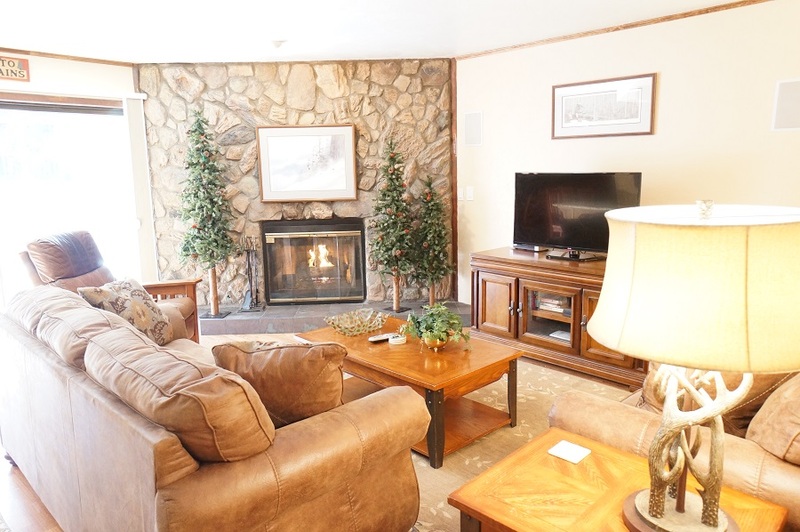 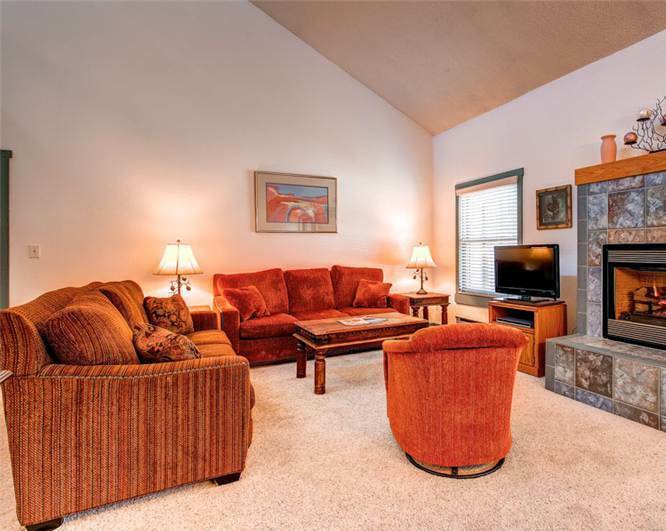 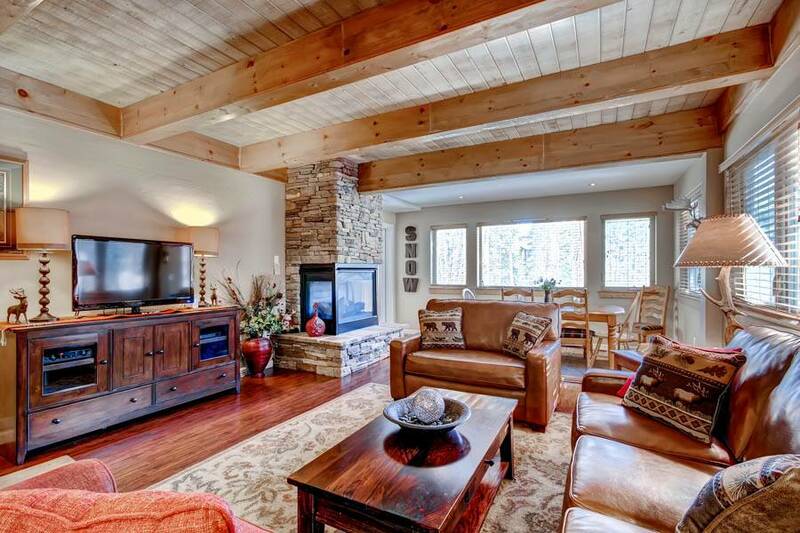 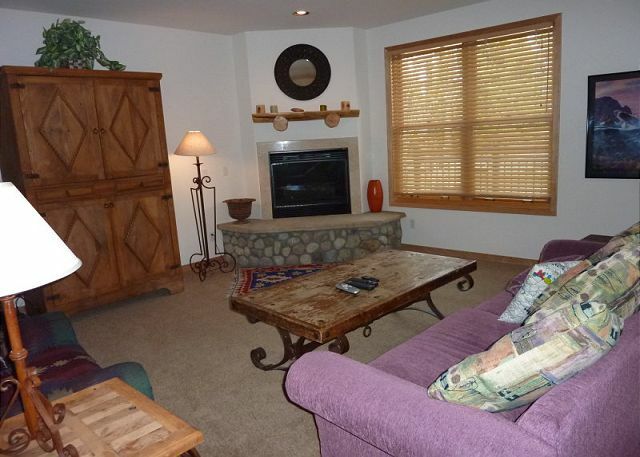 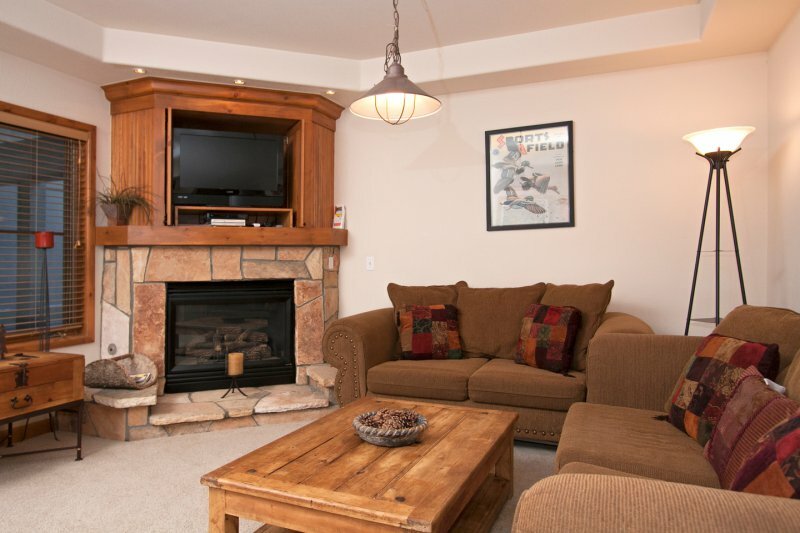 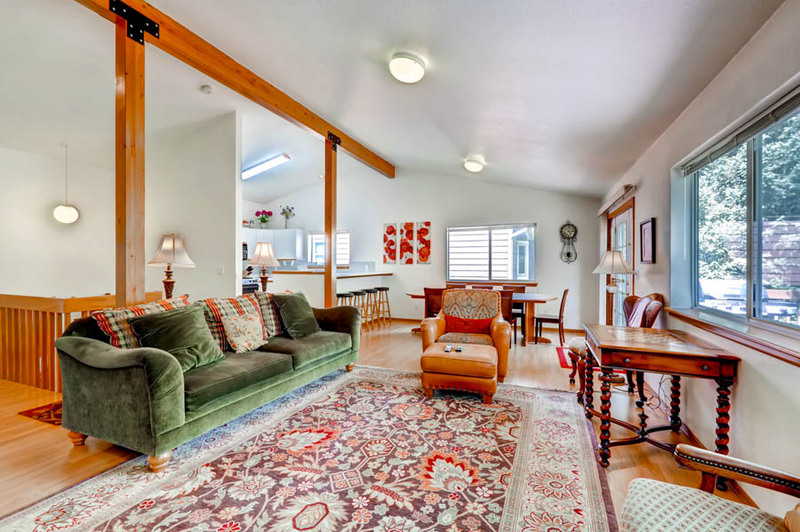 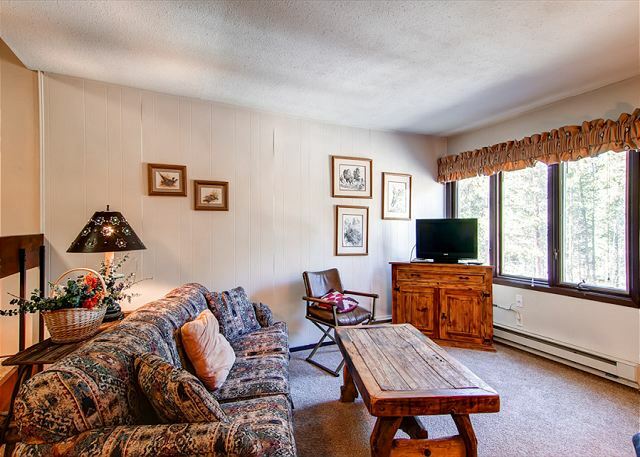 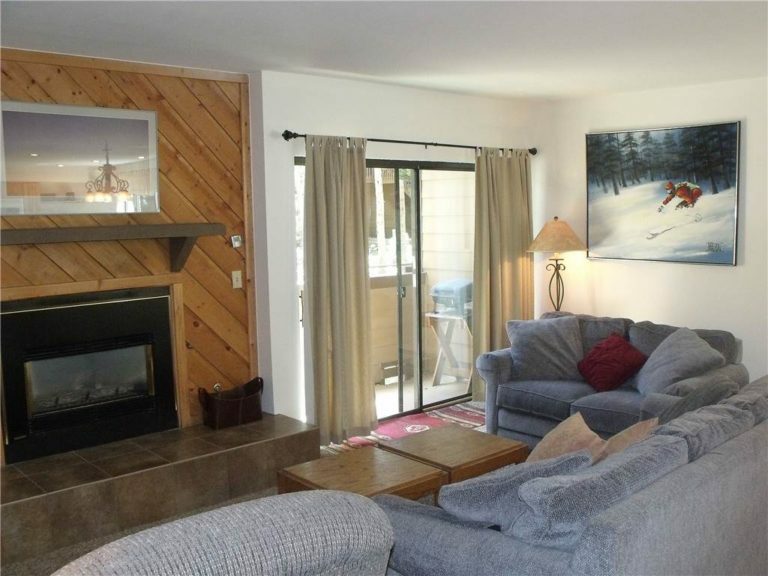 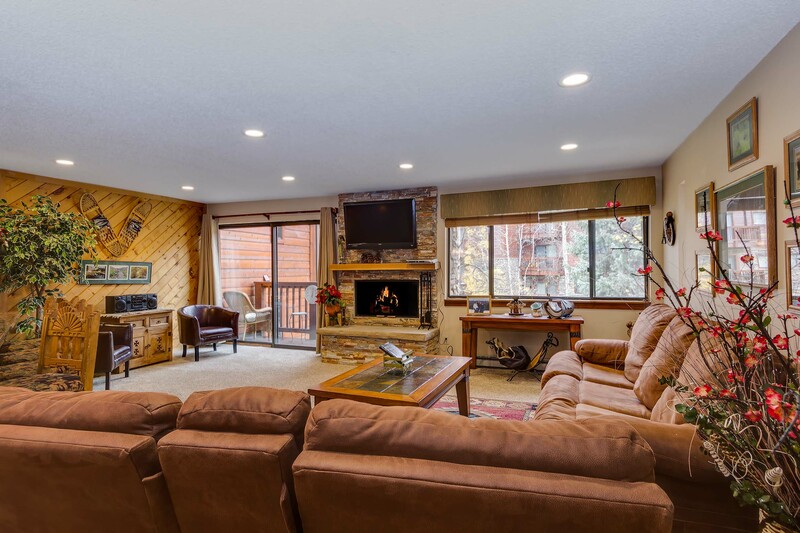 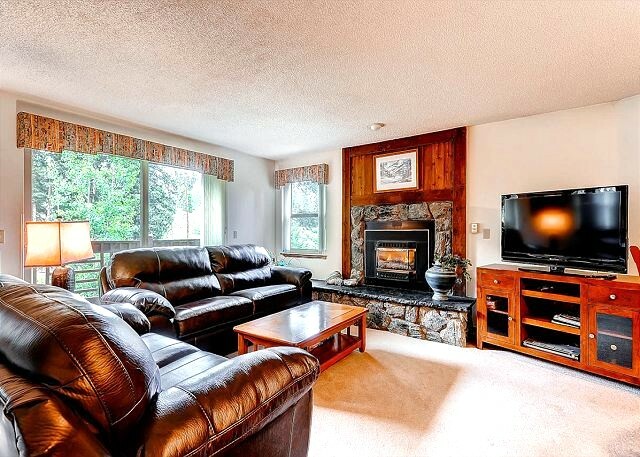 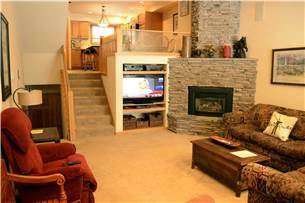 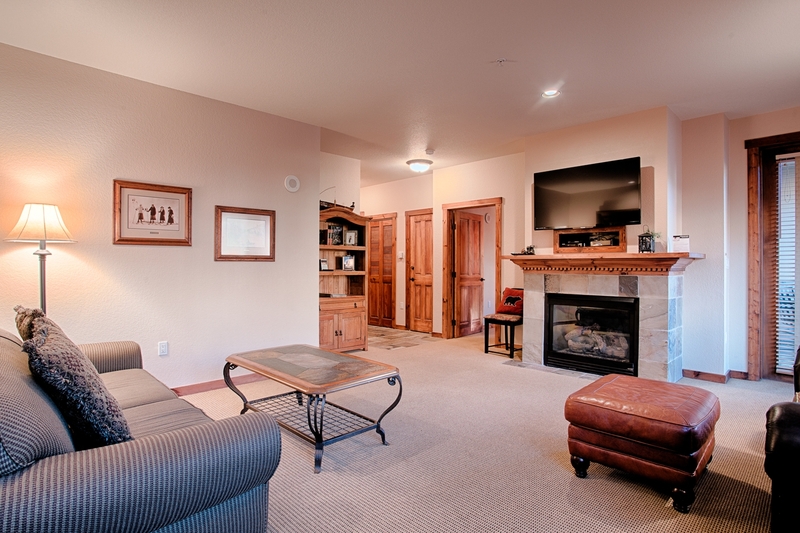 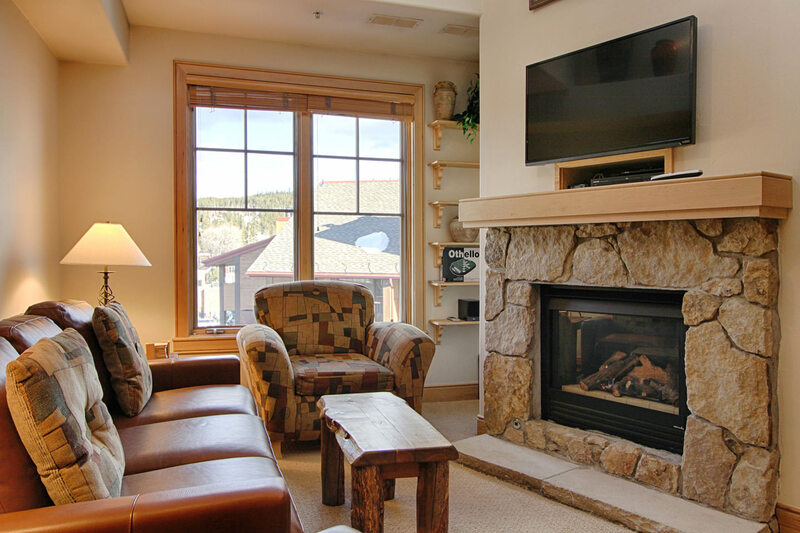 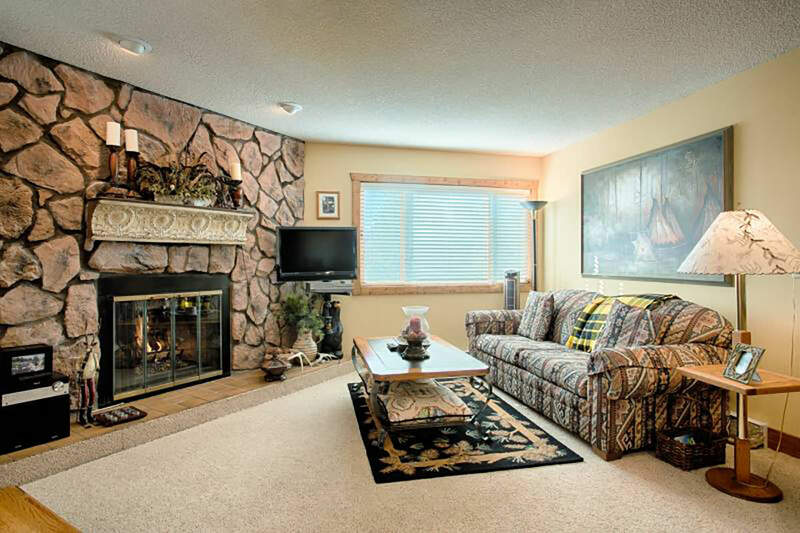 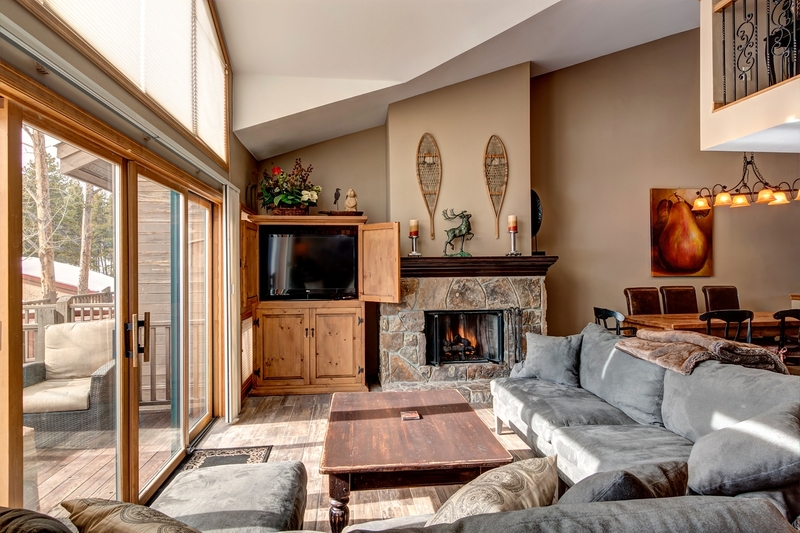 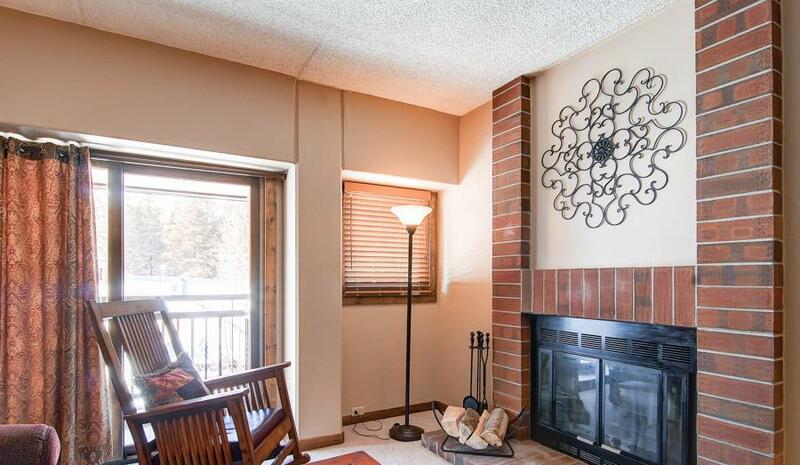 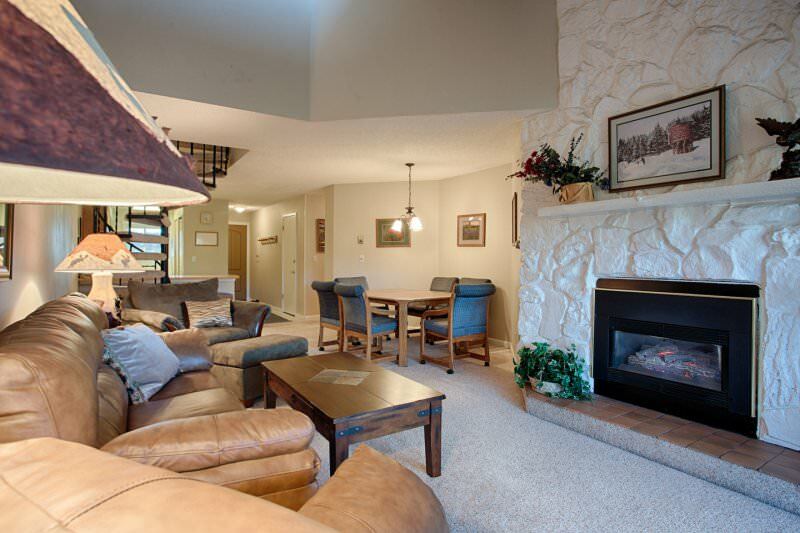 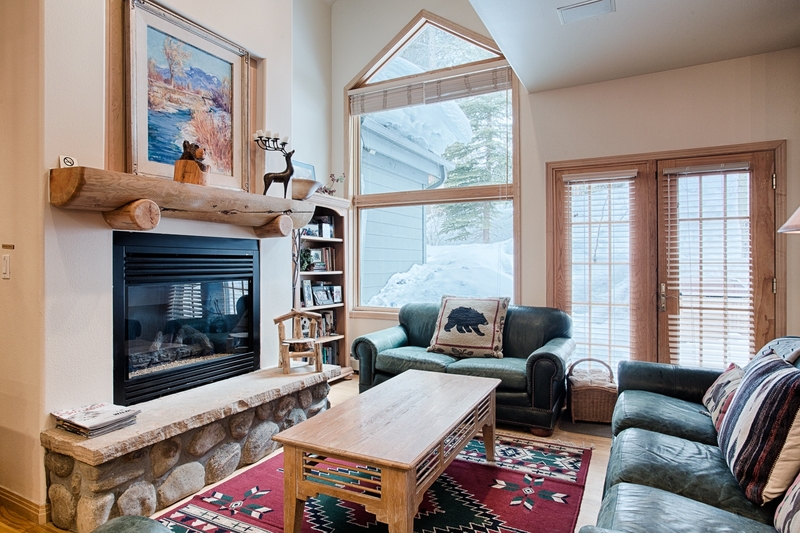 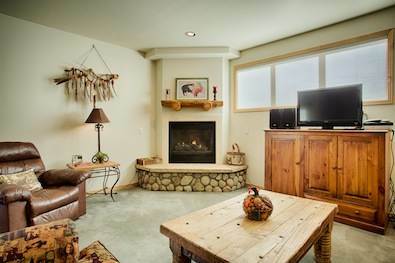 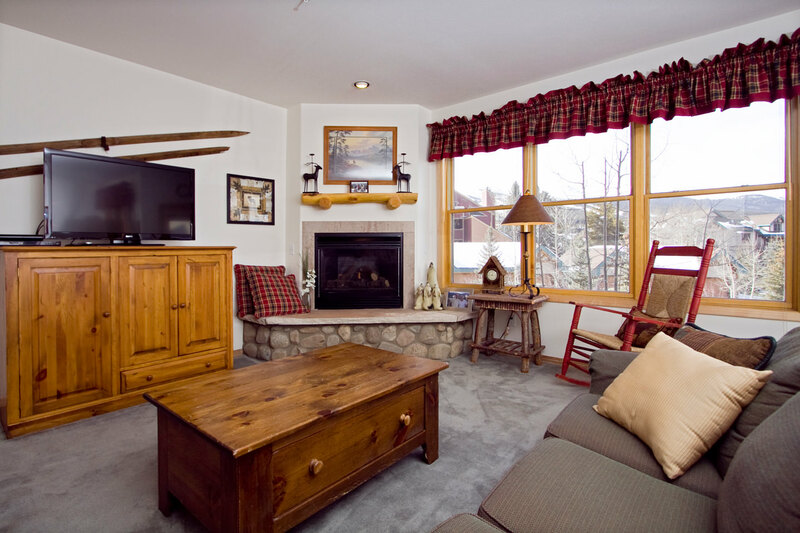 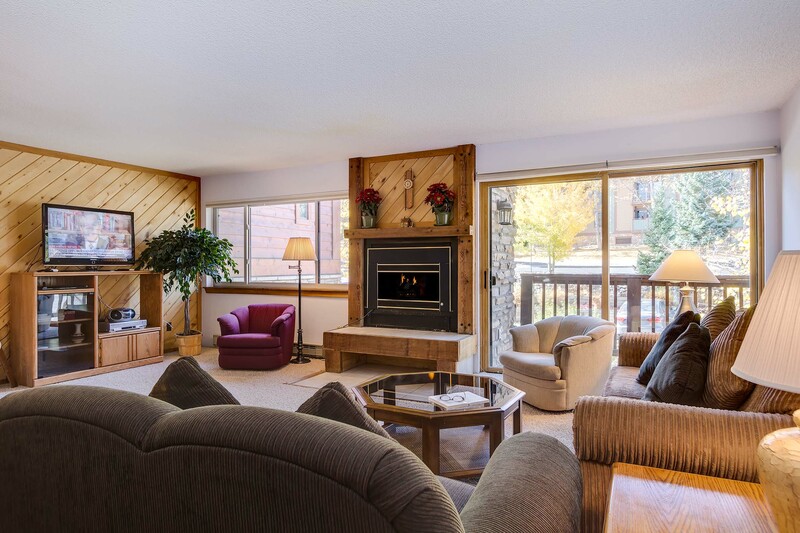 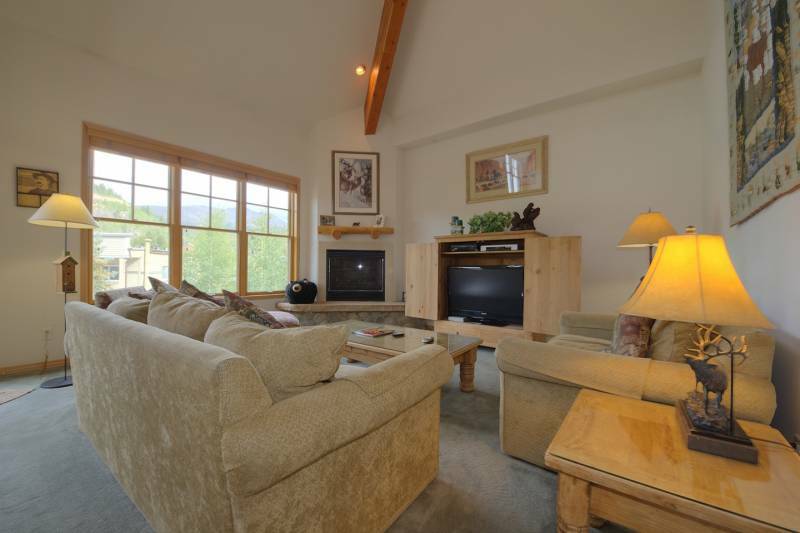 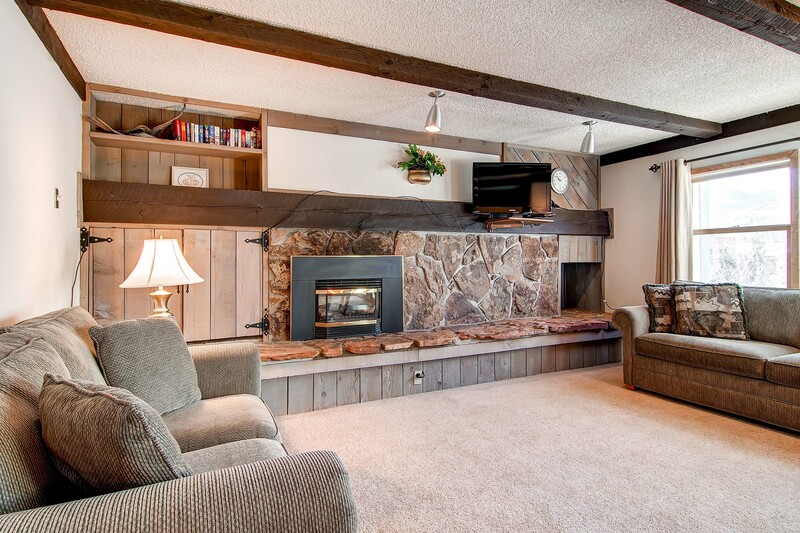 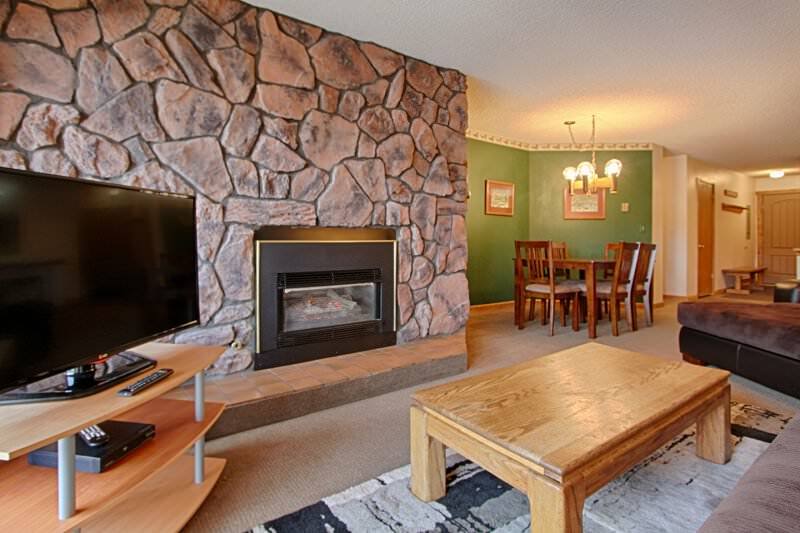 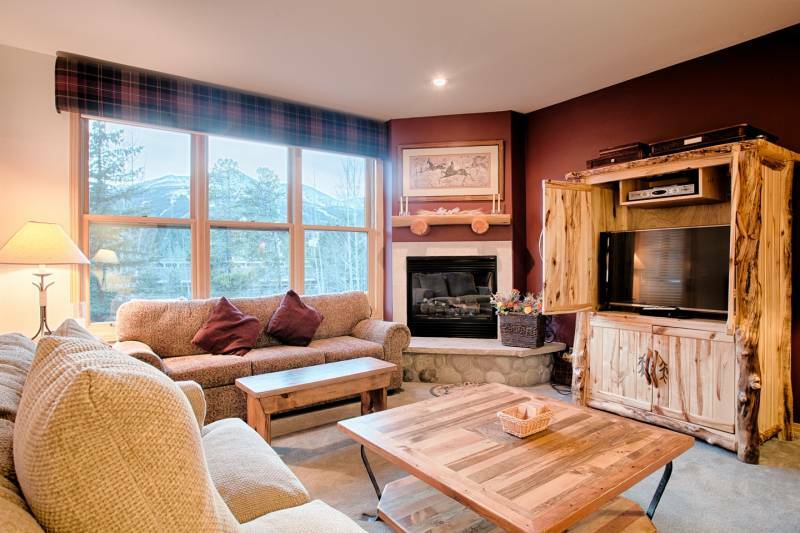 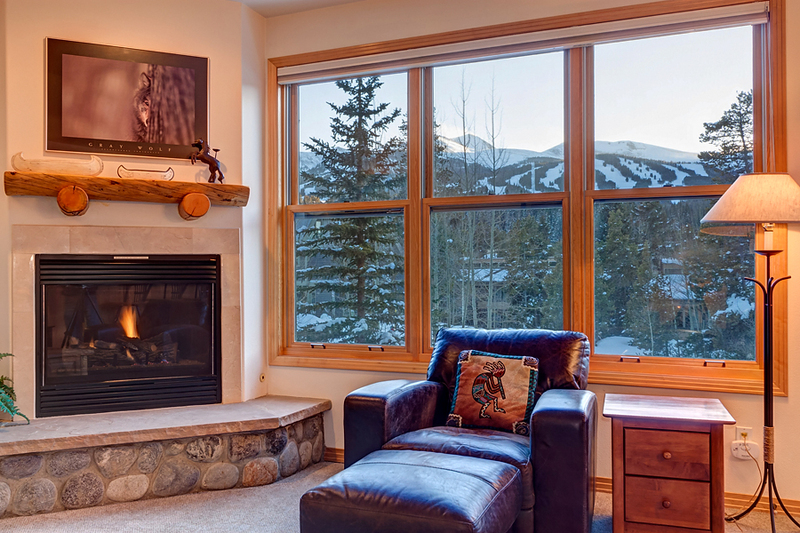 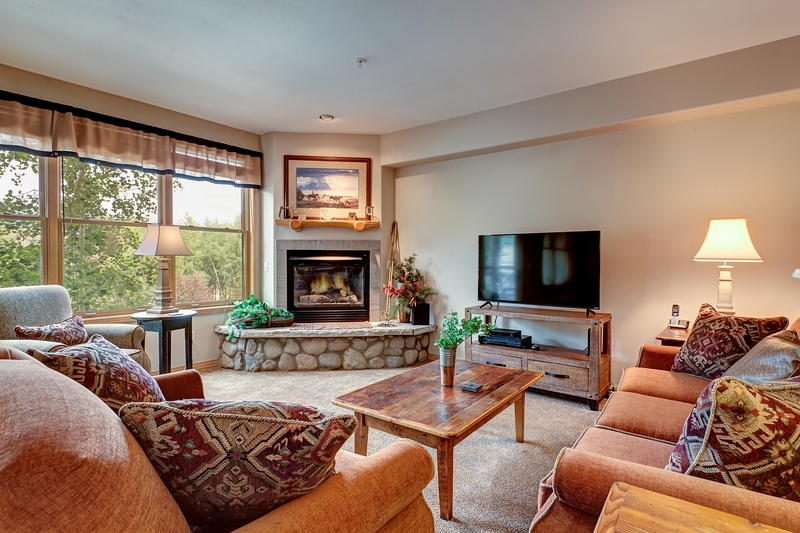 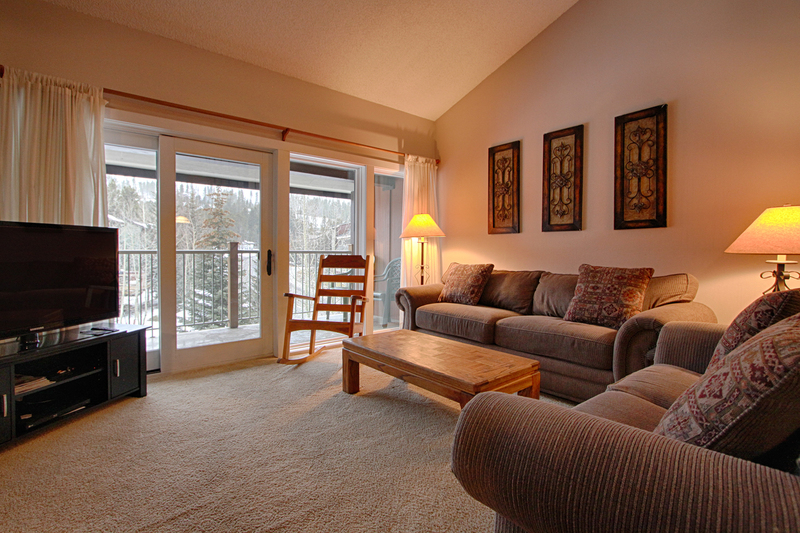 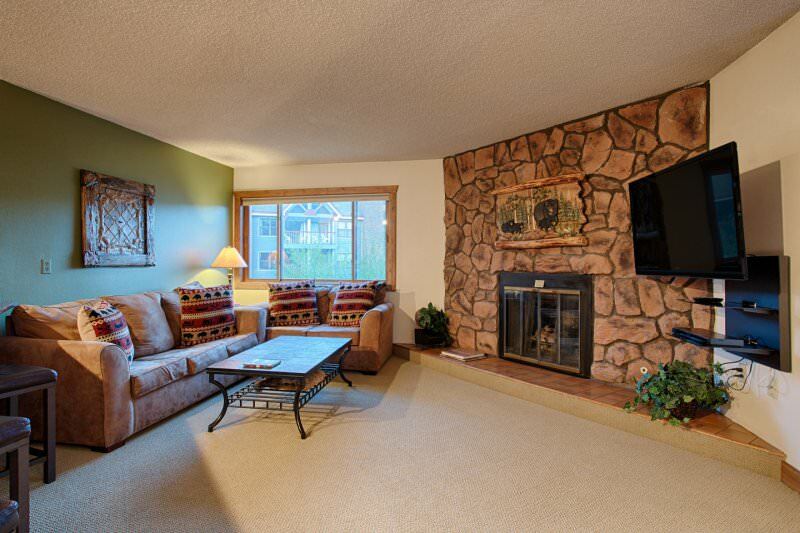 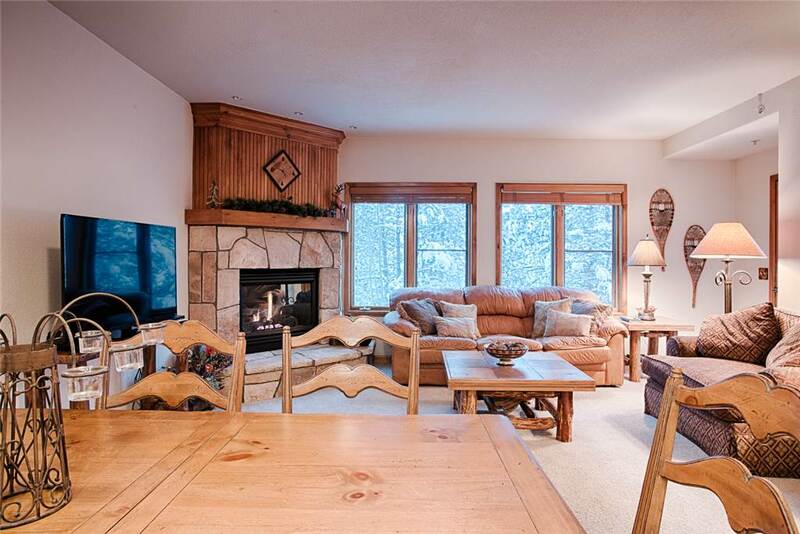 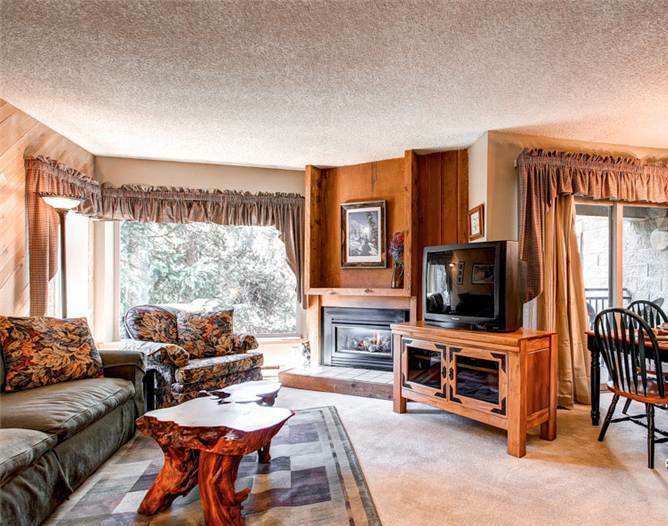 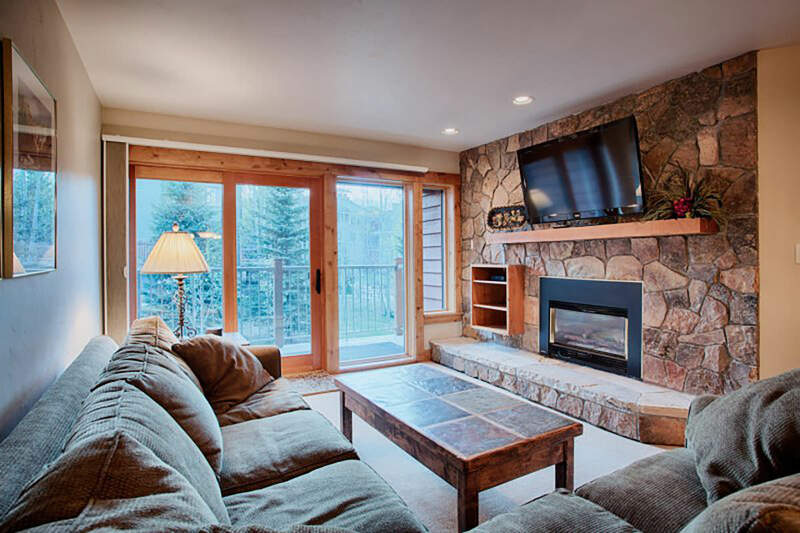 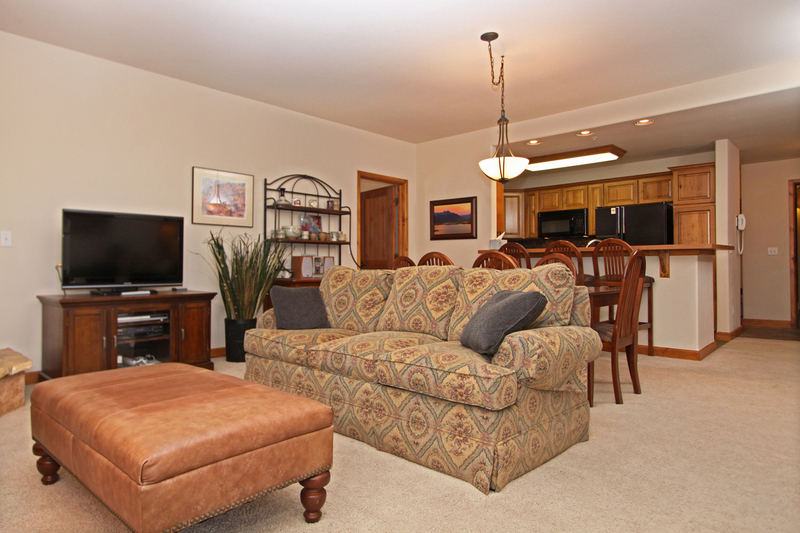 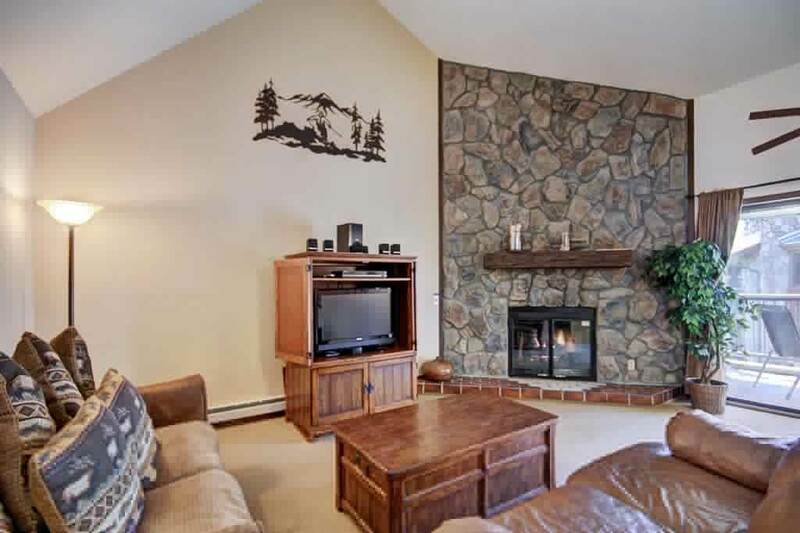 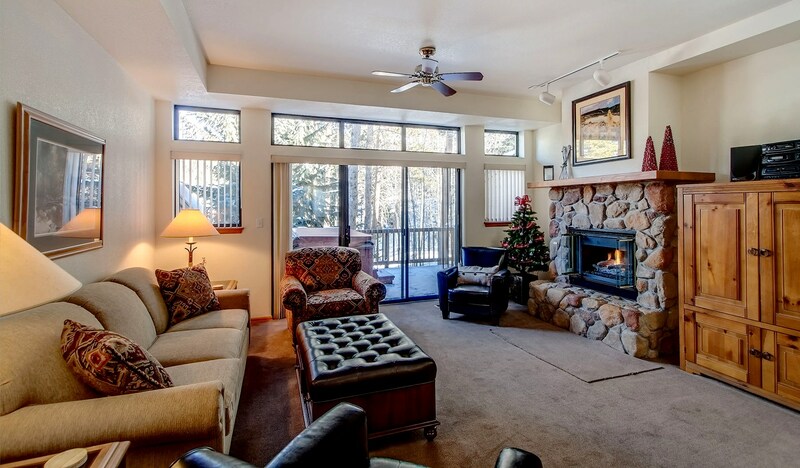 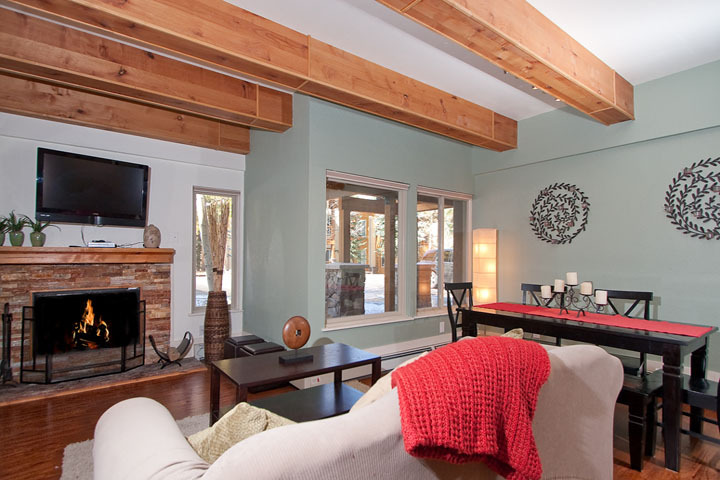 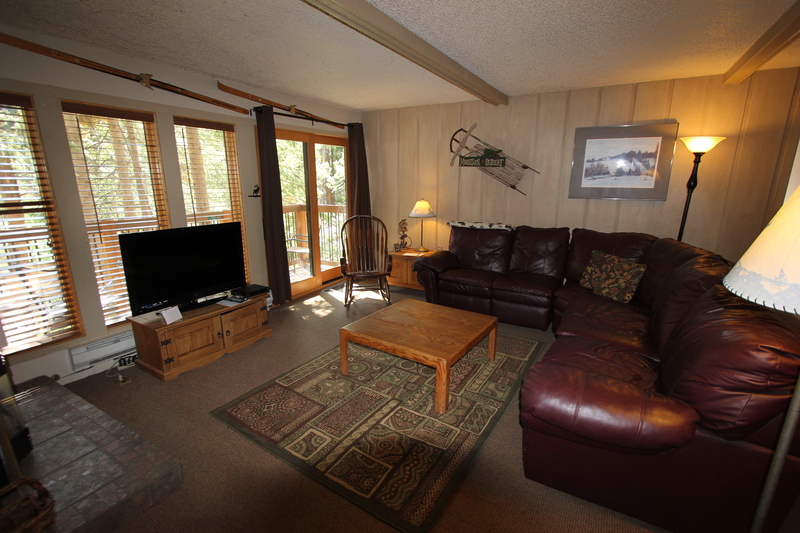 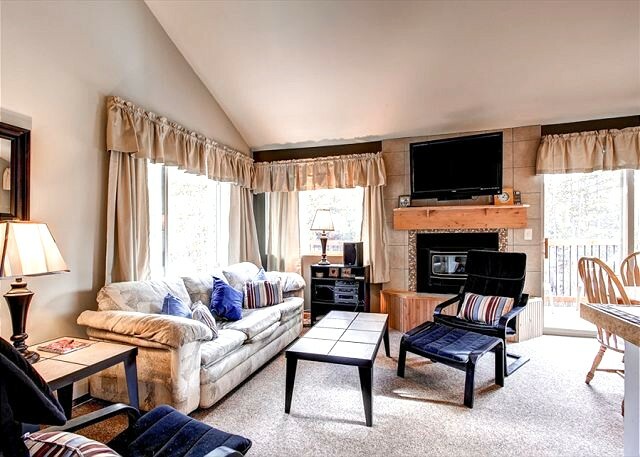 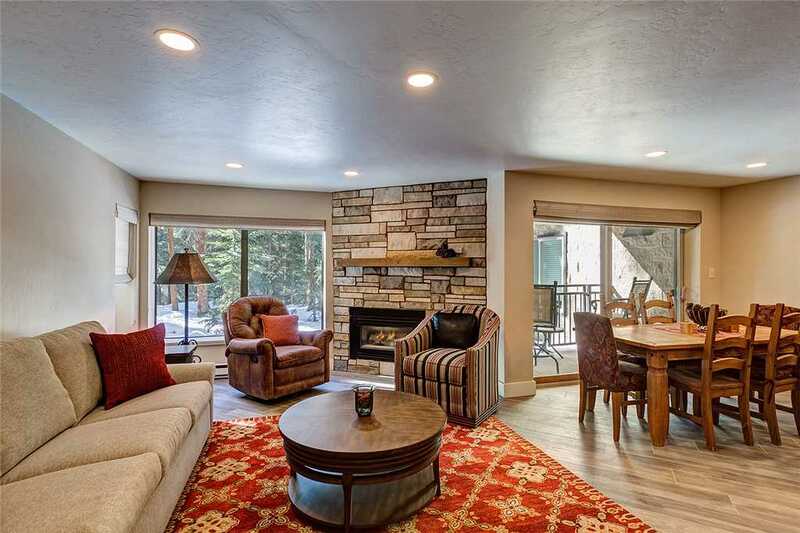 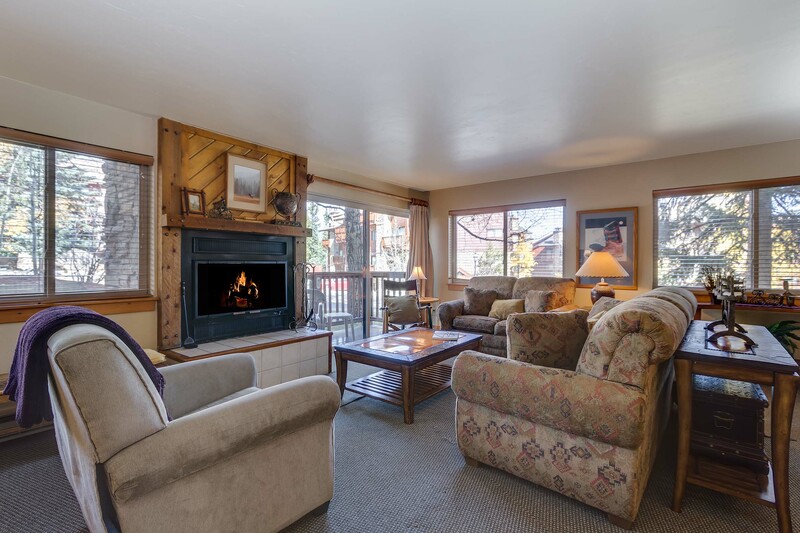 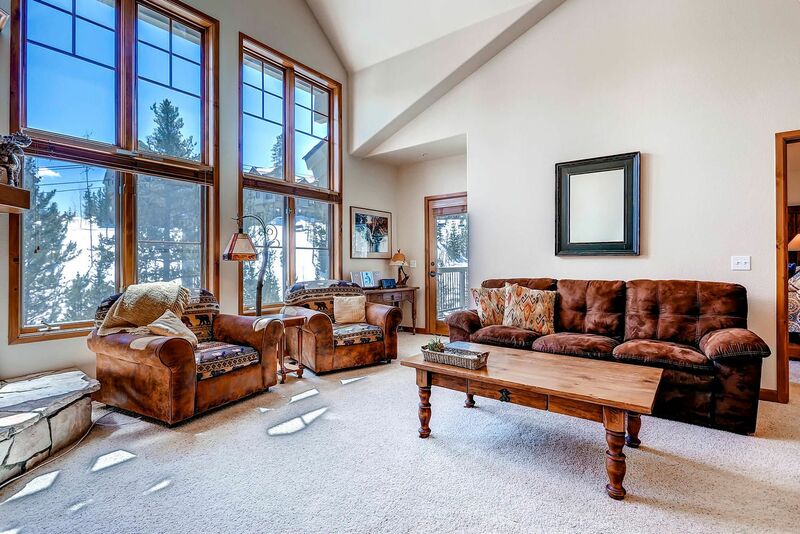 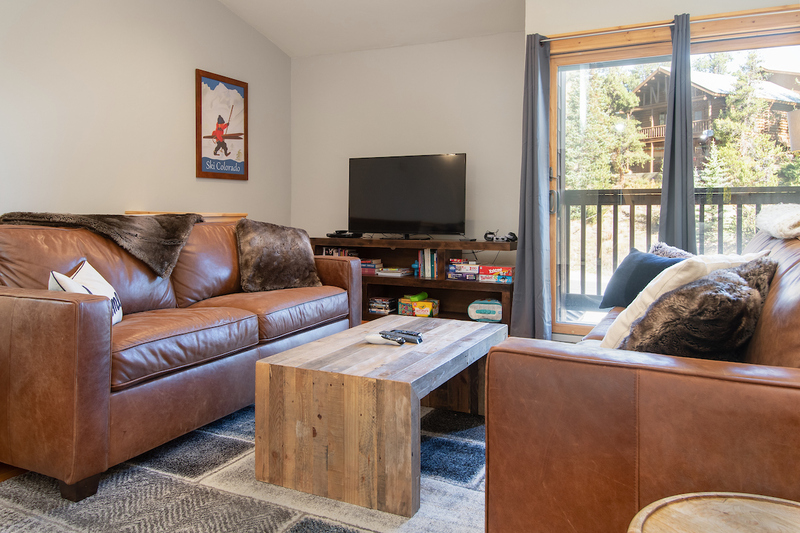 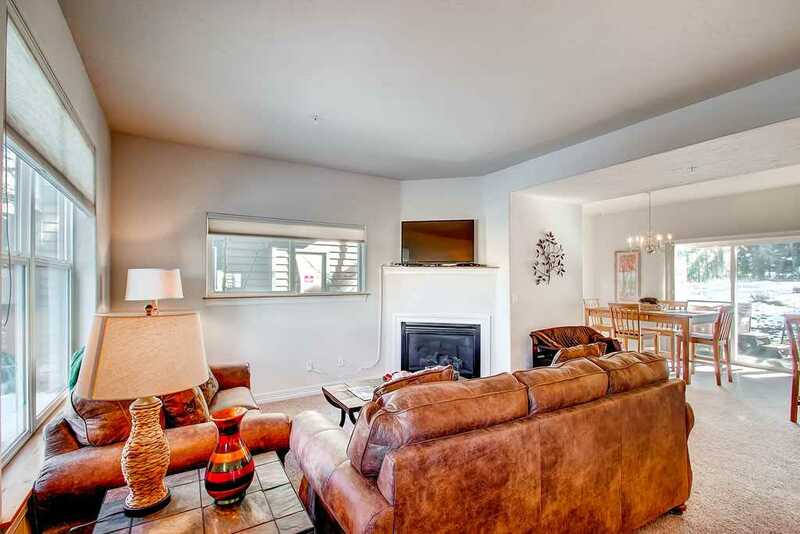 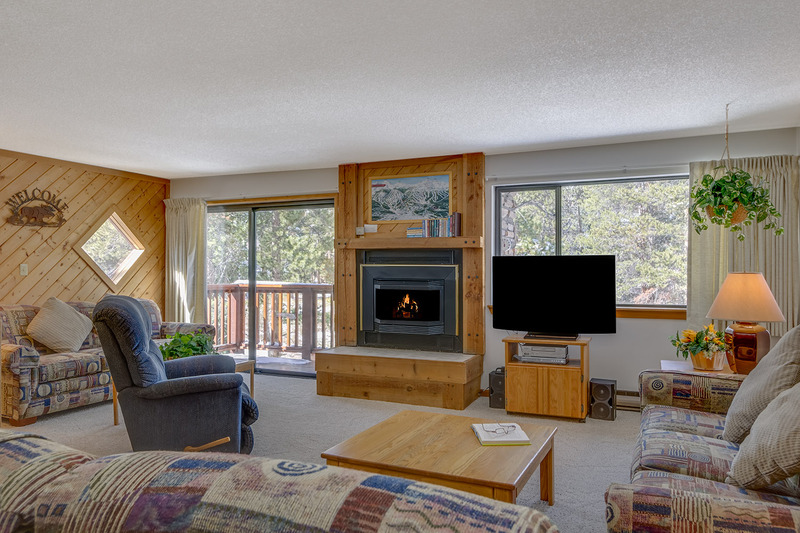 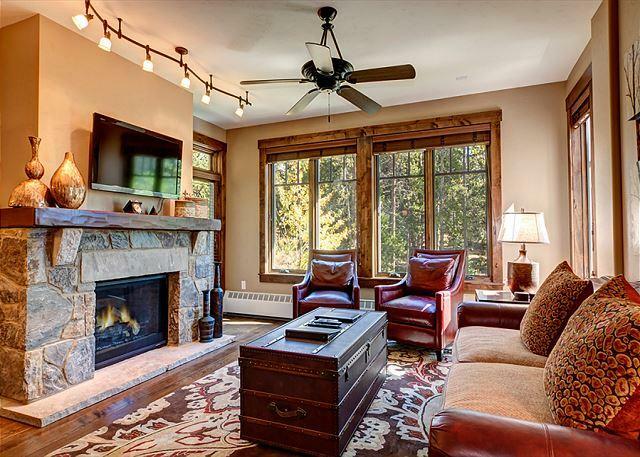 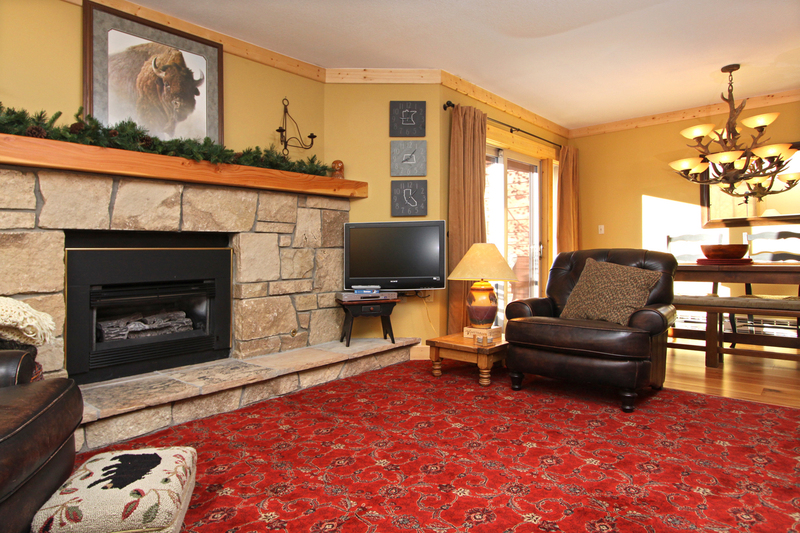 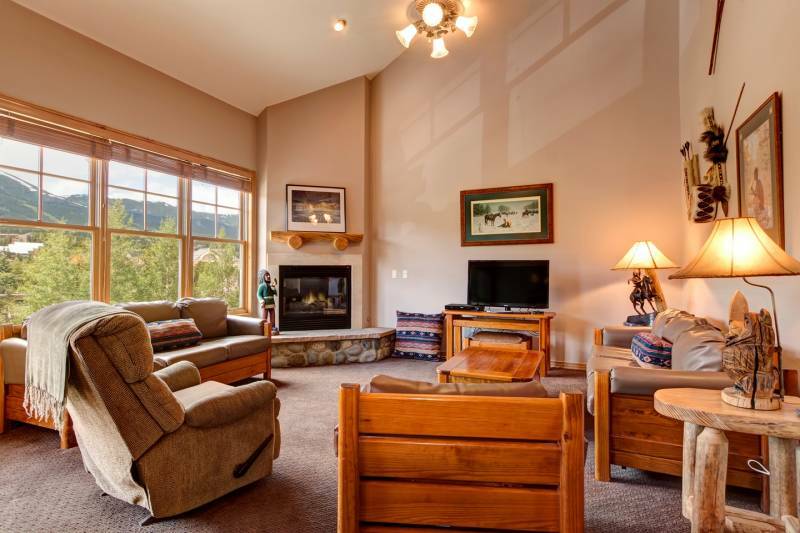 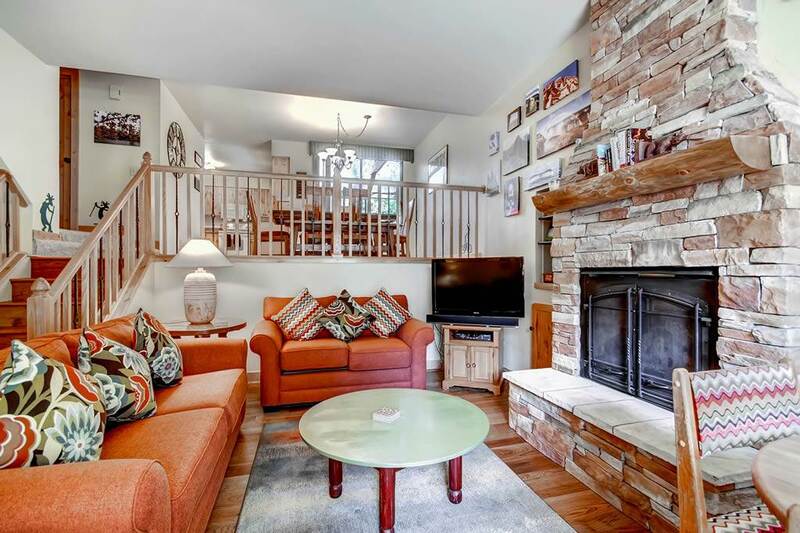 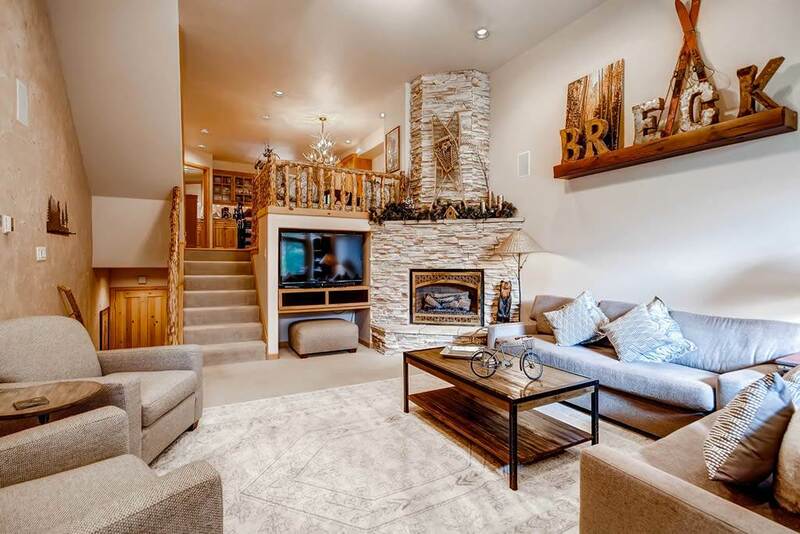 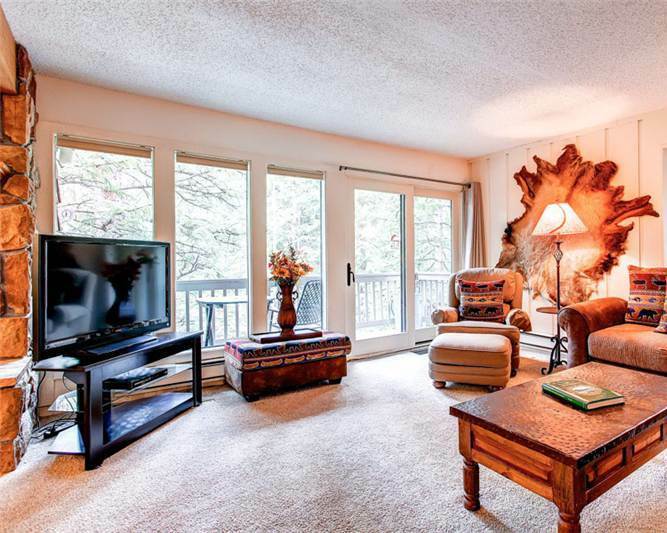 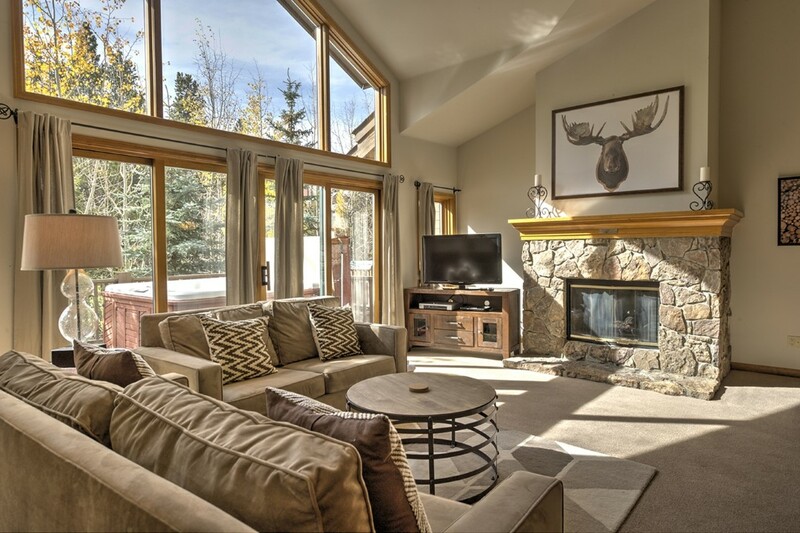 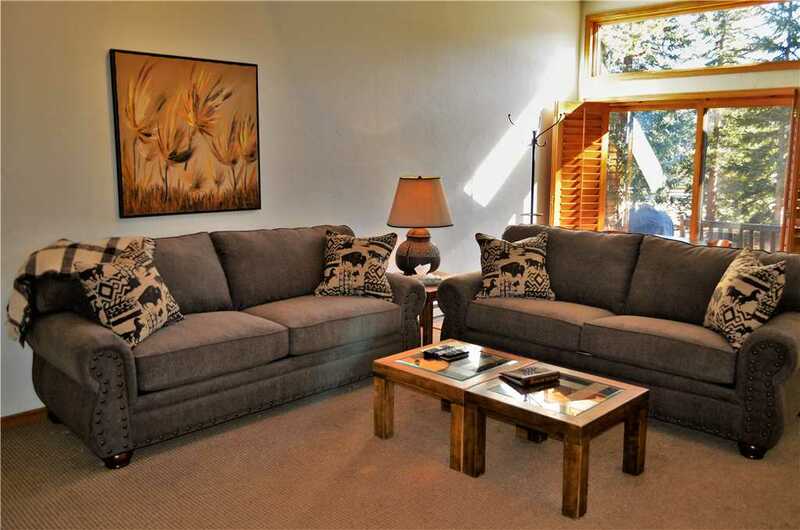 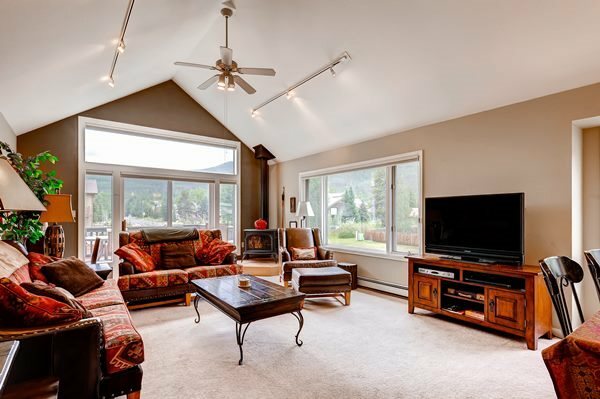 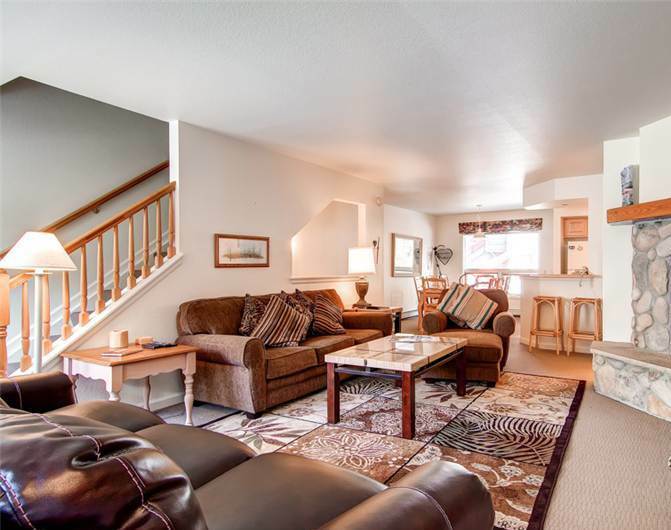 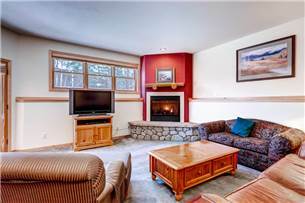 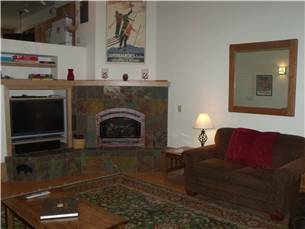 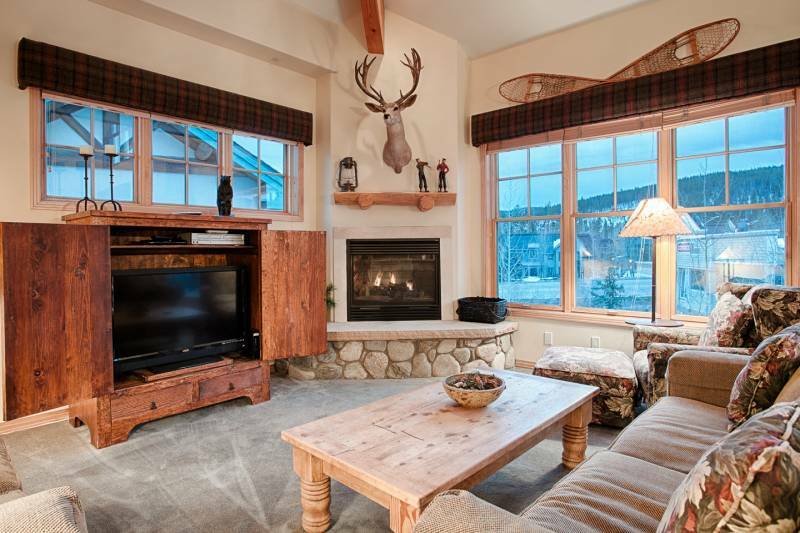 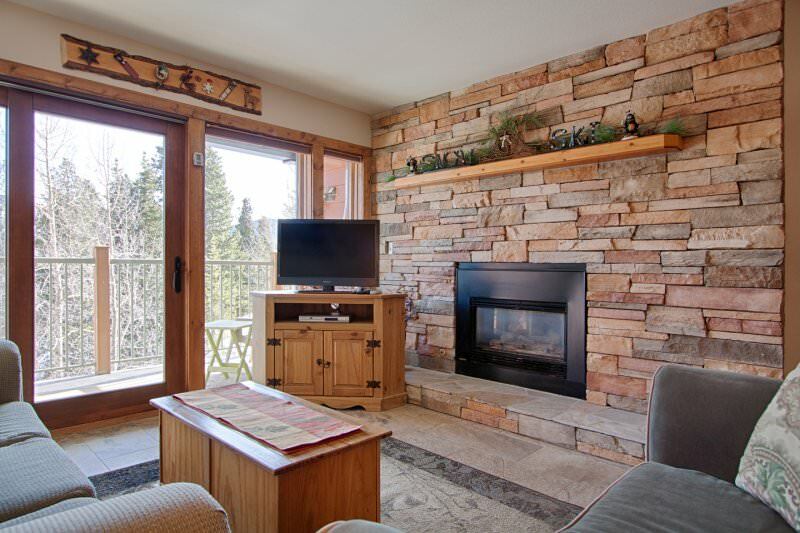 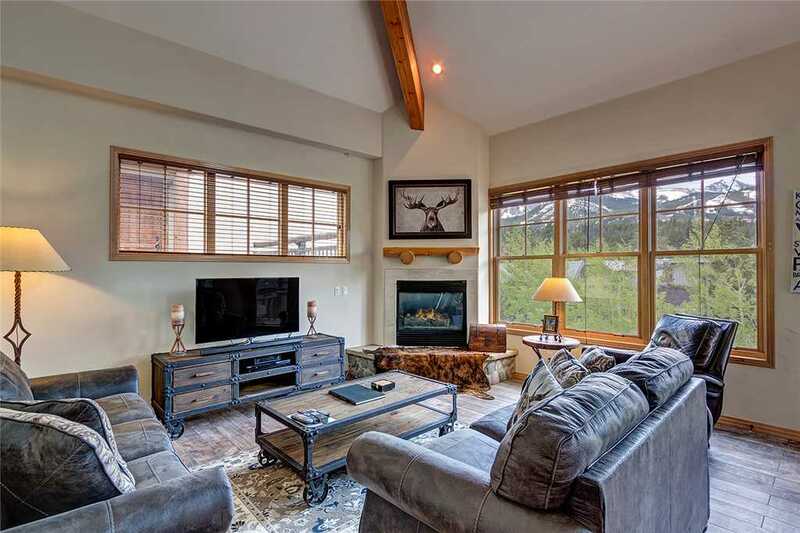 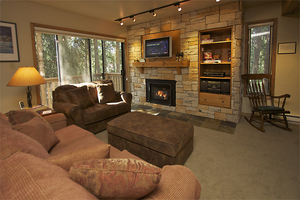 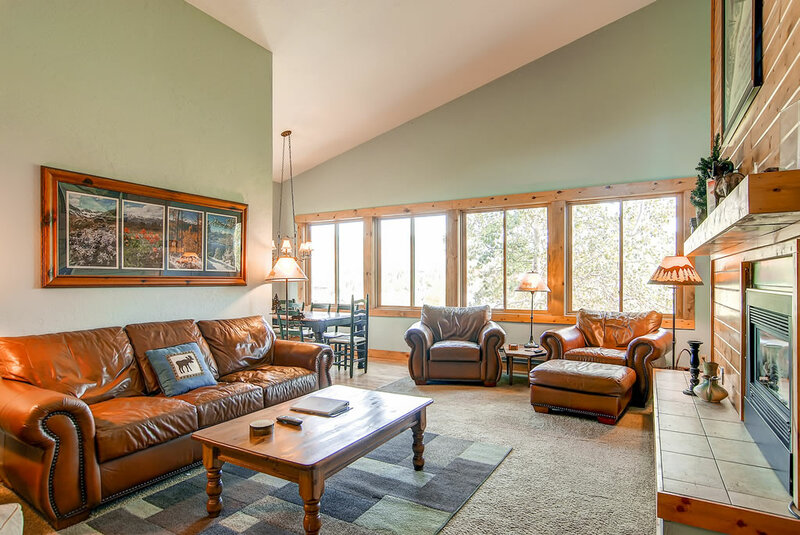 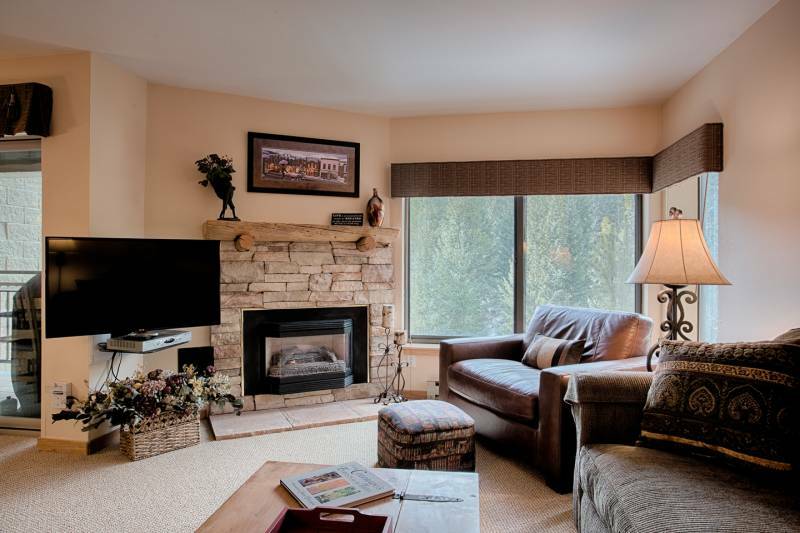 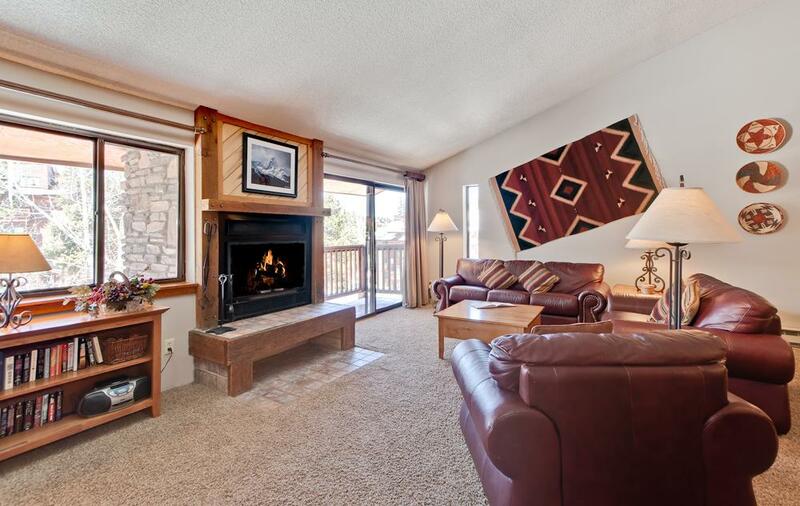 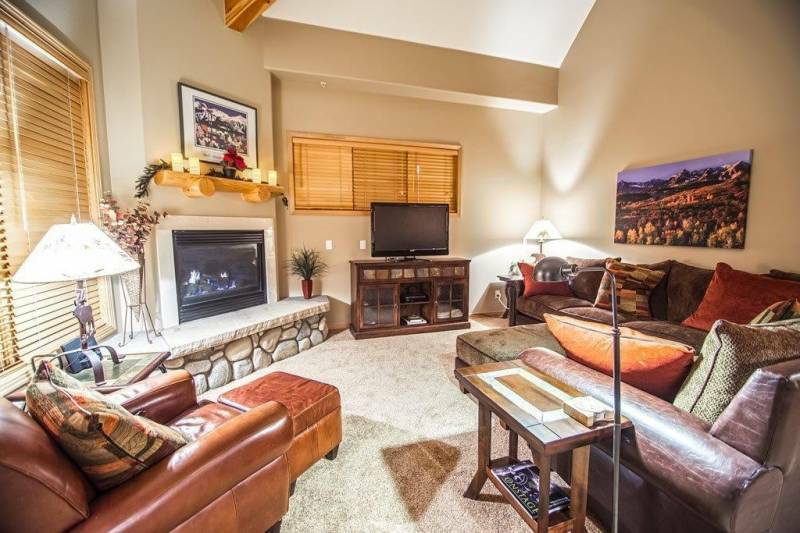 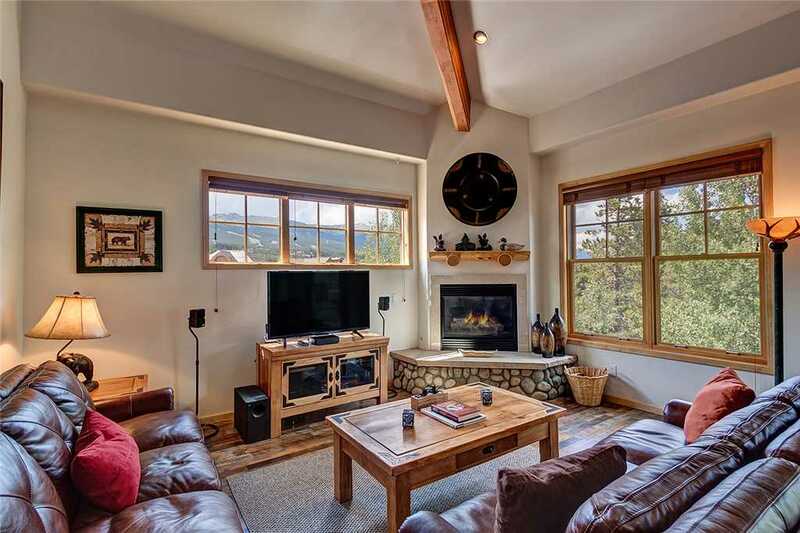 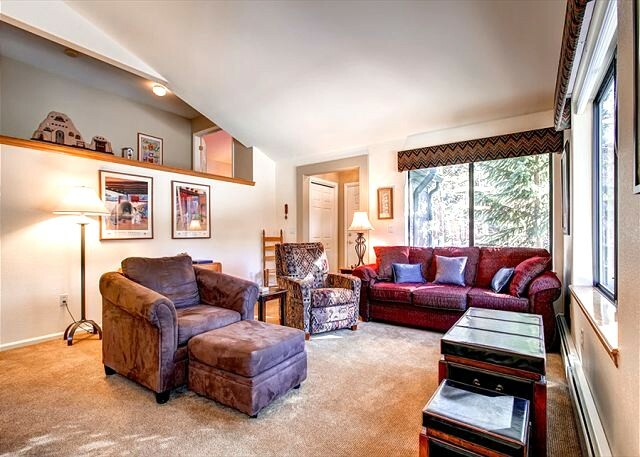 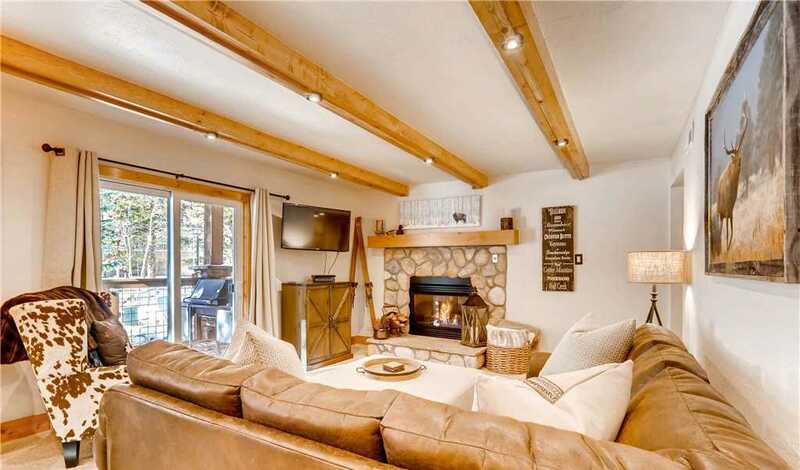 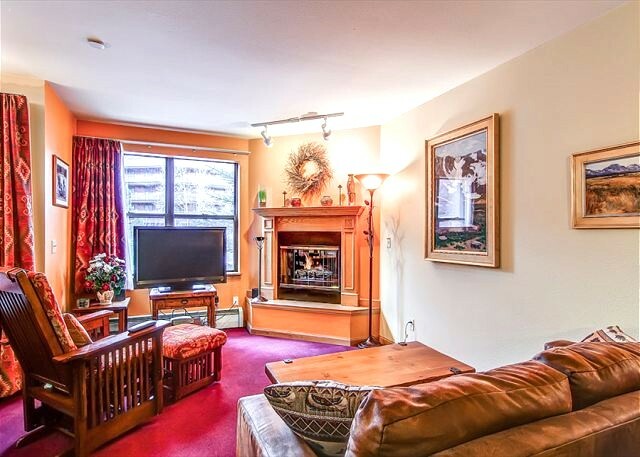 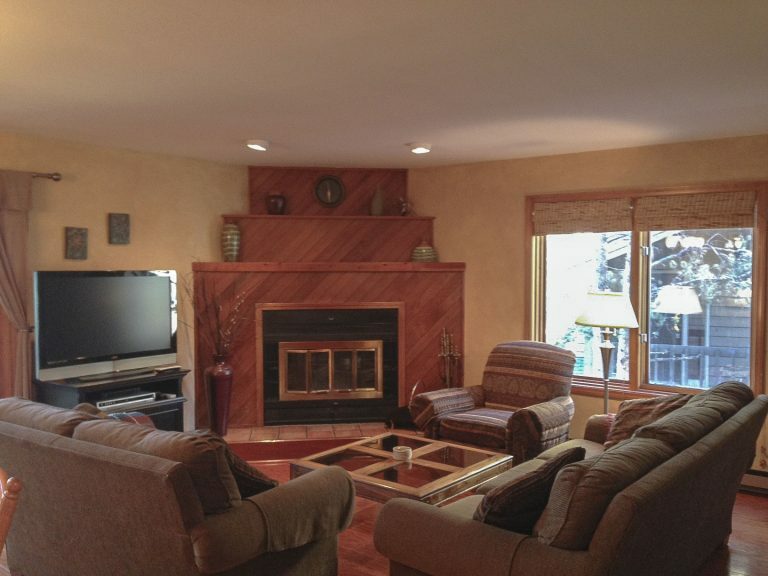 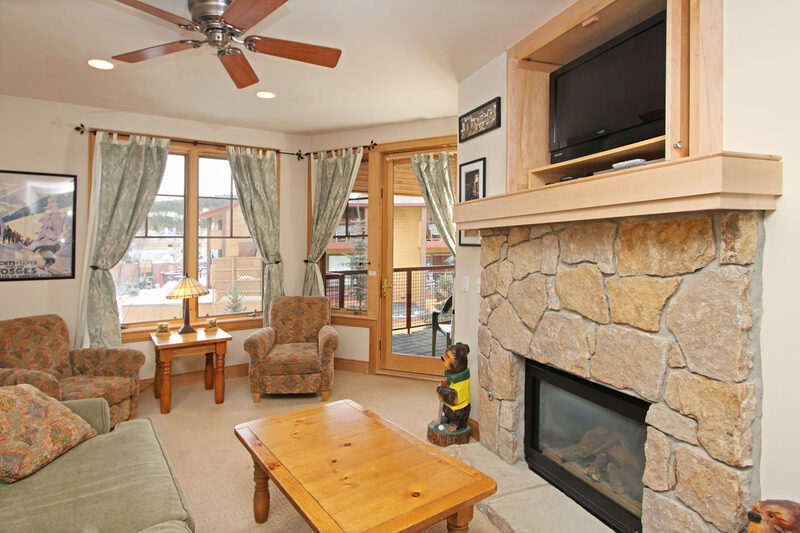 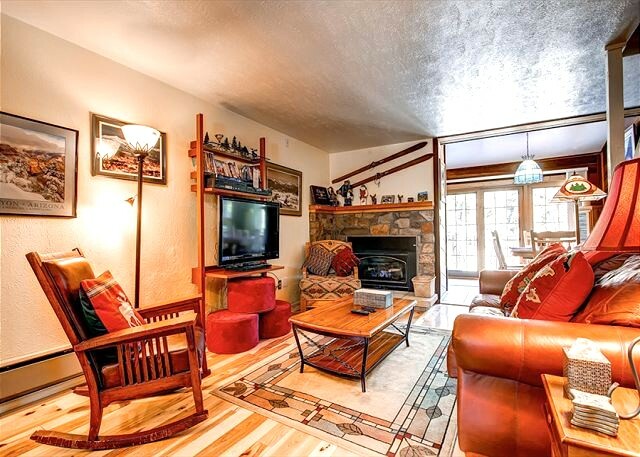 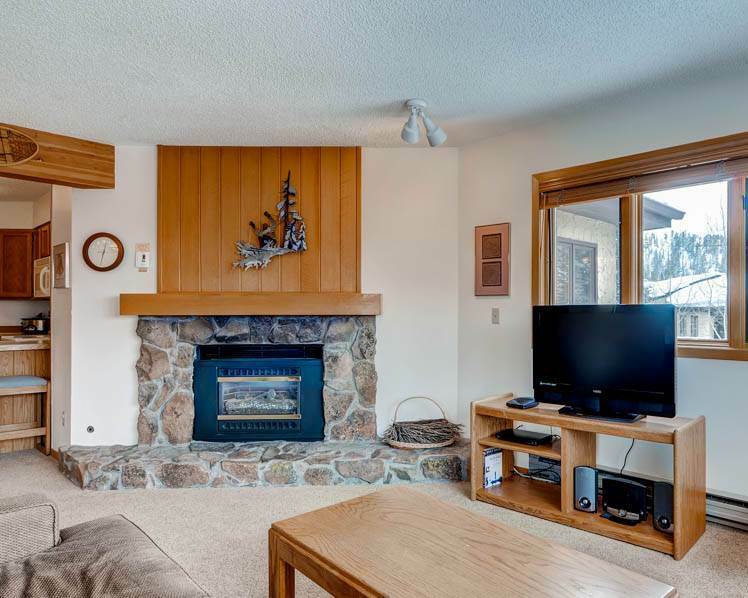 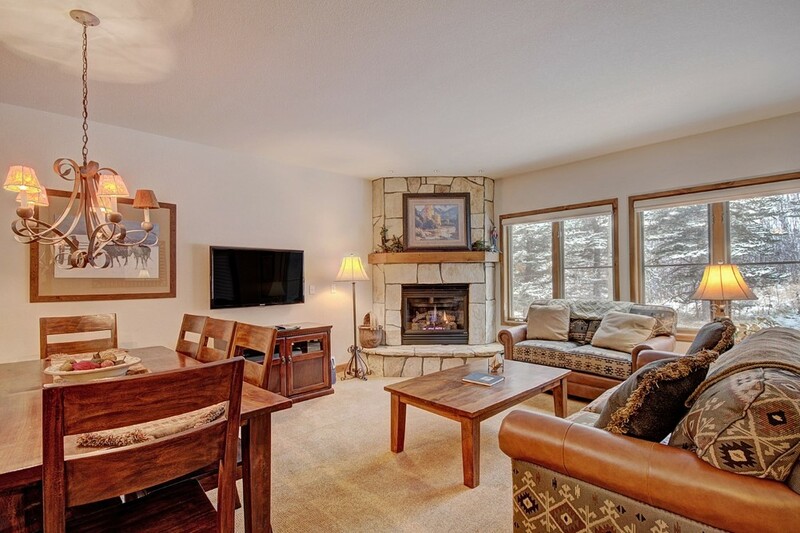 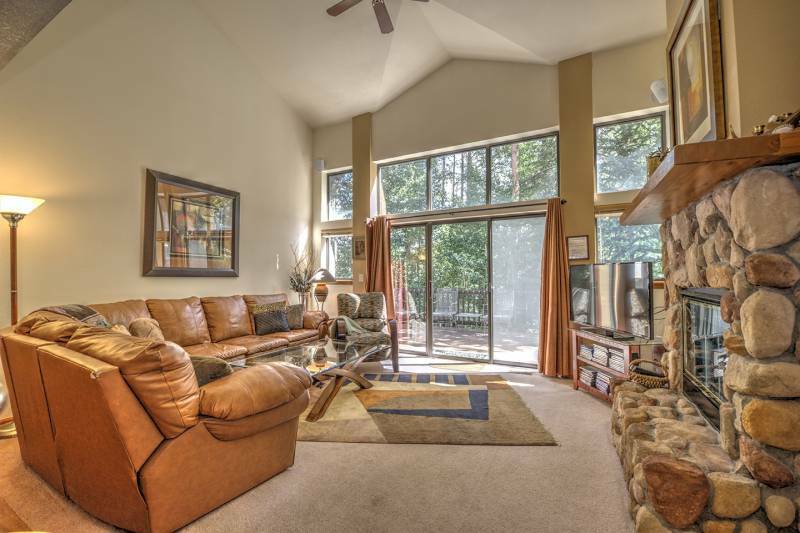 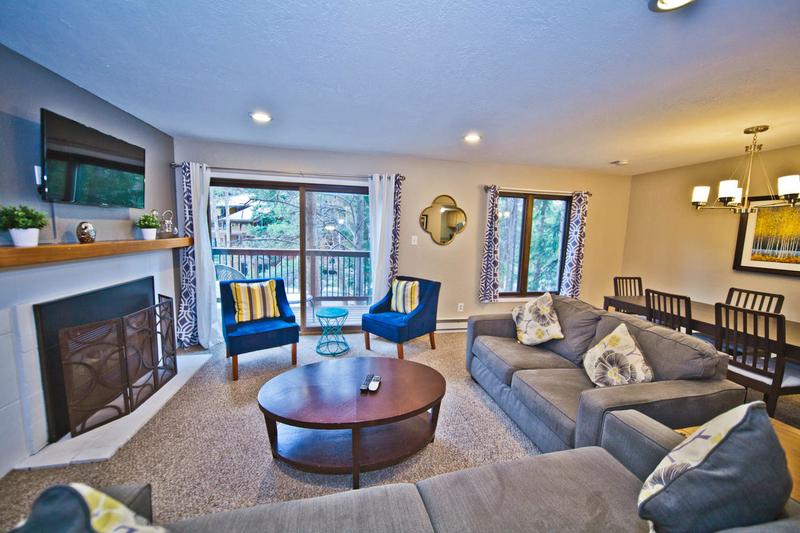 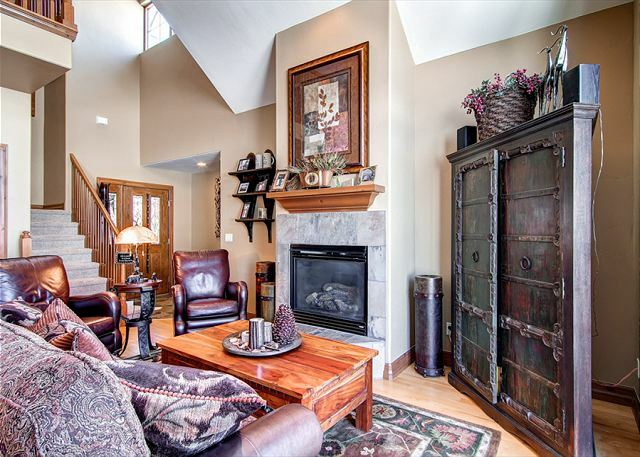 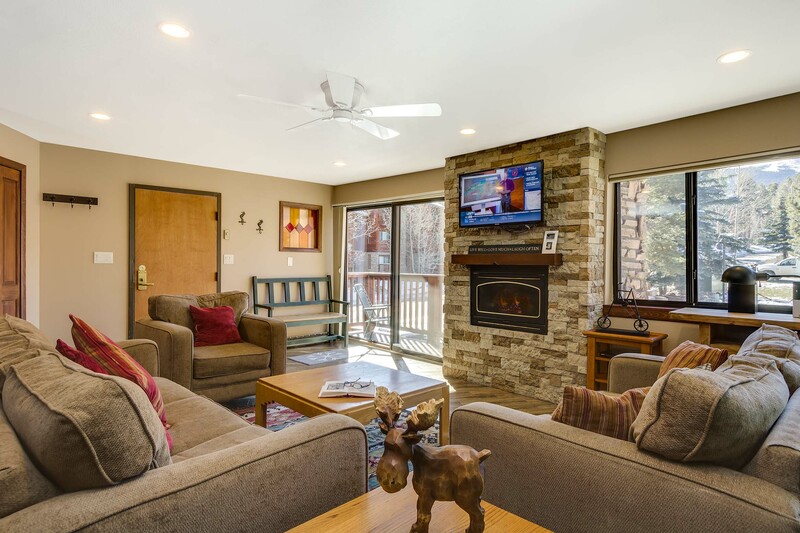 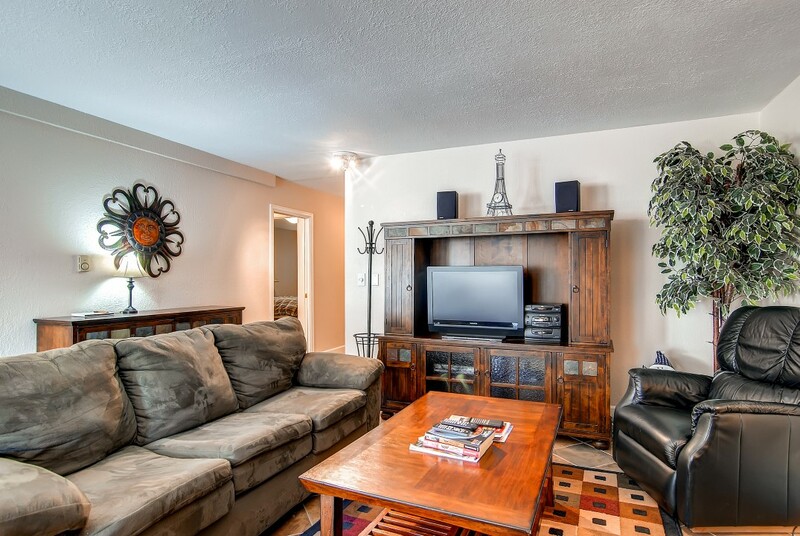 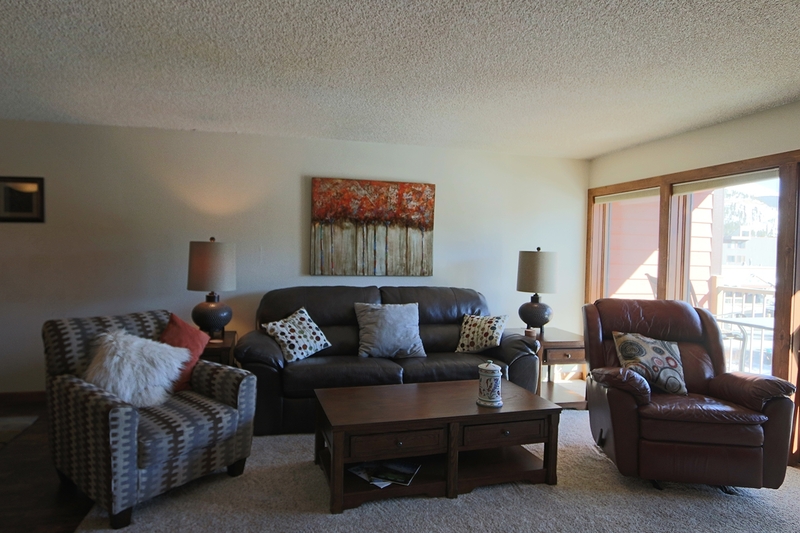 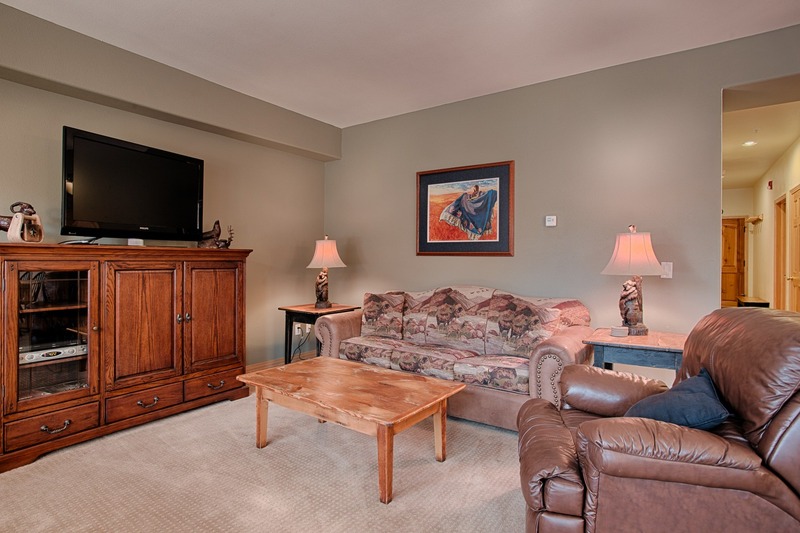 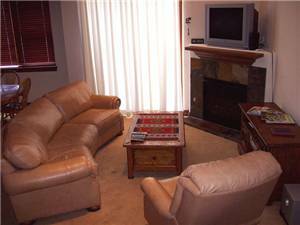 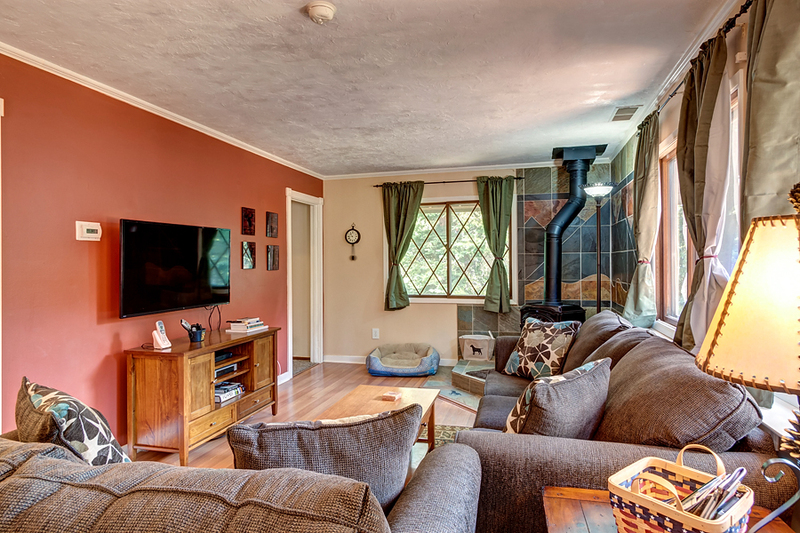 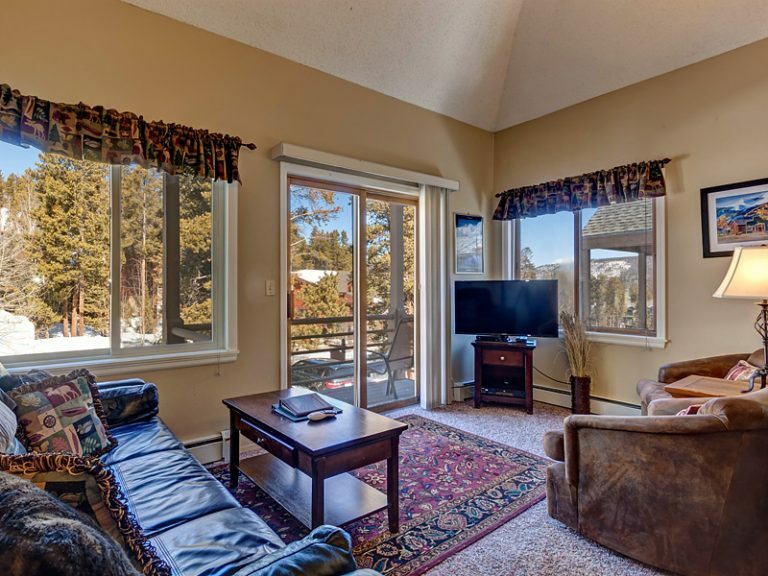 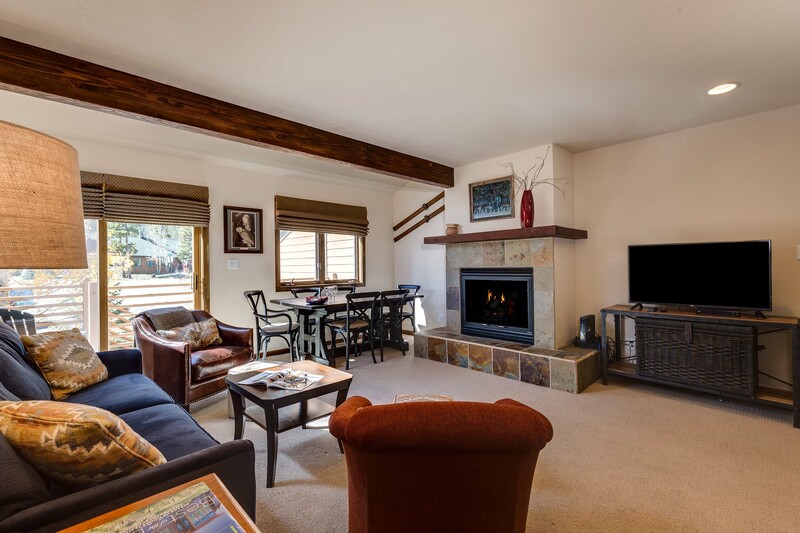 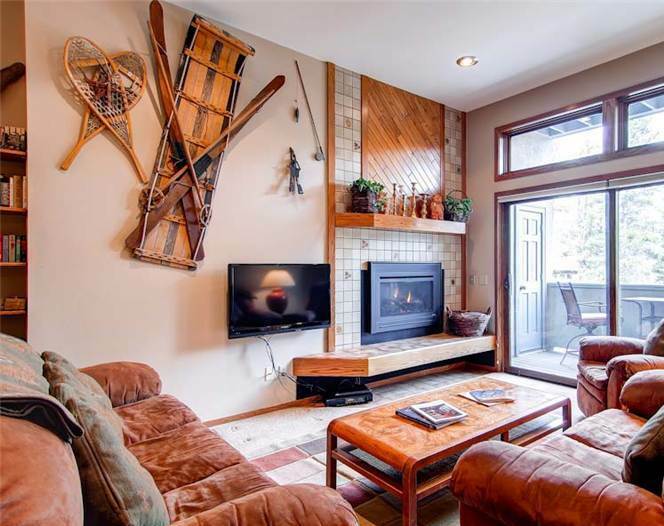 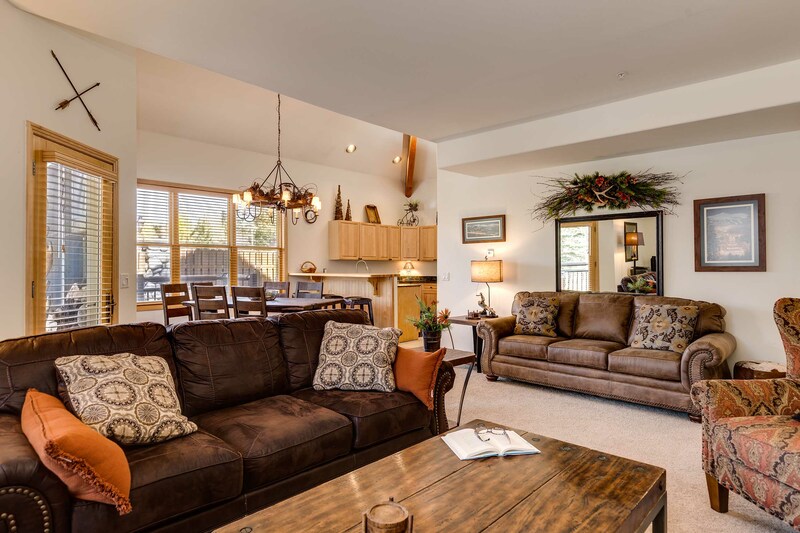 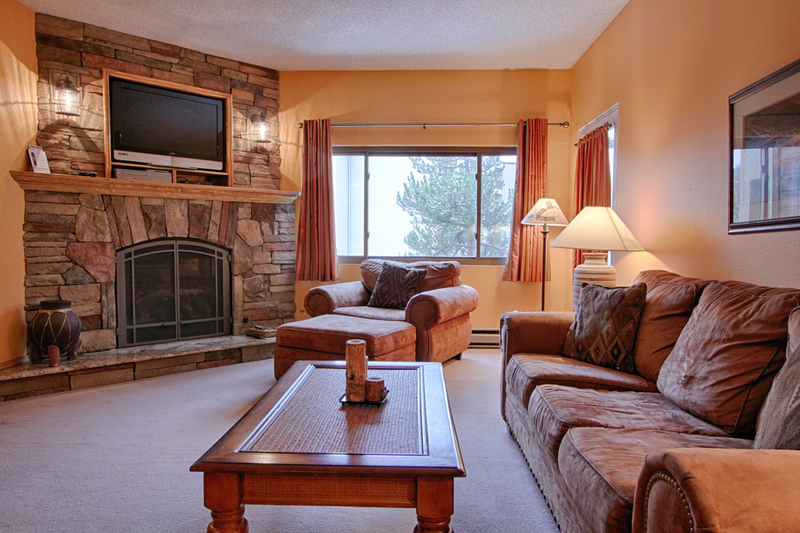 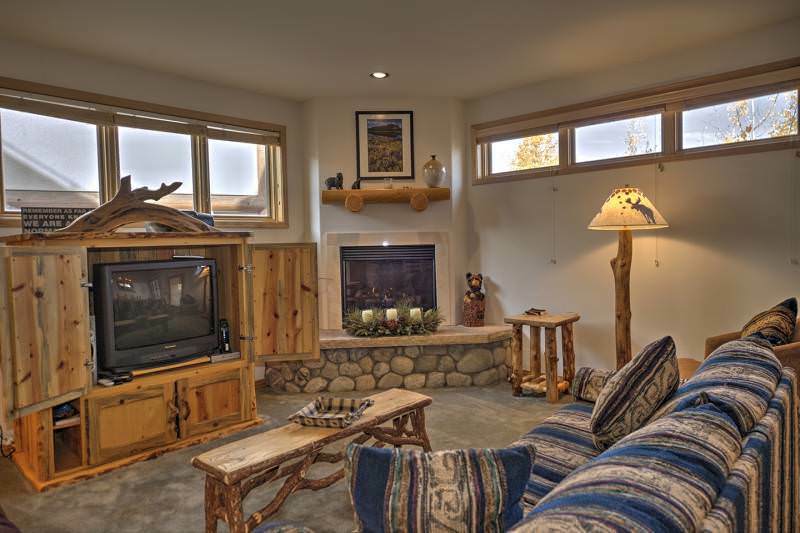 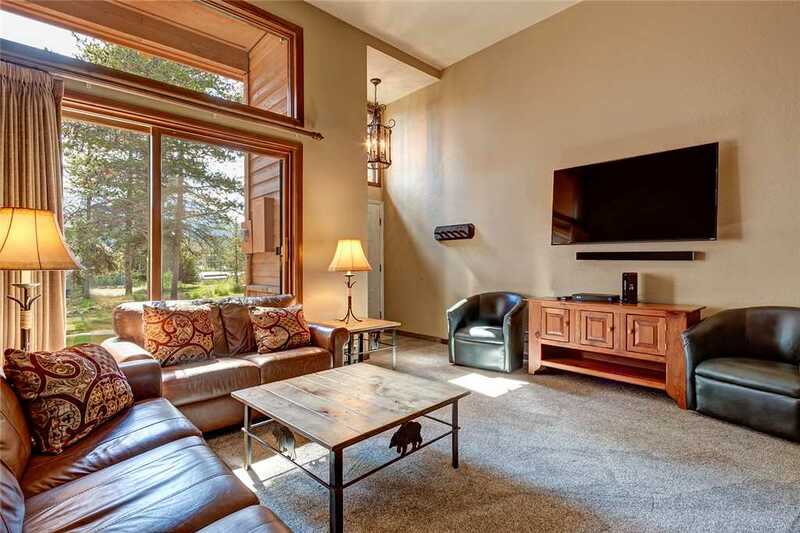 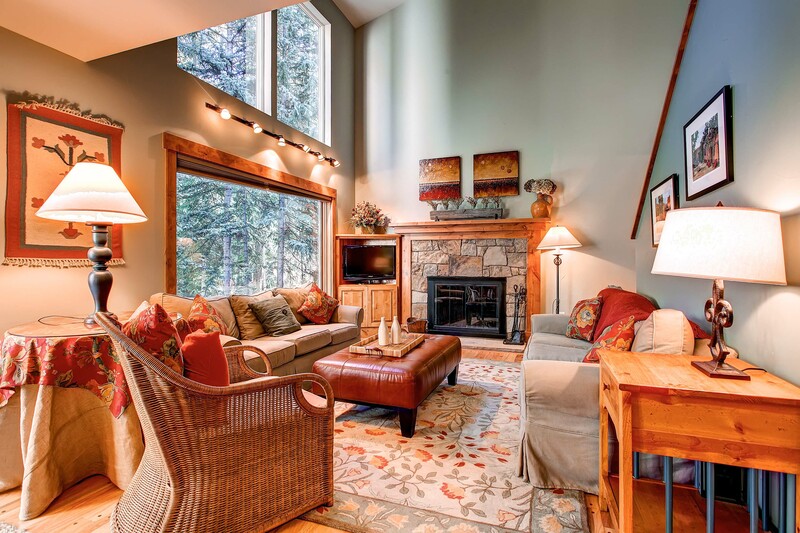 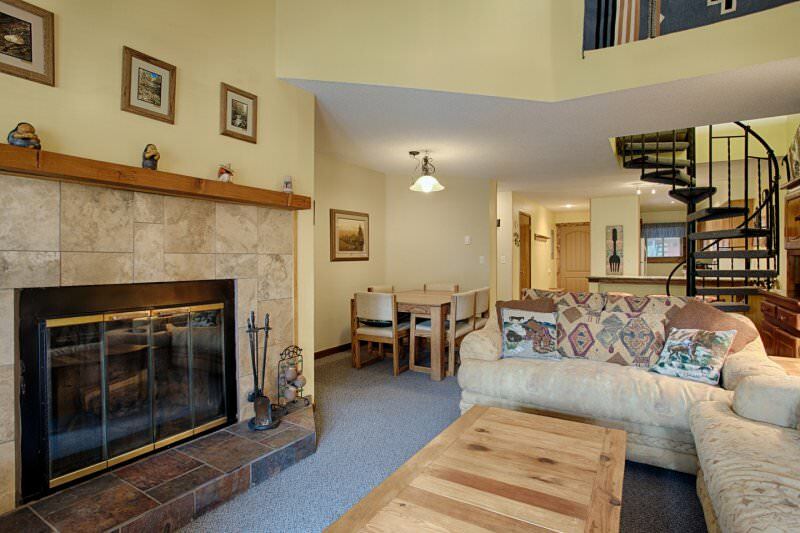 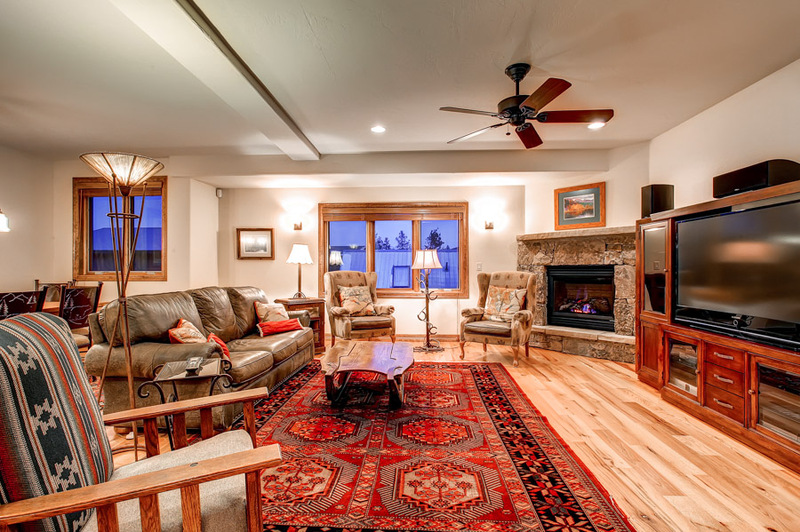 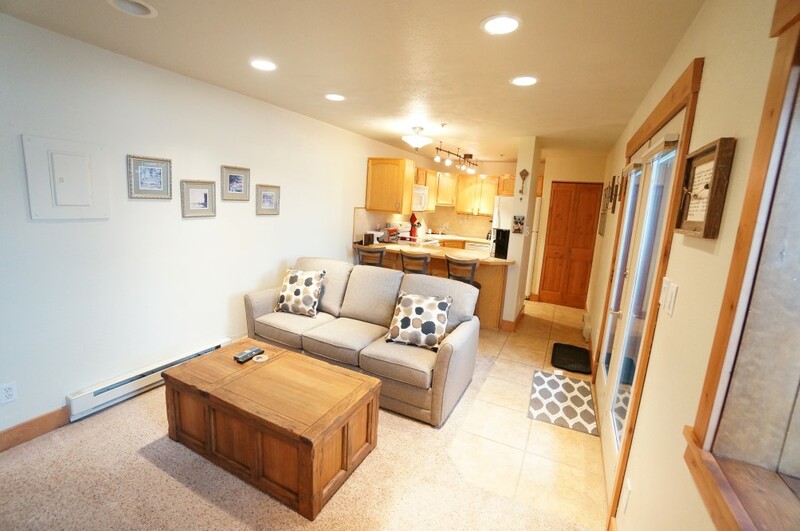 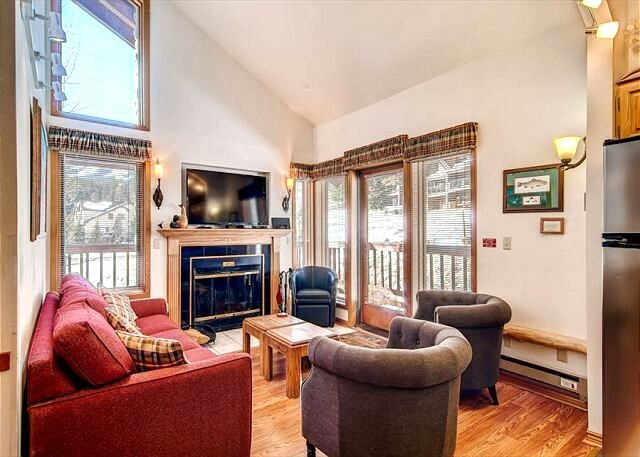 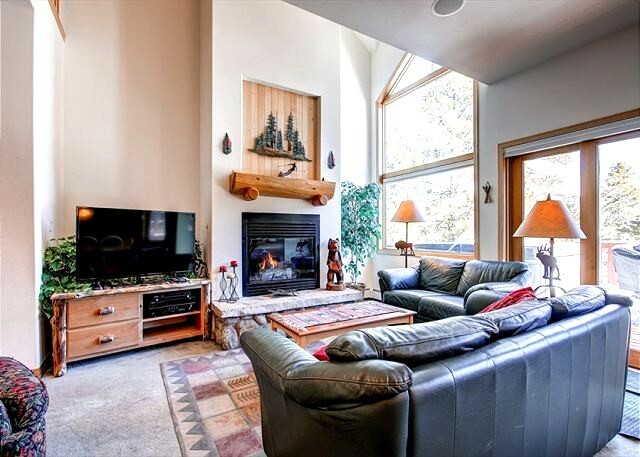 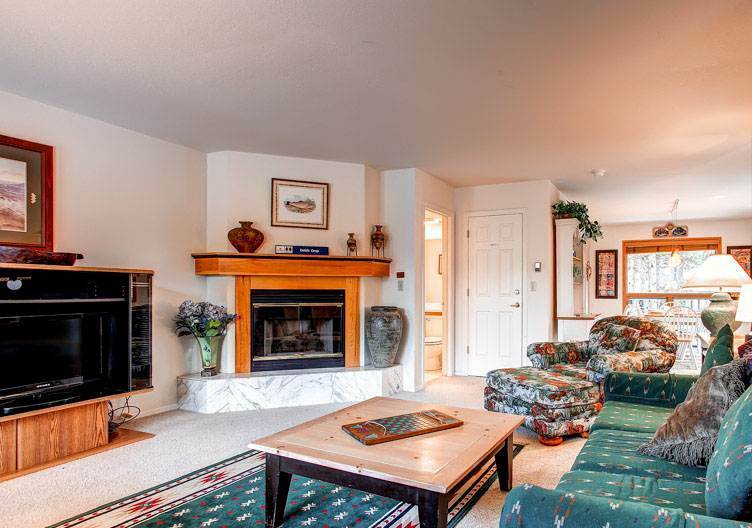 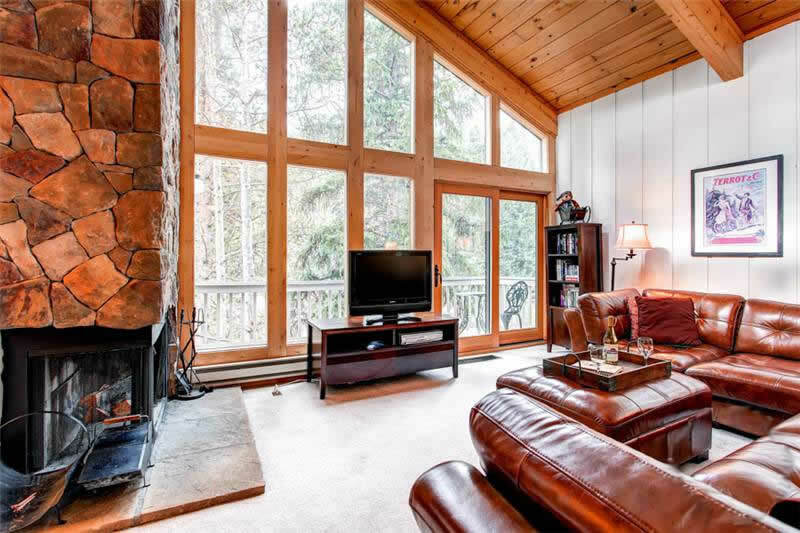 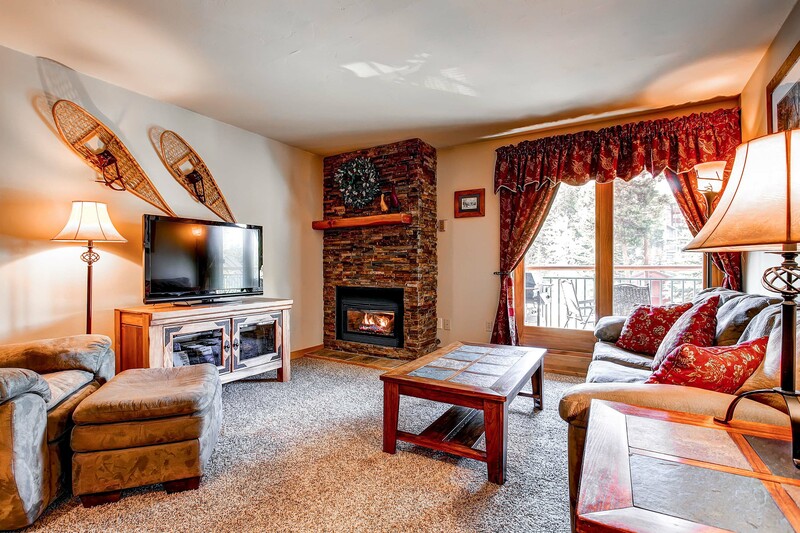 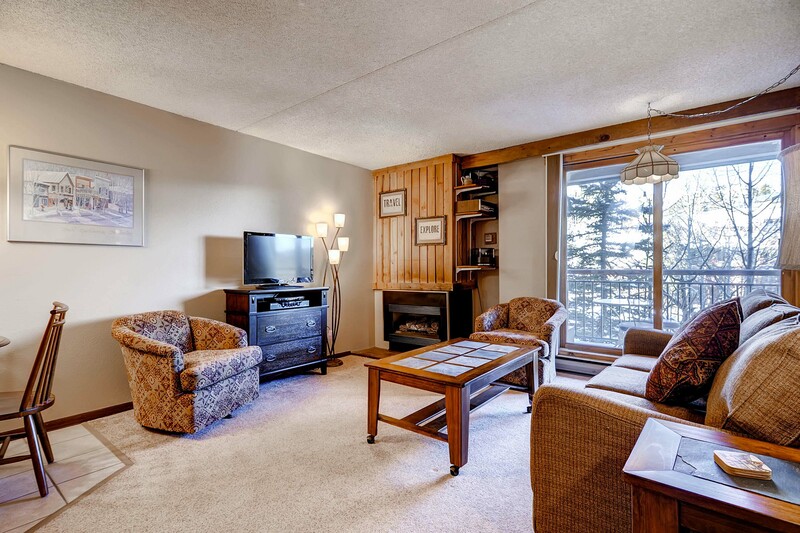 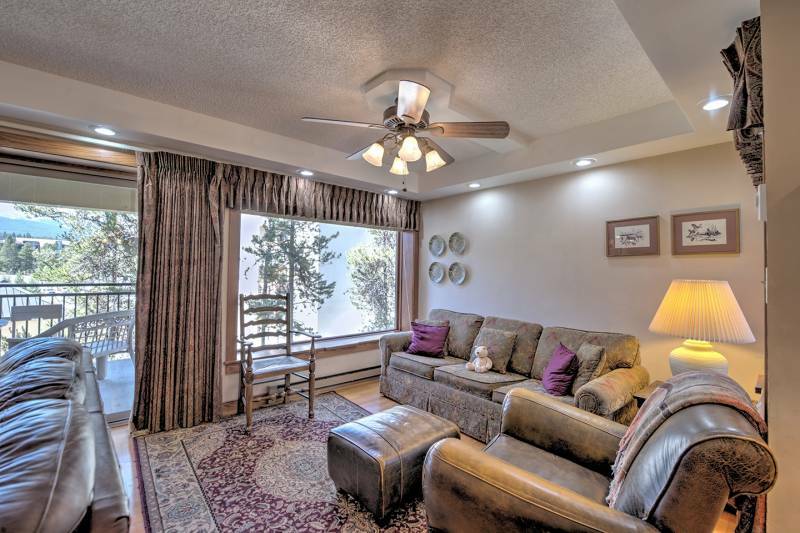 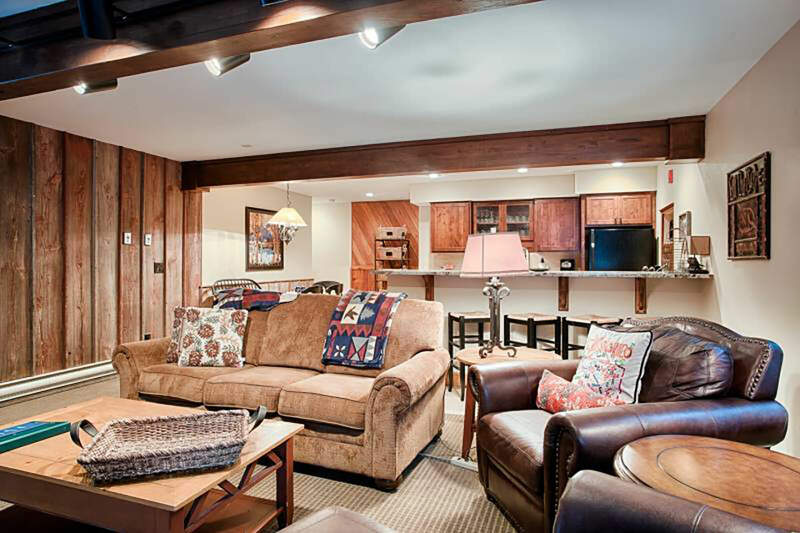 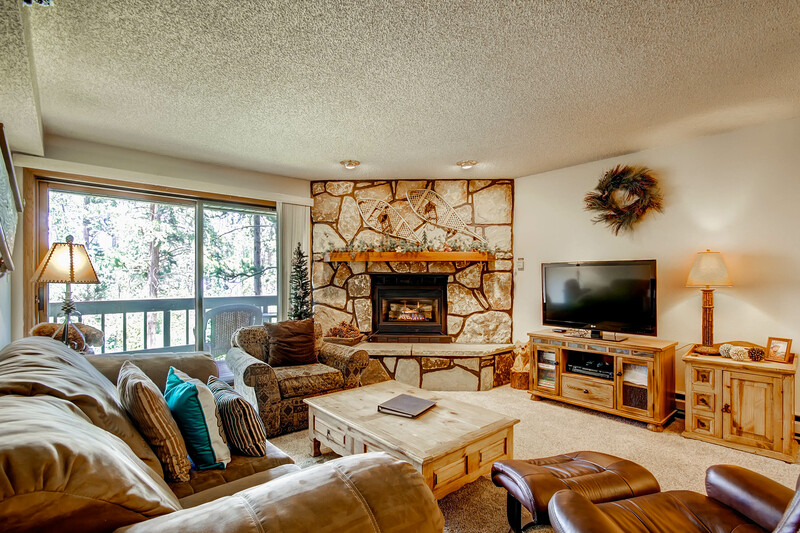 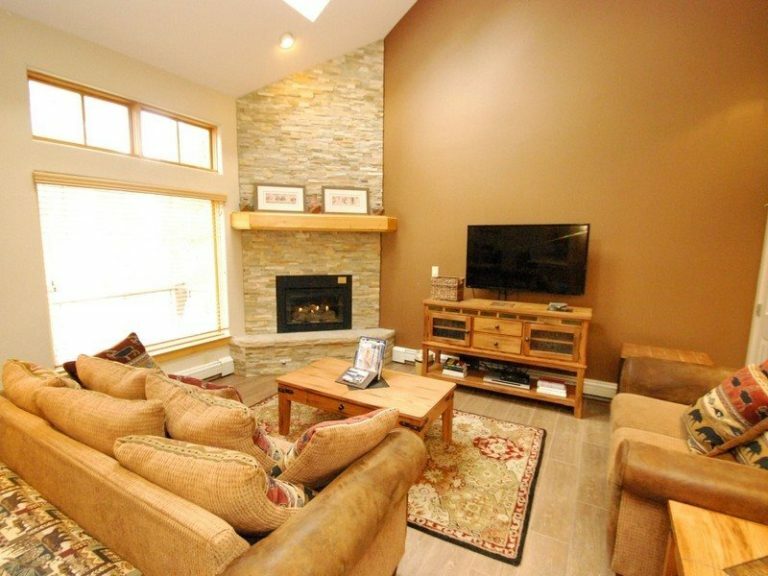 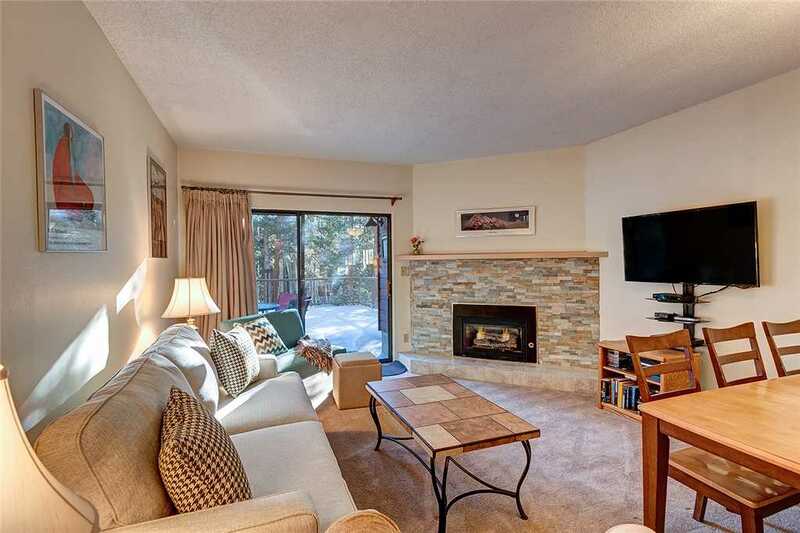 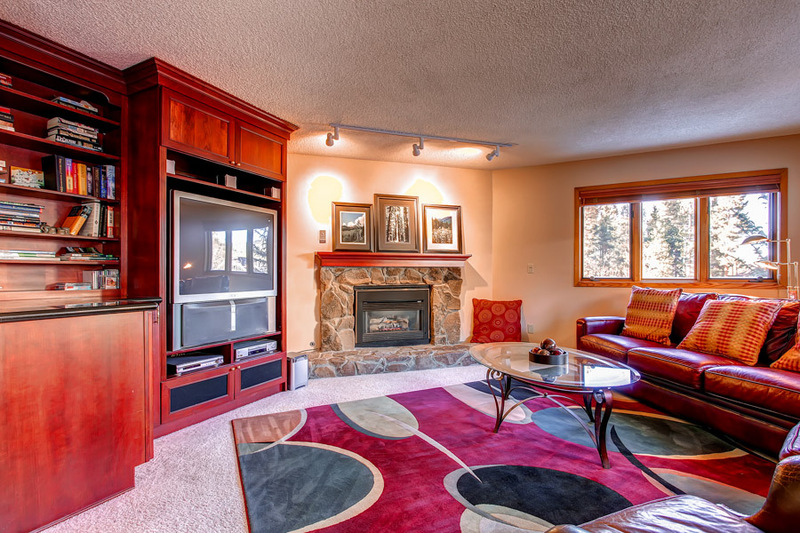 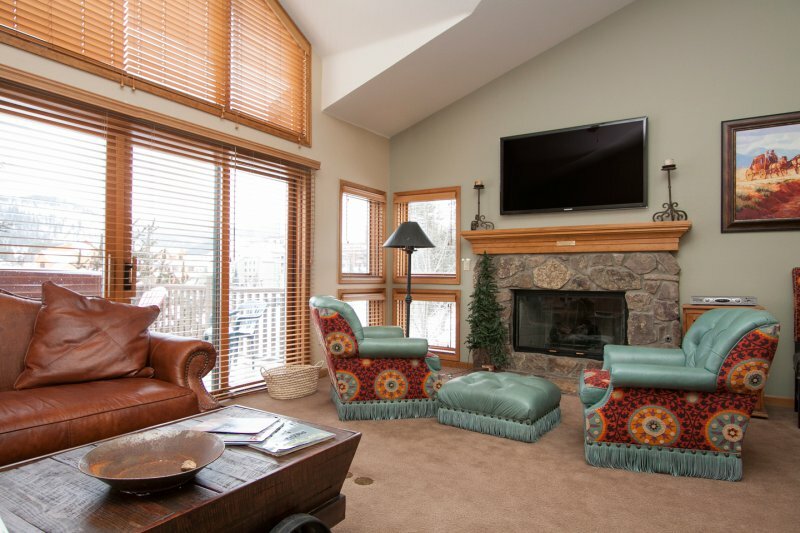 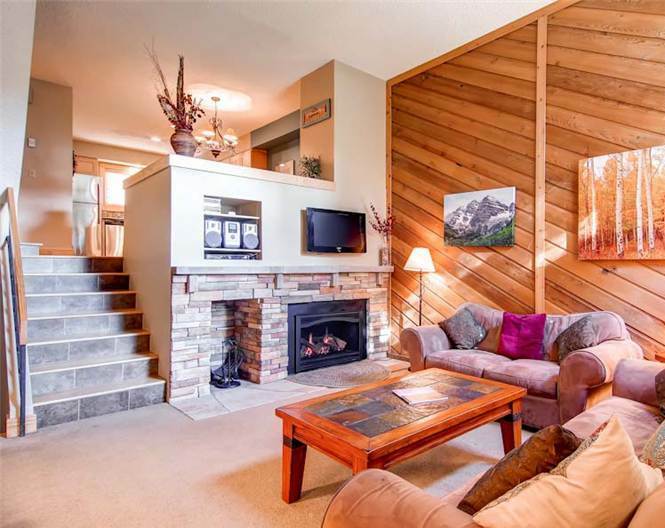 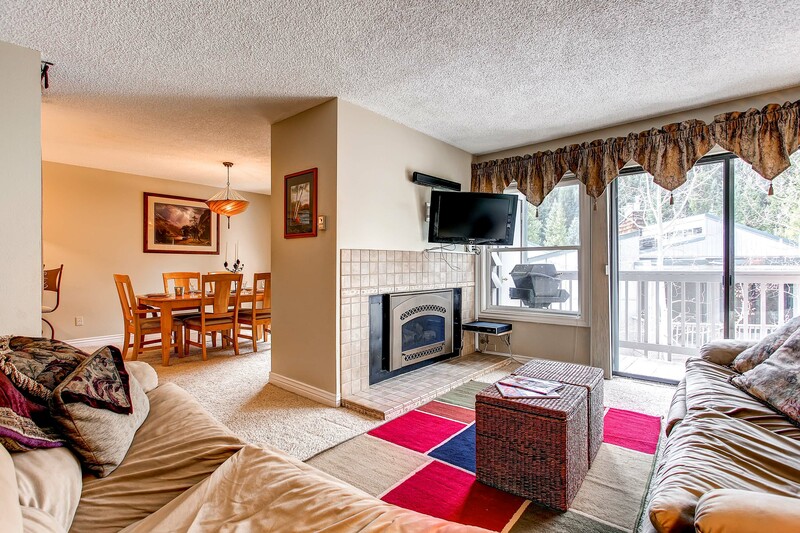 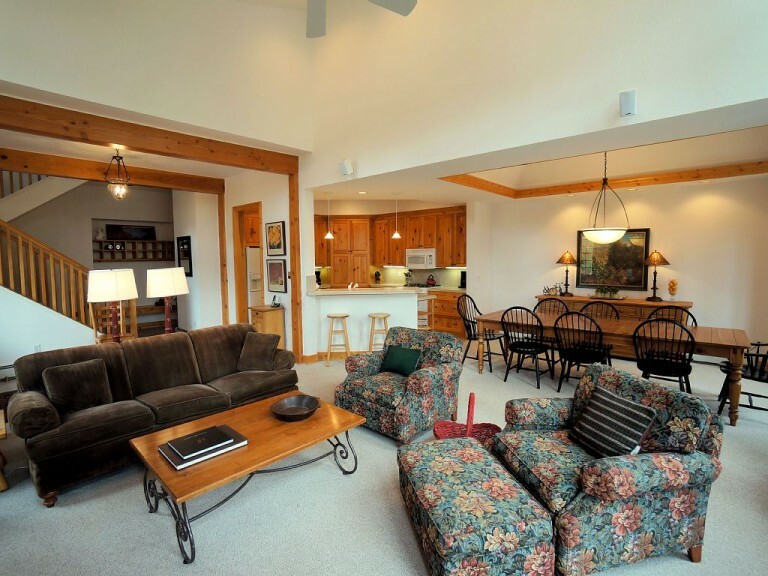 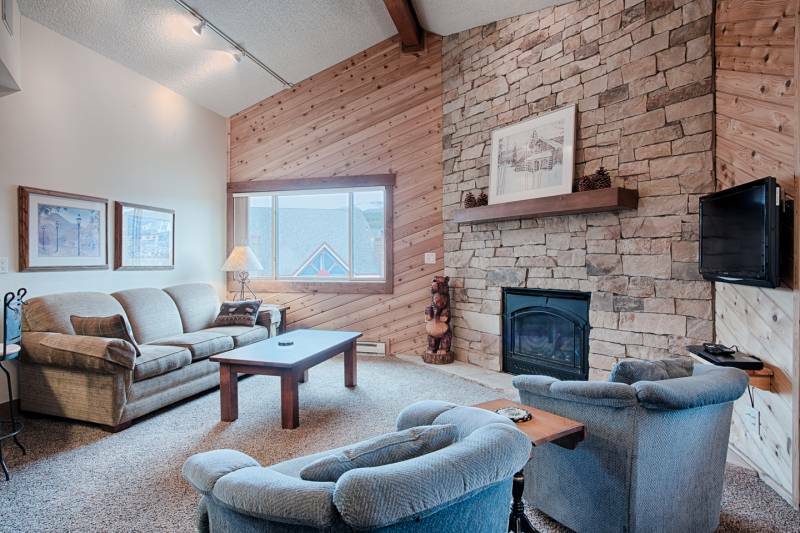 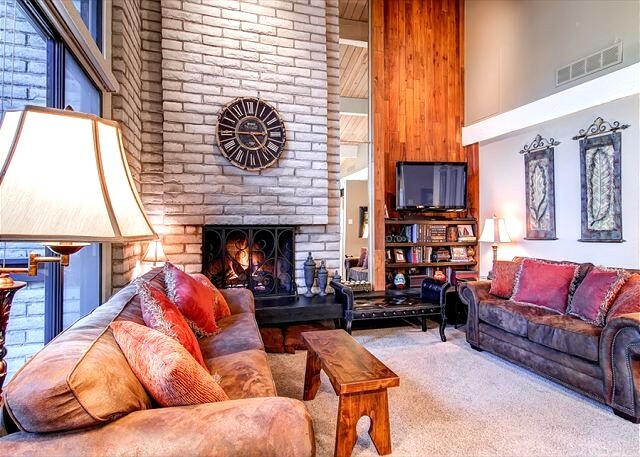 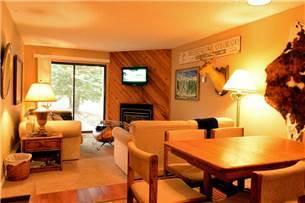 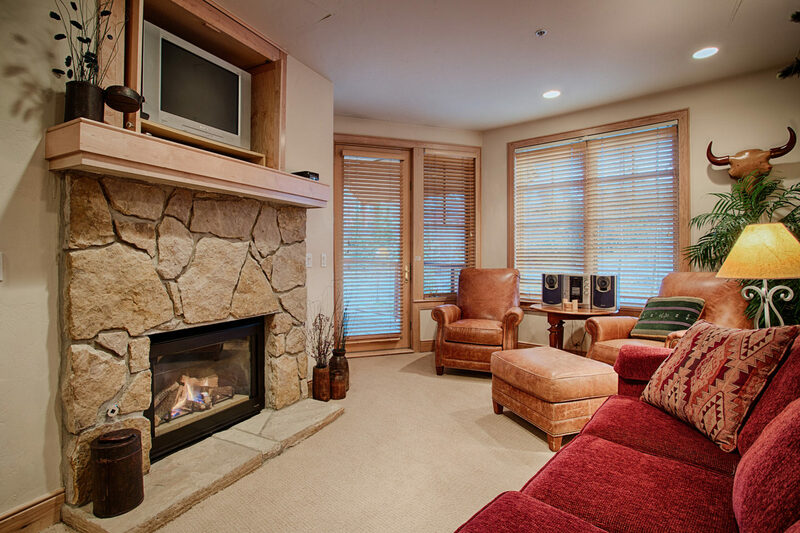 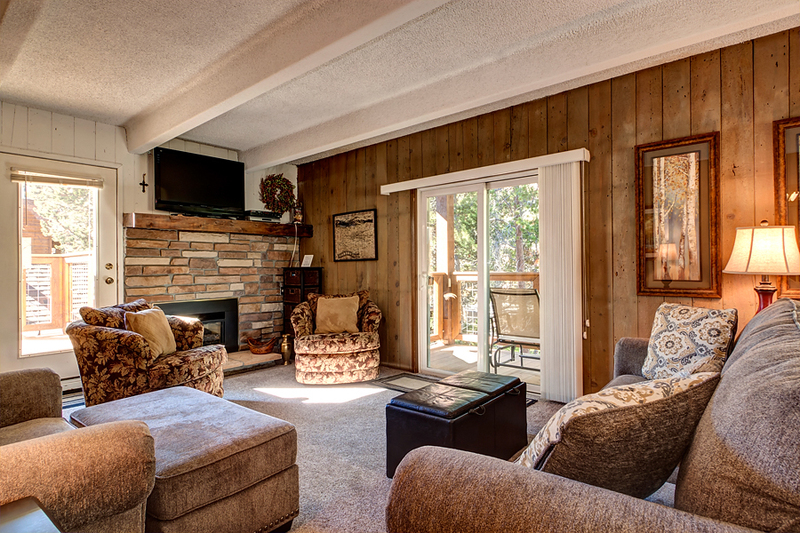 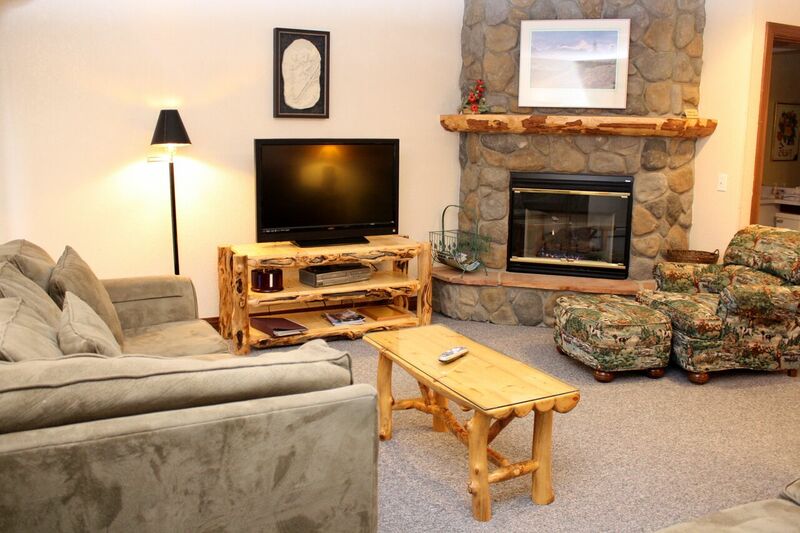 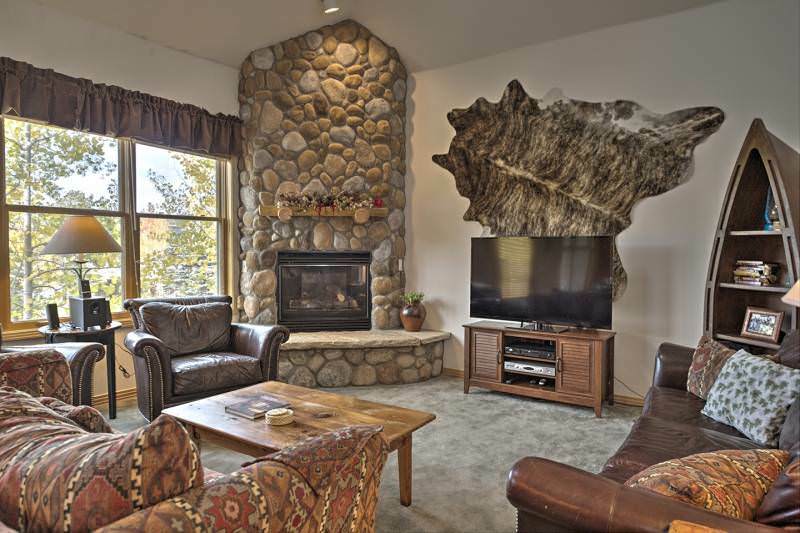 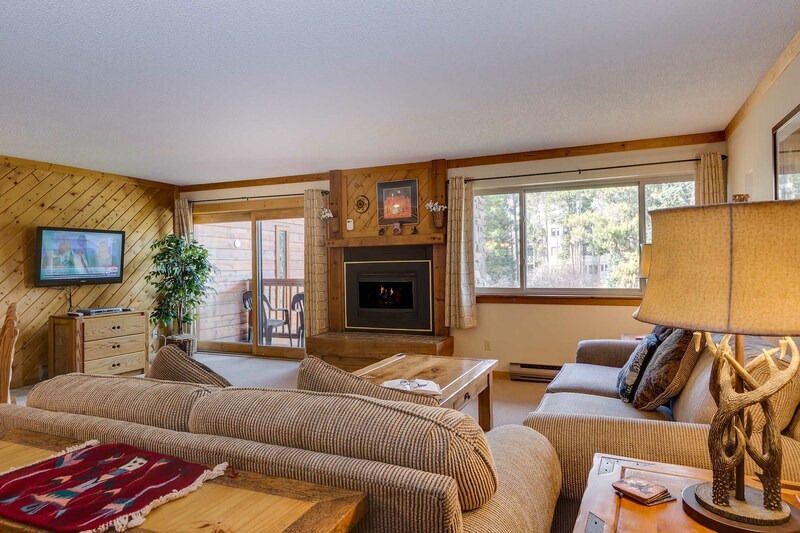 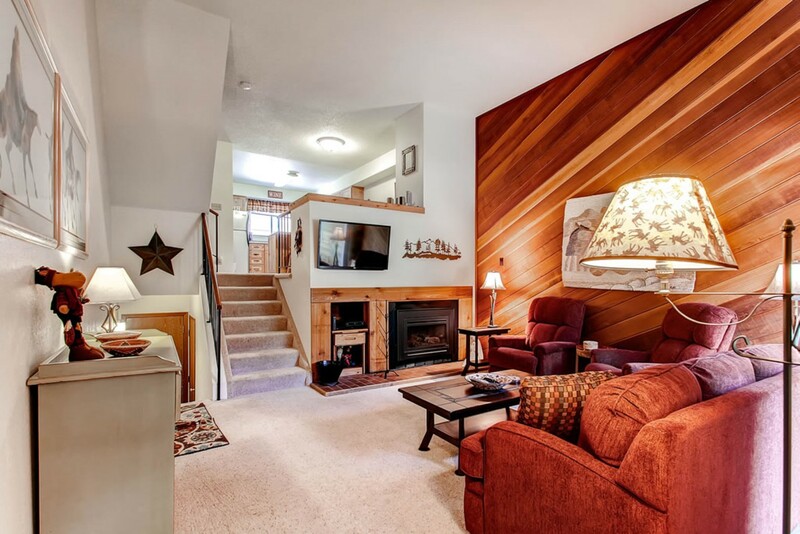 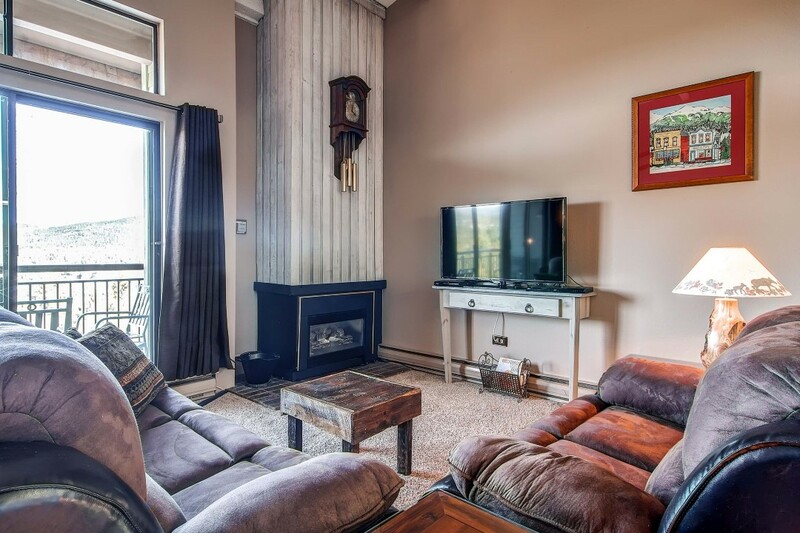 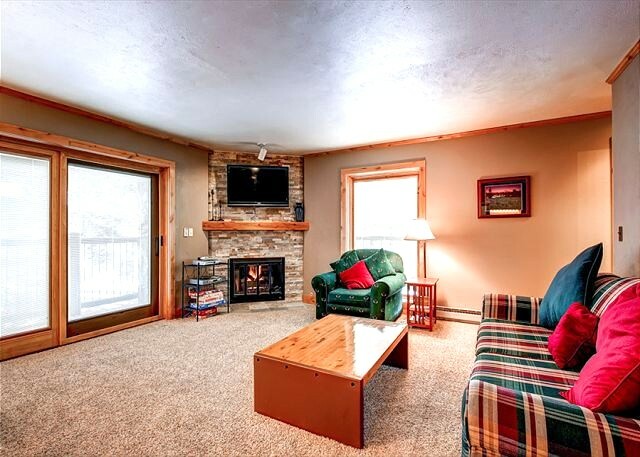 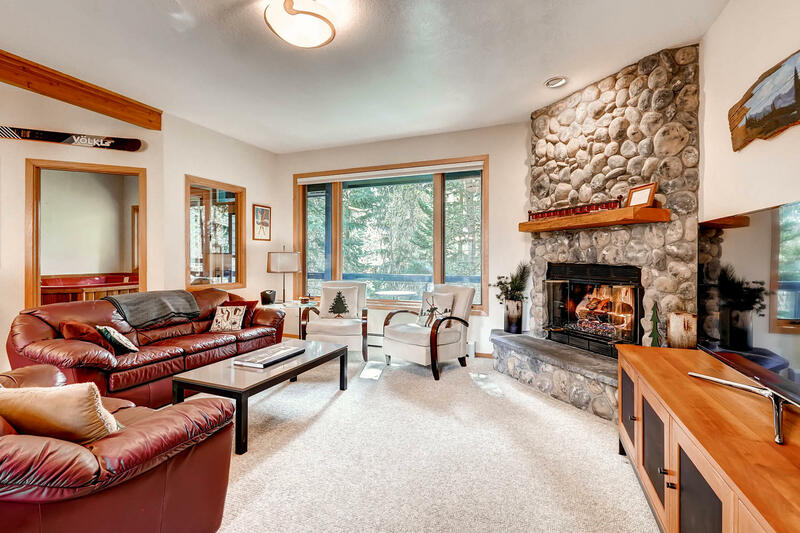 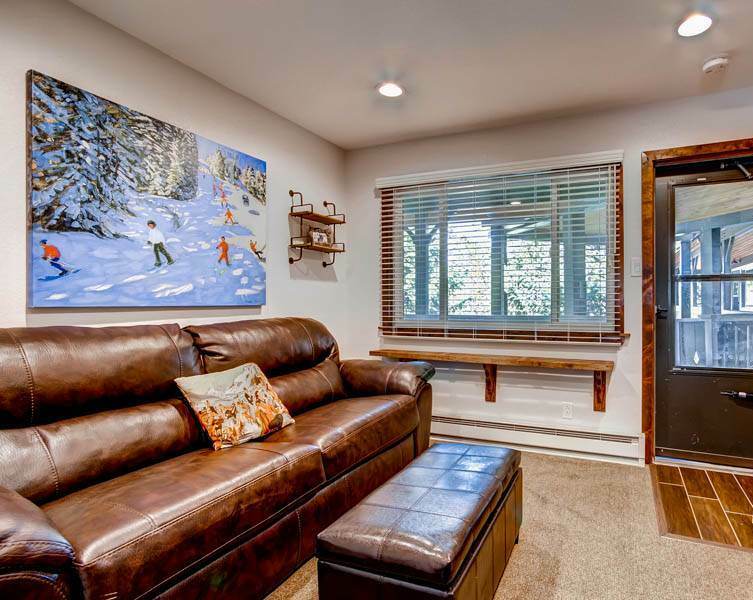 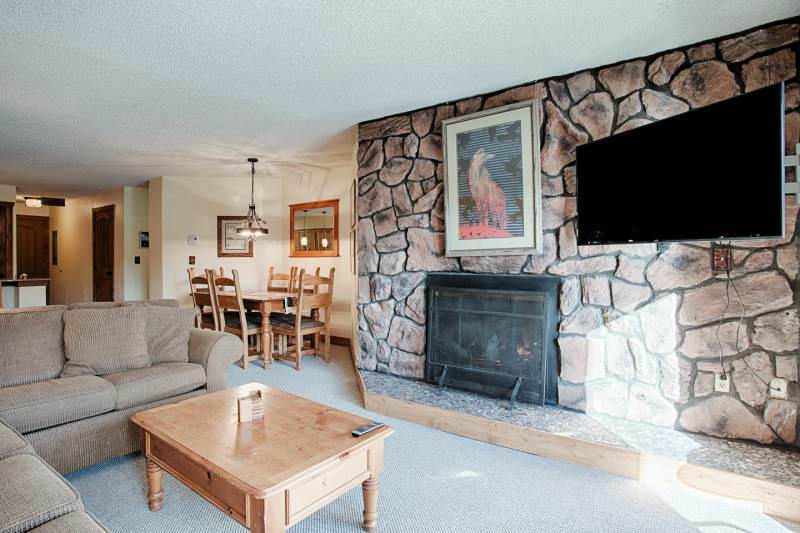 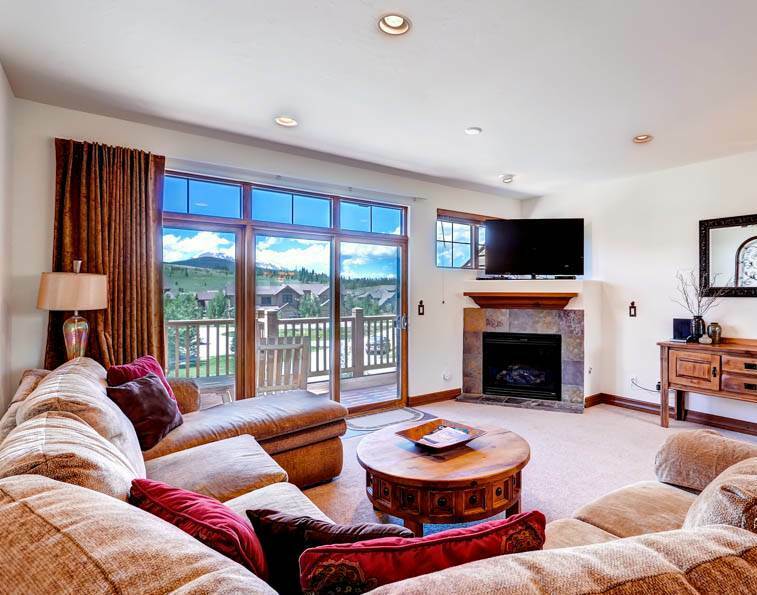 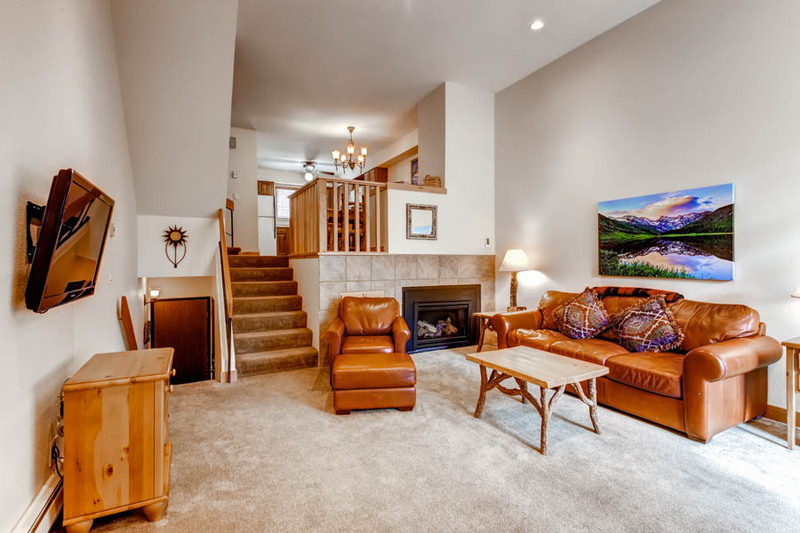 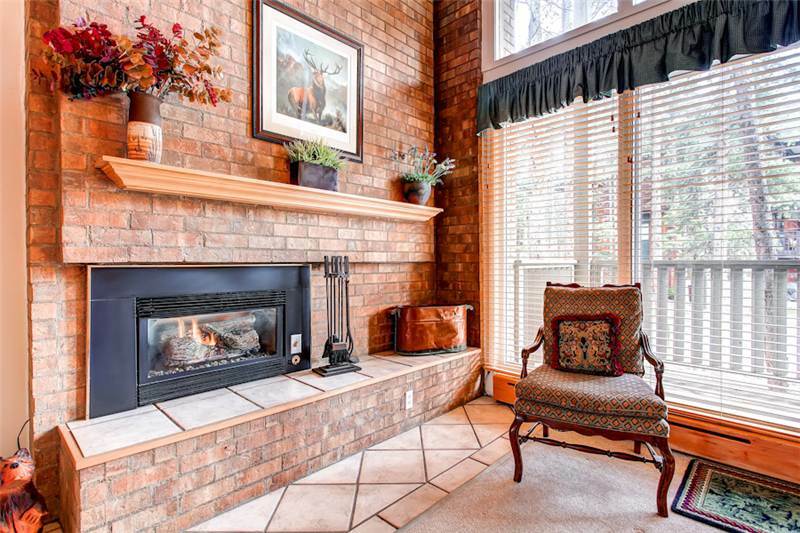 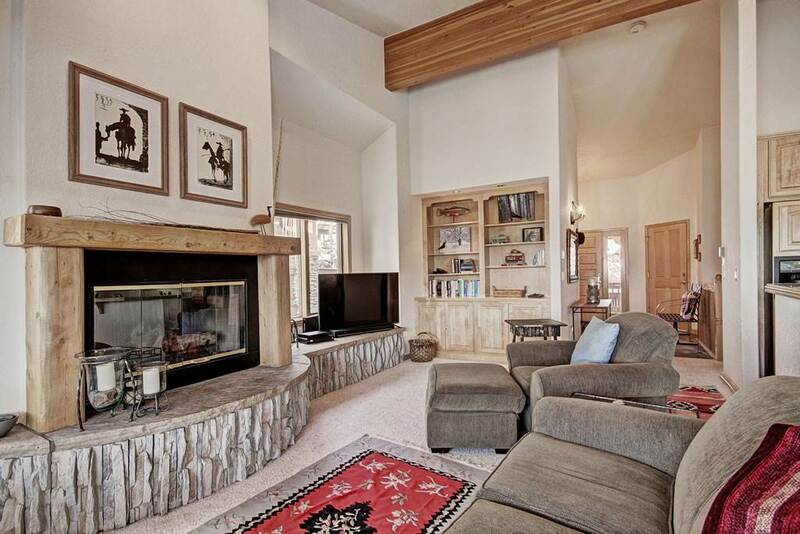 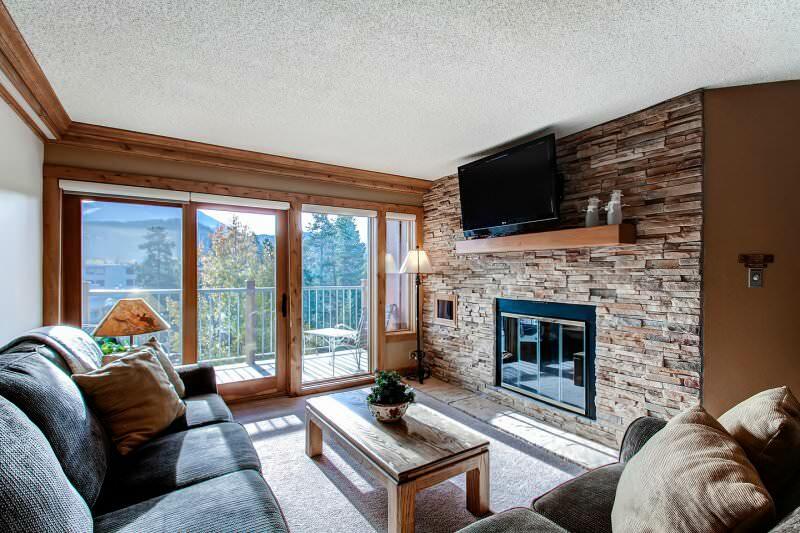 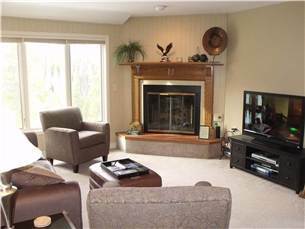 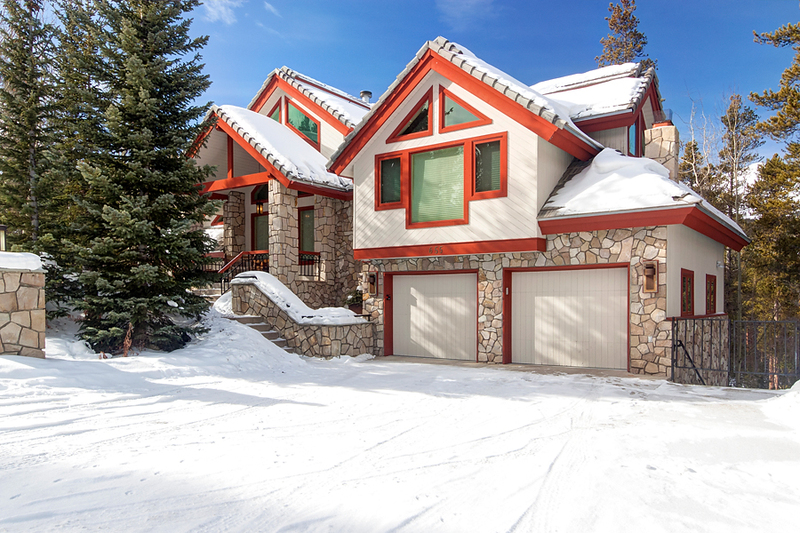 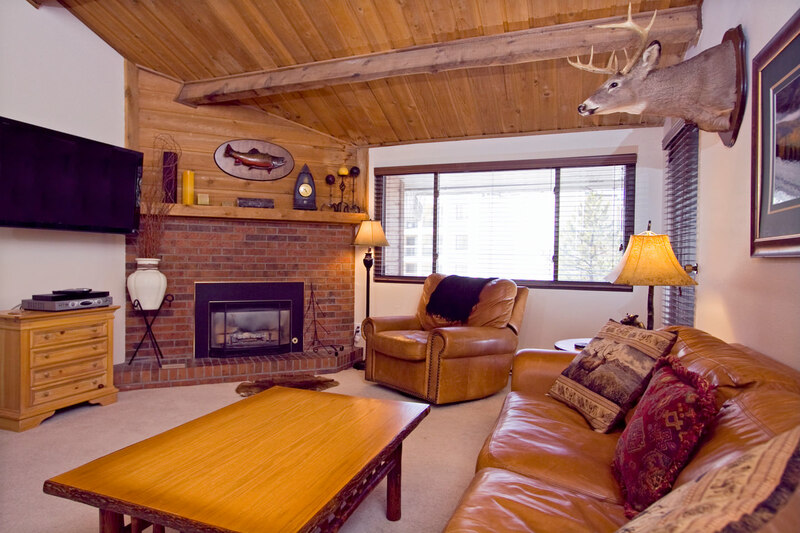 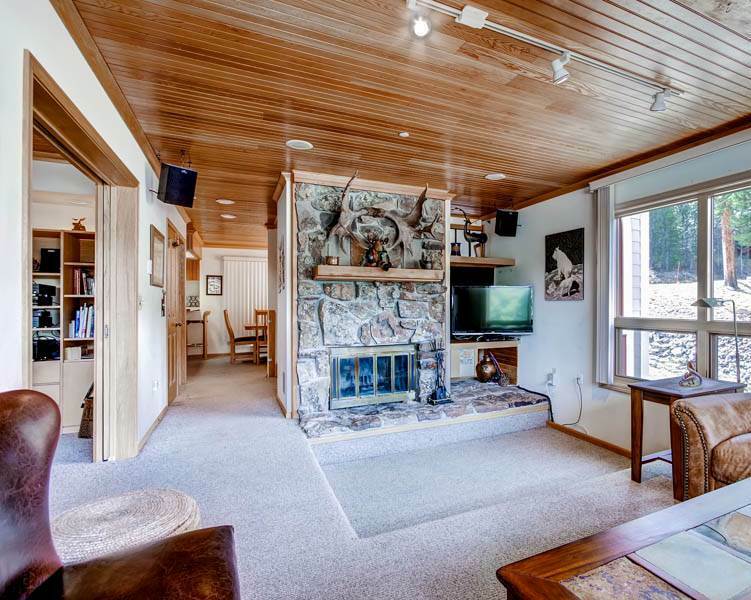 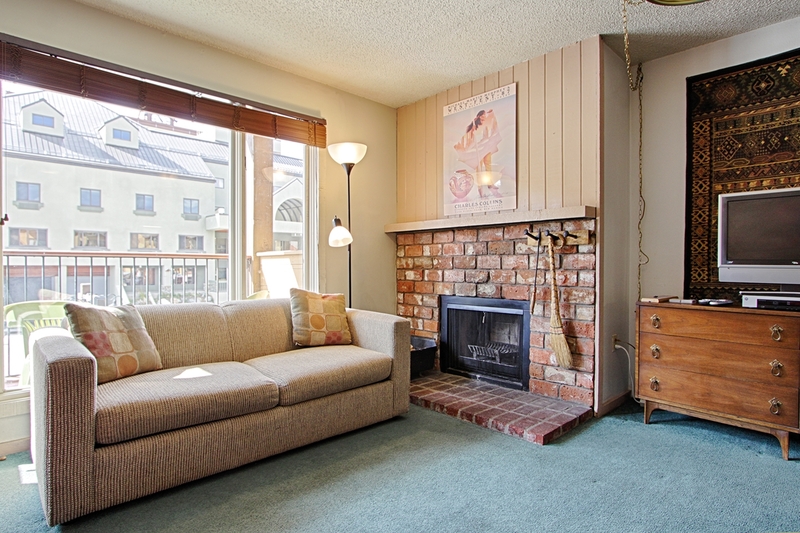 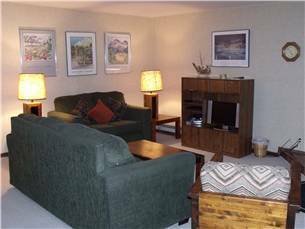 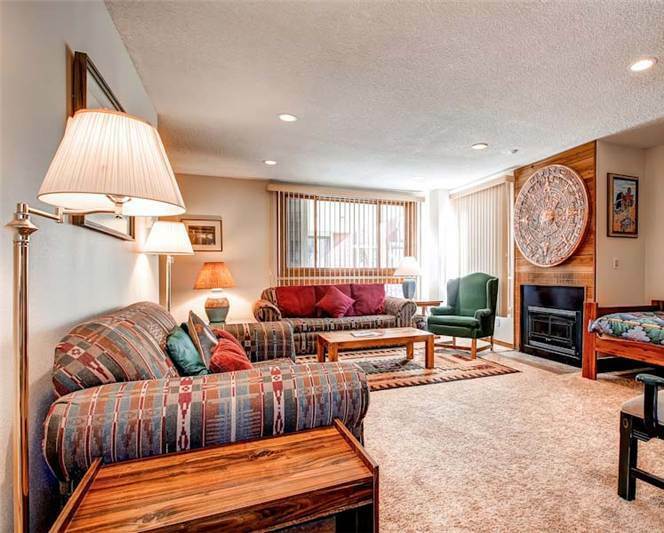 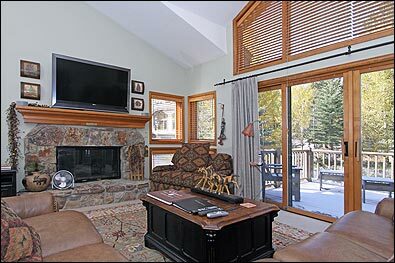 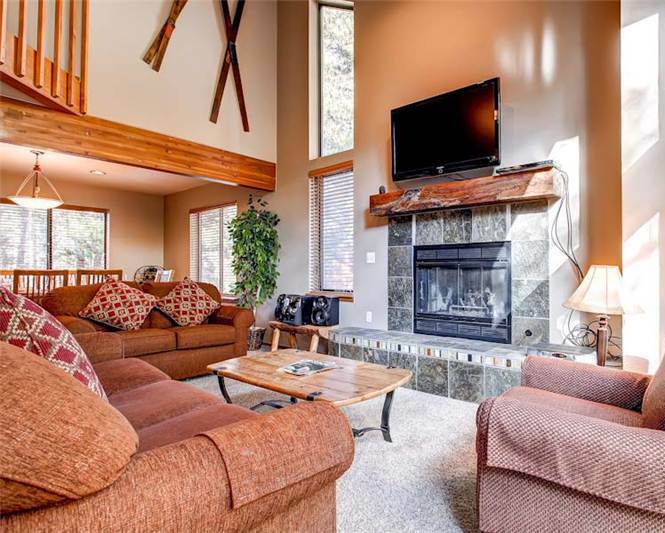 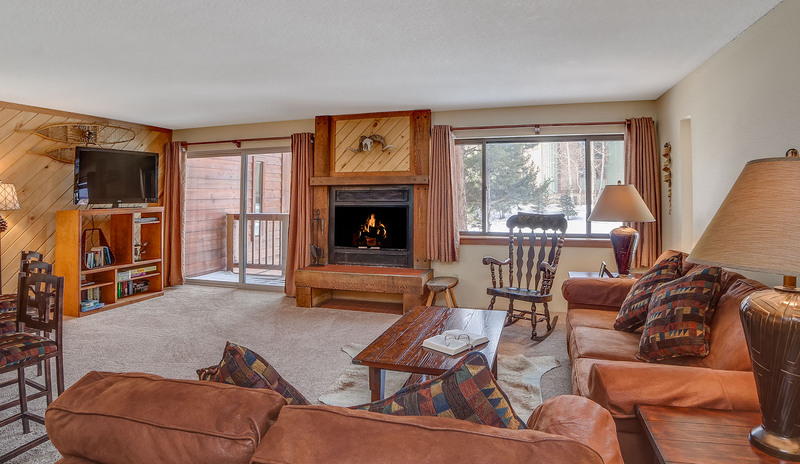 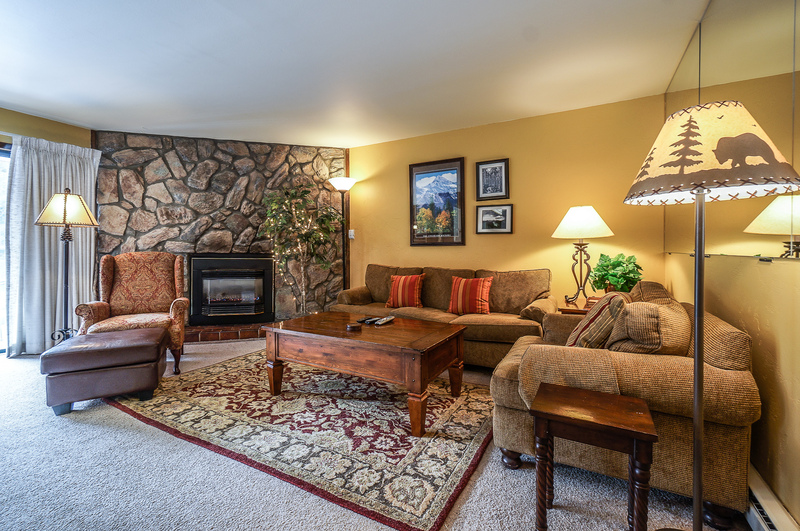 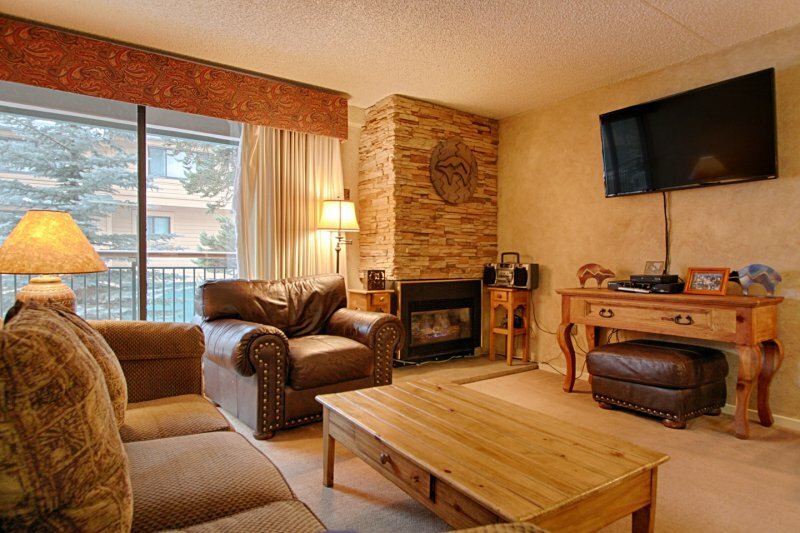 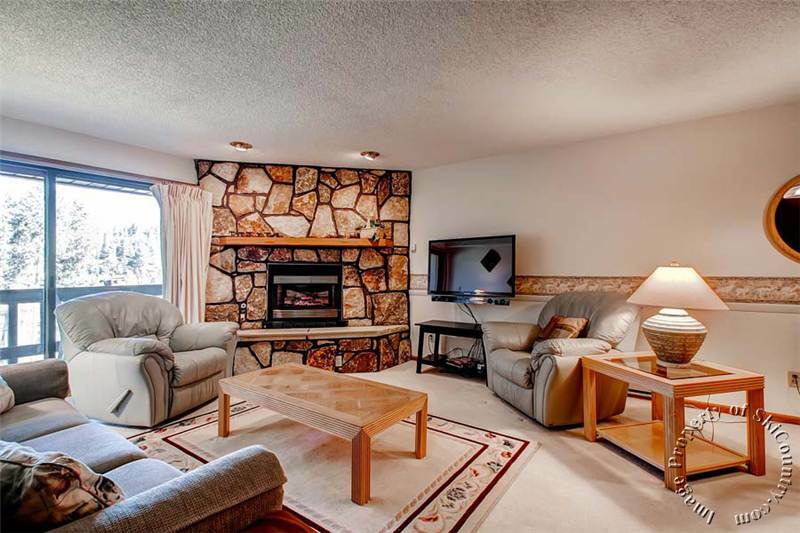 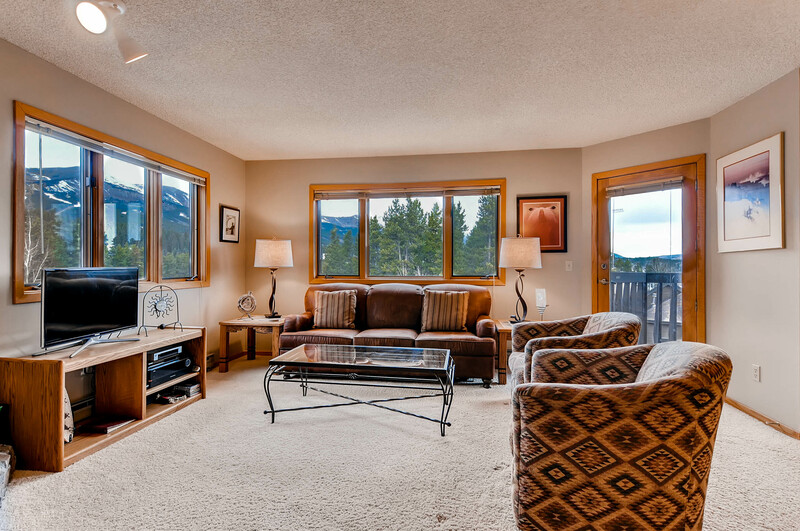 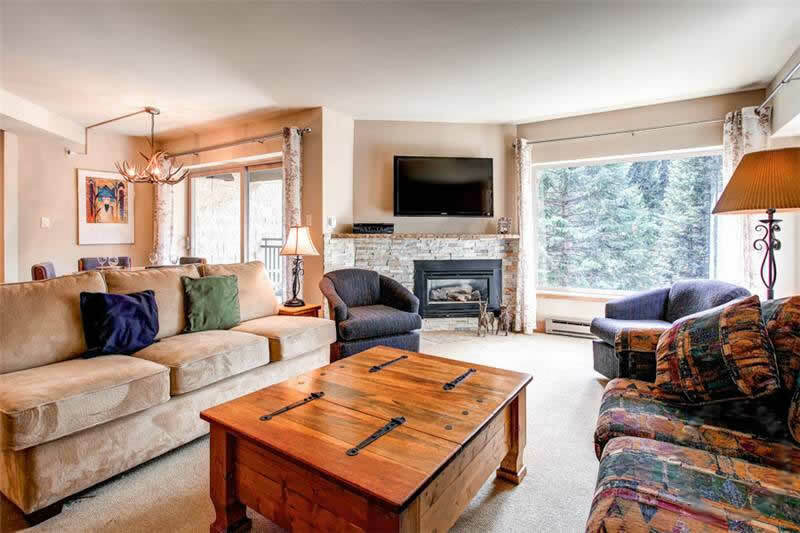 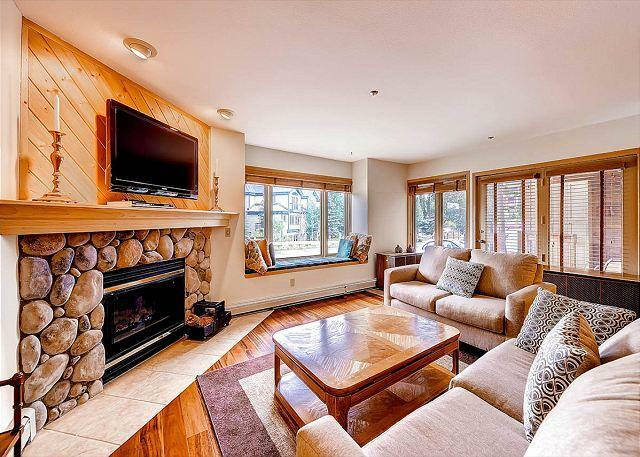 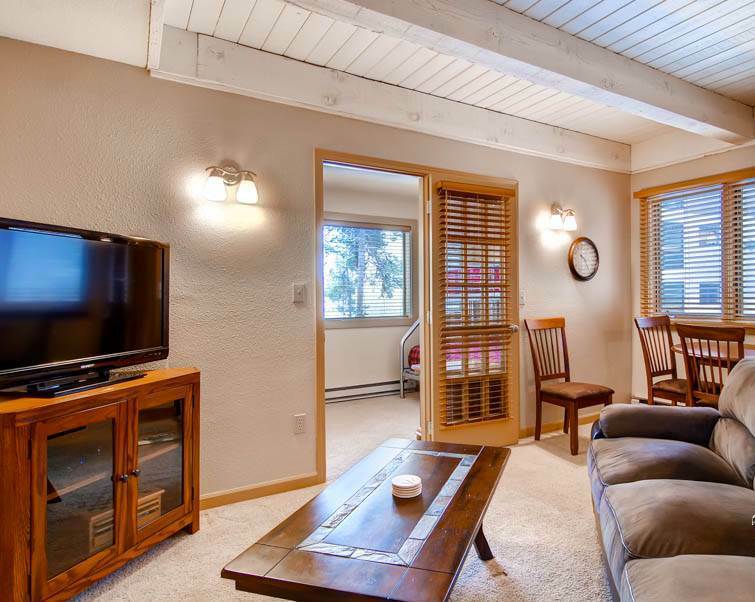 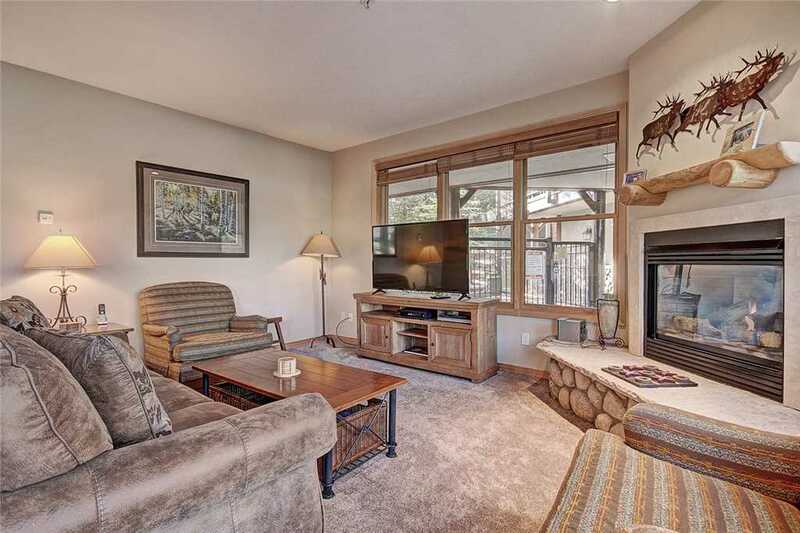 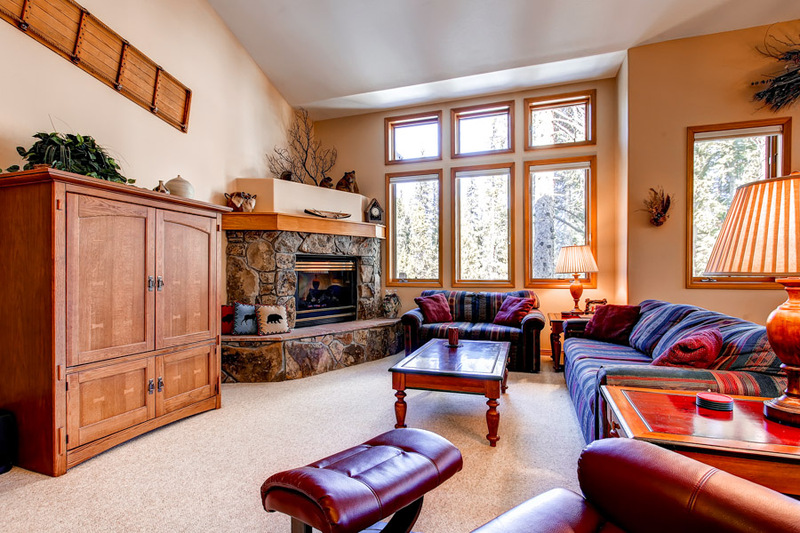 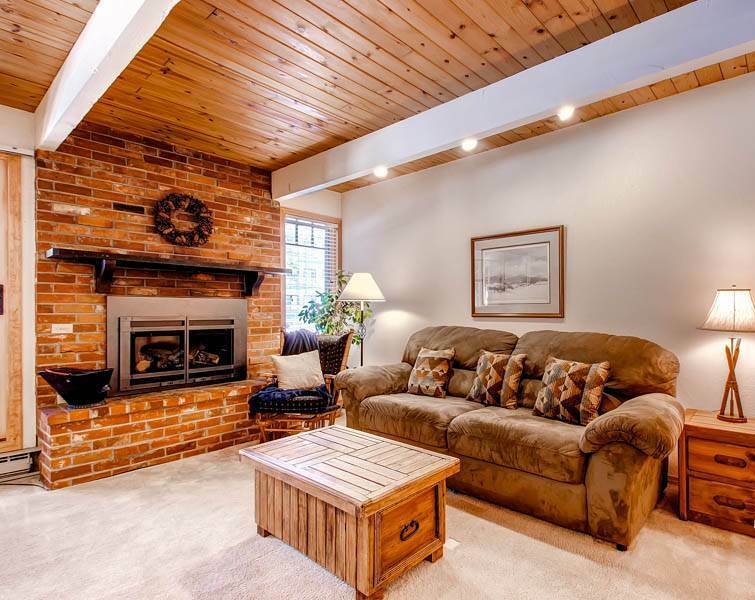 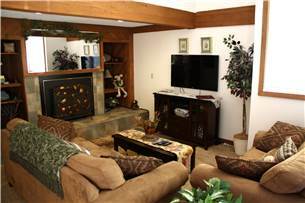 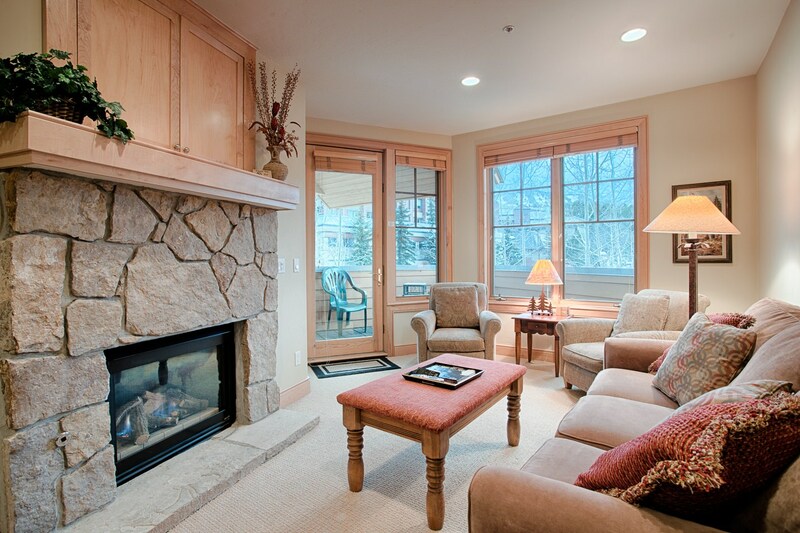 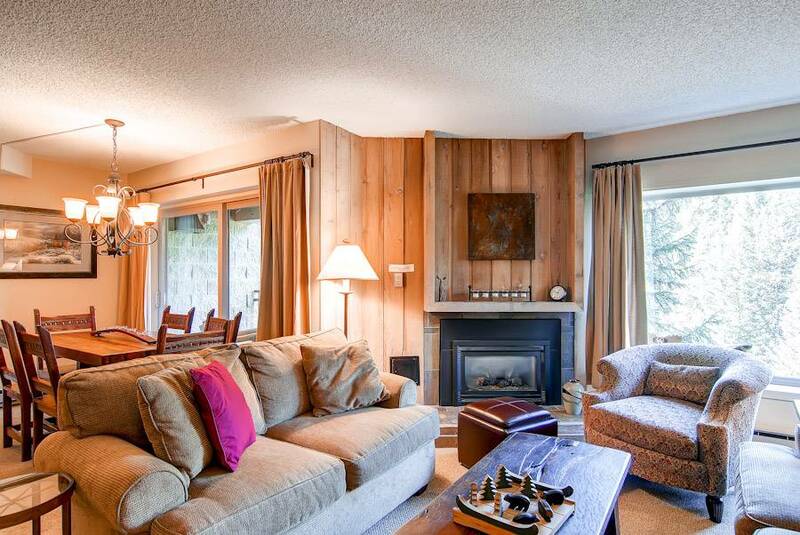 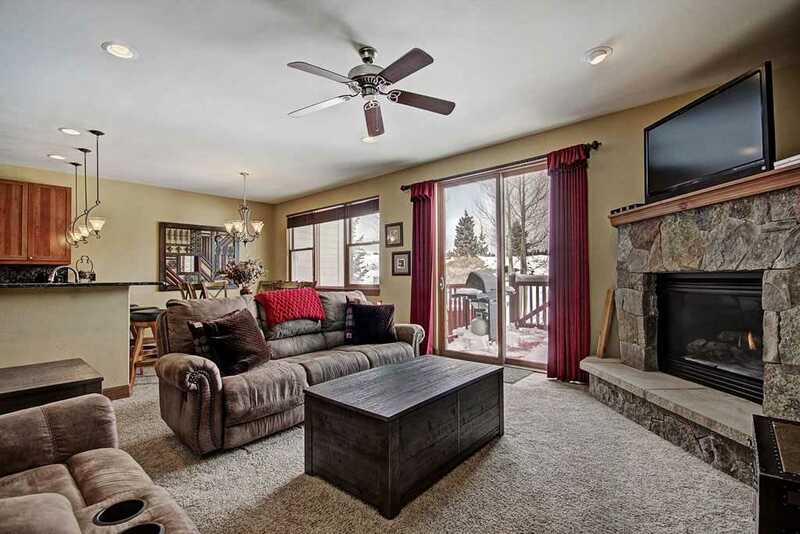 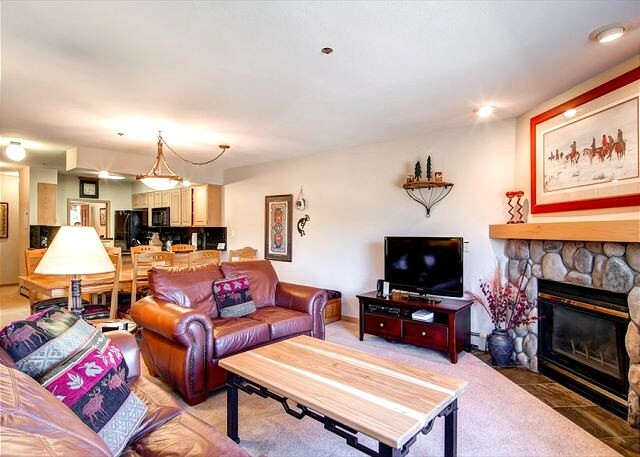 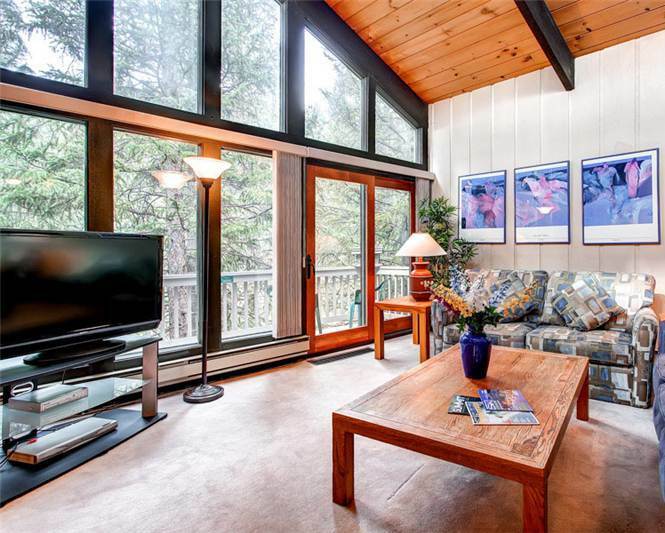 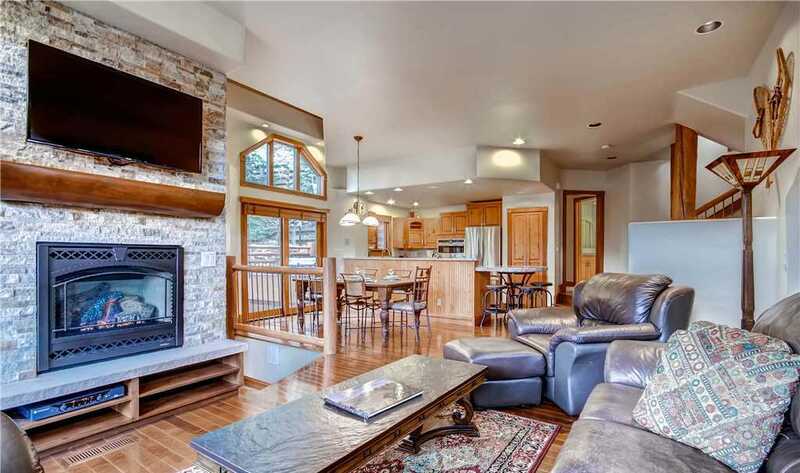 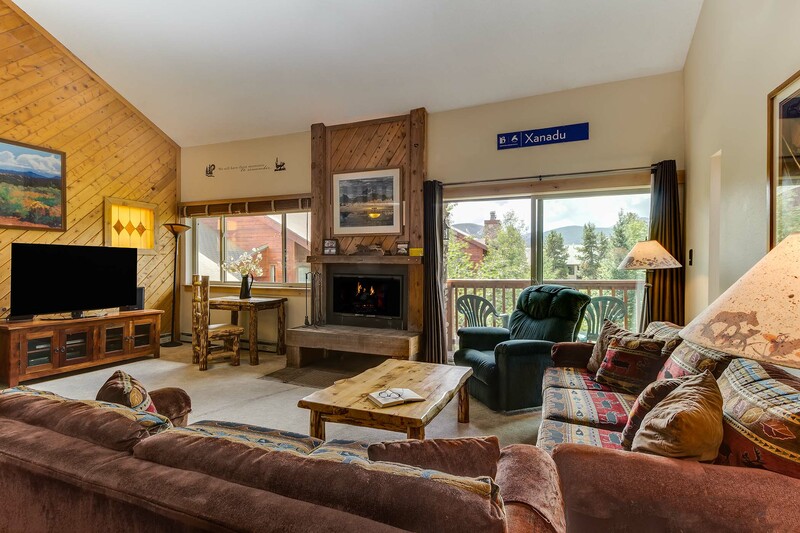 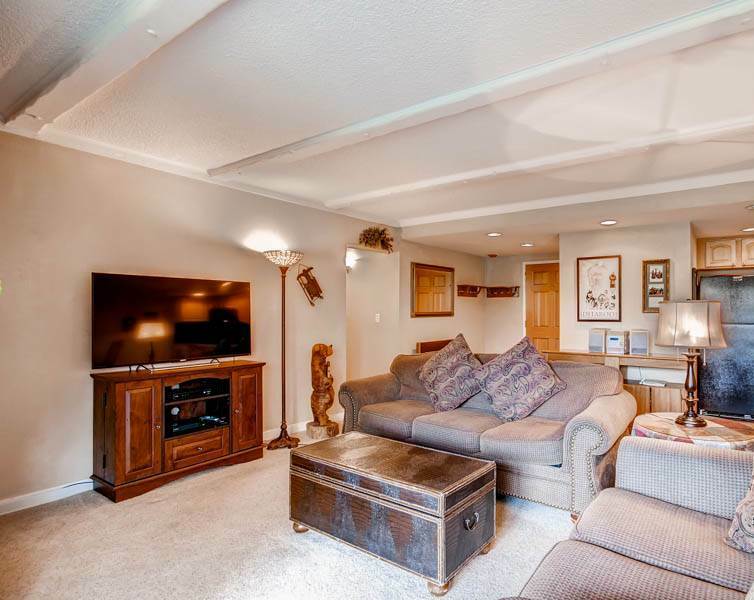 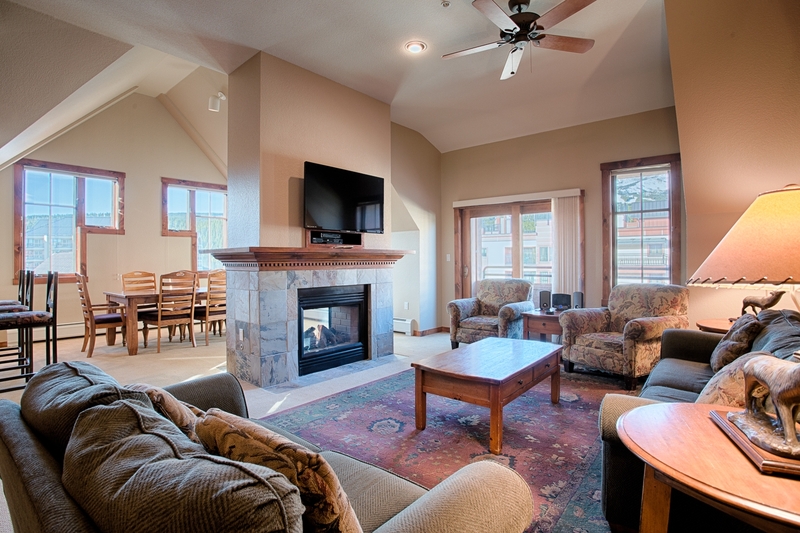 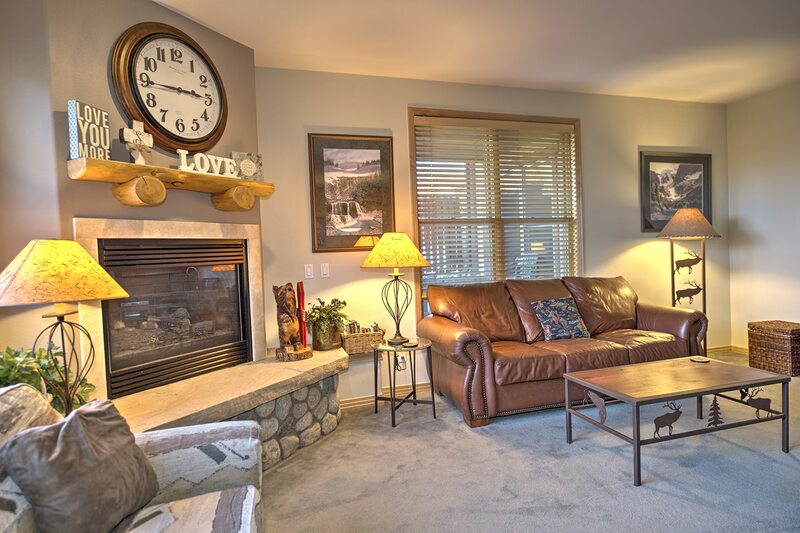 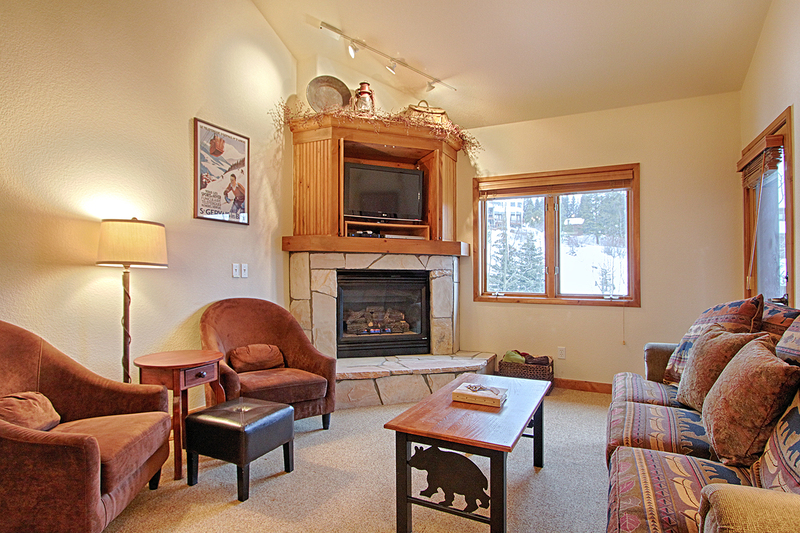 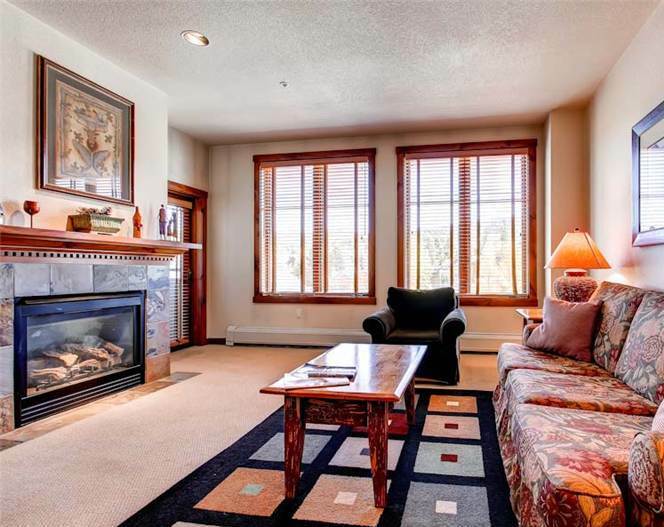 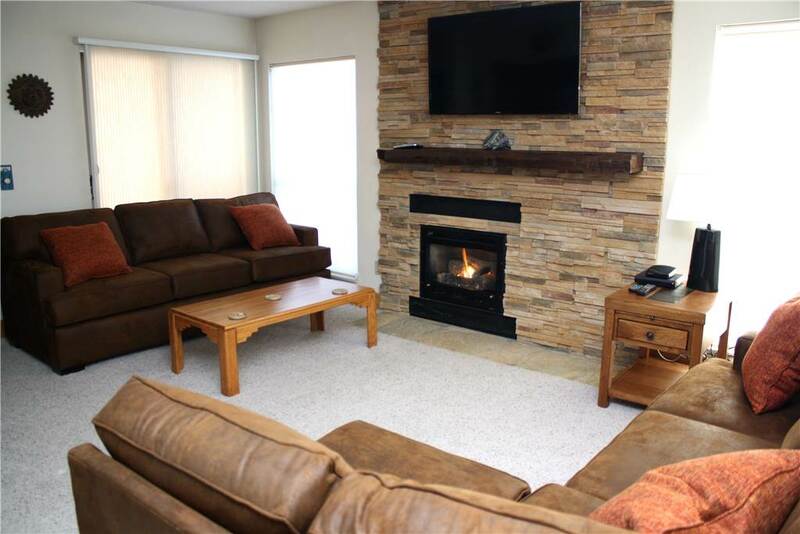 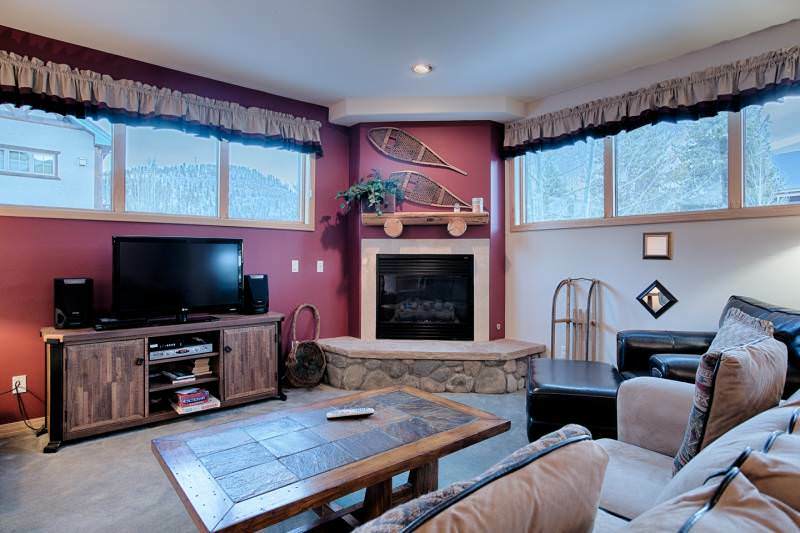 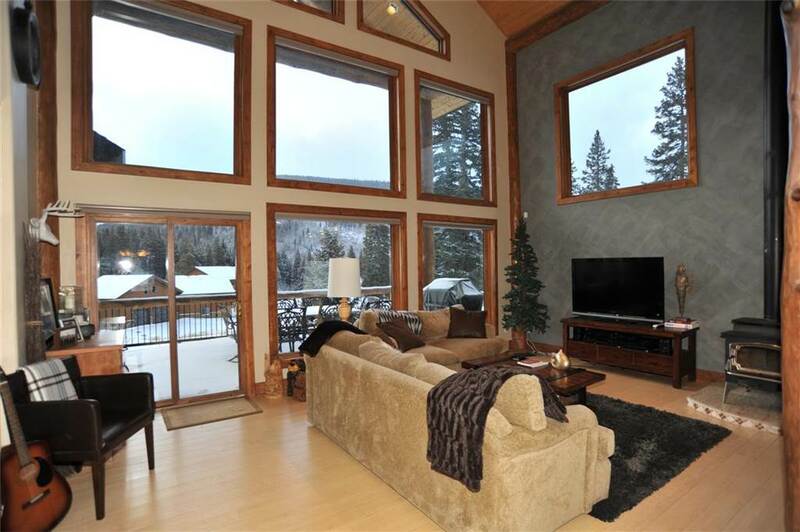 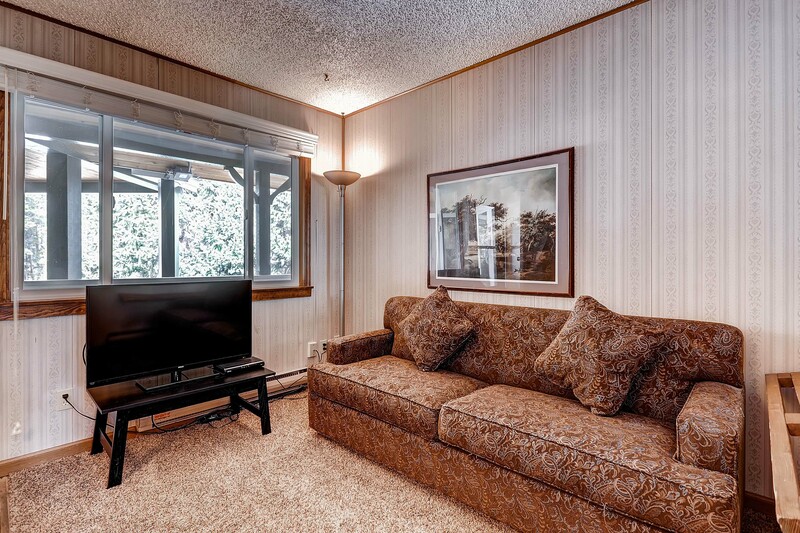 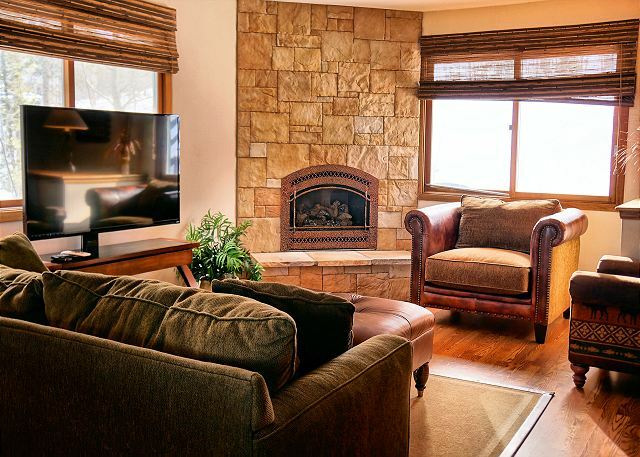 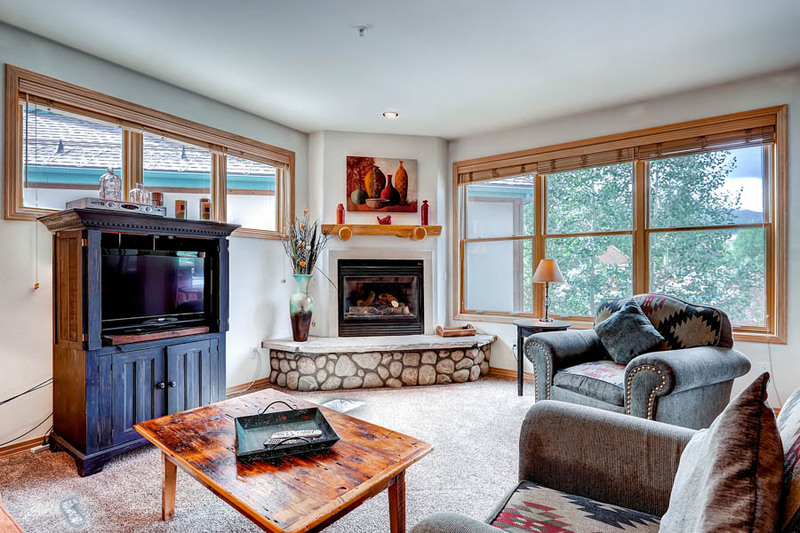 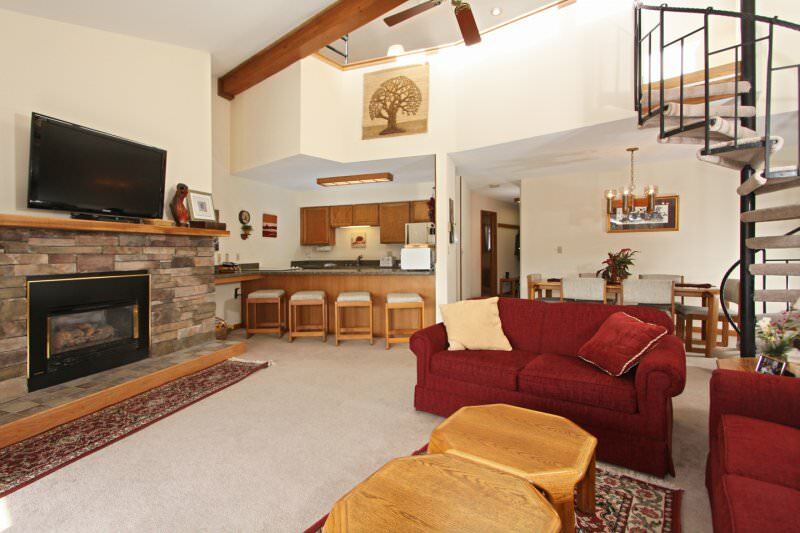 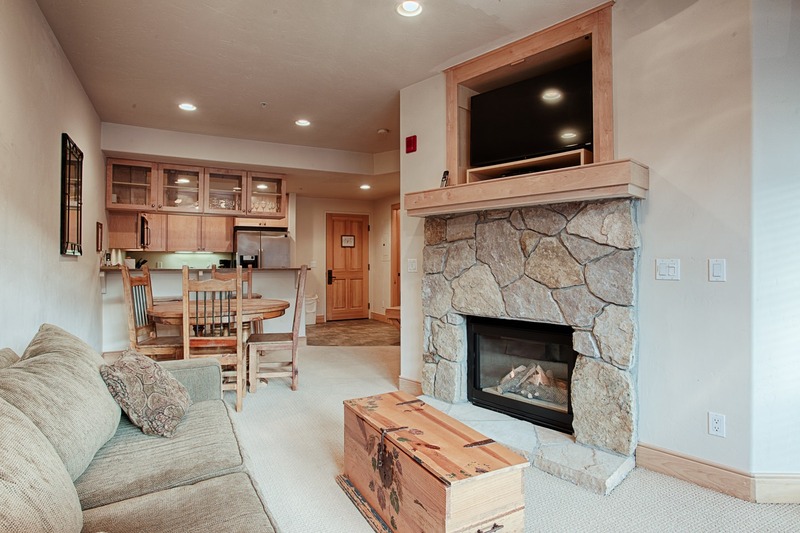 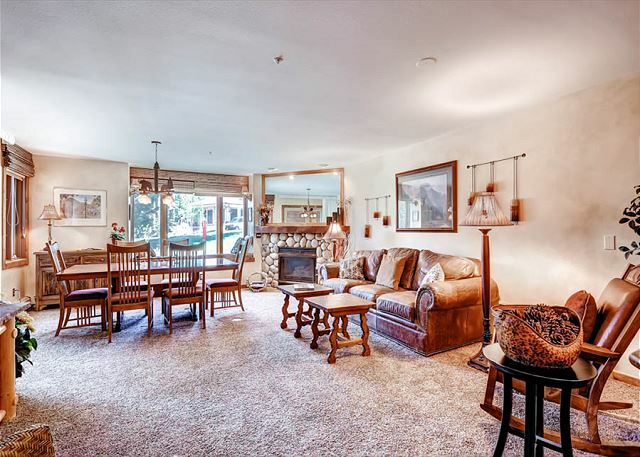 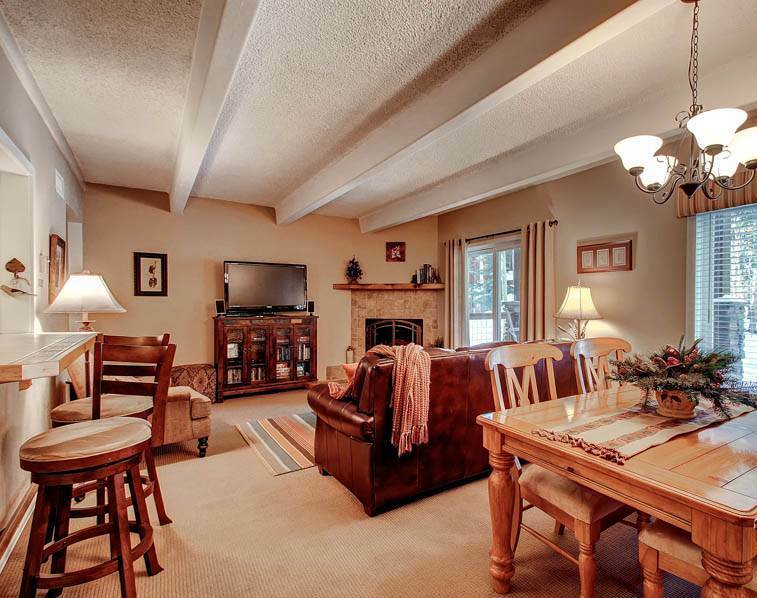 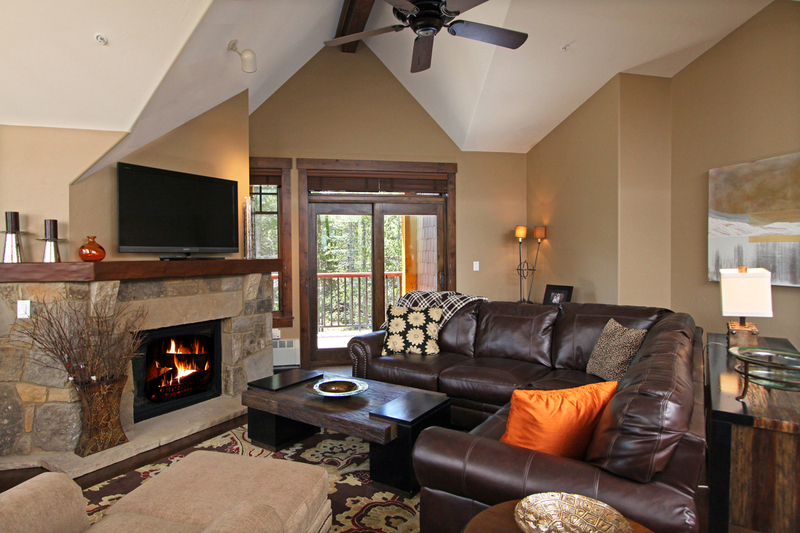 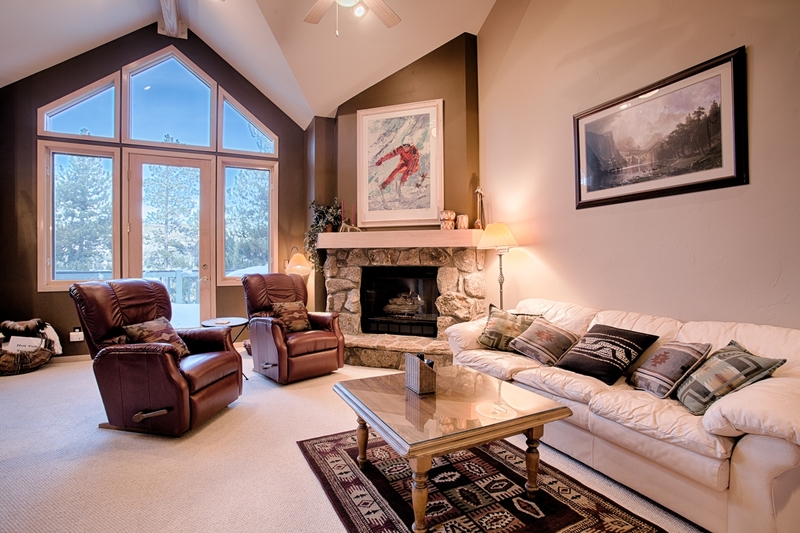 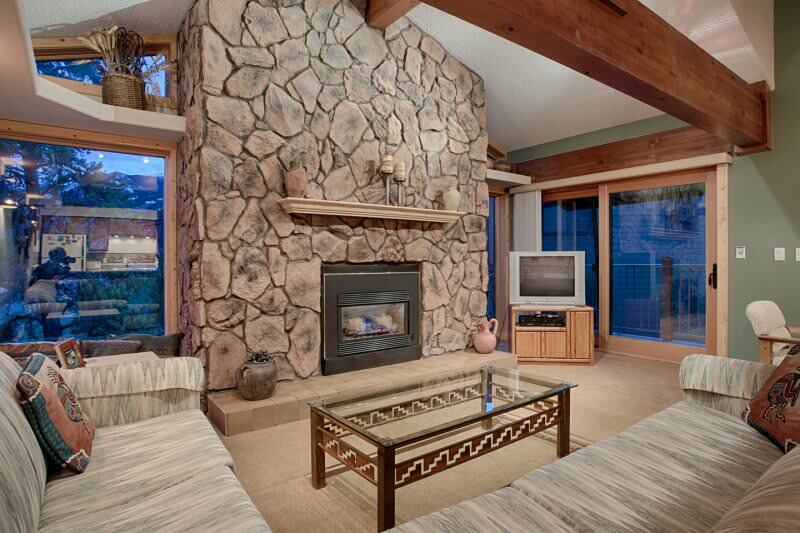 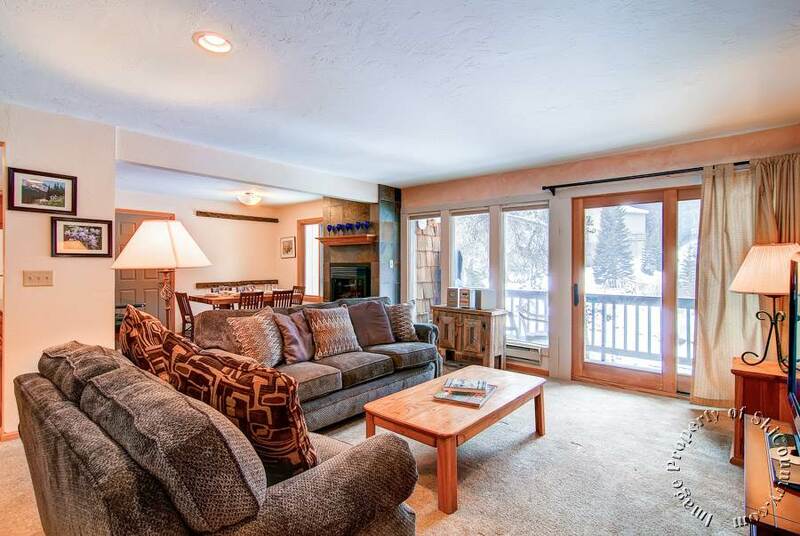 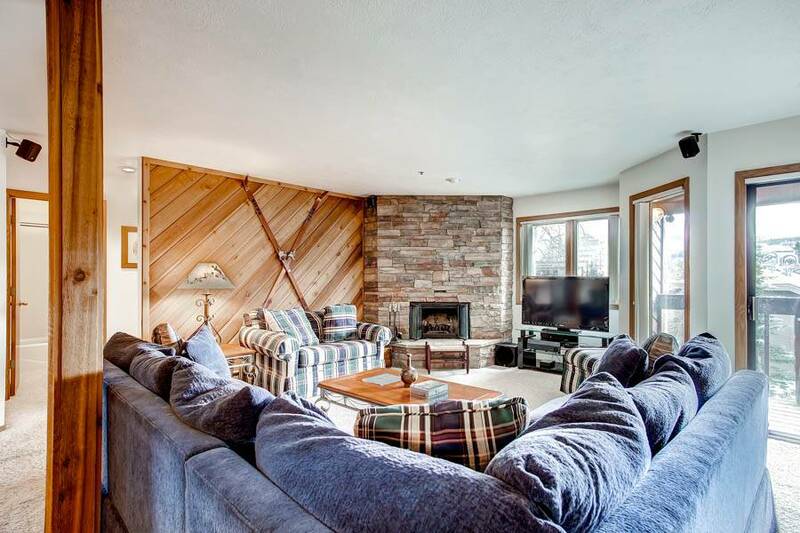 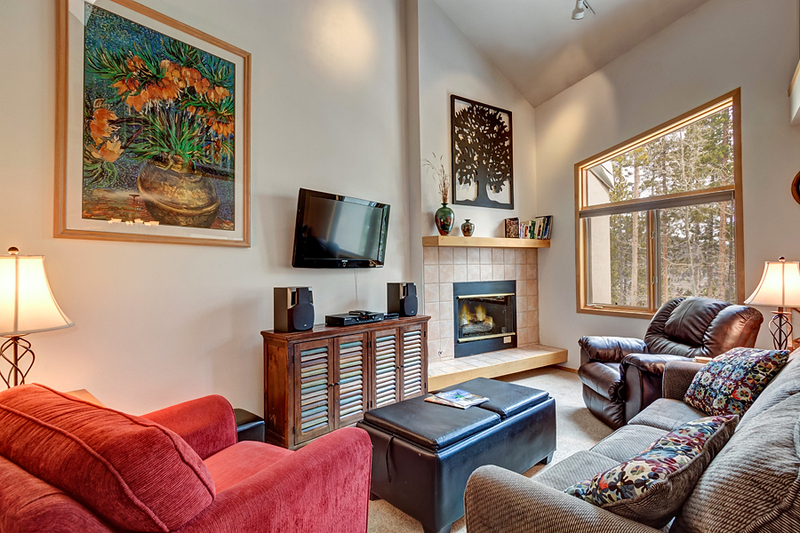 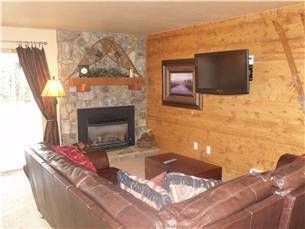 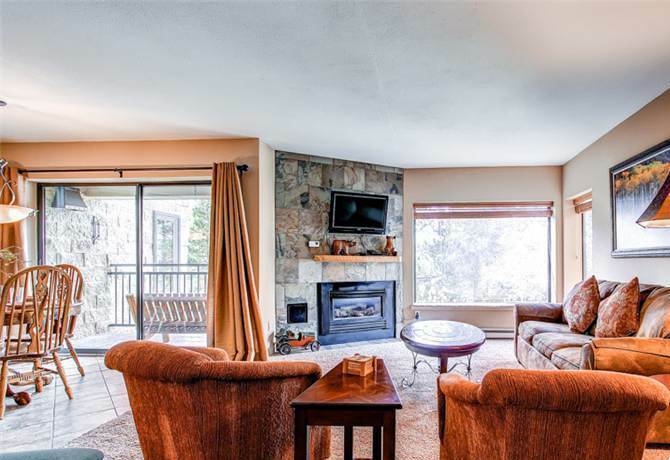 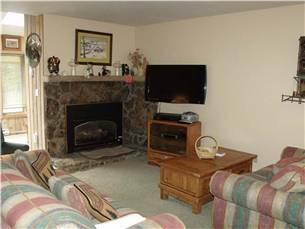 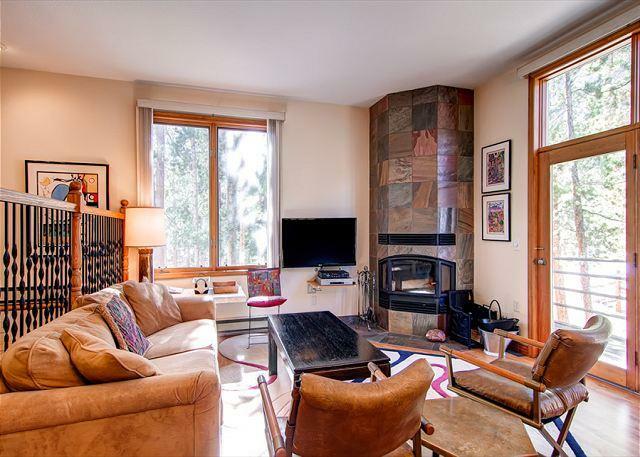 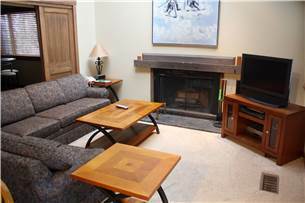 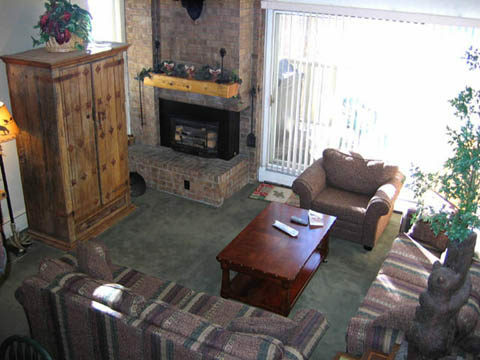 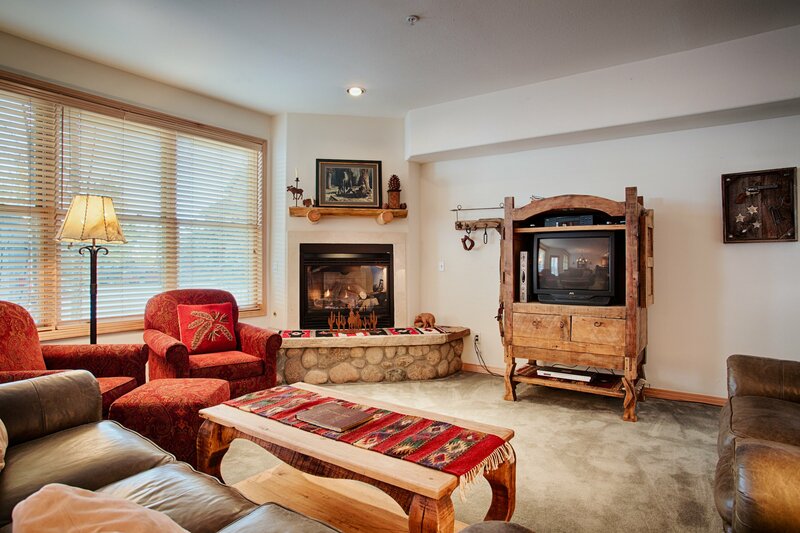 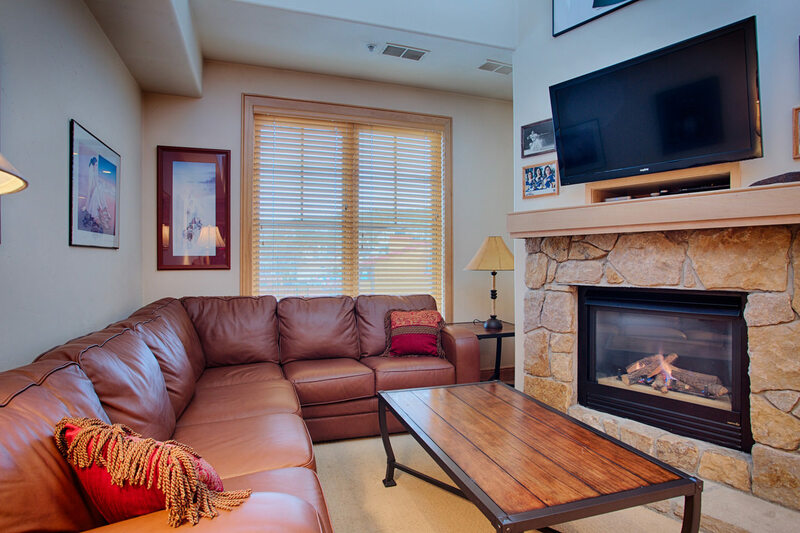 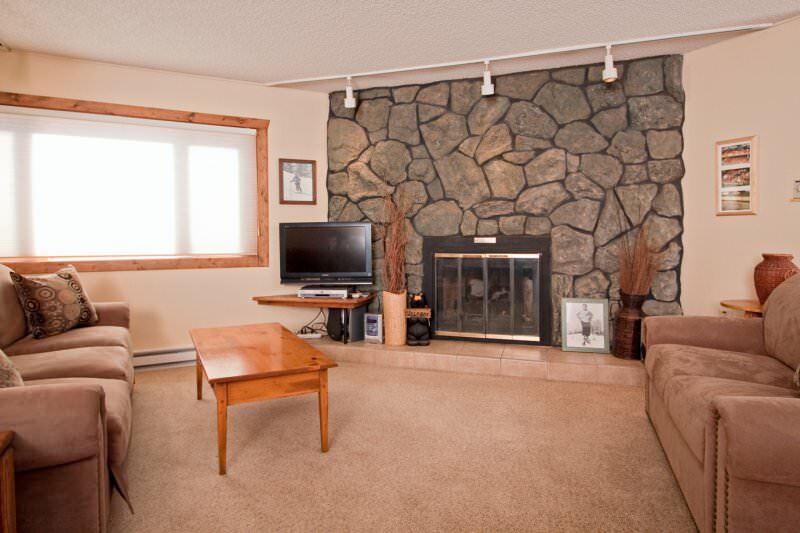 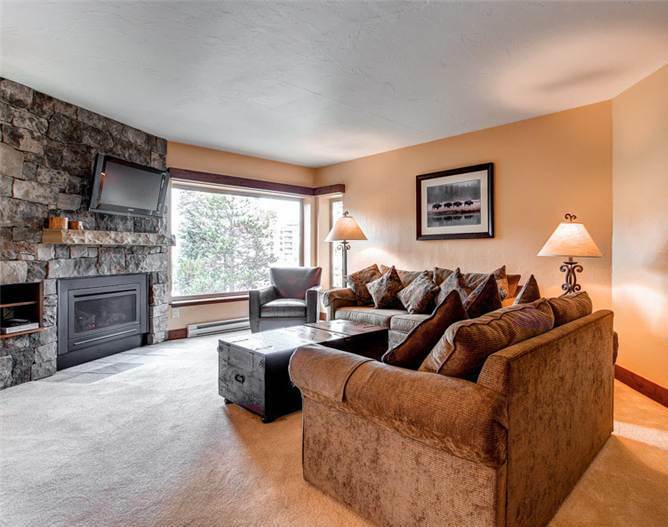 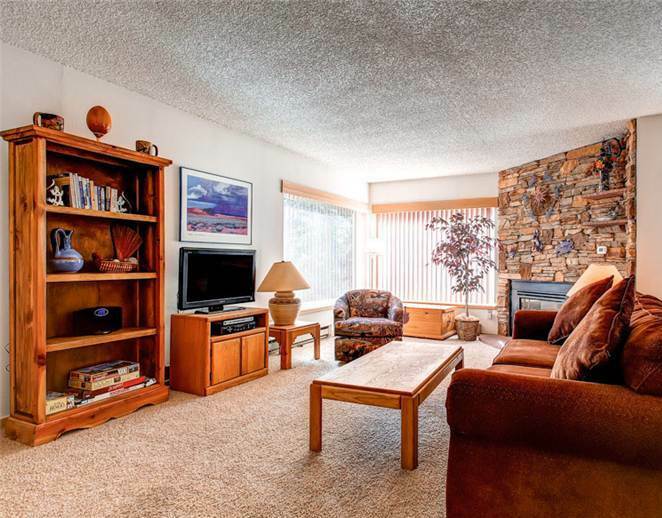 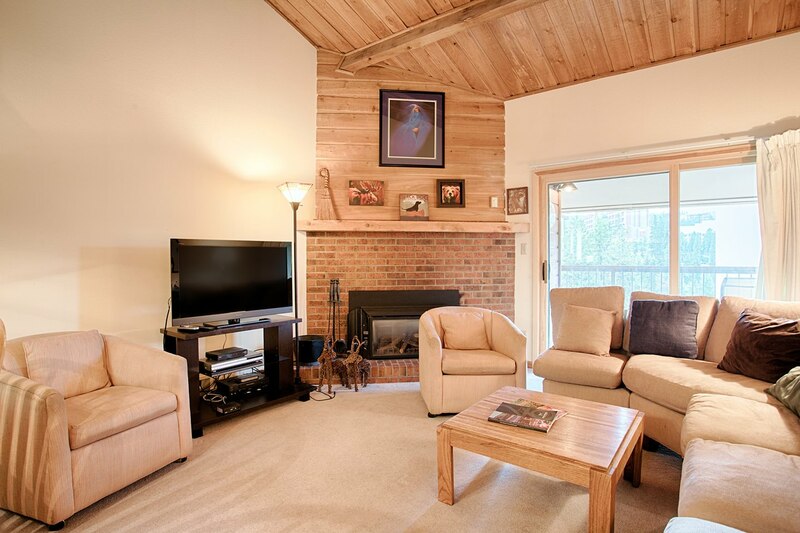 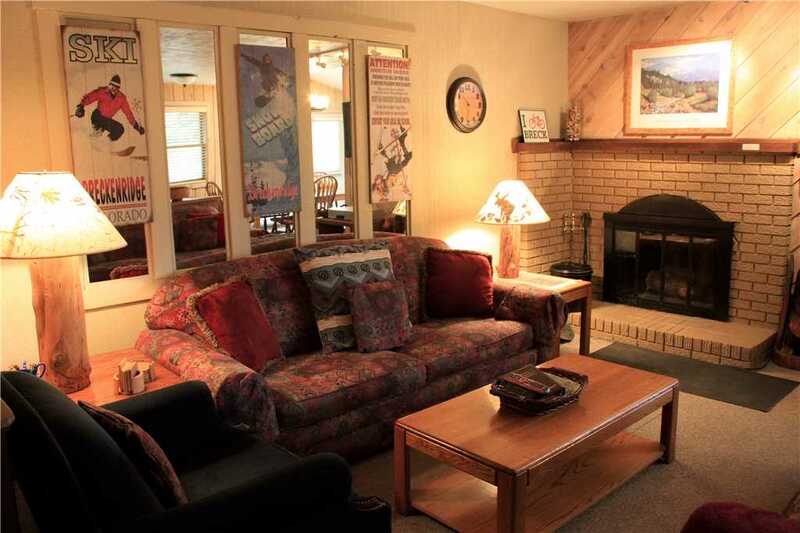 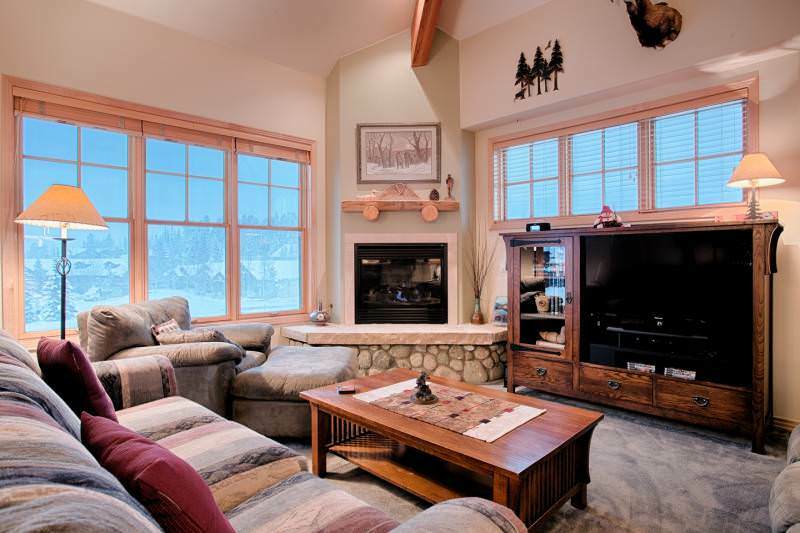 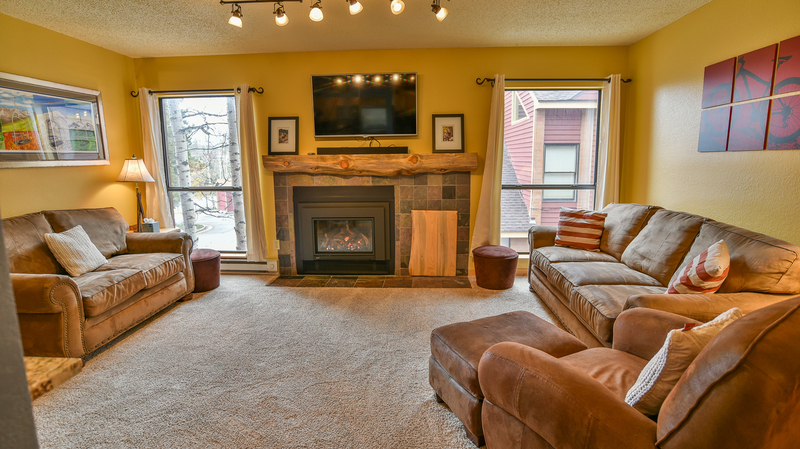 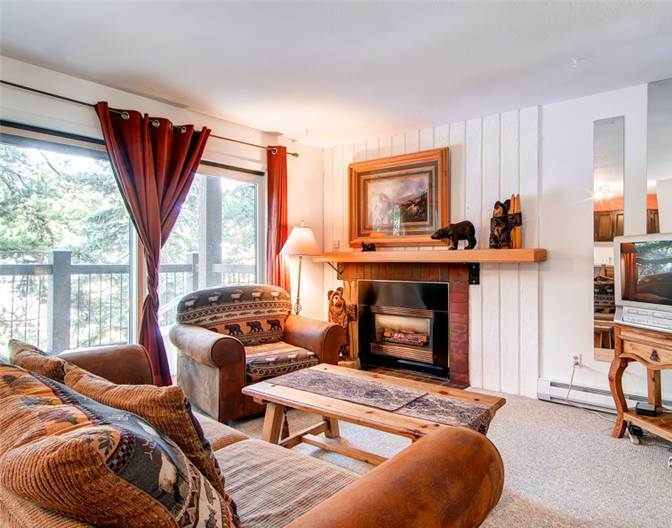 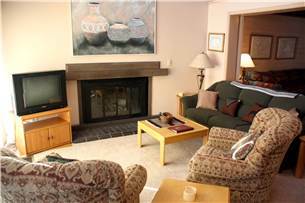 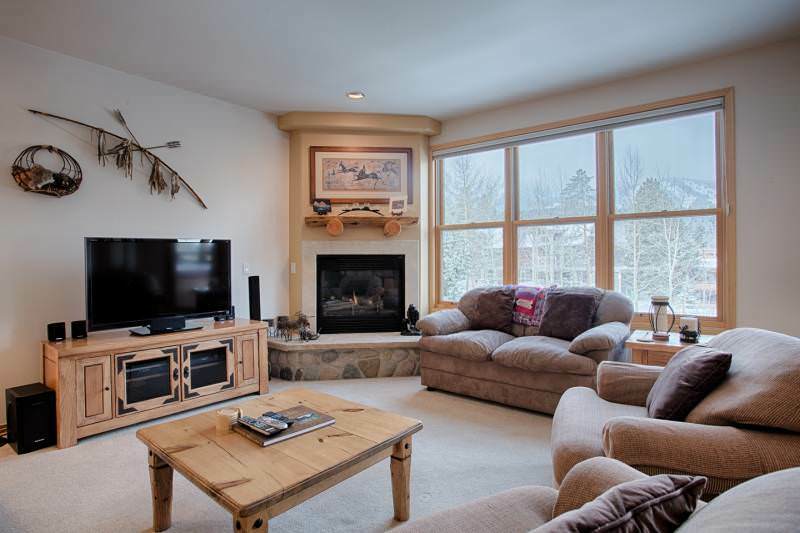 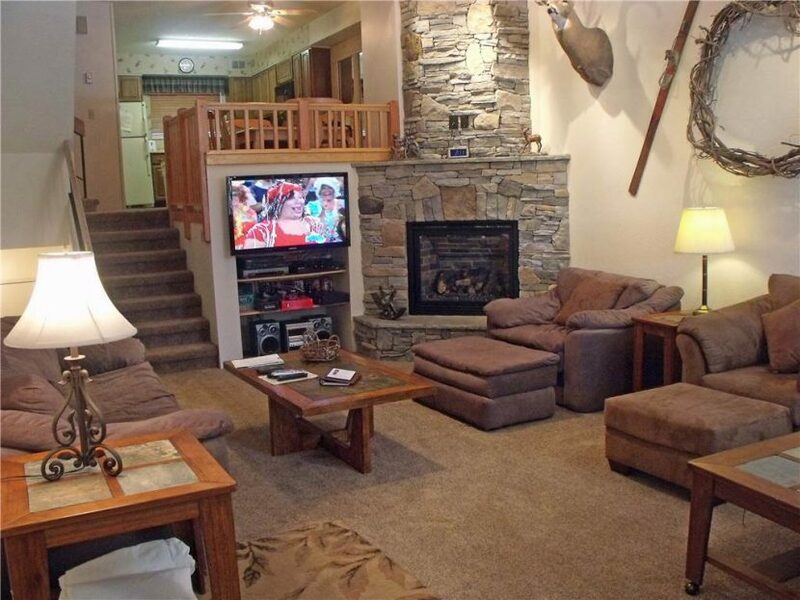 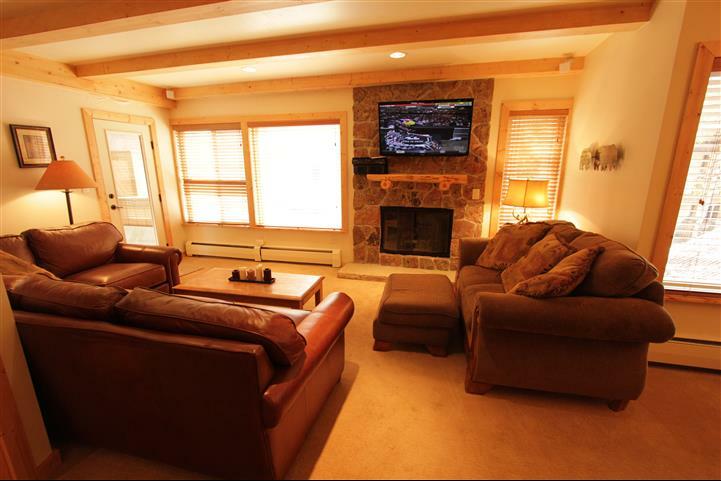 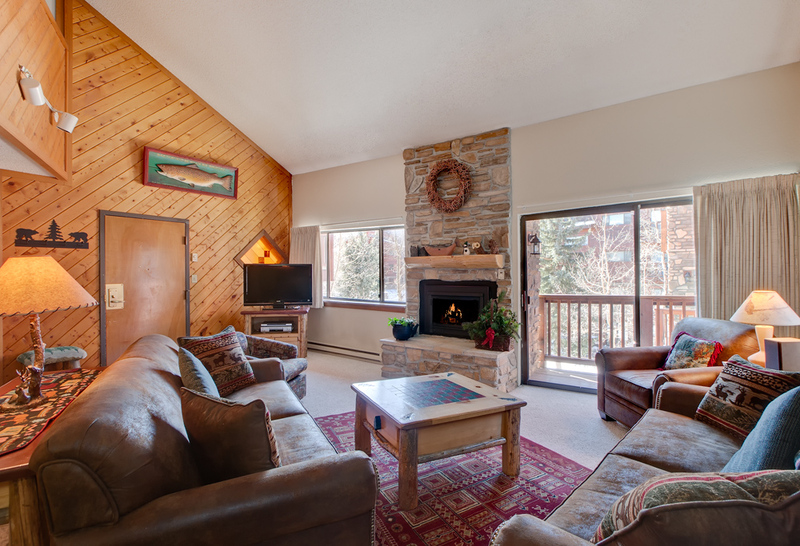 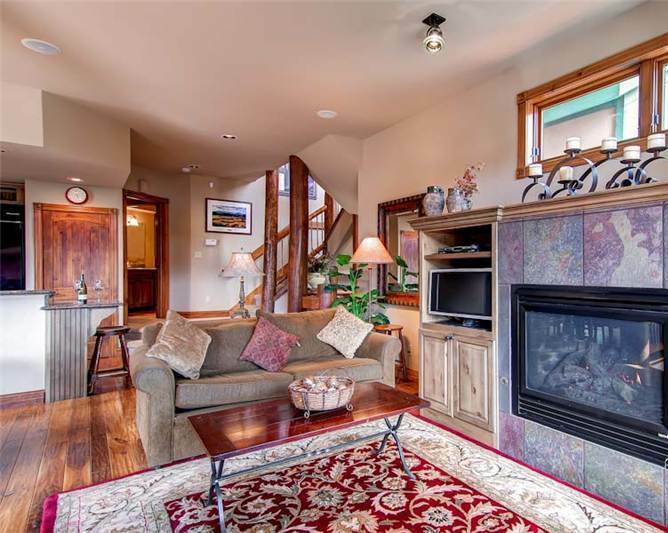 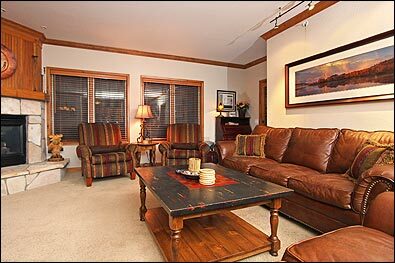 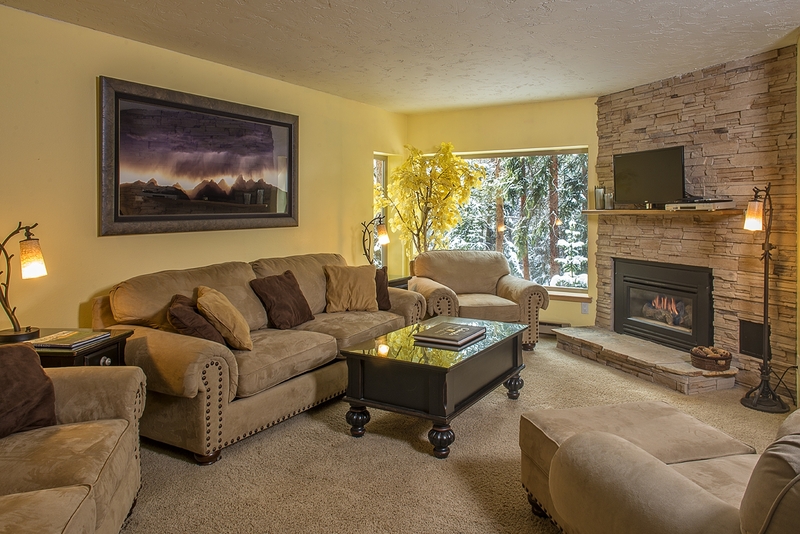 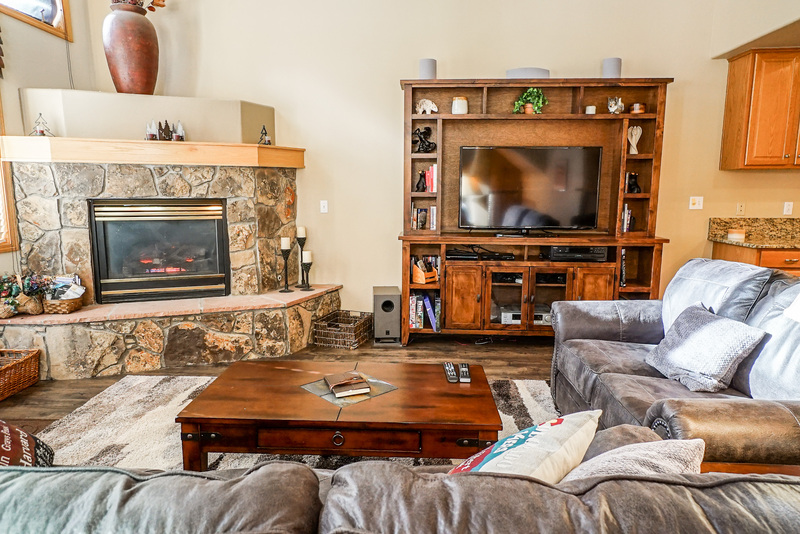 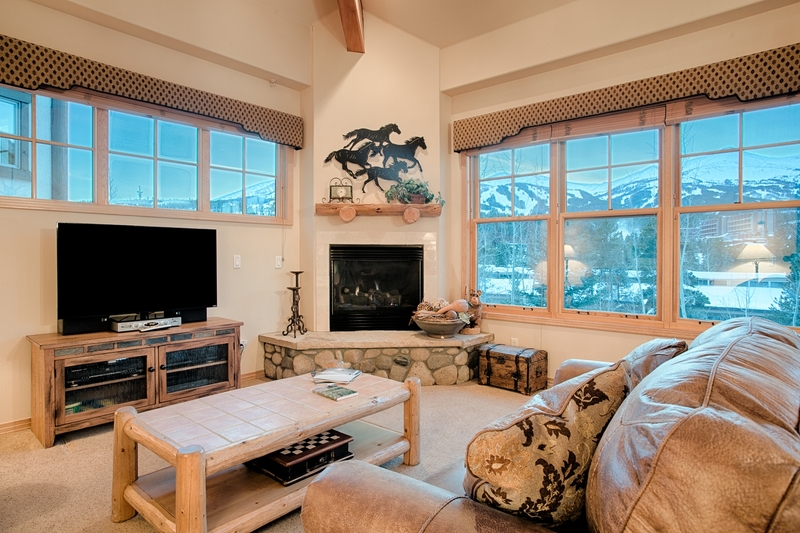 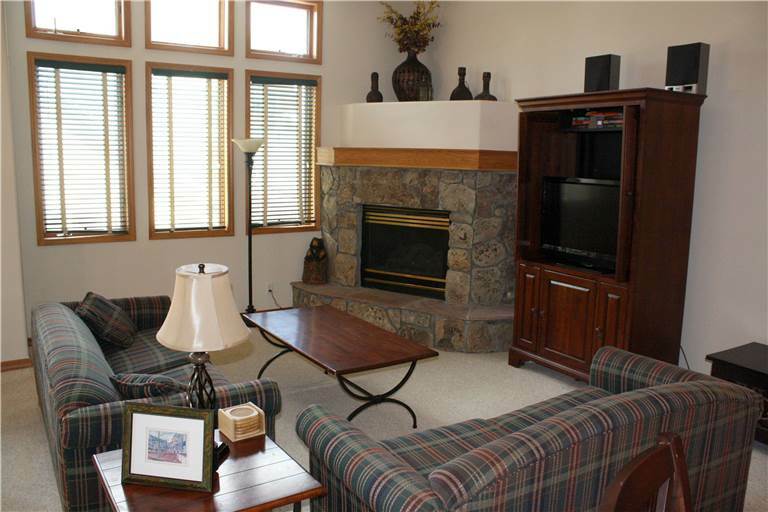 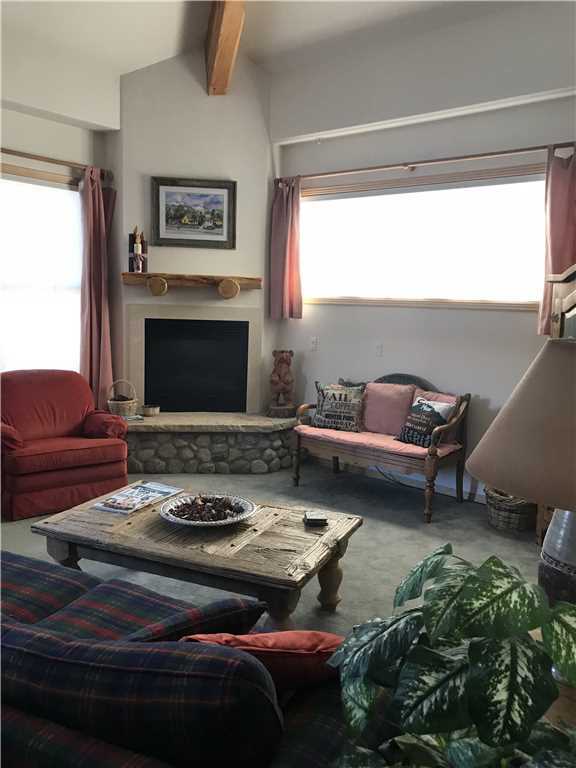 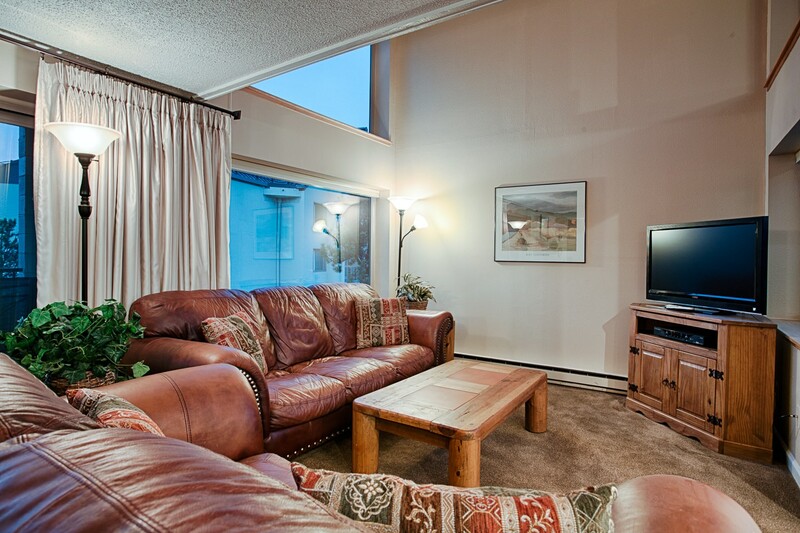 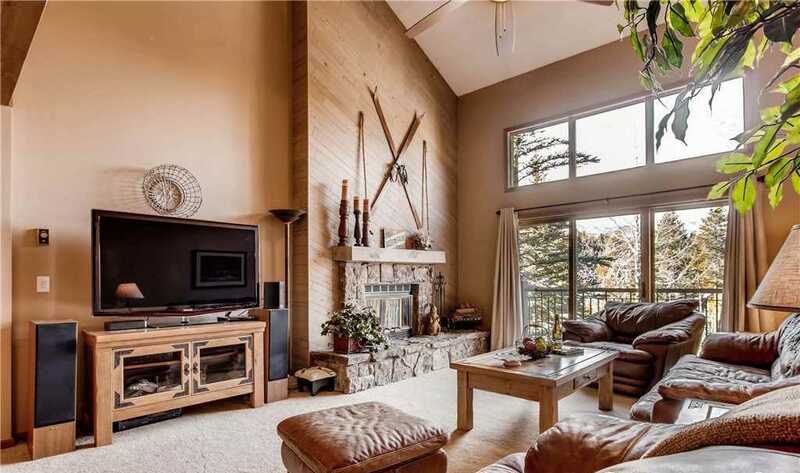 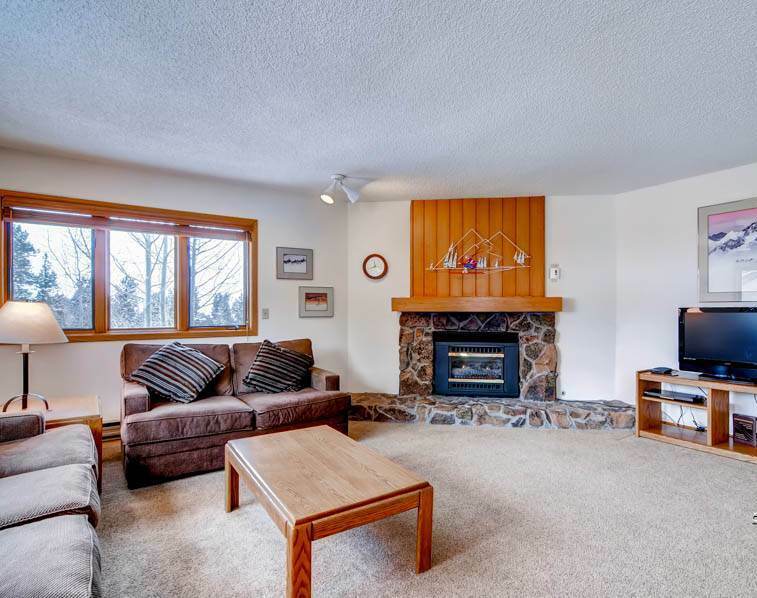 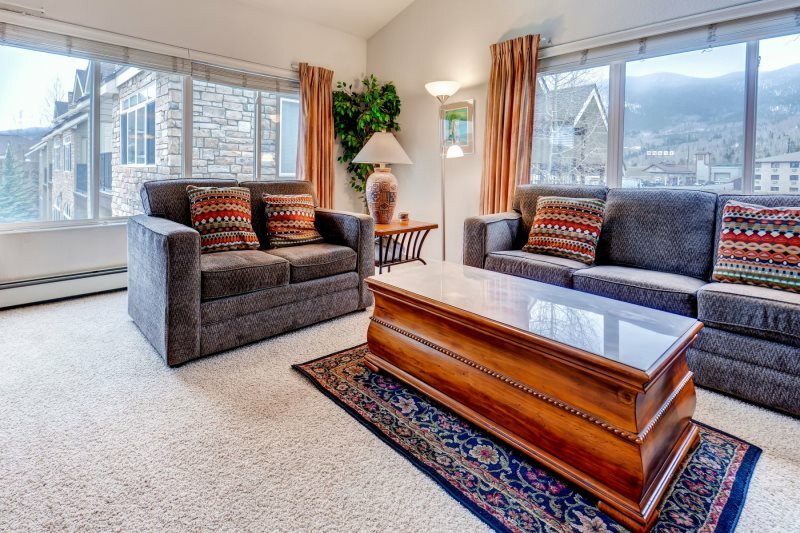 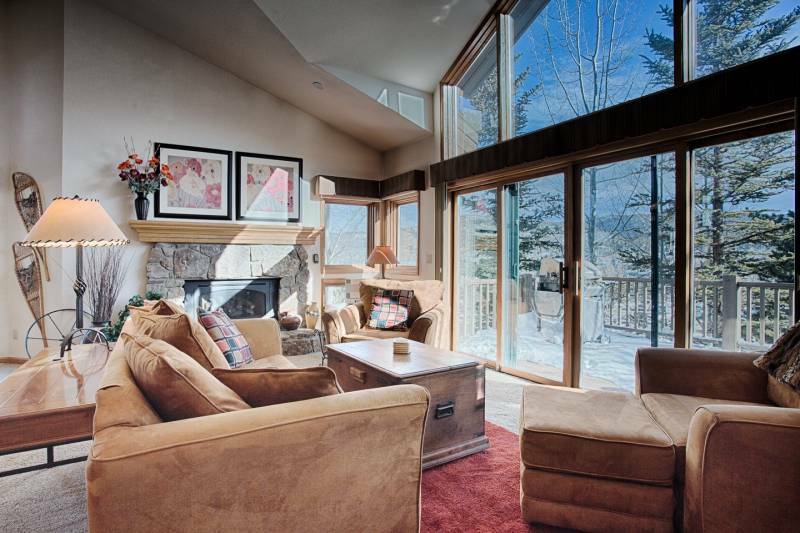 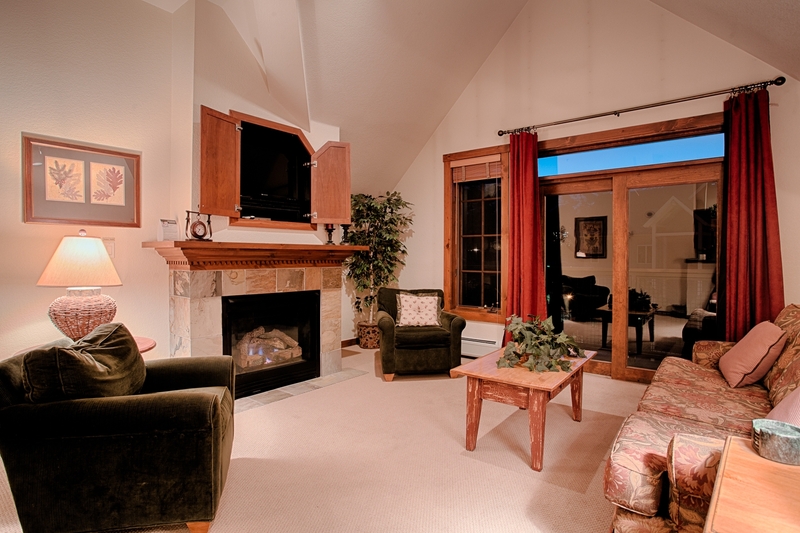 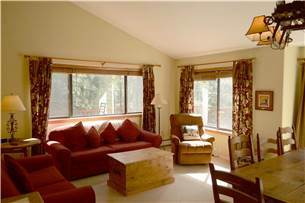 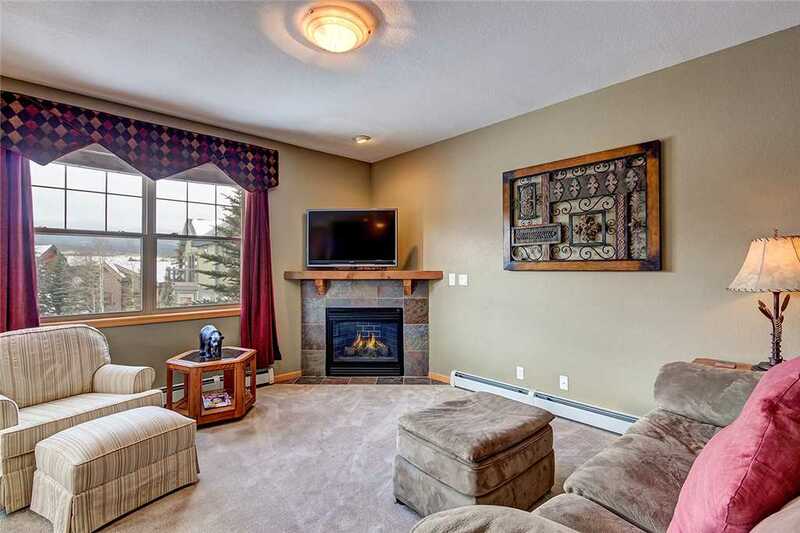 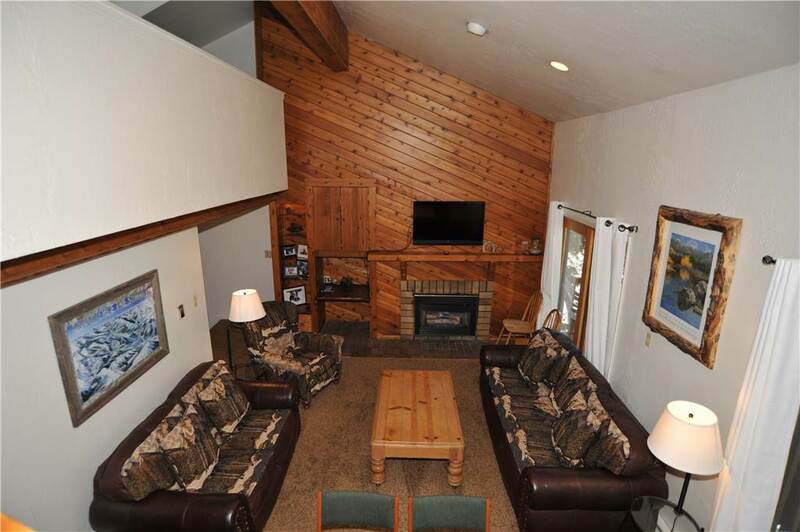 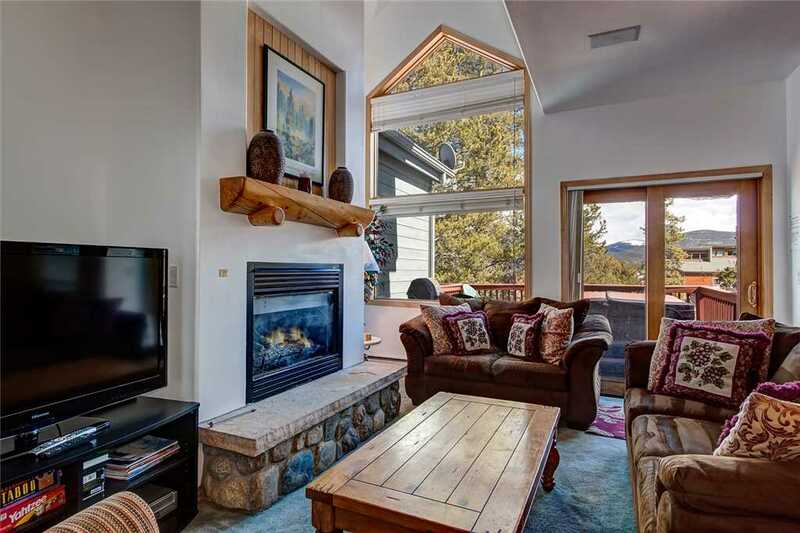 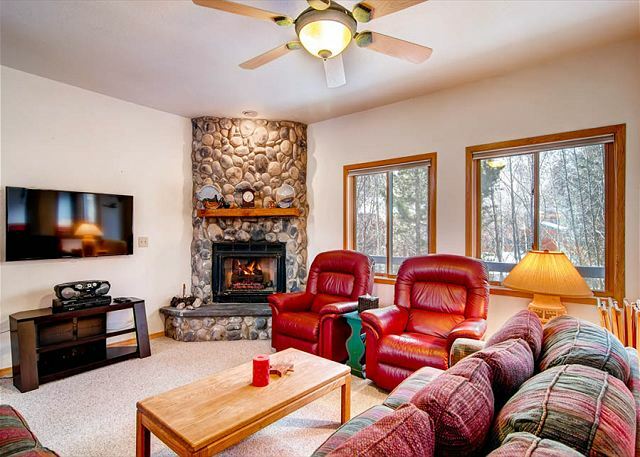 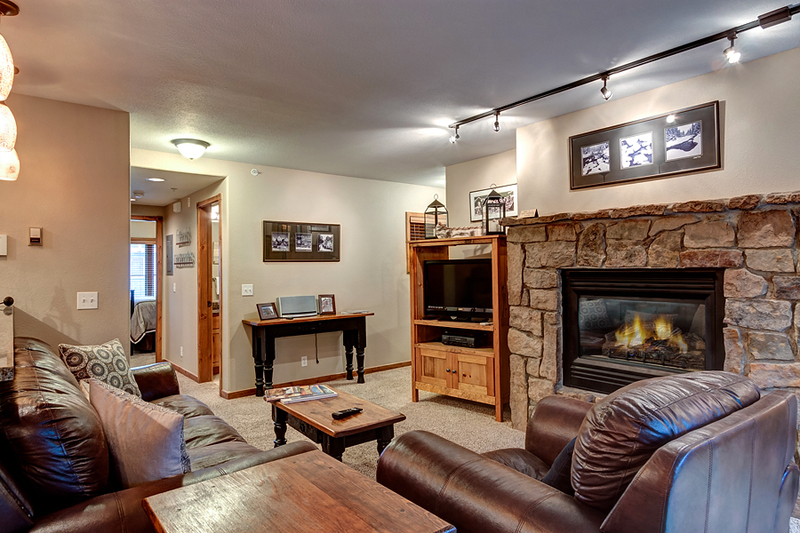 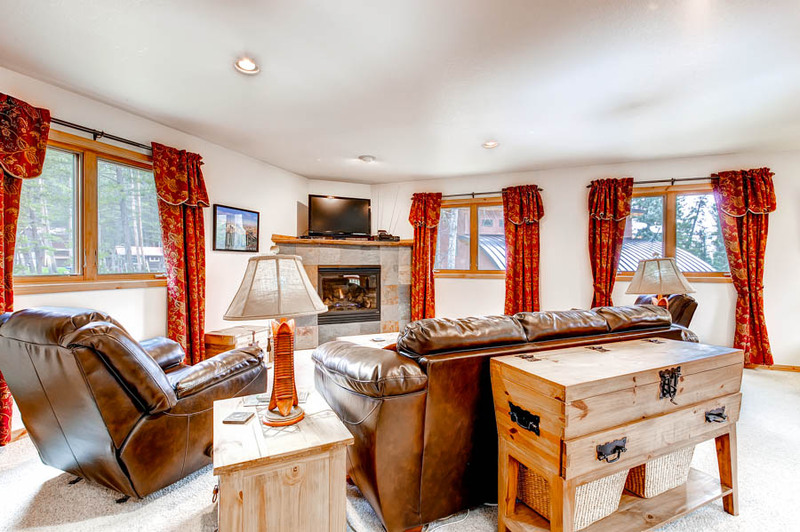 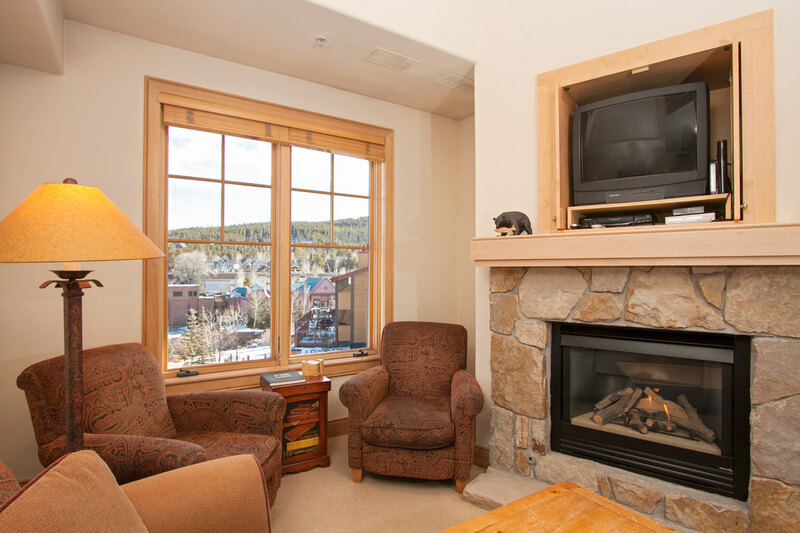 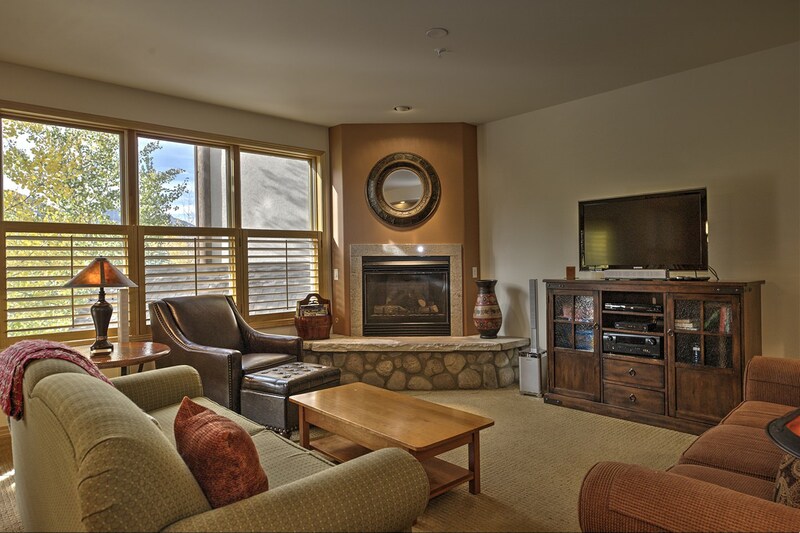 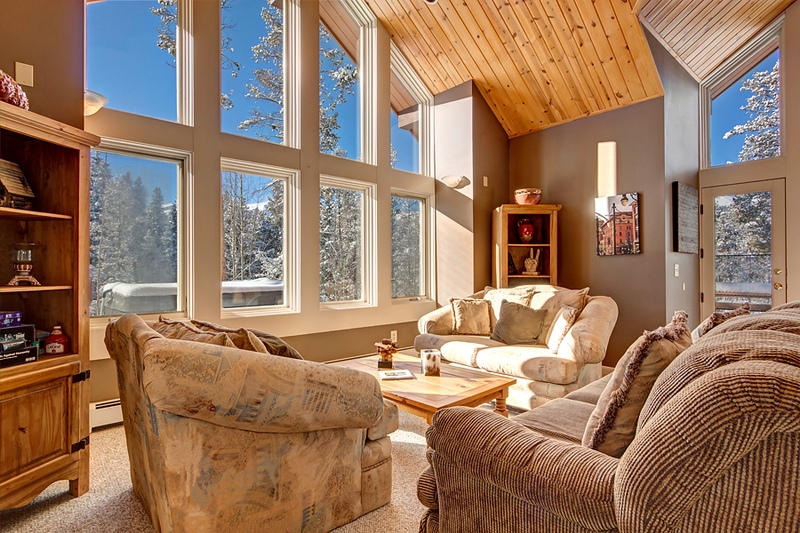 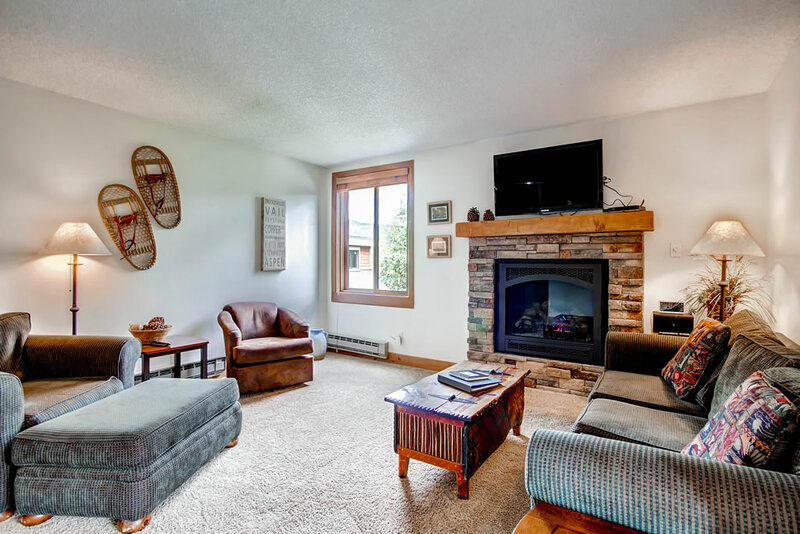 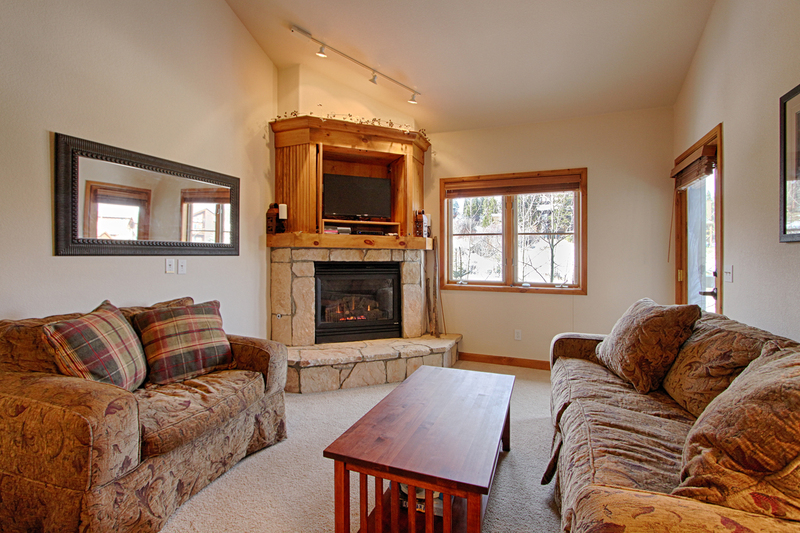 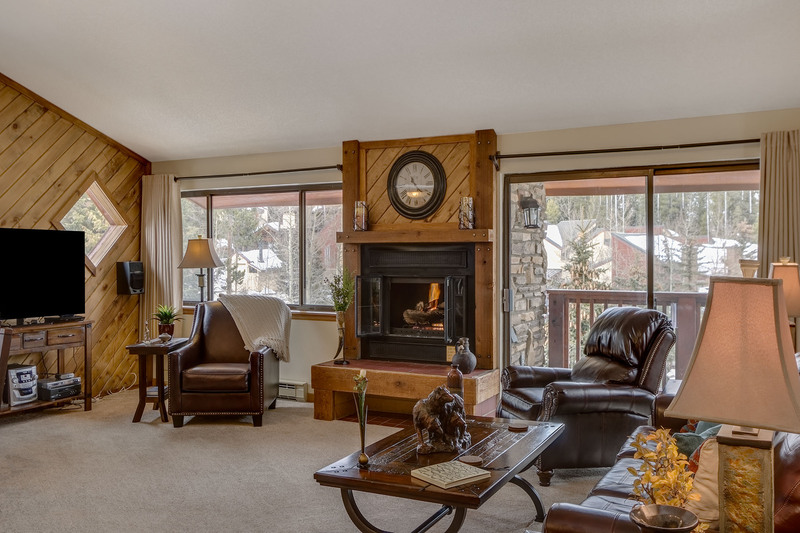 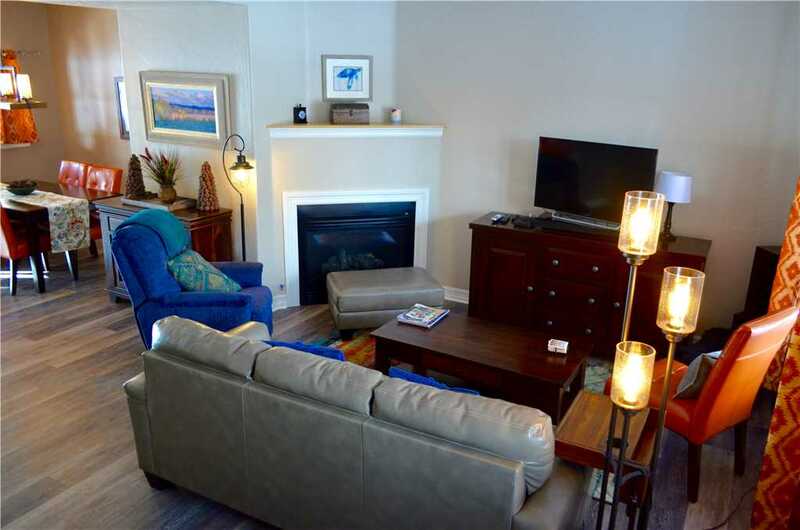 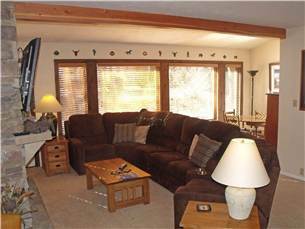 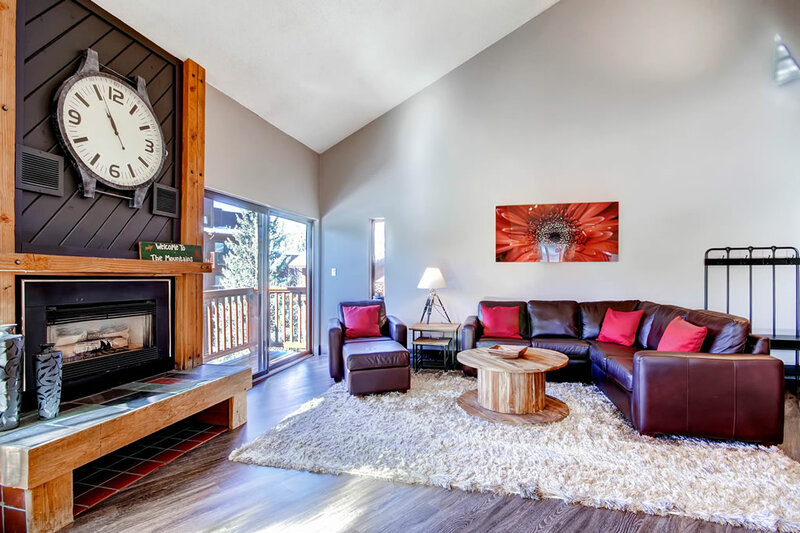 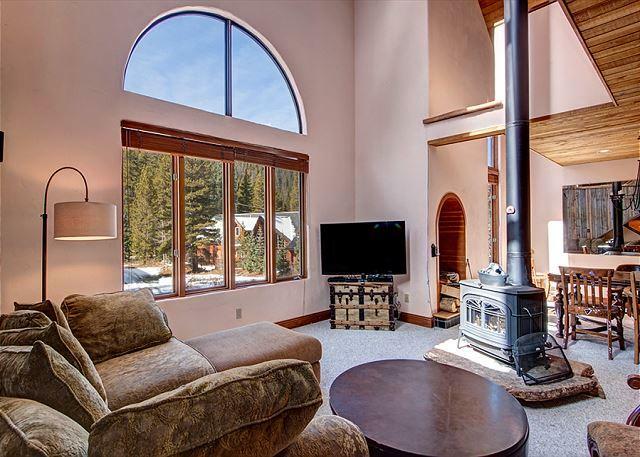 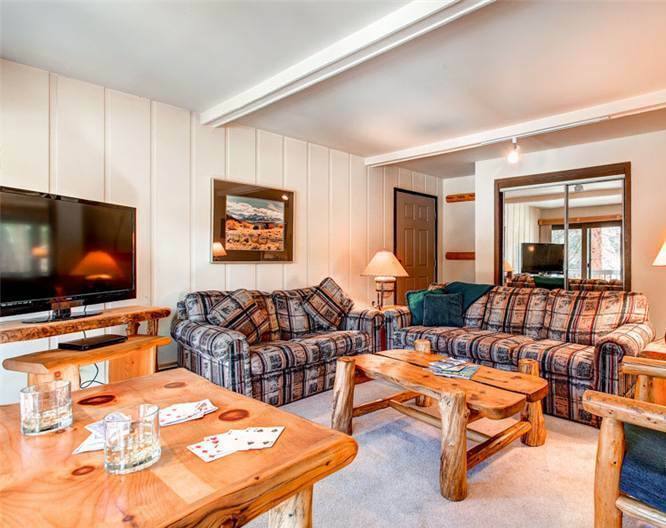 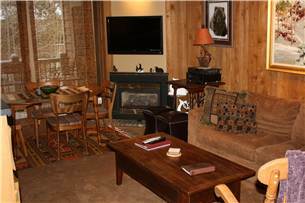 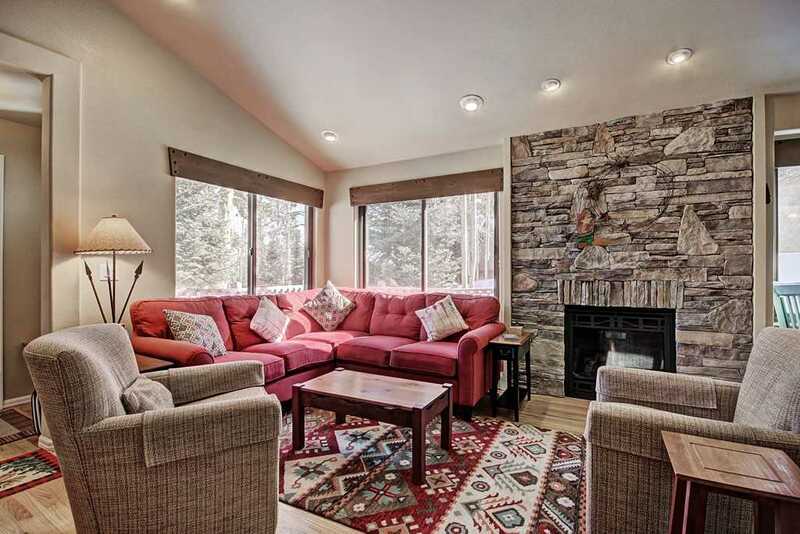 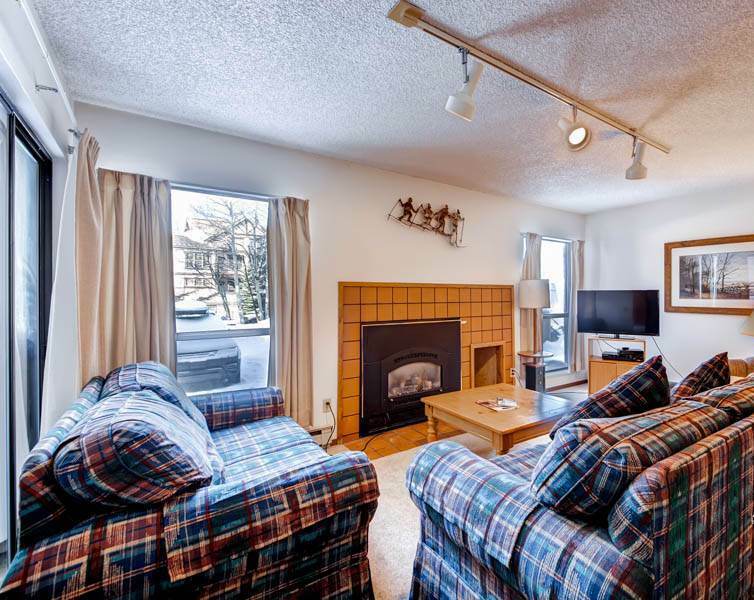 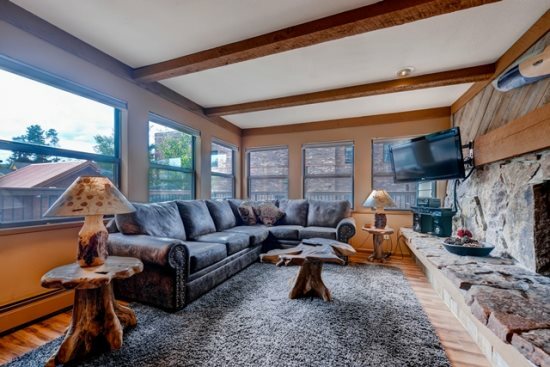 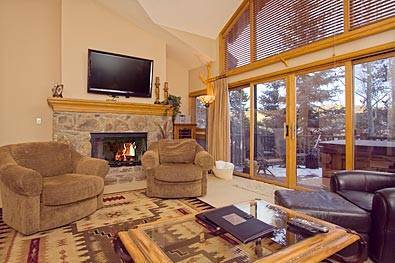 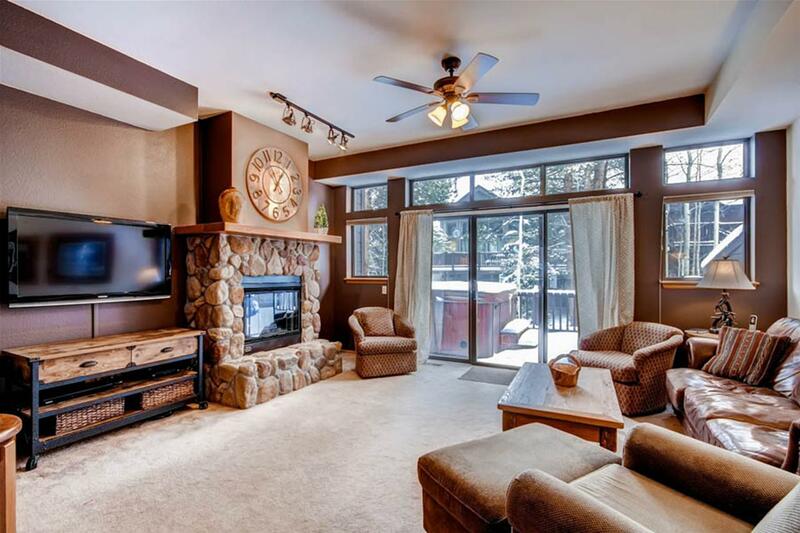 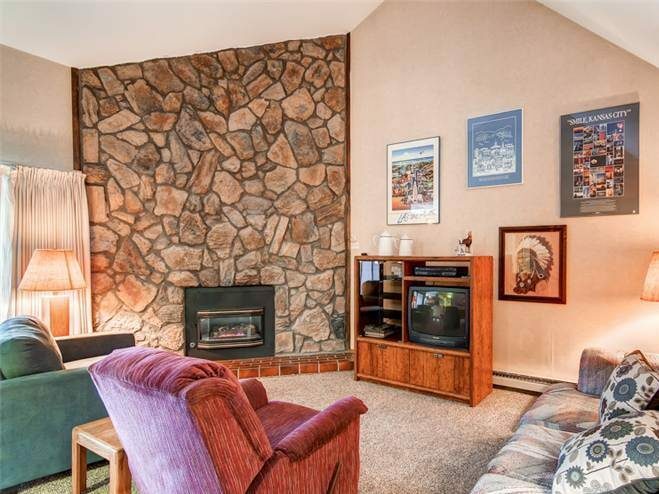 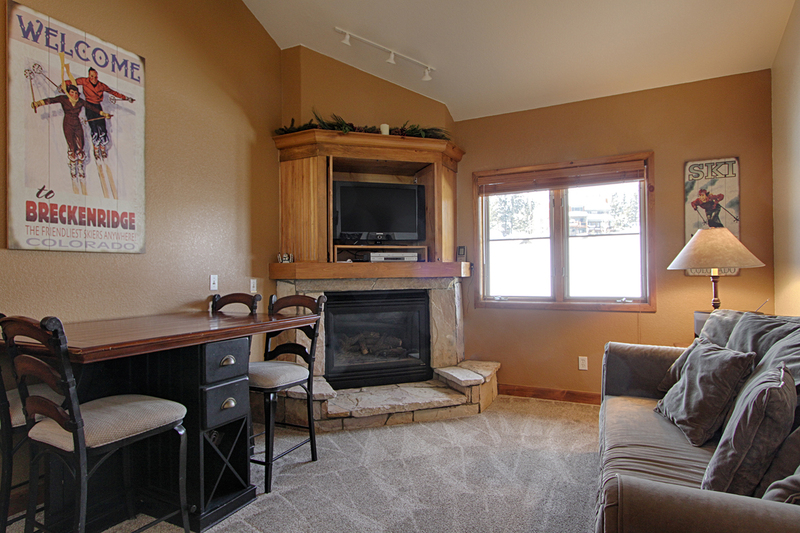 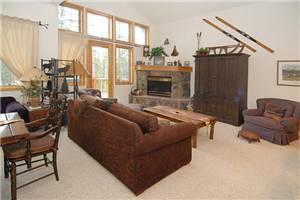 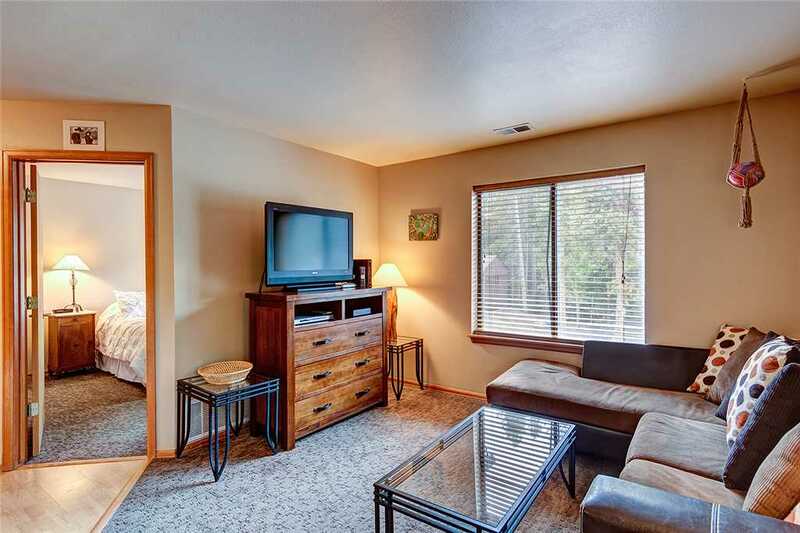 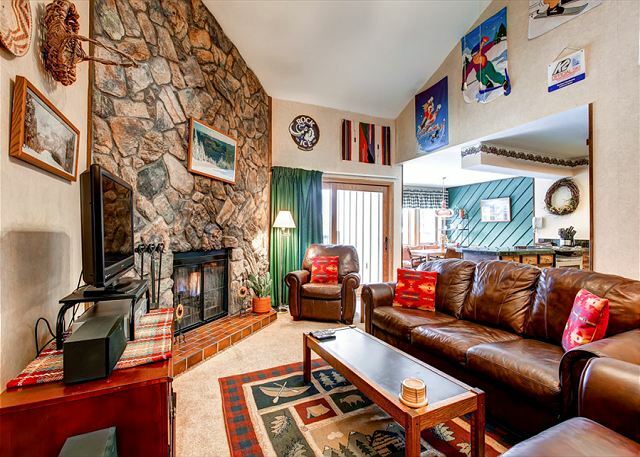 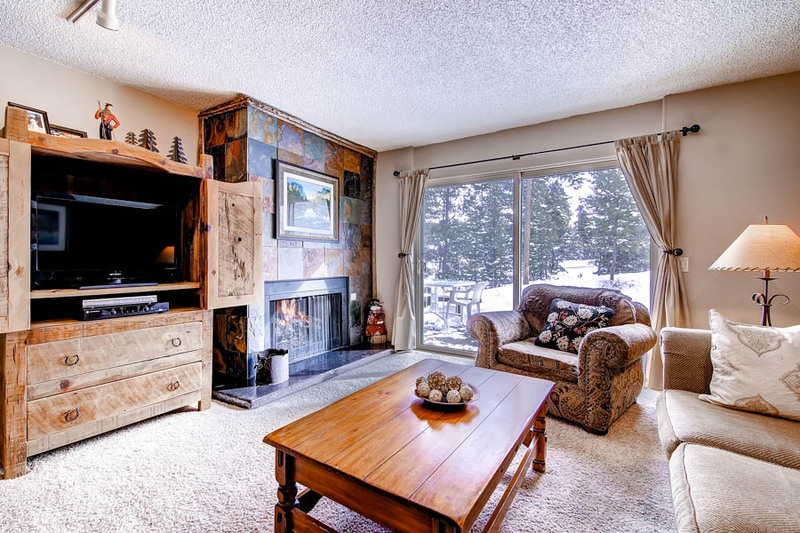 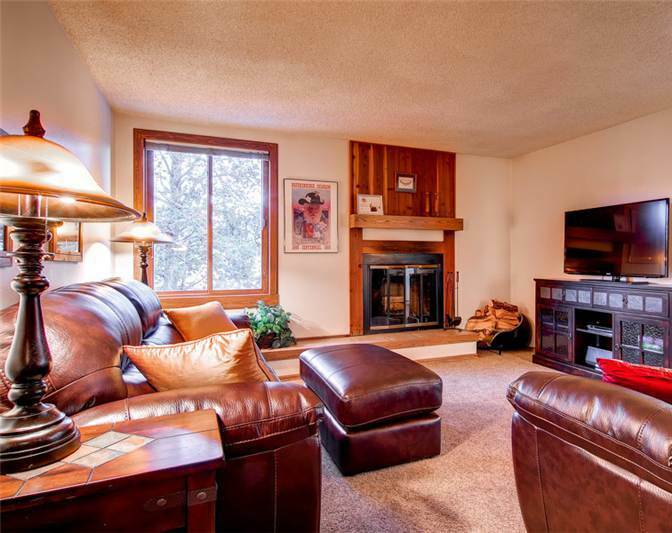 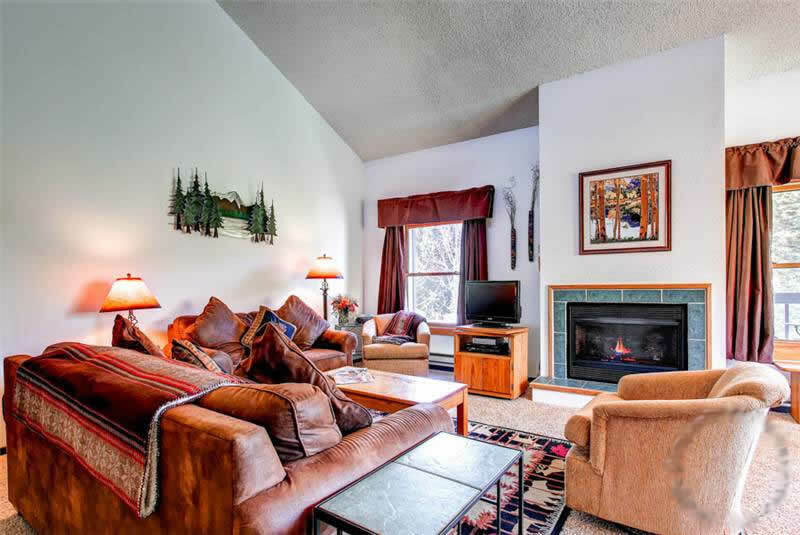 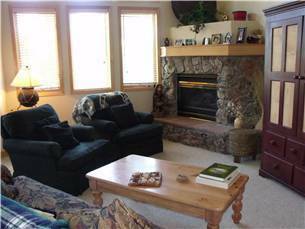 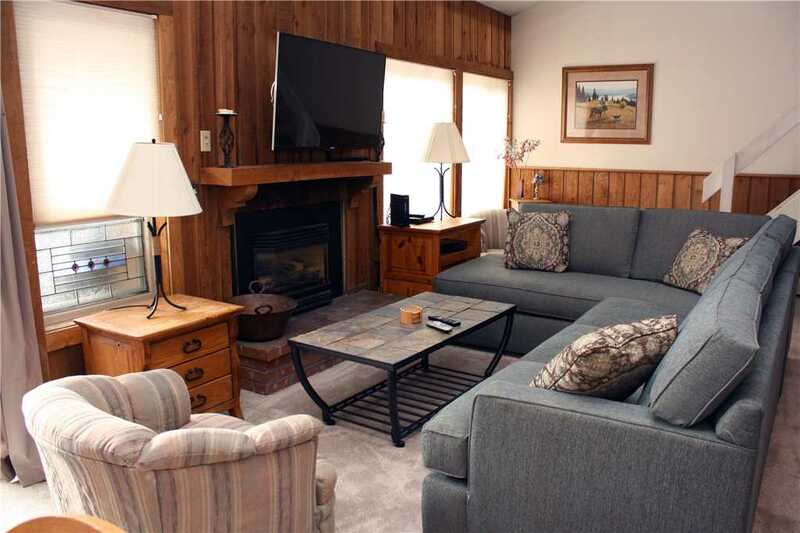 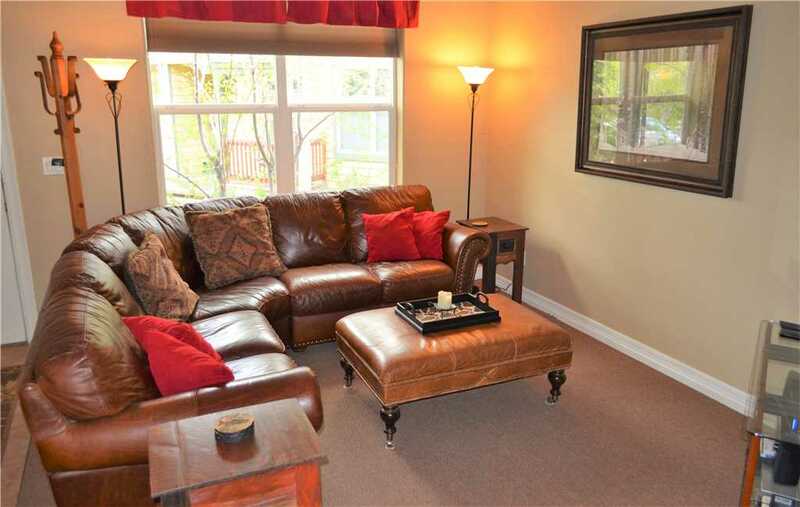 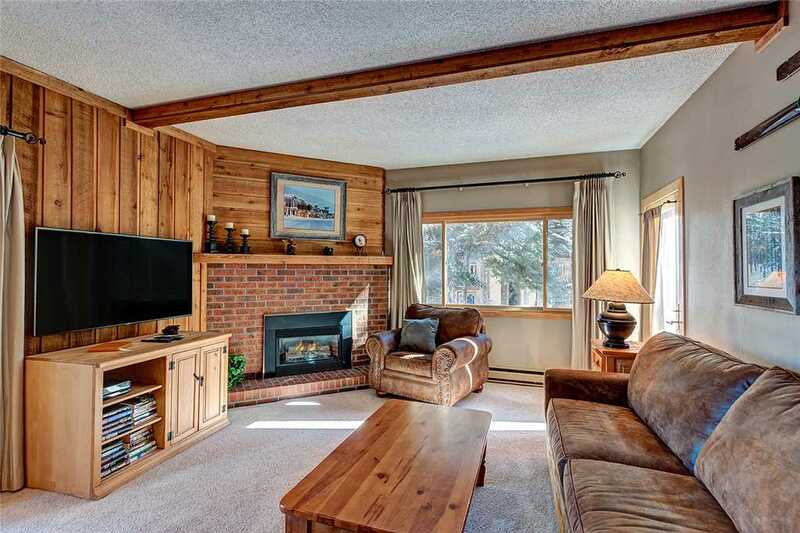 A new huge leather sectional provides easy viewing of the slopes through the big picture windows, the handsome stone hearth with gas fireplace and the big wall-mounted flatscreen TV with DVD/VCR. 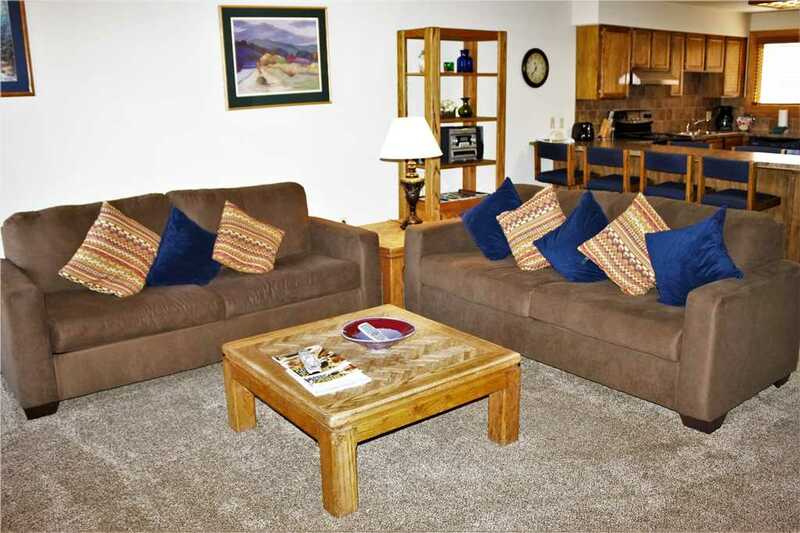 Guests will find two Queen sofa sleepers in the living room. 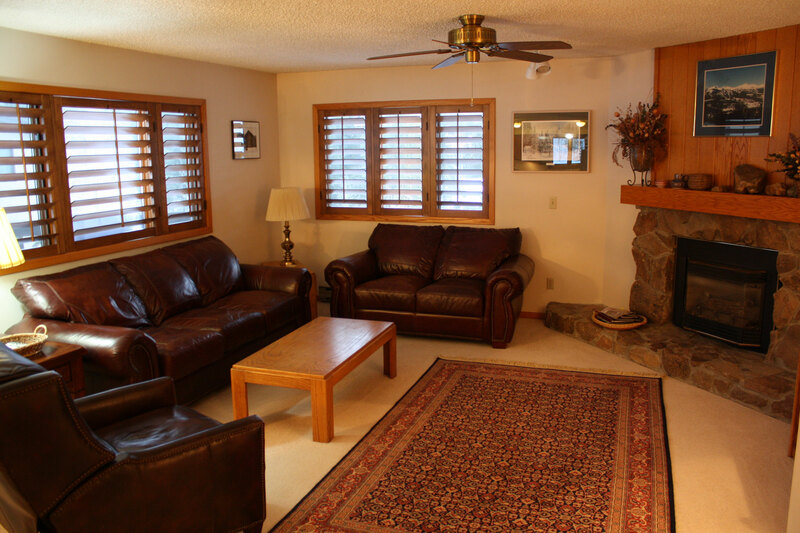 New doors and carpet complete the fresh new look. 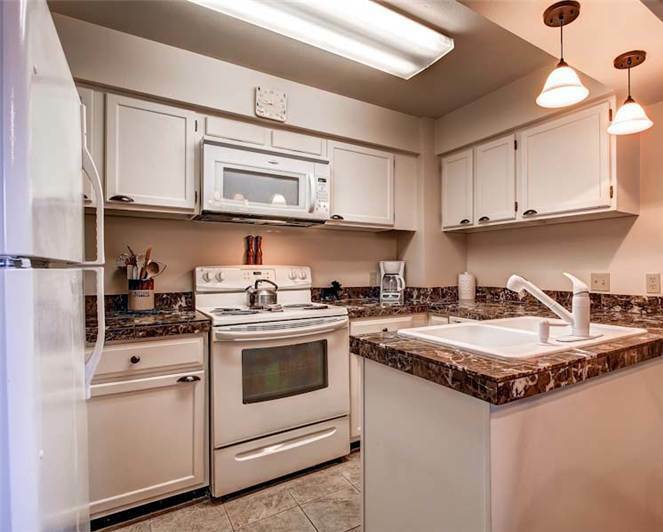 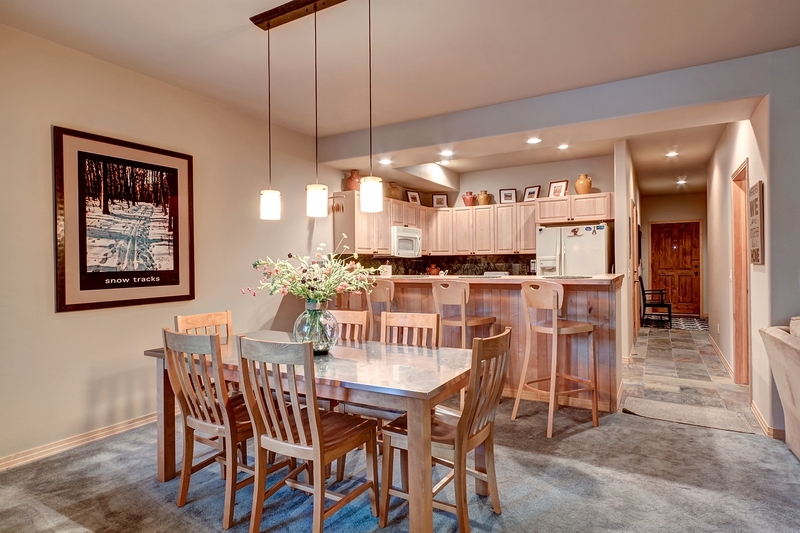 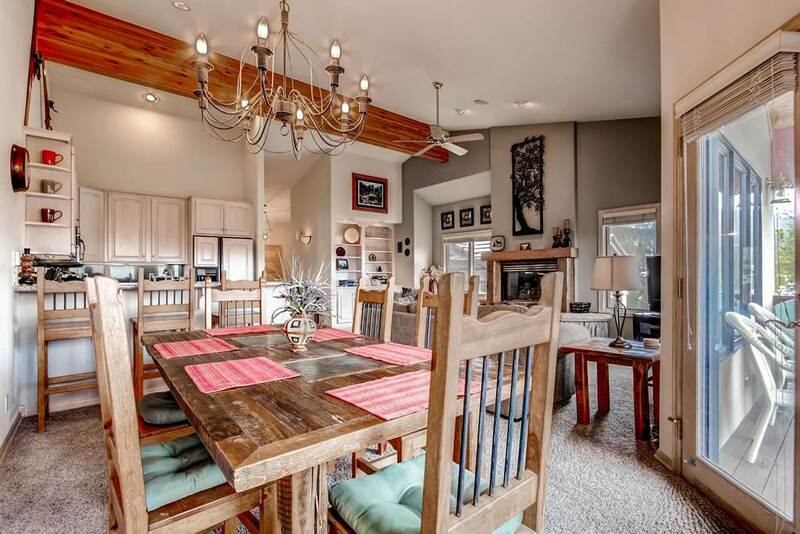 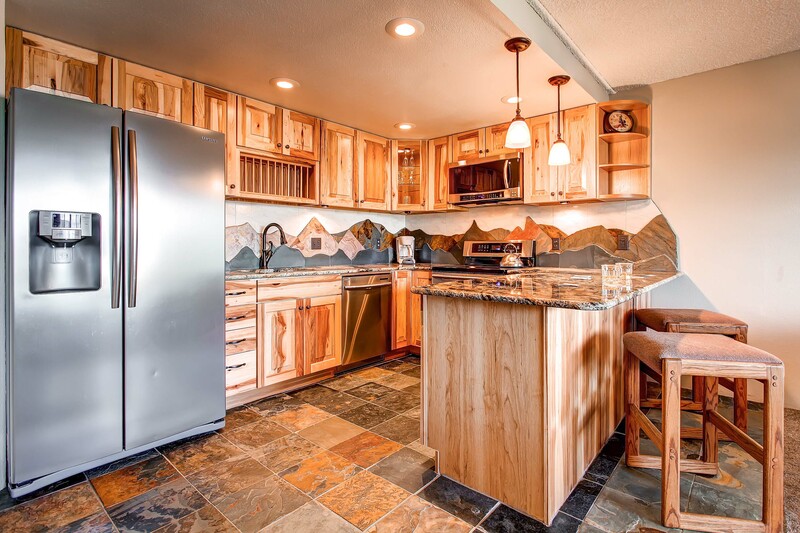 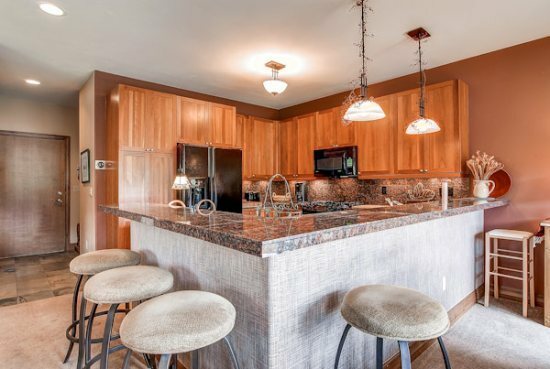 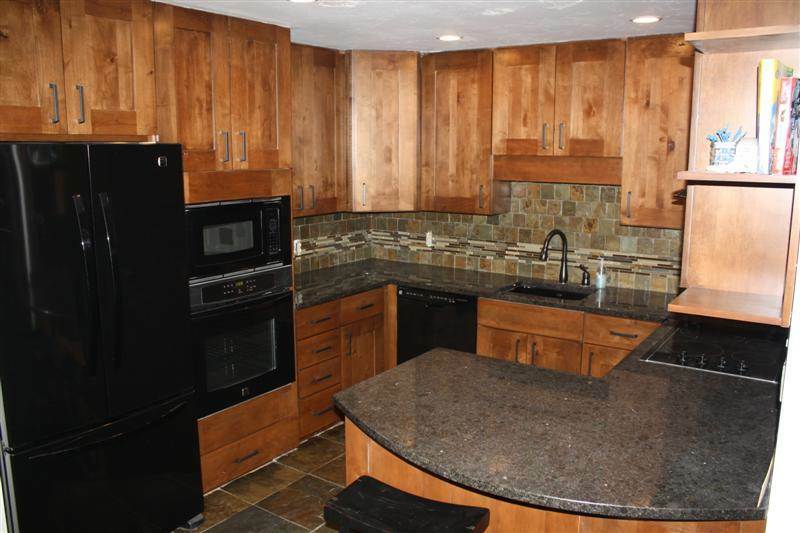 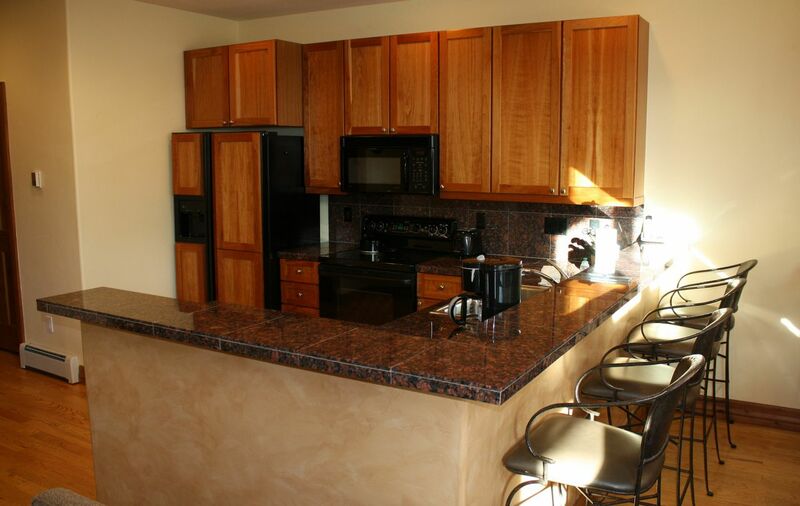 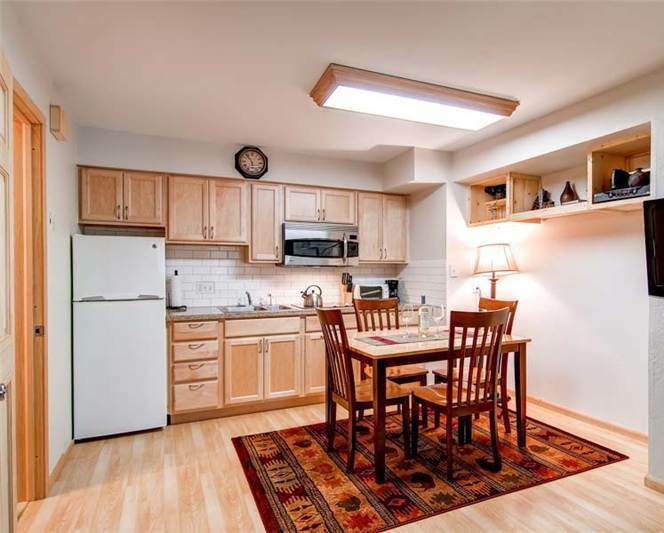 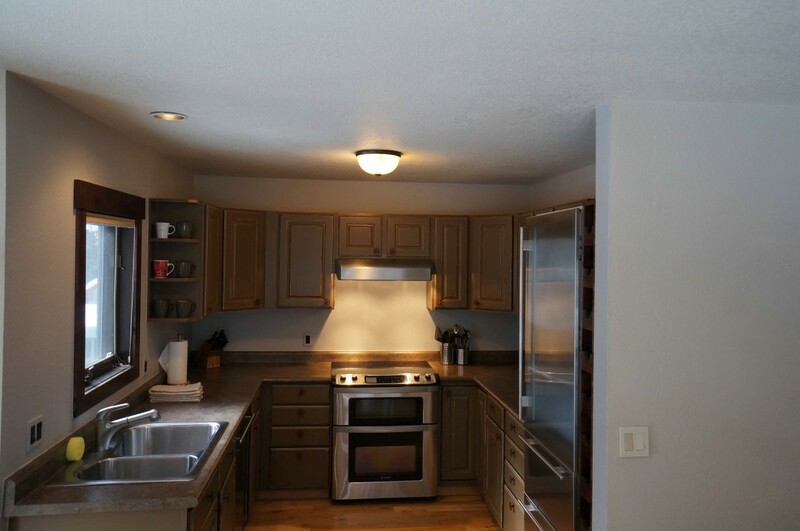 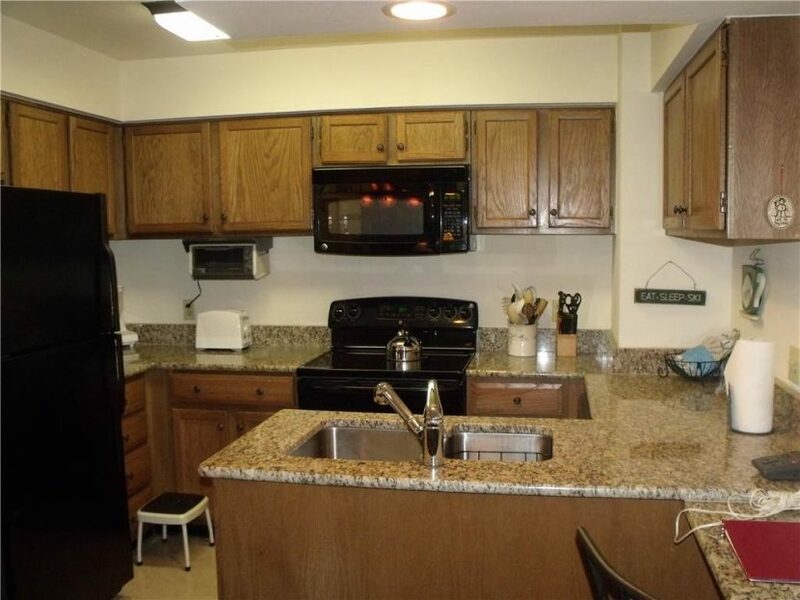 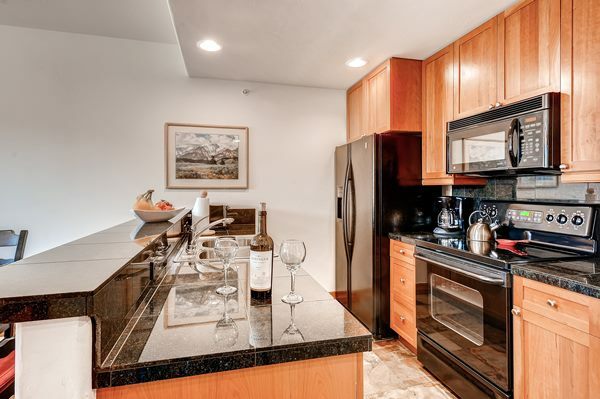 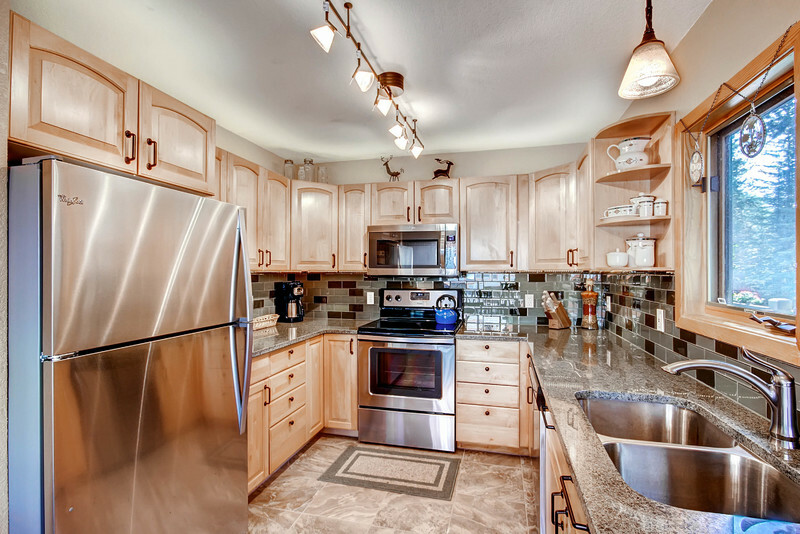 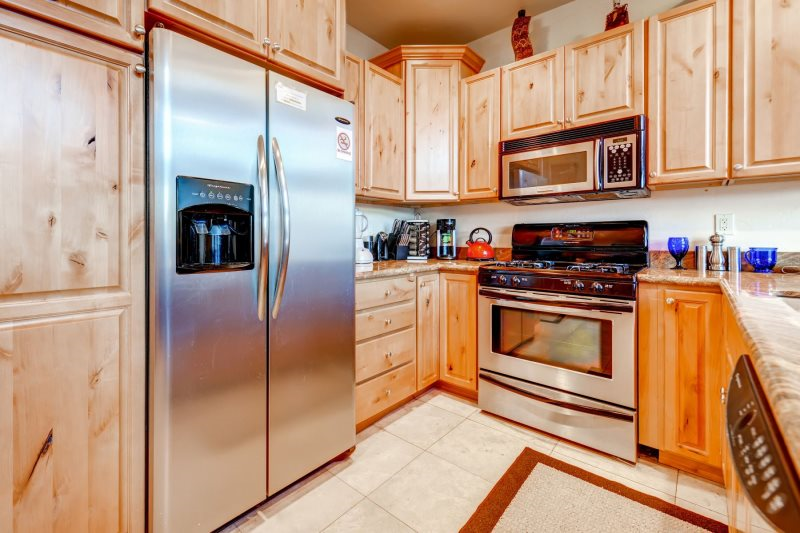 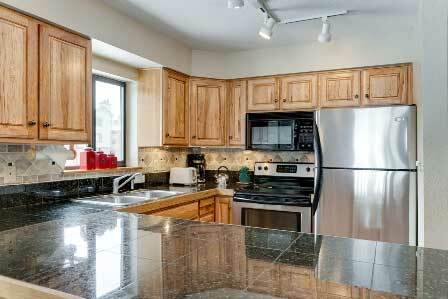 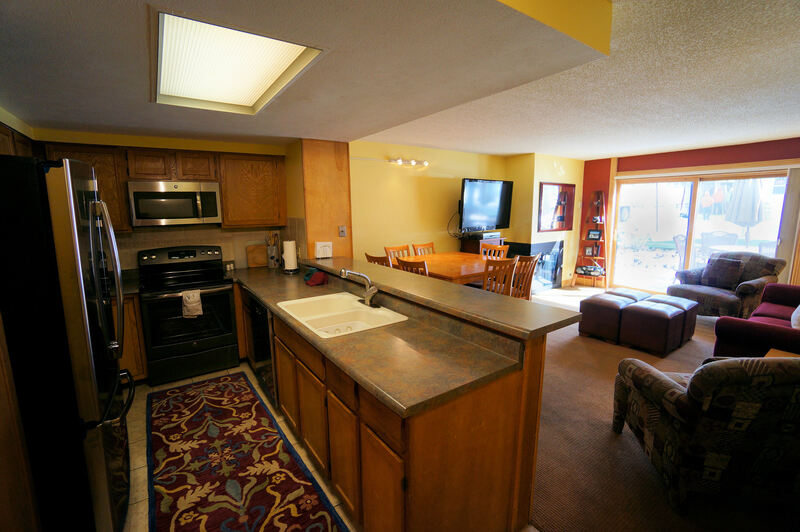 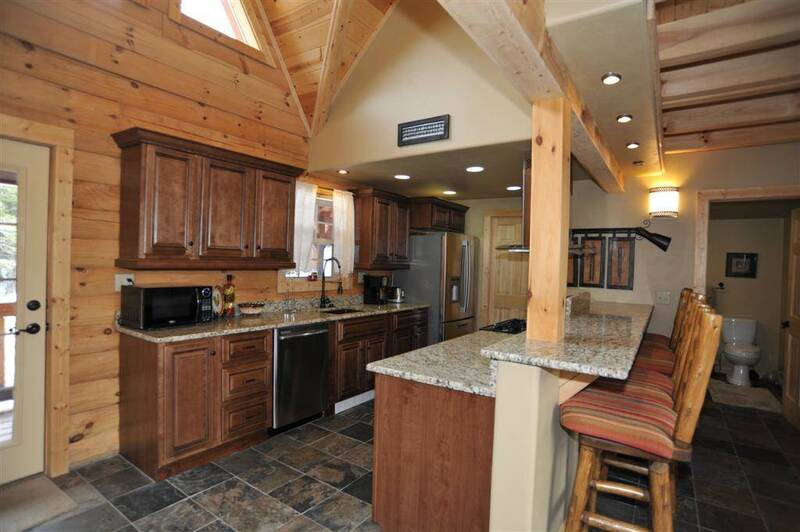 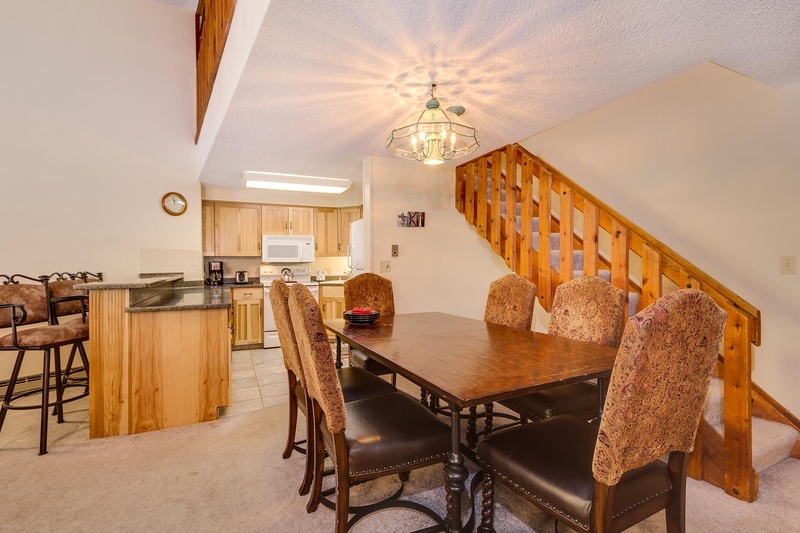 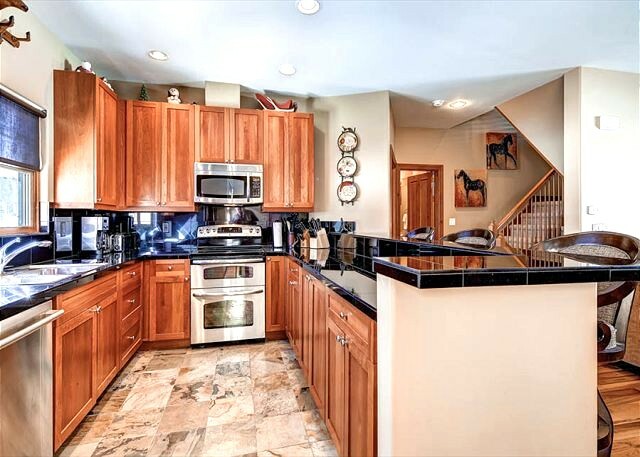 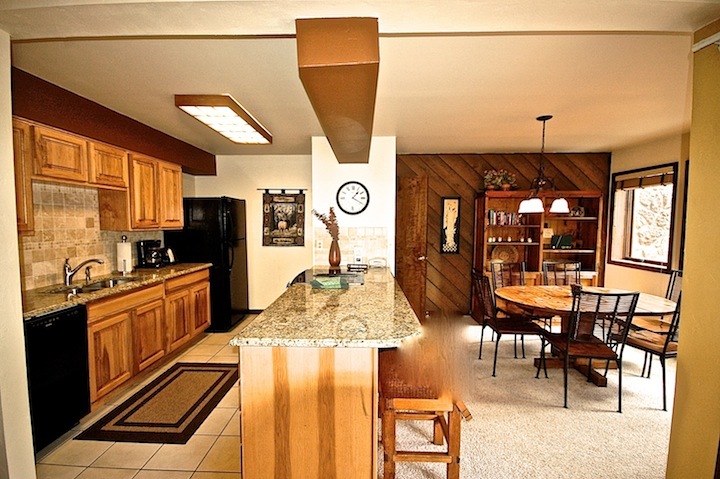 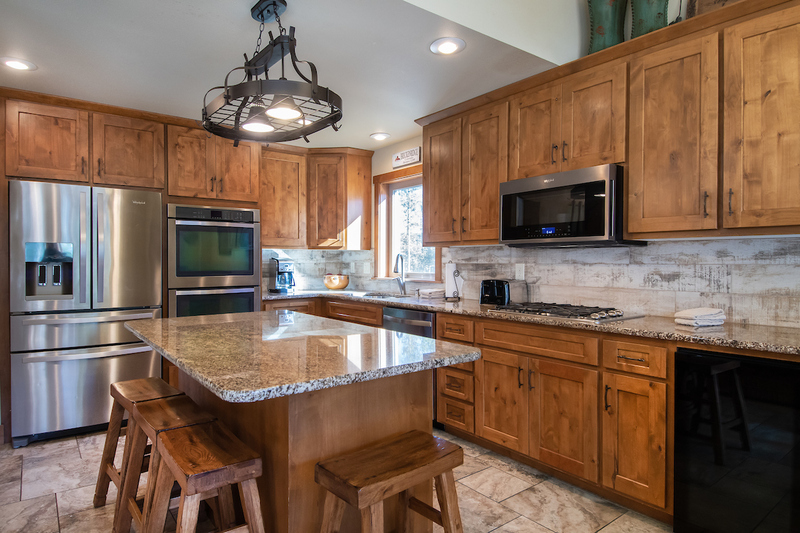 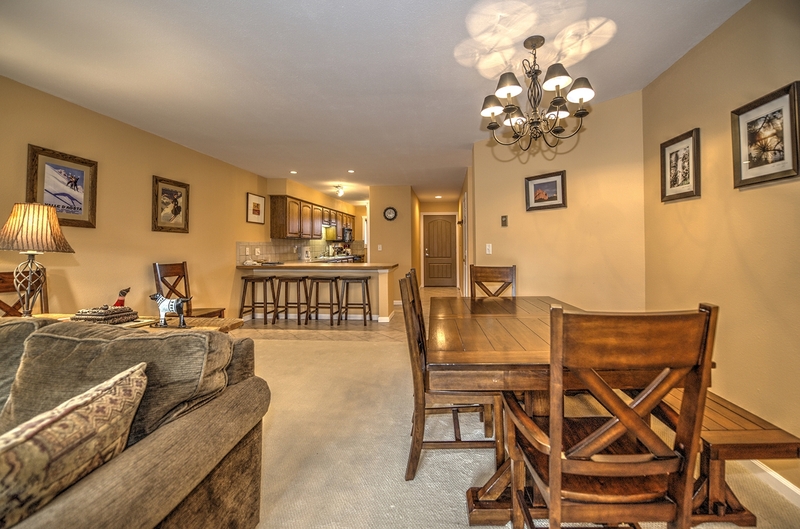 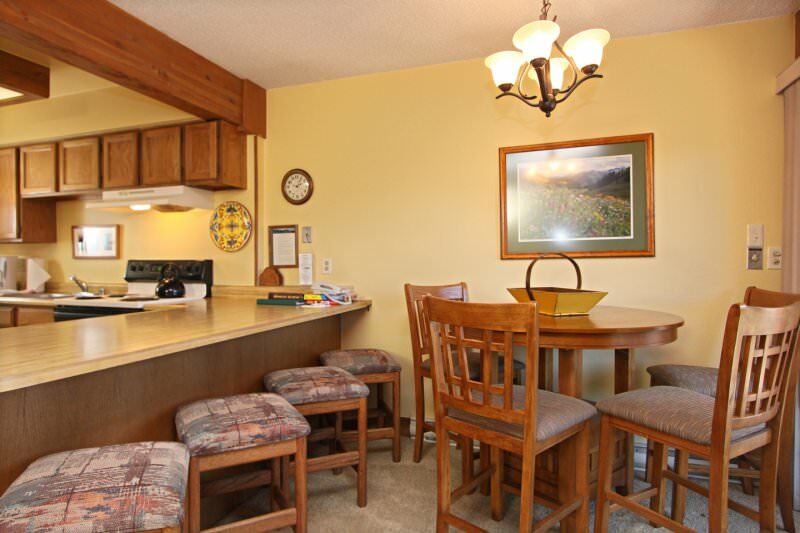 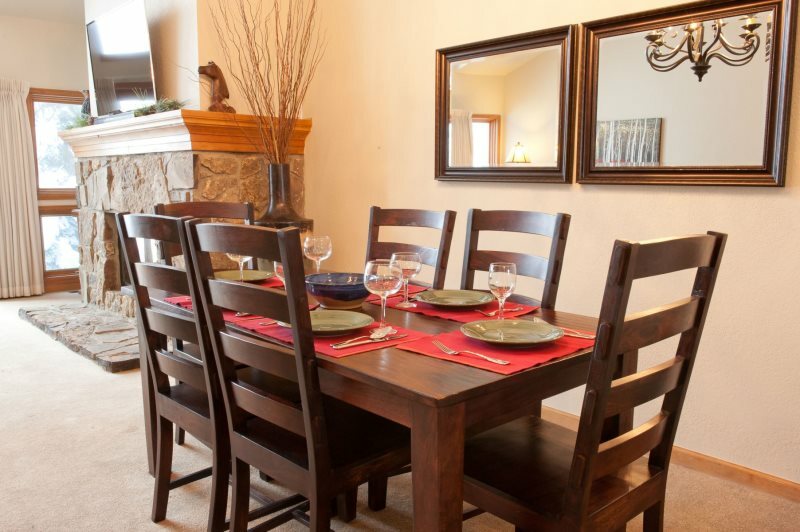 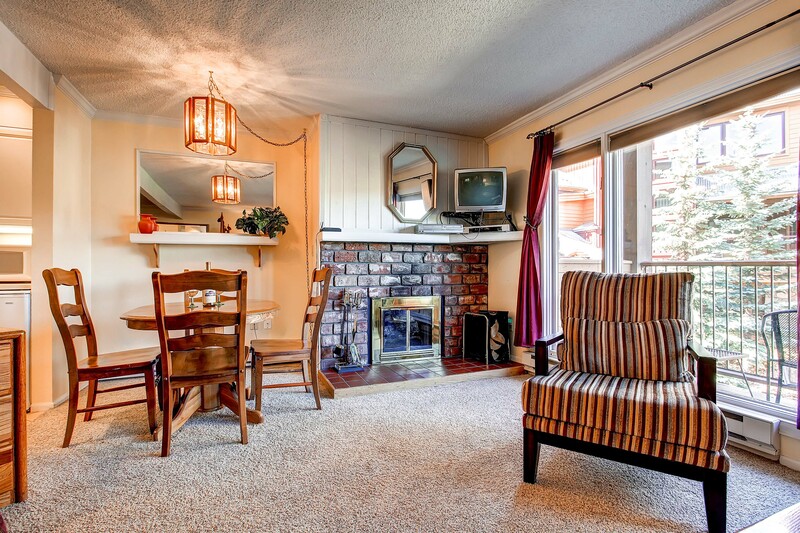 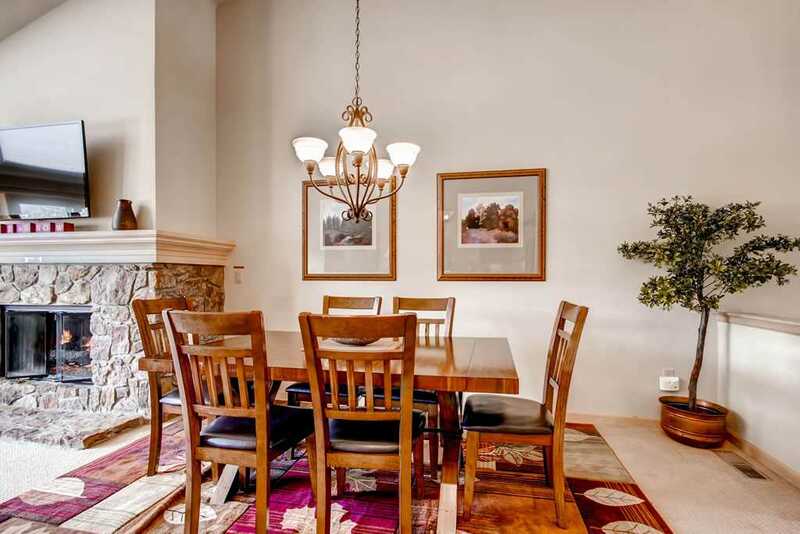 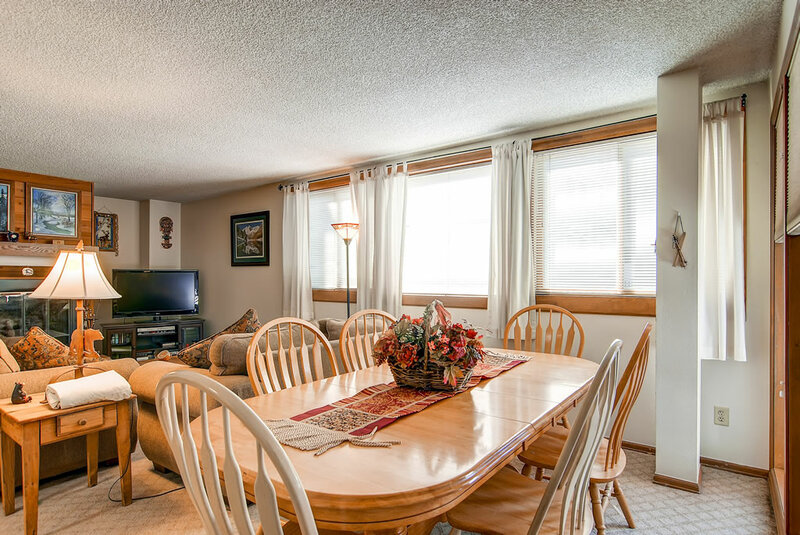 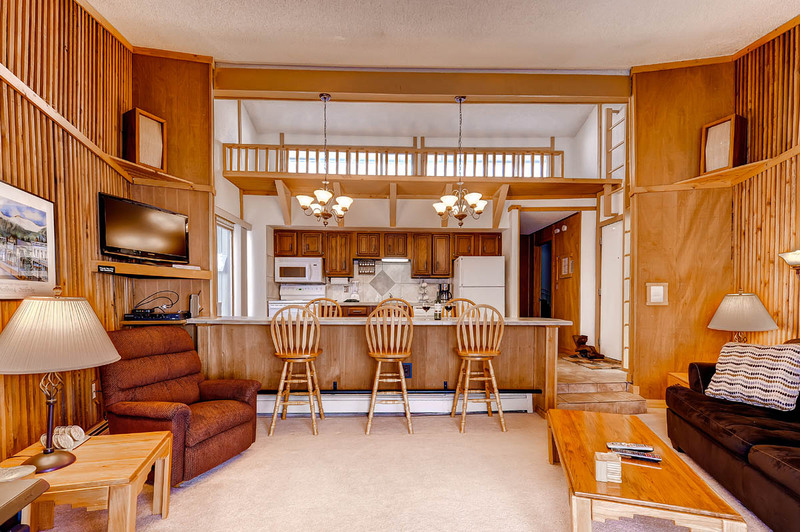 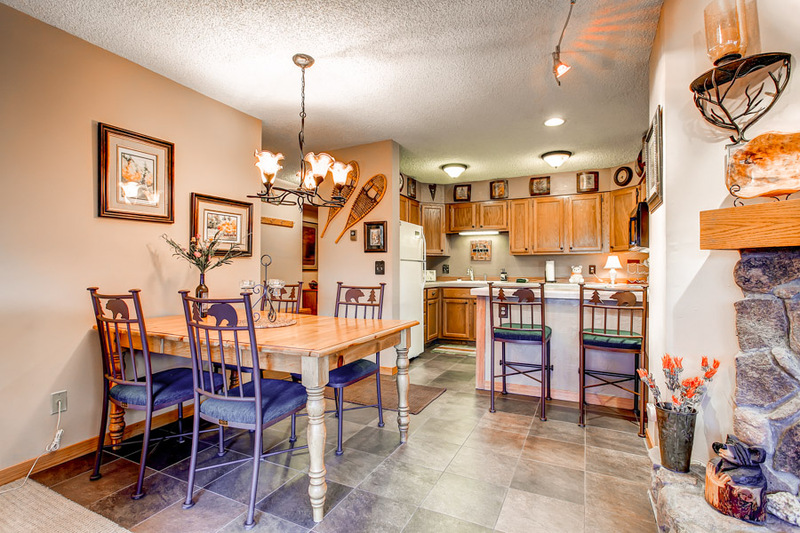 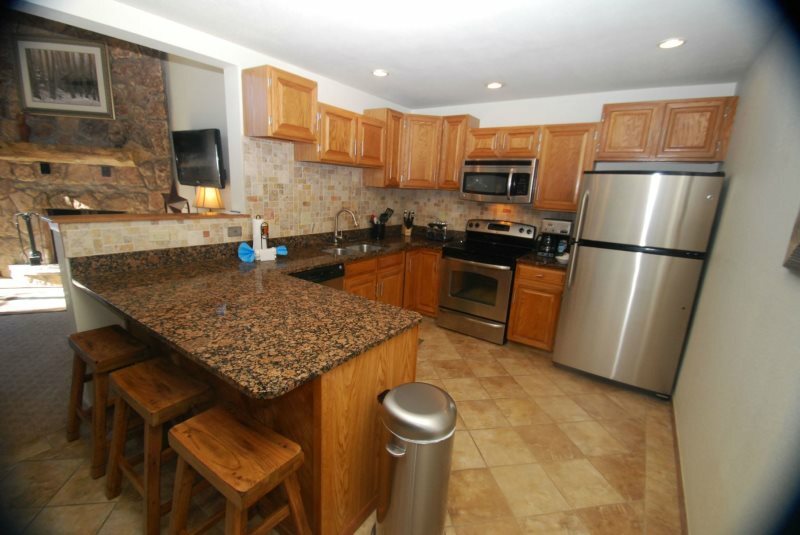 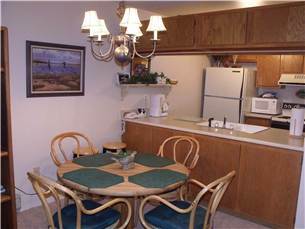 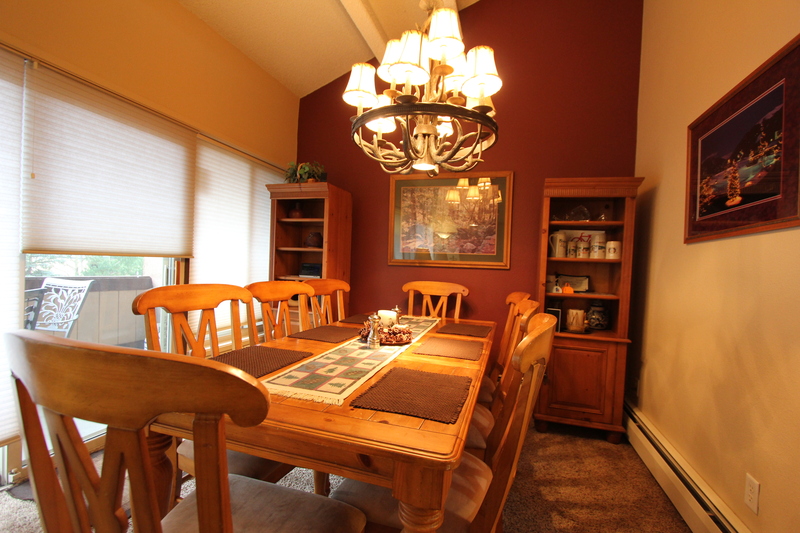 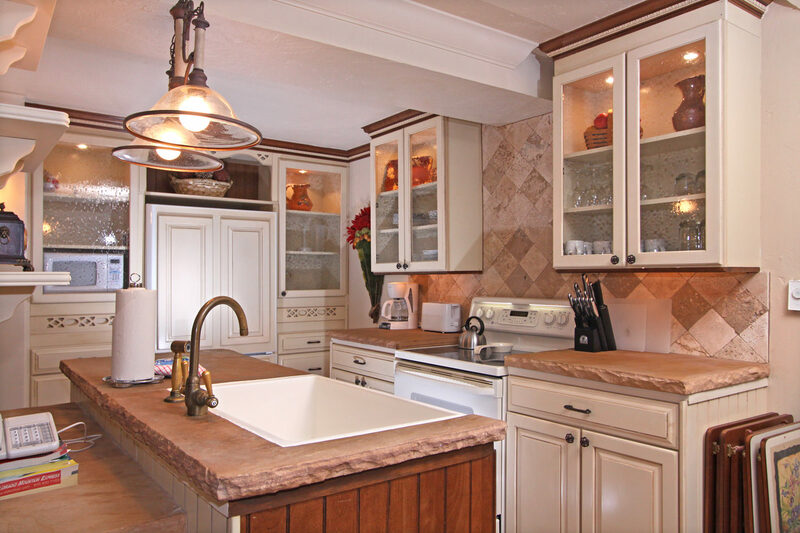 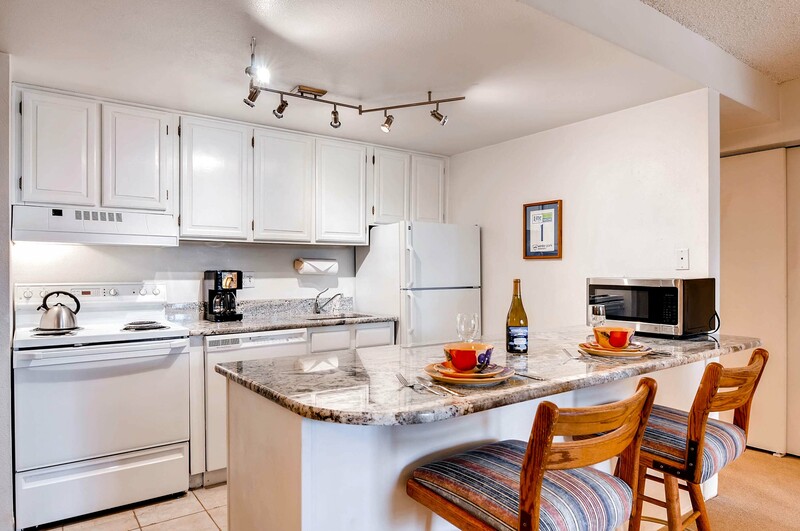 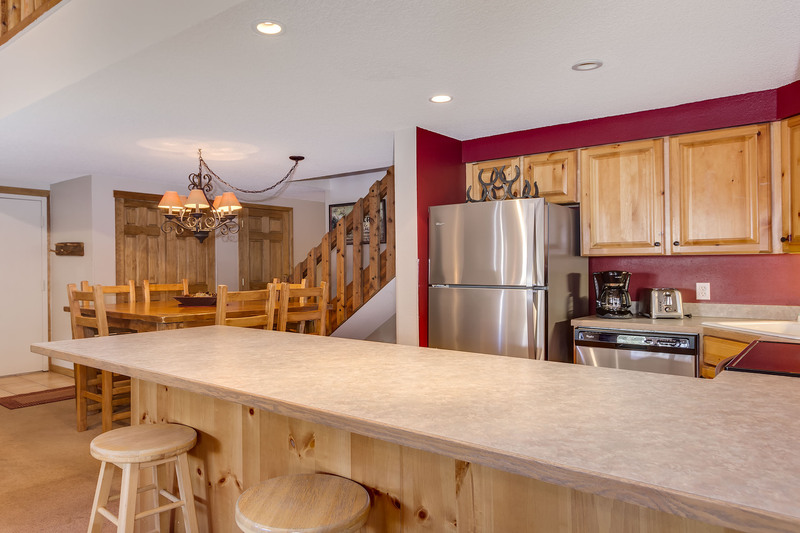 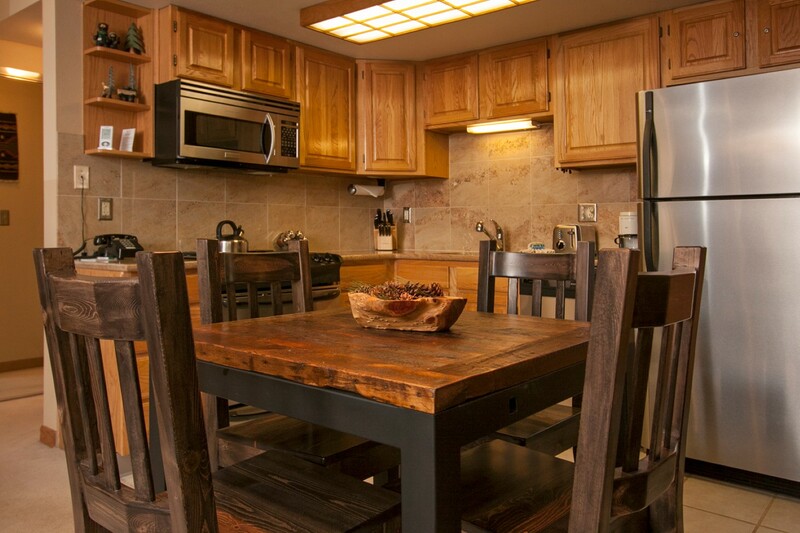 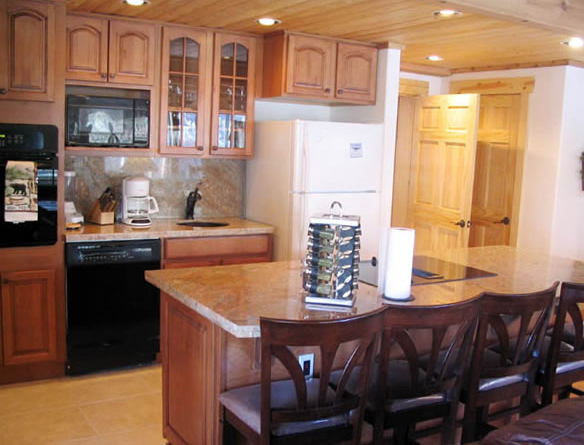 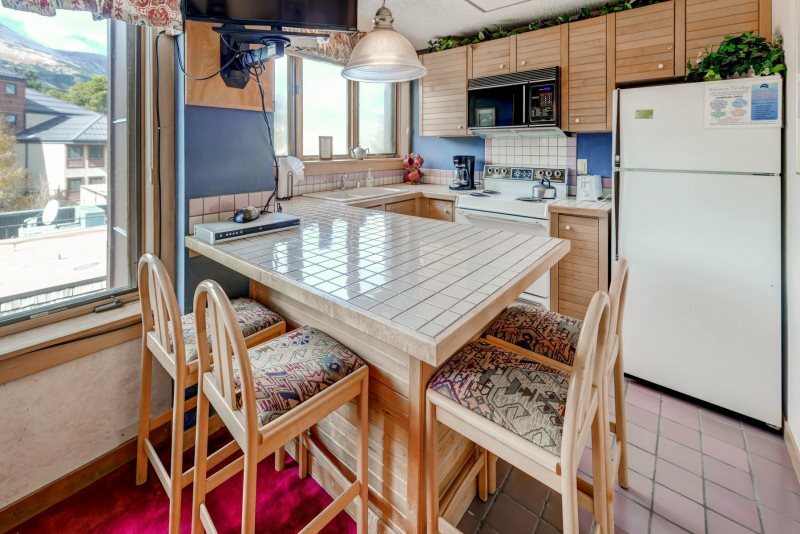 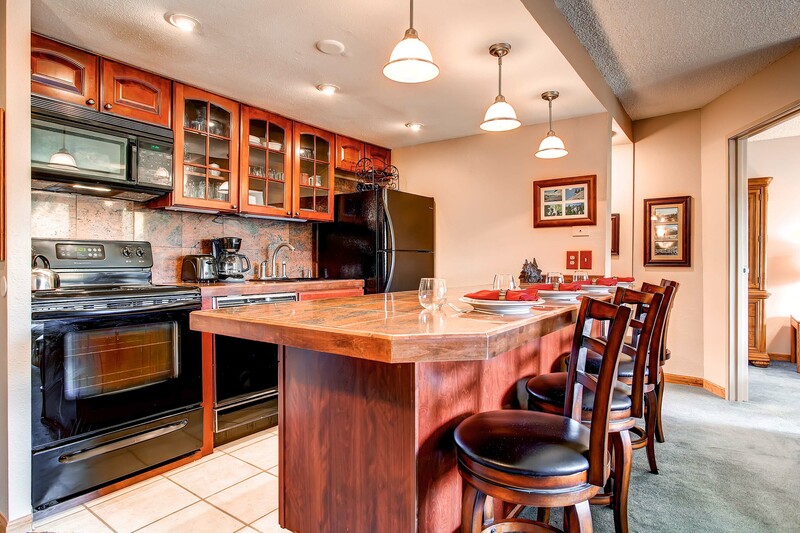 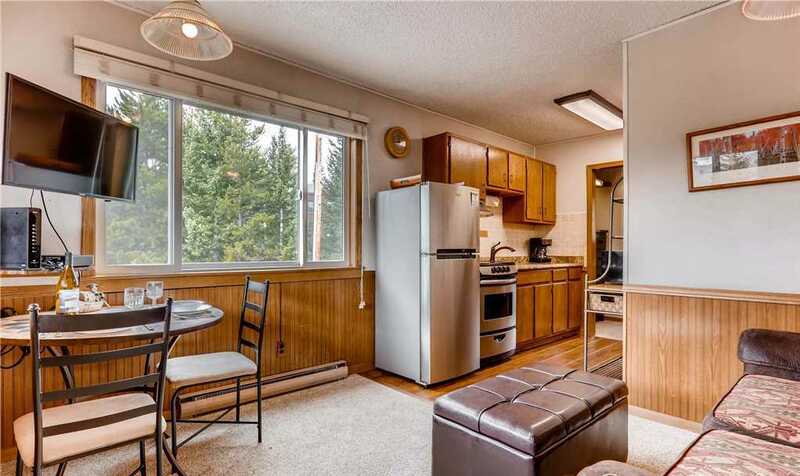 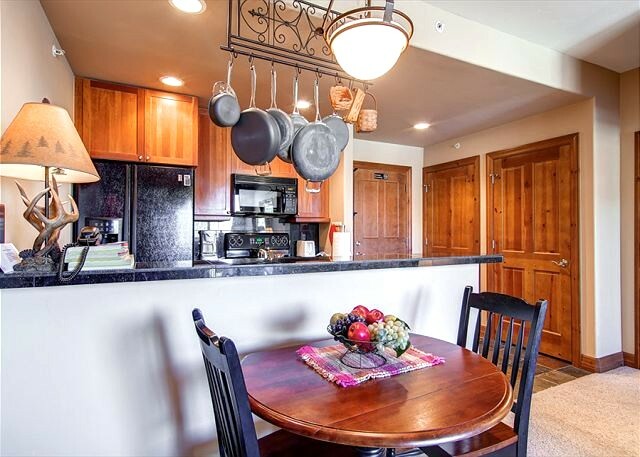 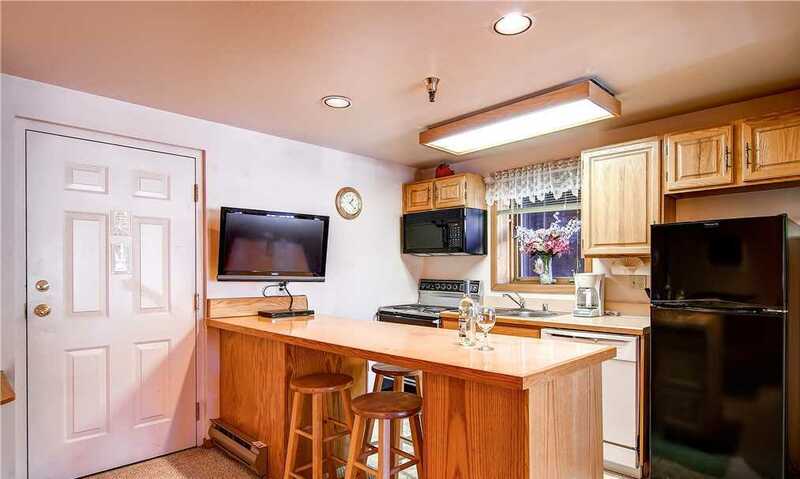 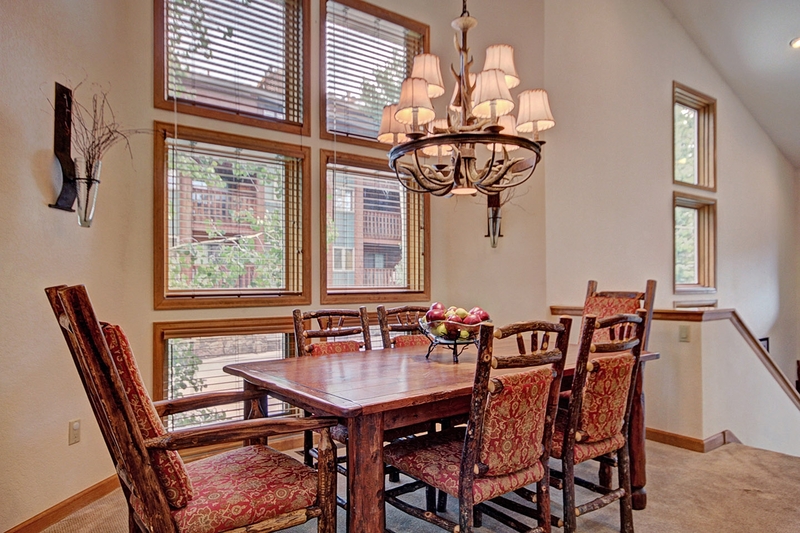 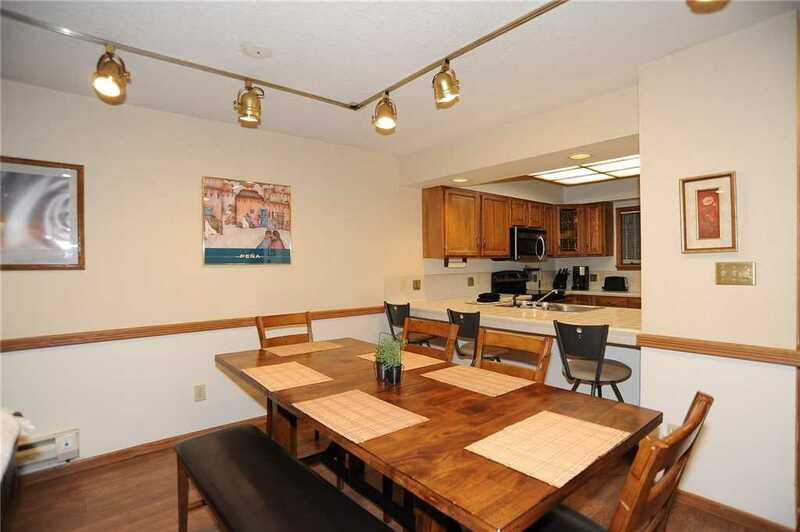 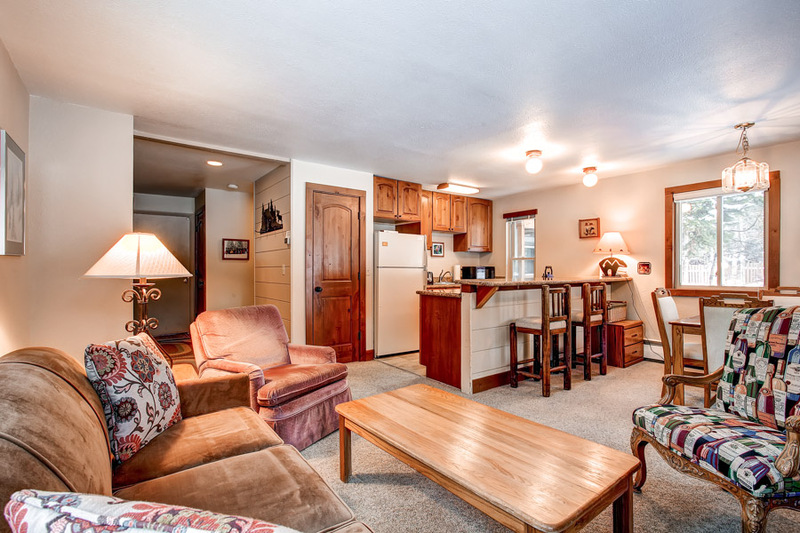 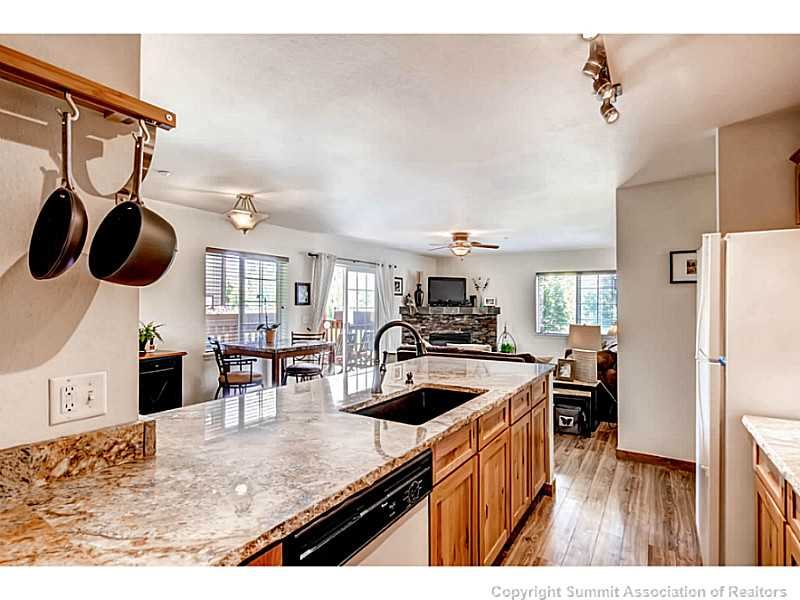 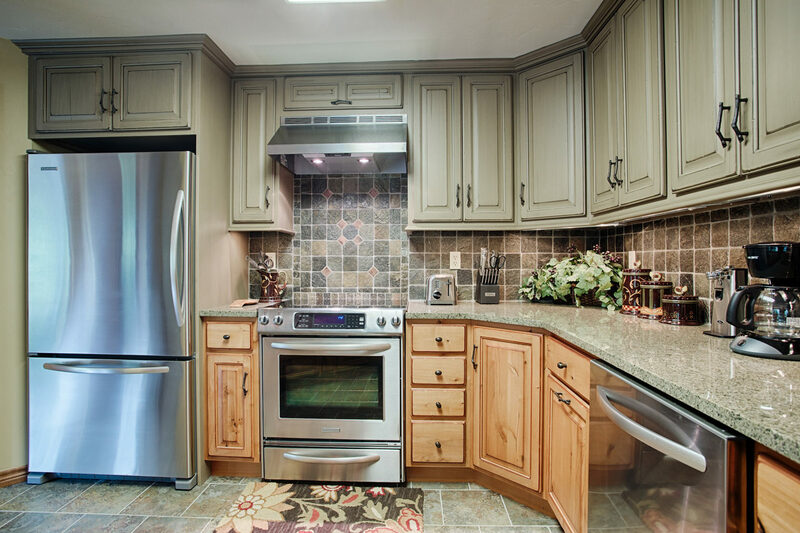 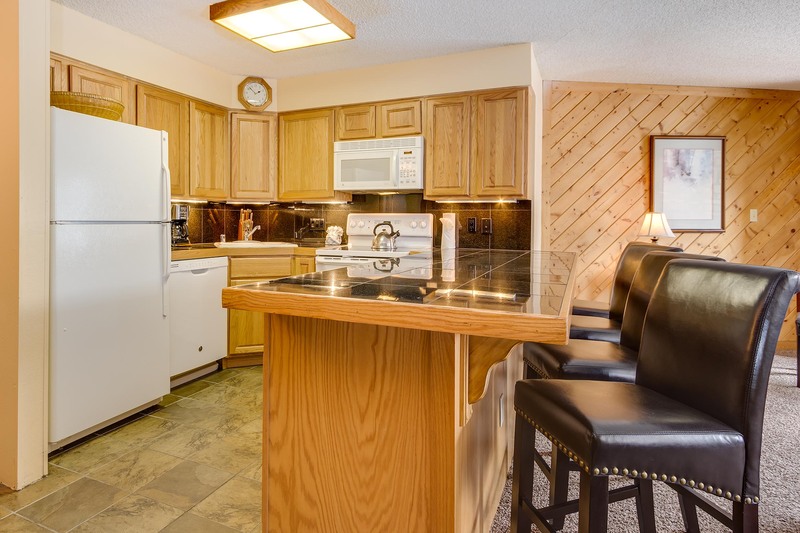 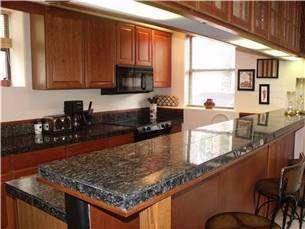 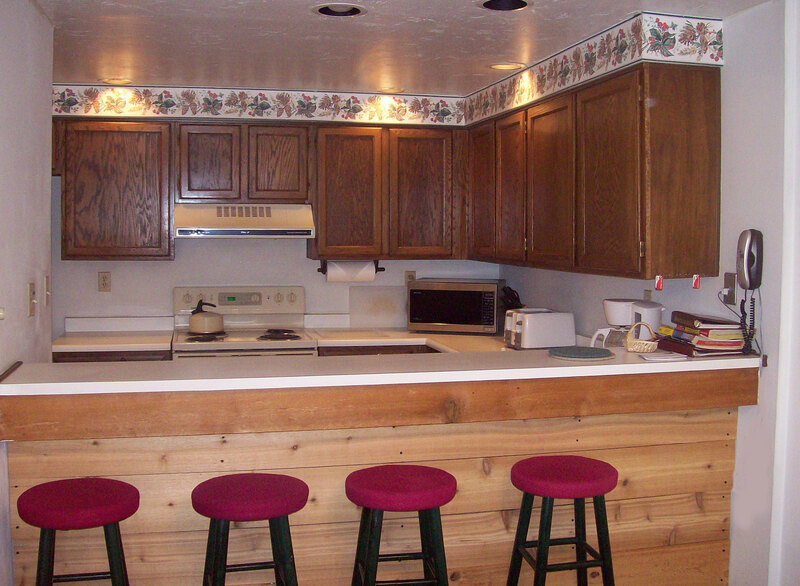 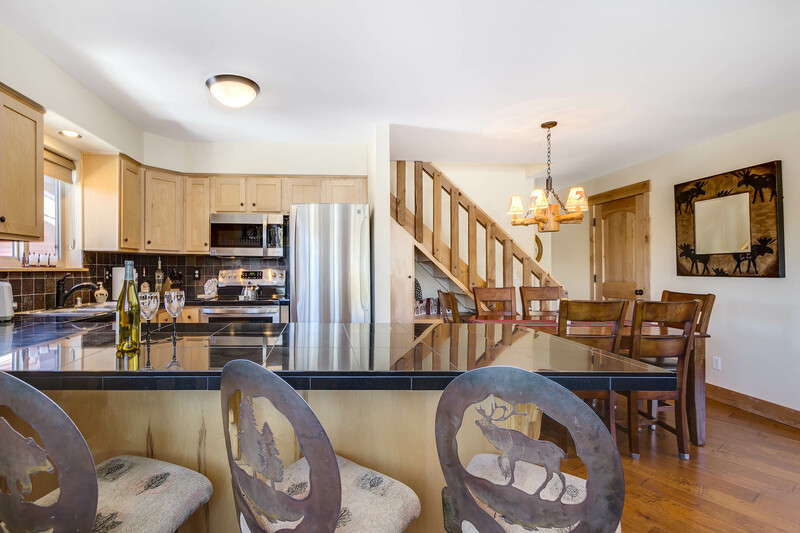 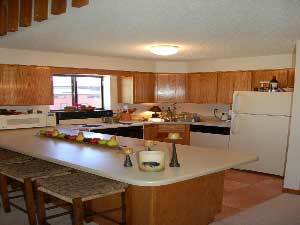 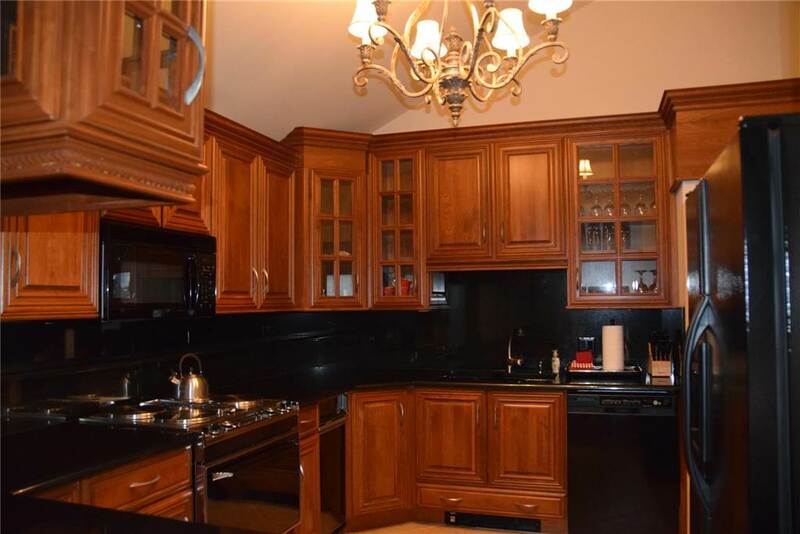 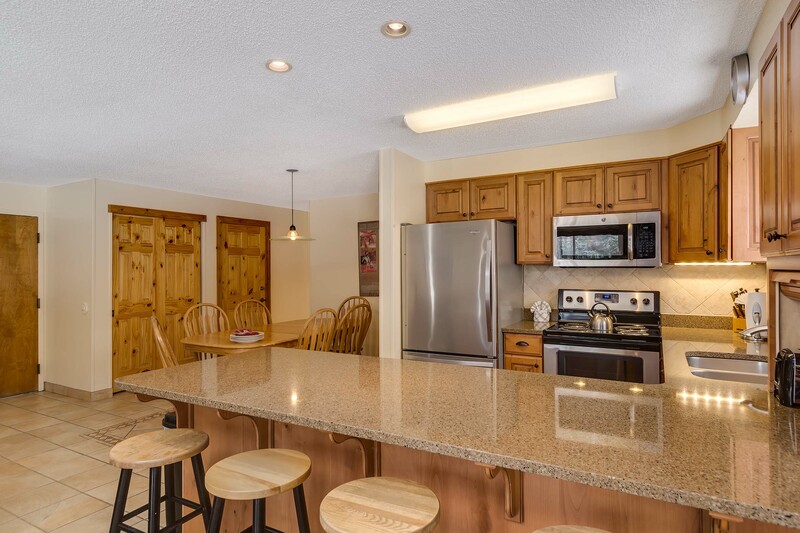 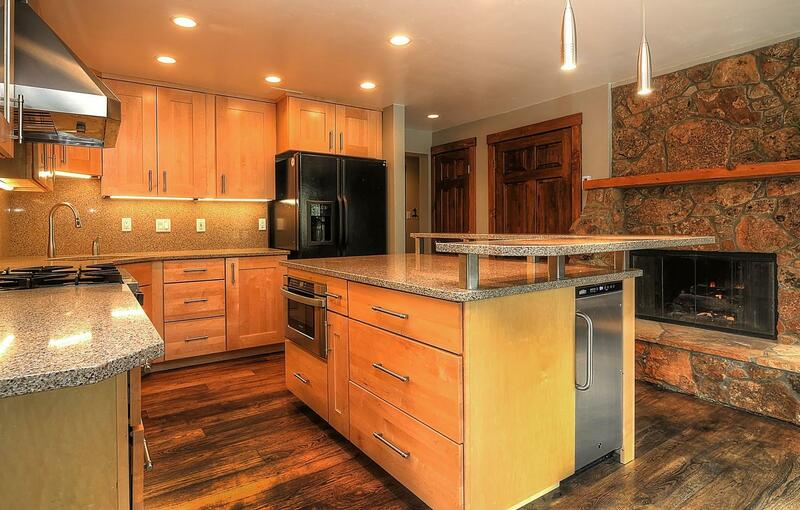 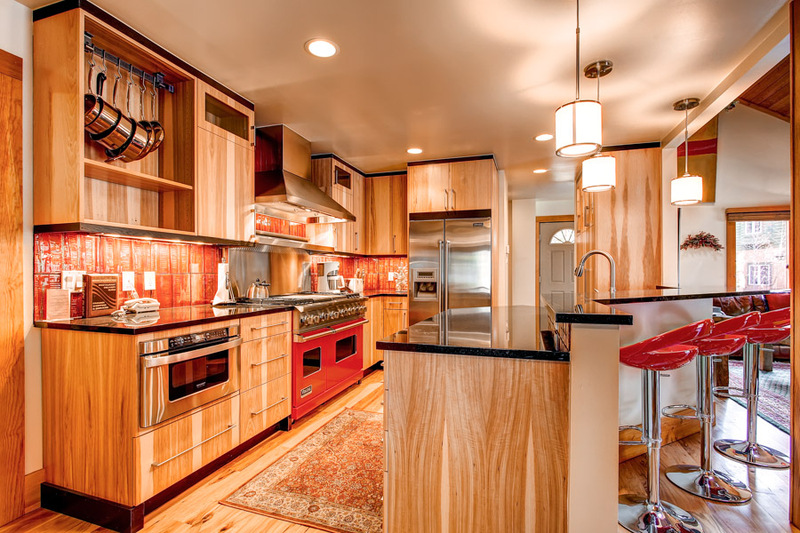 The updated kitchen features a long breakfast bar with sturdy leather seating for three people. 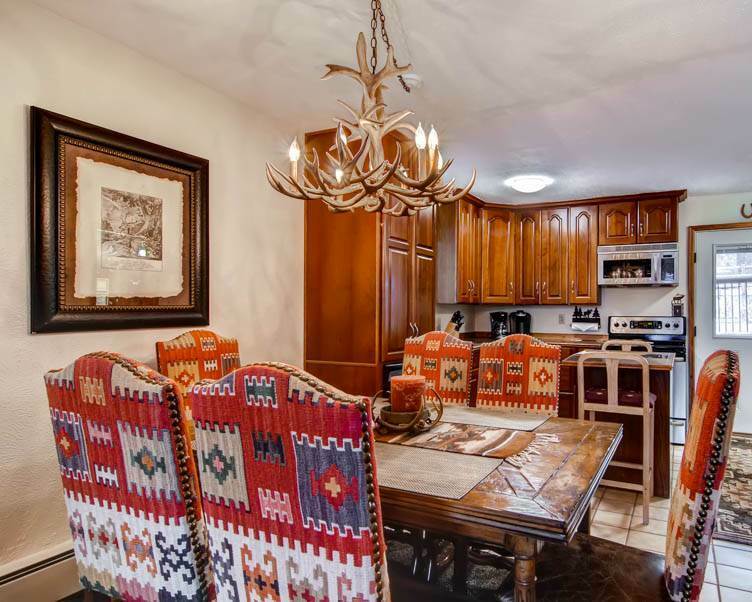 Meals will be memorable around a new stone slab dining set for six people also with leather chairs all under an antler chandelier. 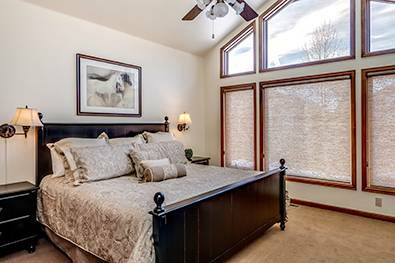 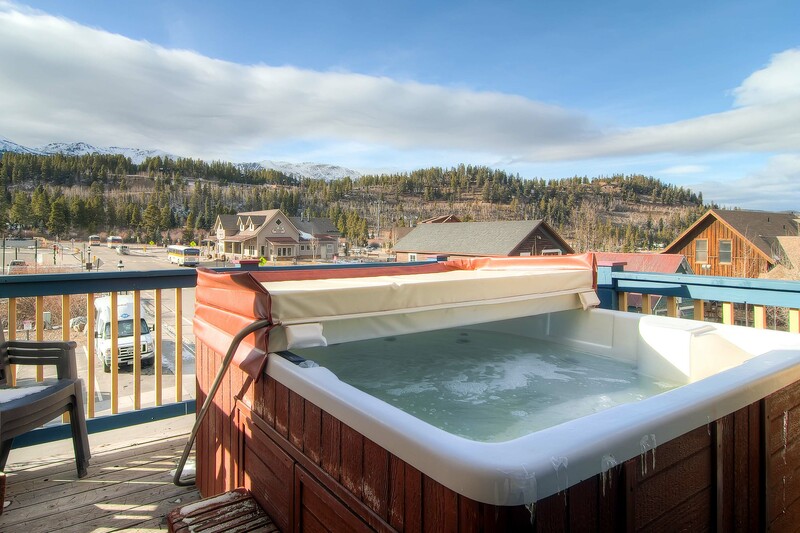 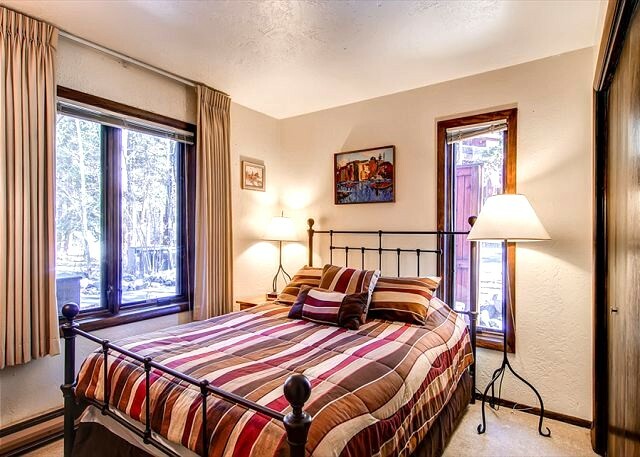 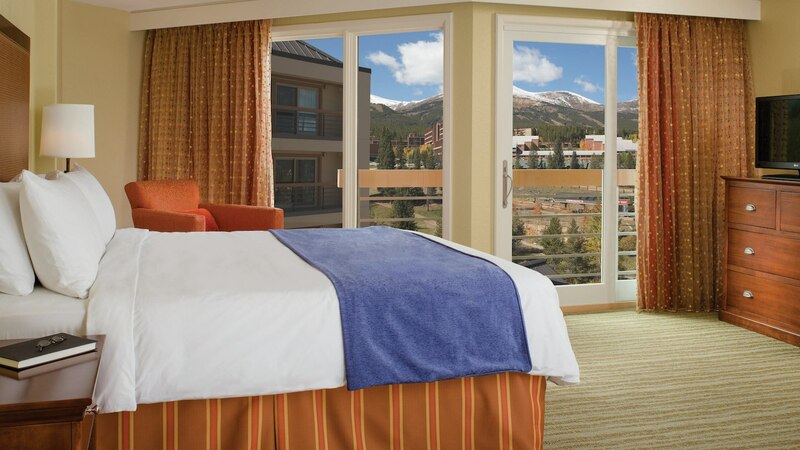 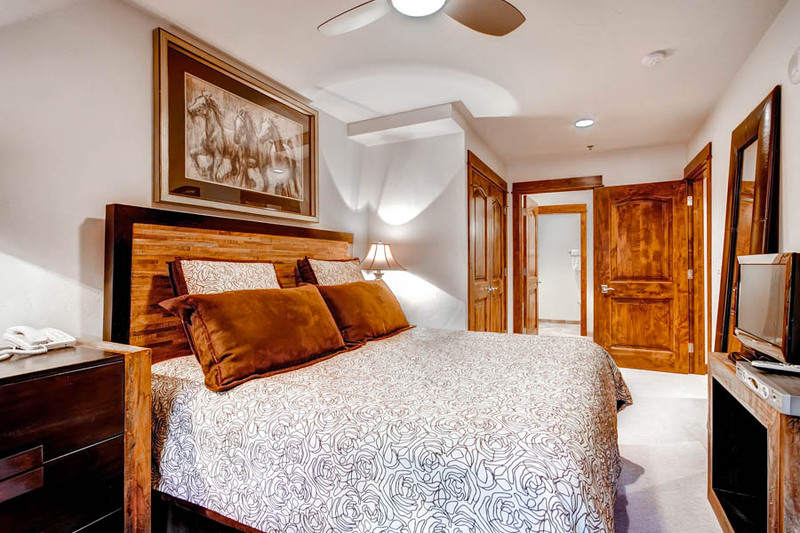 The elegant master suite features new bedding, a wall-mounted TV and an updated bathroom – don’t miss the unique skier tiles or the mountain views from the balcony. 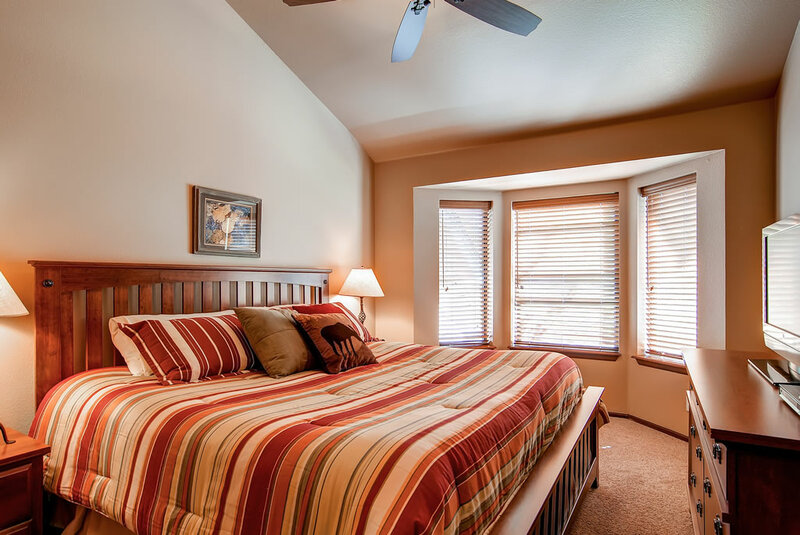 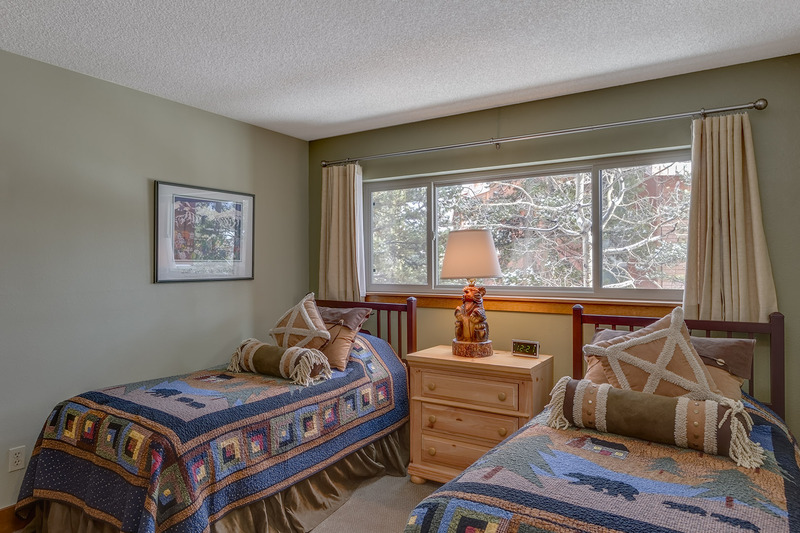 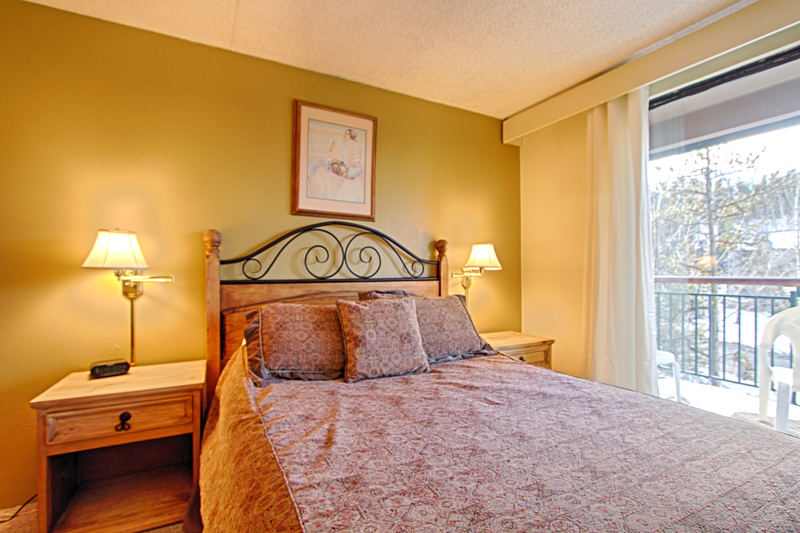 The guest bedroom also features new bedding with sturdy rustic pine furnishings and lots of storage. 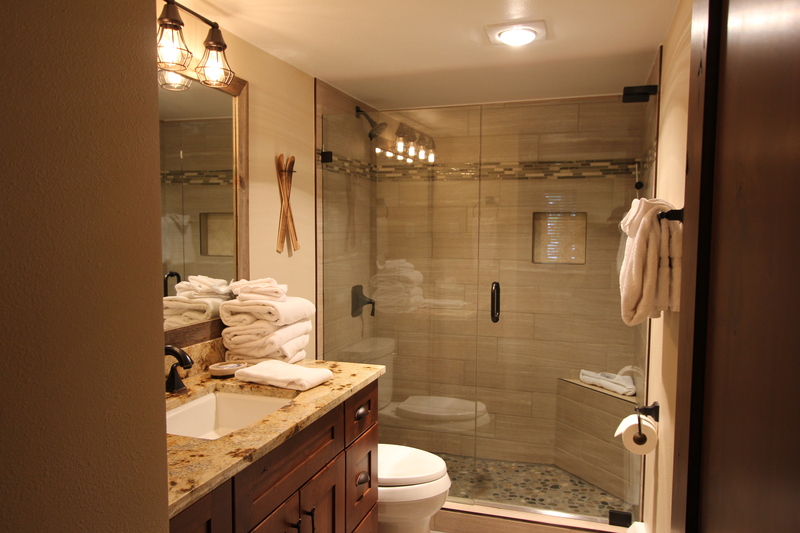 The guest bathroom features a sunken tub for long soaks after a long day on the mountain. 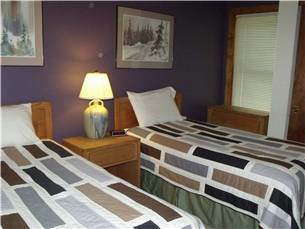 The loft has a unique bedding configuration that works for adults or kids. 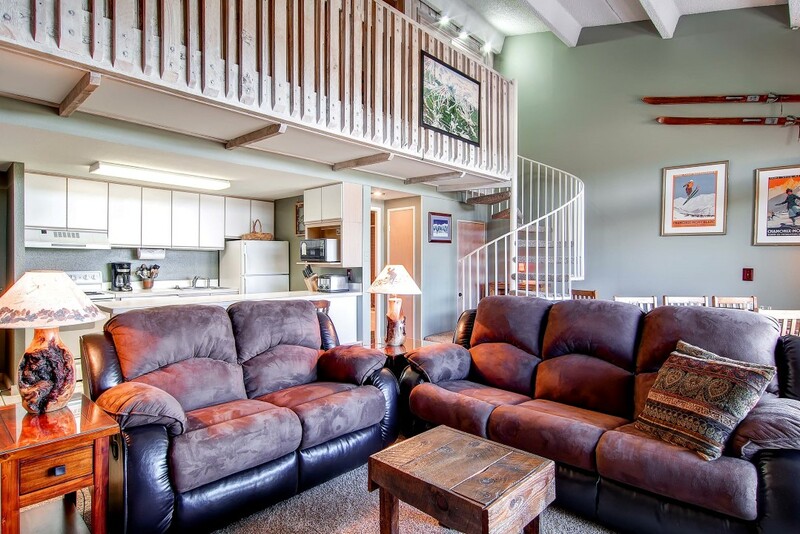 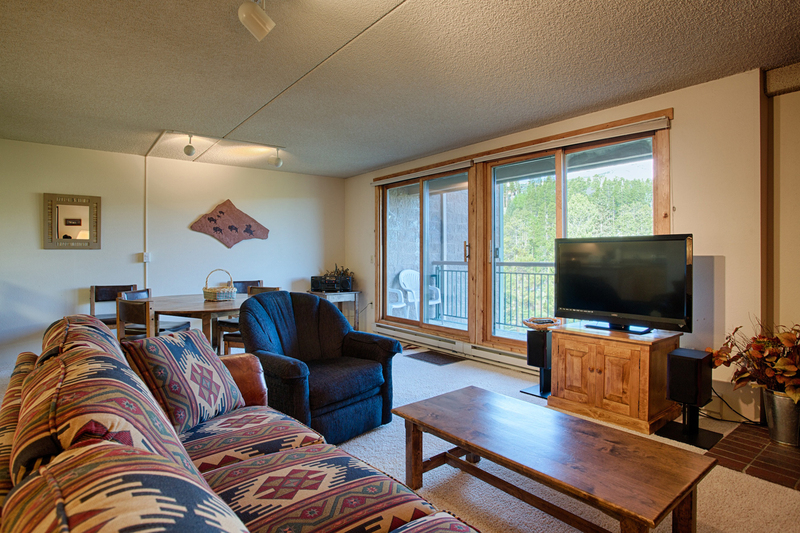 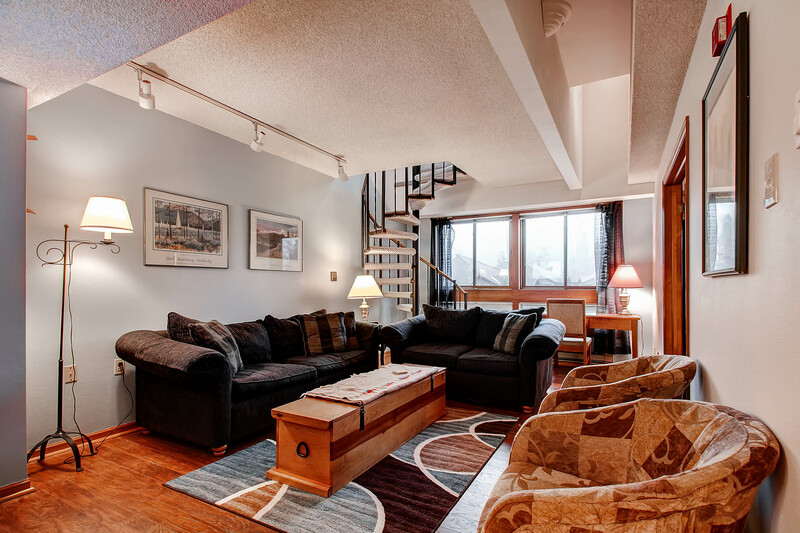 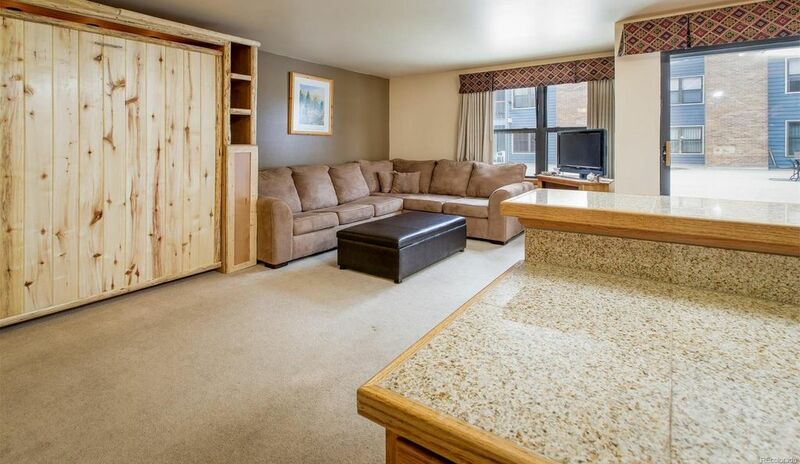 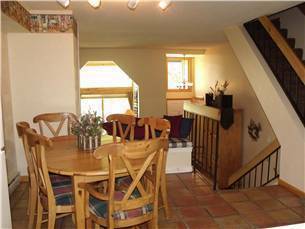 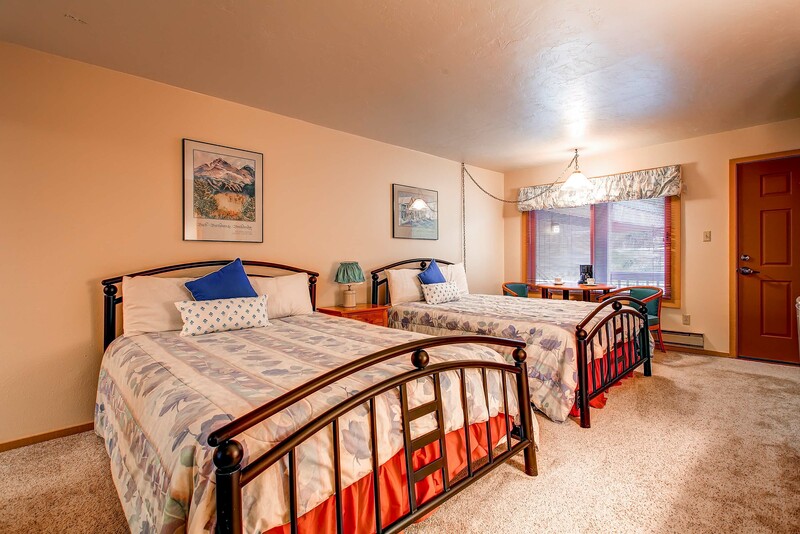 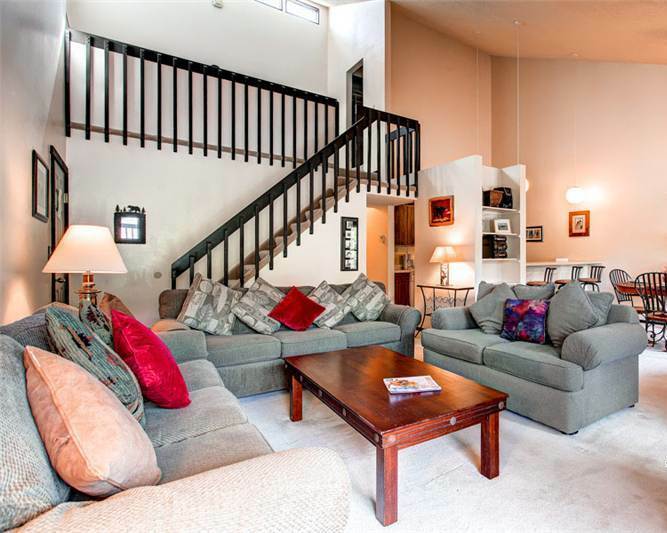 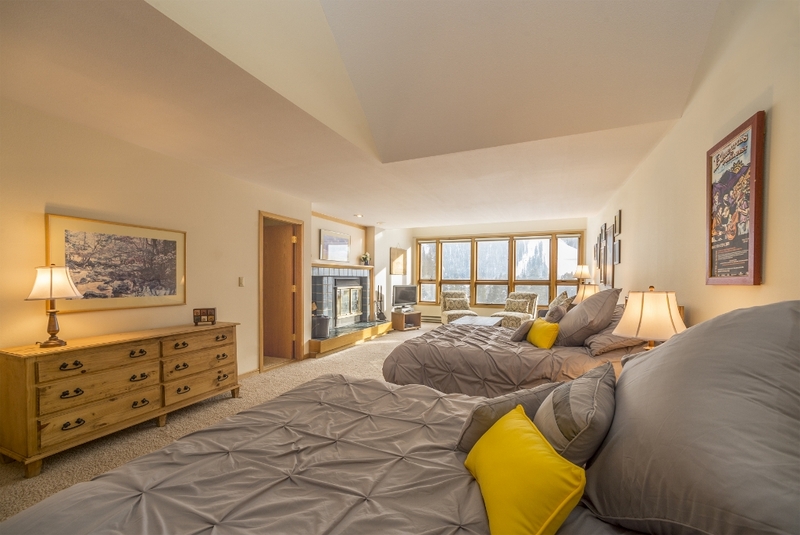 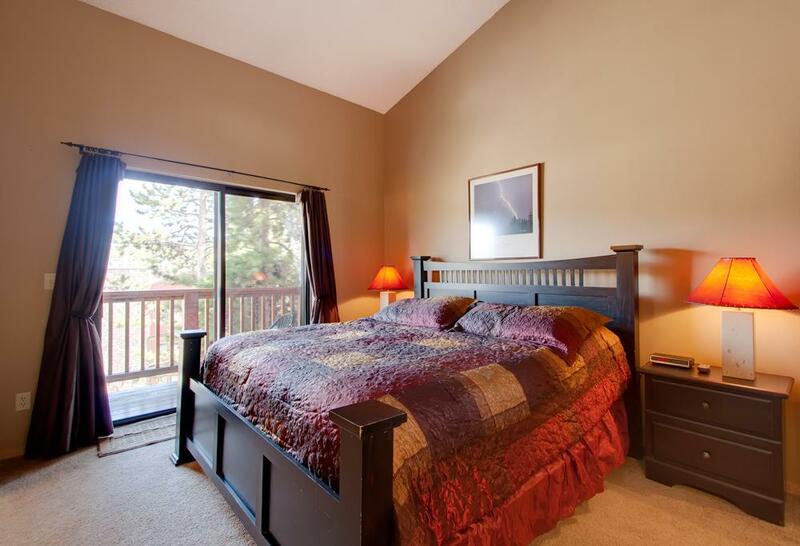 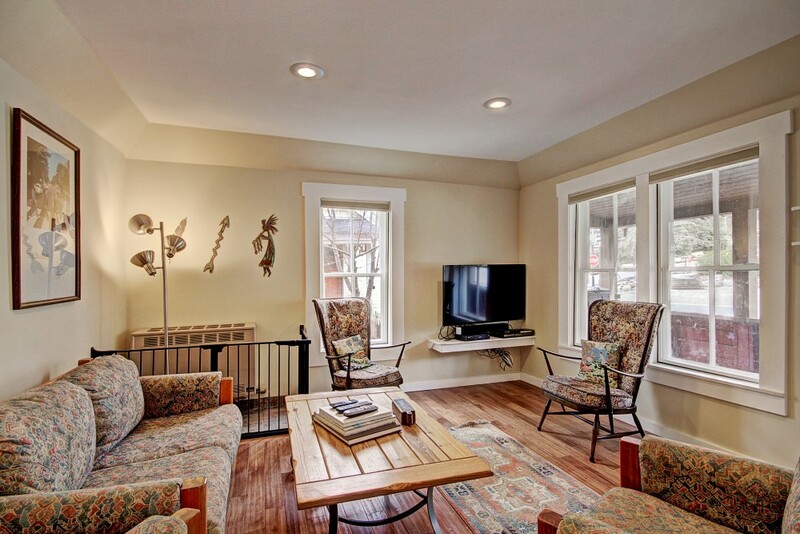 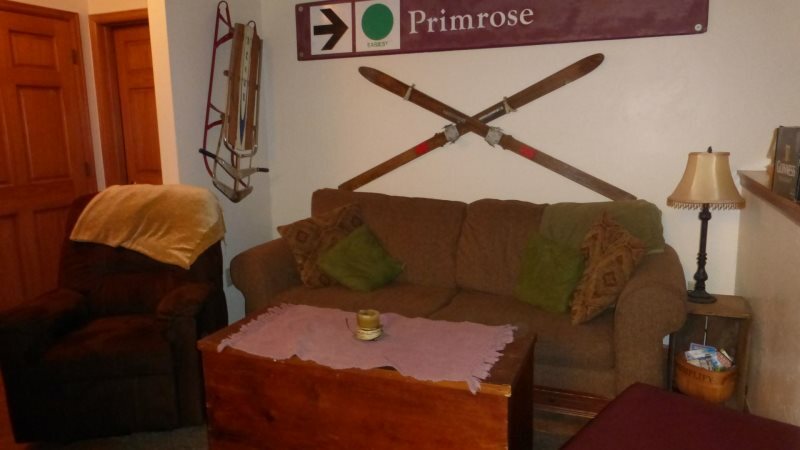 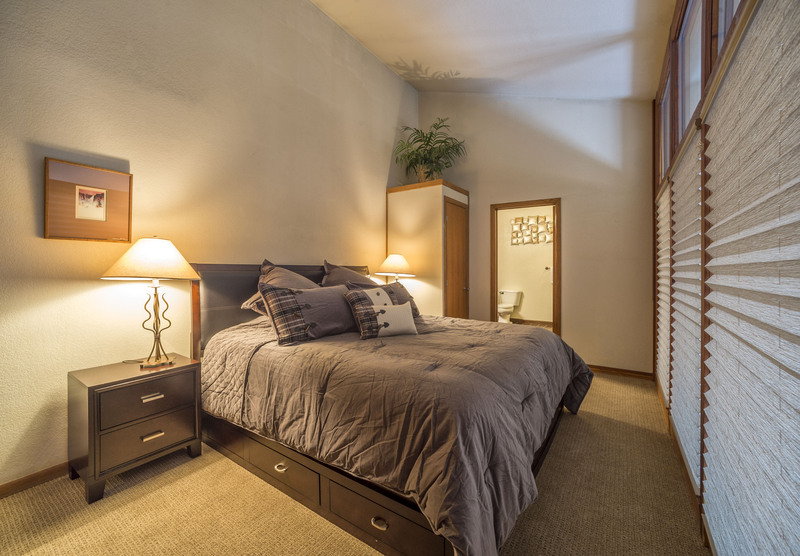 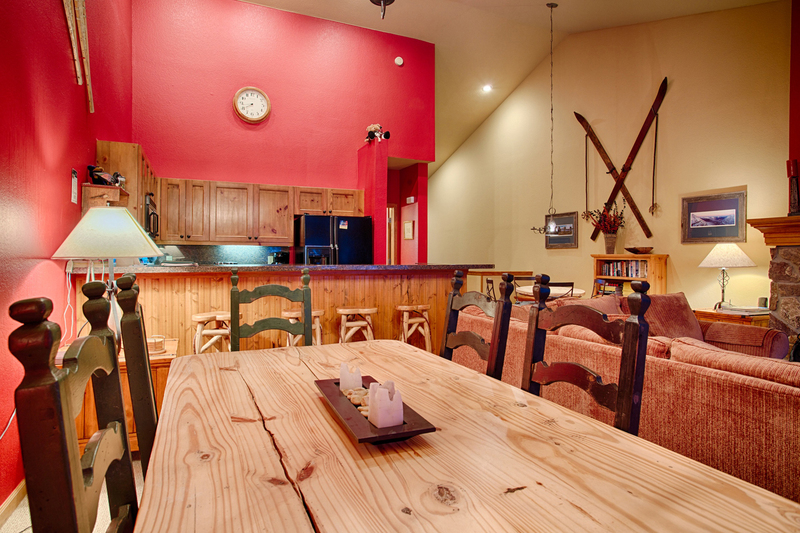 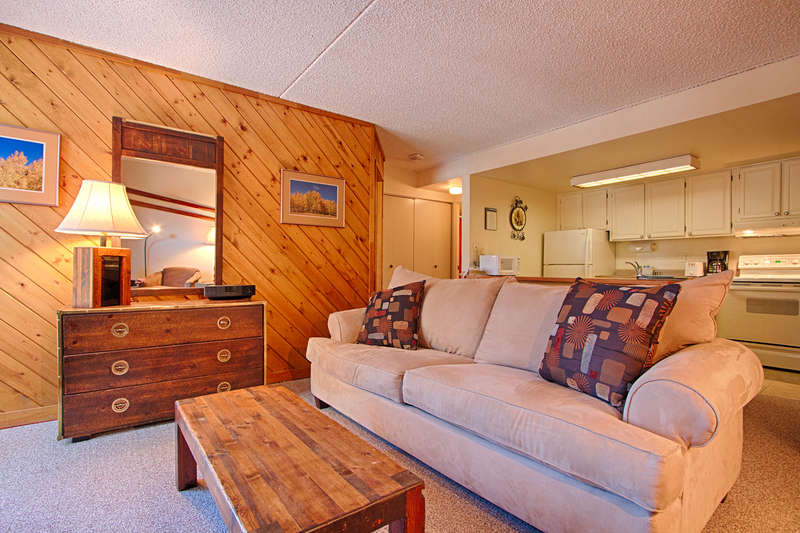 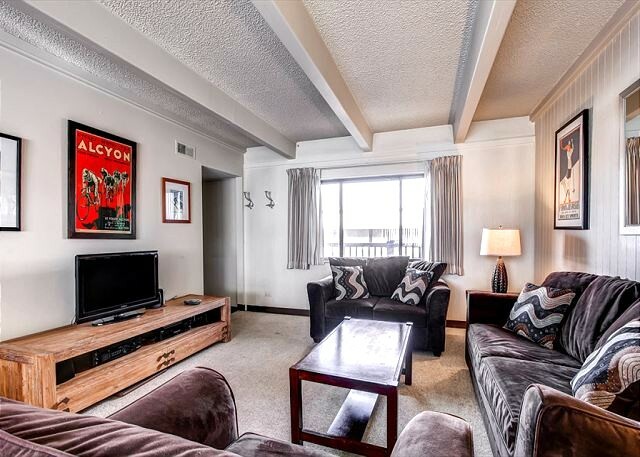 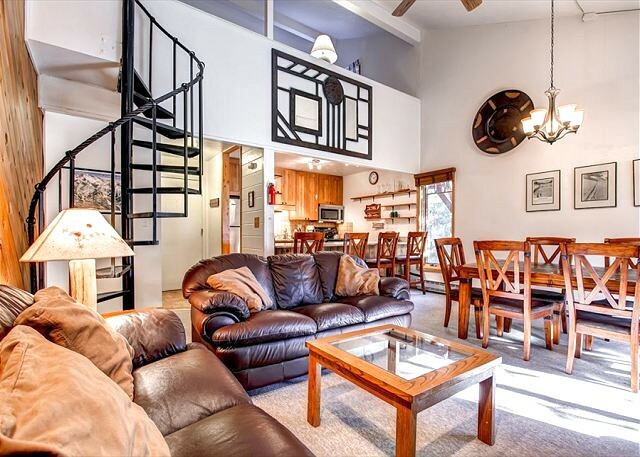 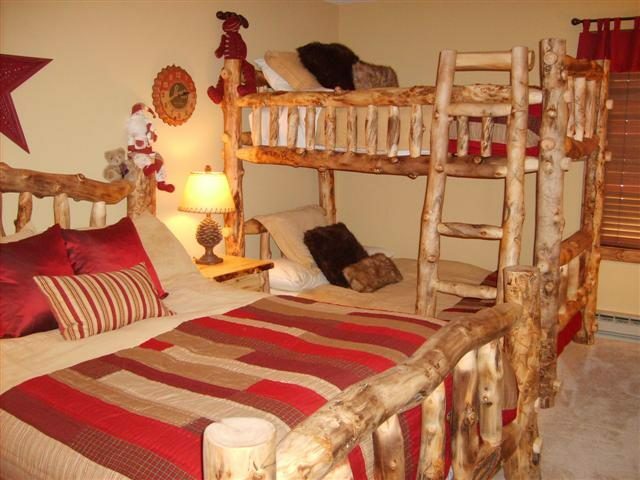 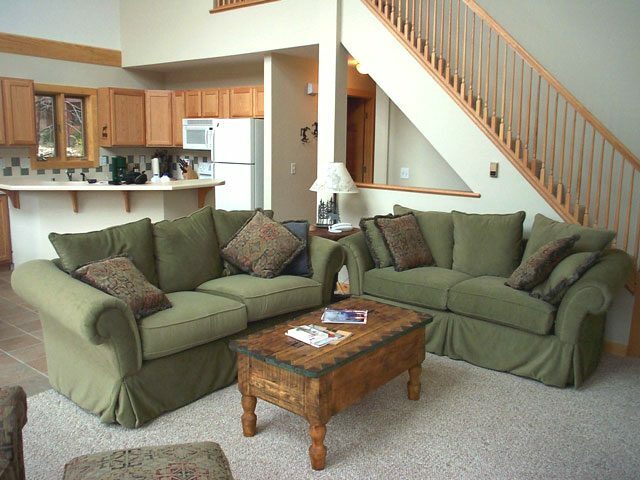 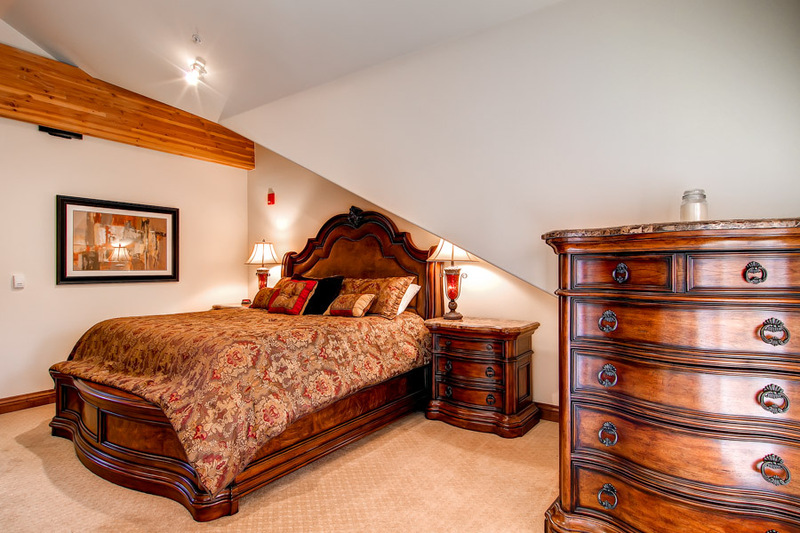 The split level loft has a Twin bed in a private raised alcove and another Twin bed and bunk bed (Full/Full). 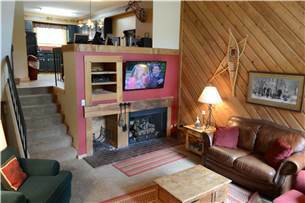 Six younger children could easily sleep in the loft, which also has its own TV with DVD/VCR.